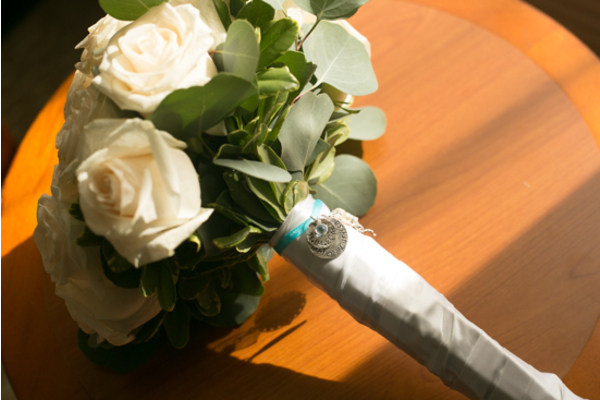 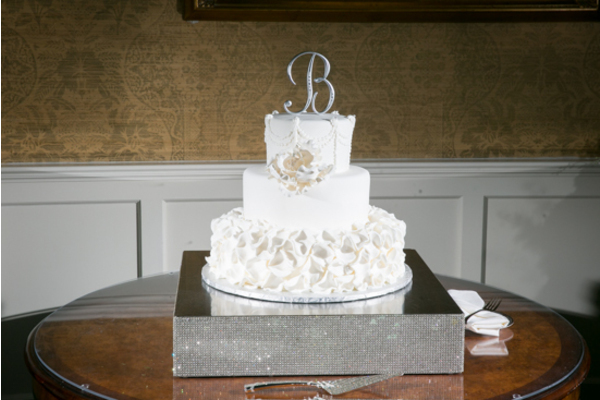 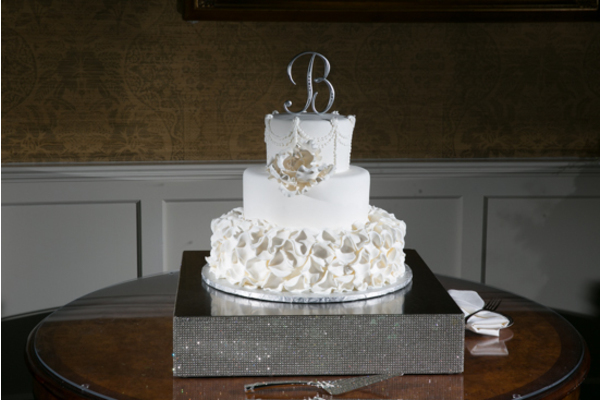 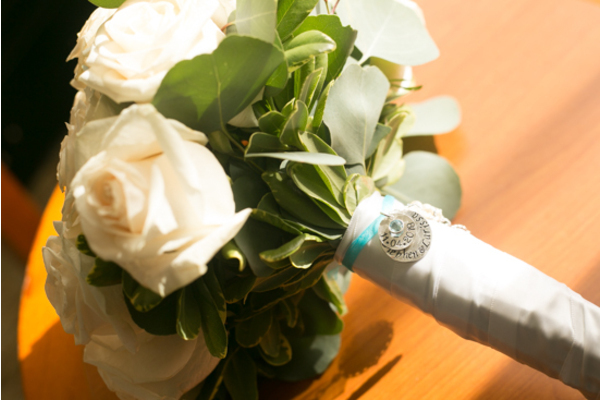 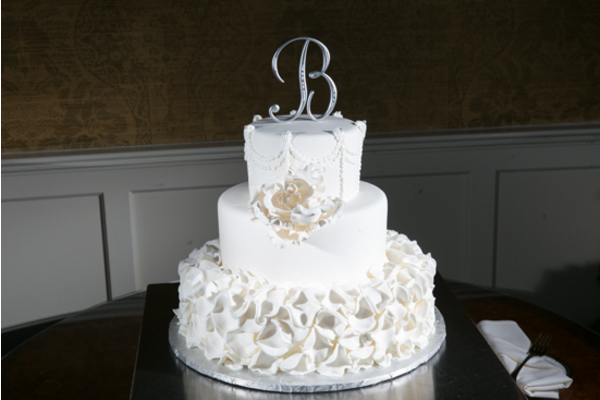 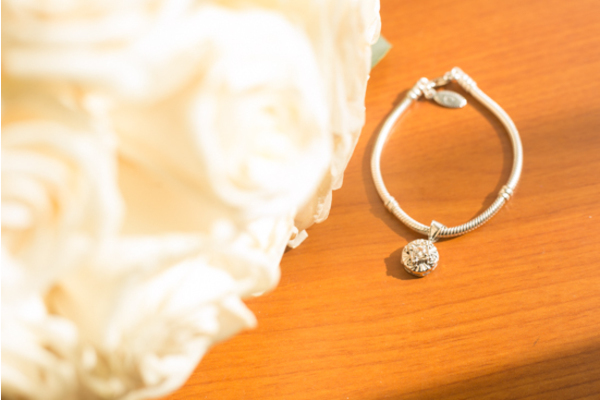 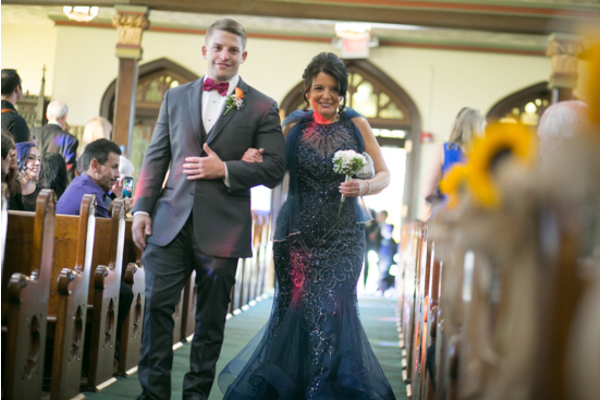 A huge congratulations is in order for the newlyweds! 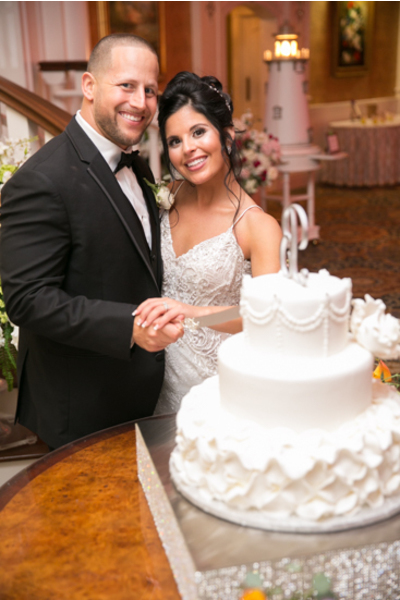 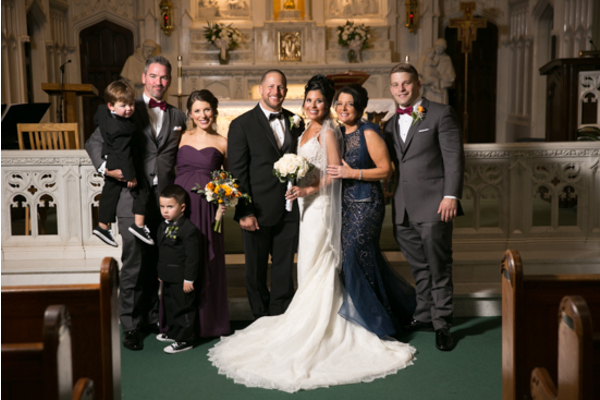 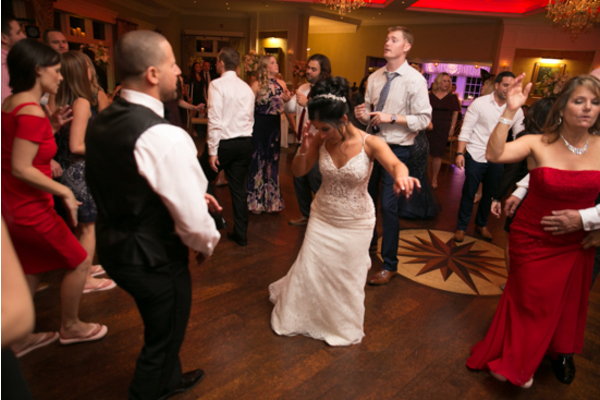 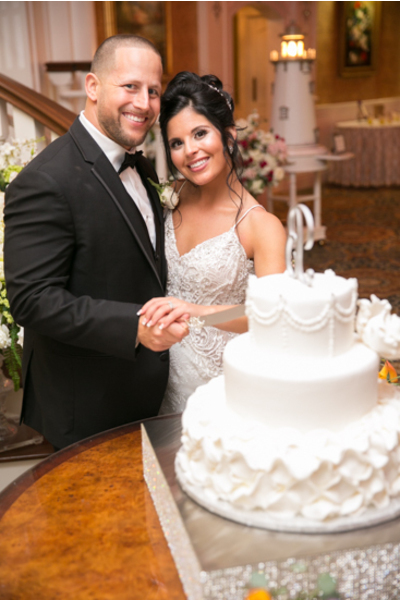 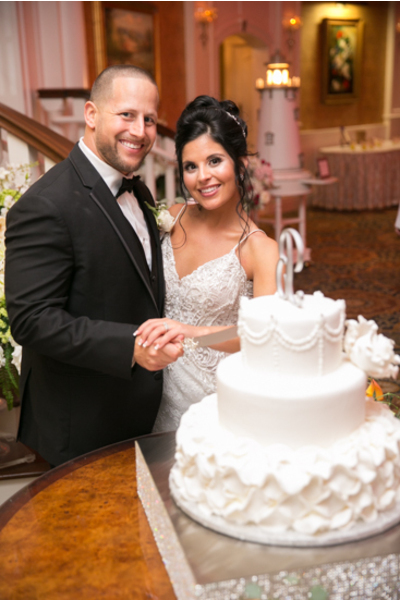 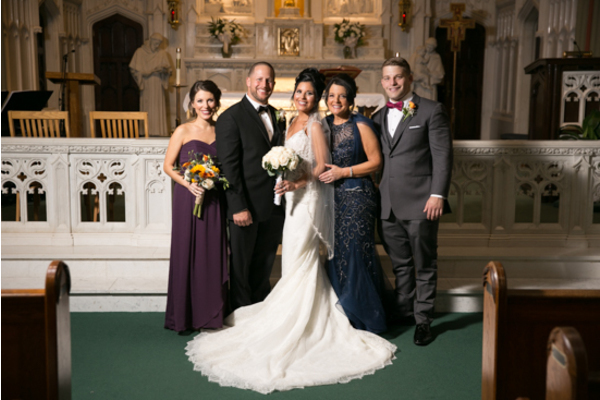 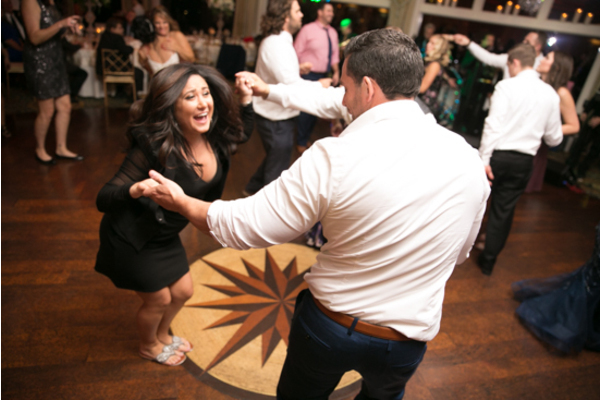 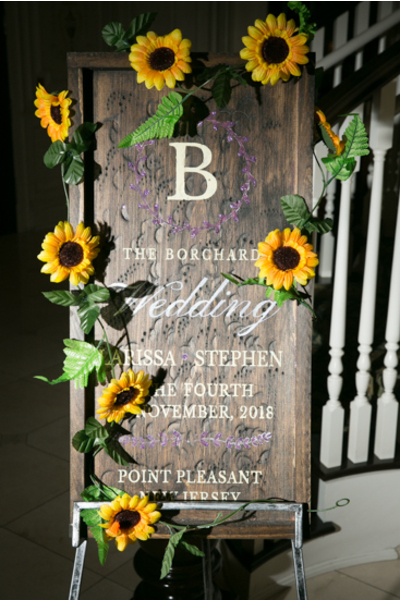 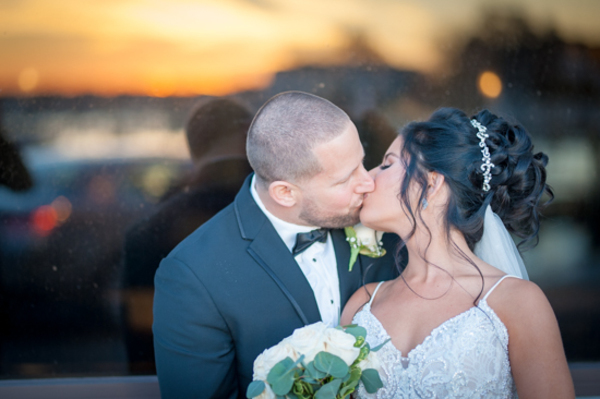 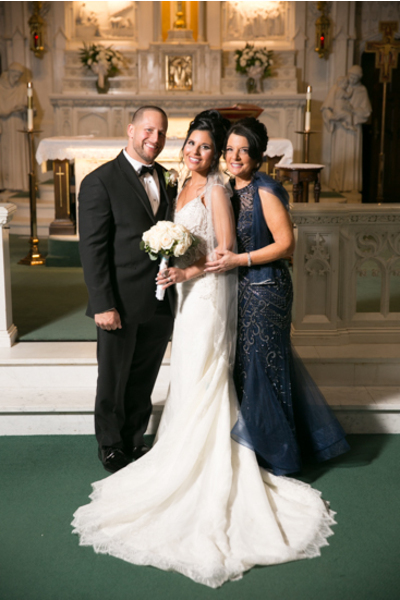 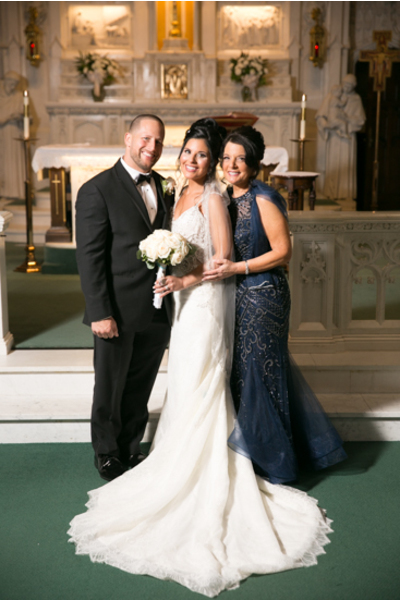 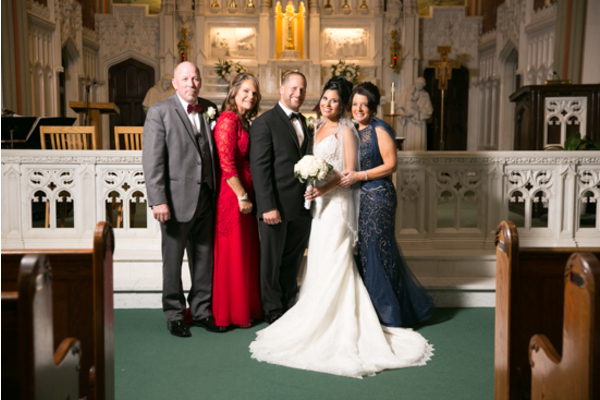 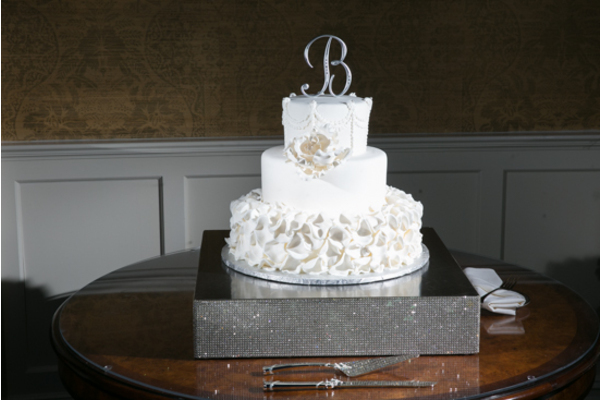 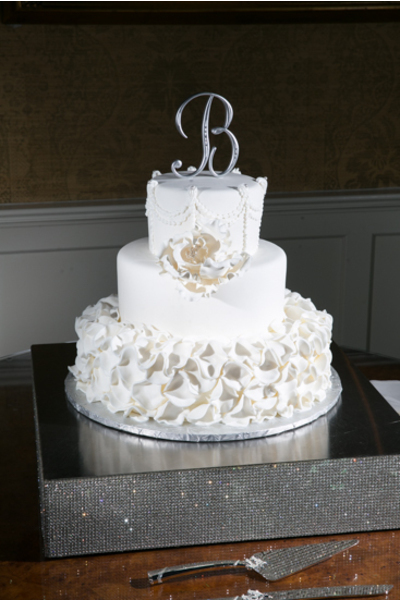 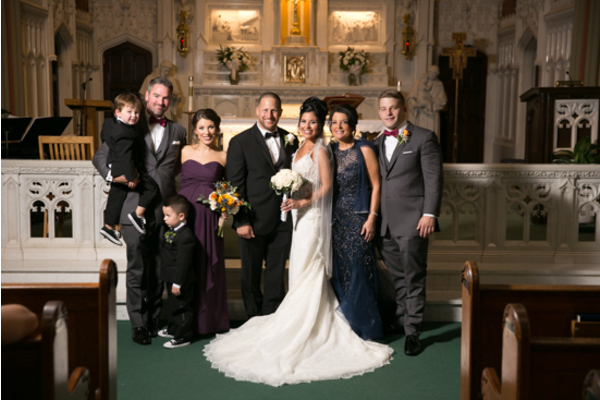 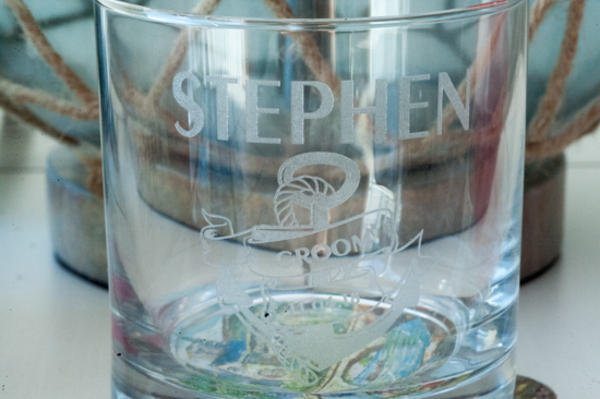 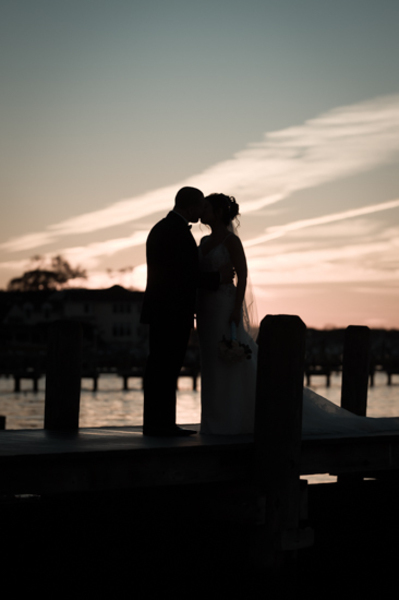 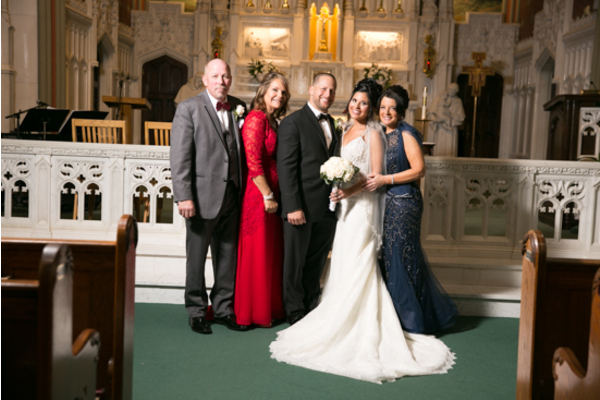 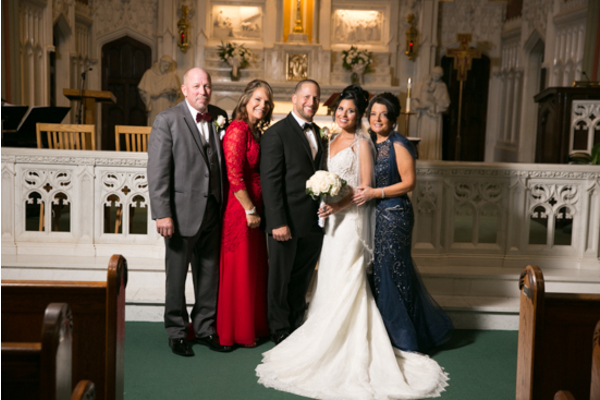 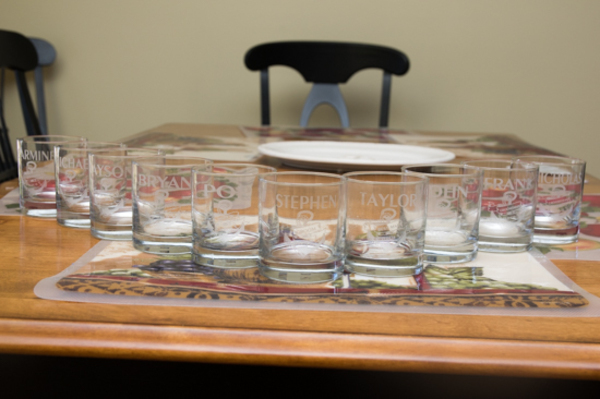 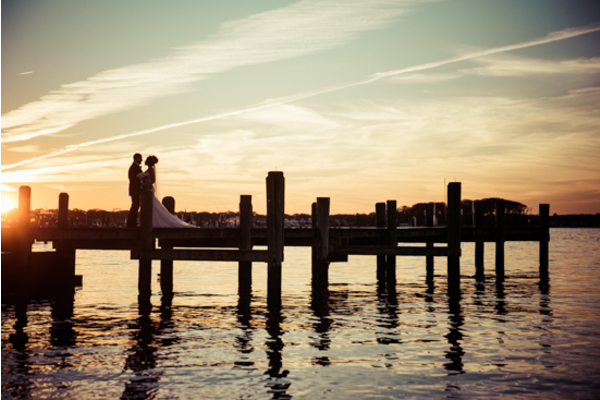 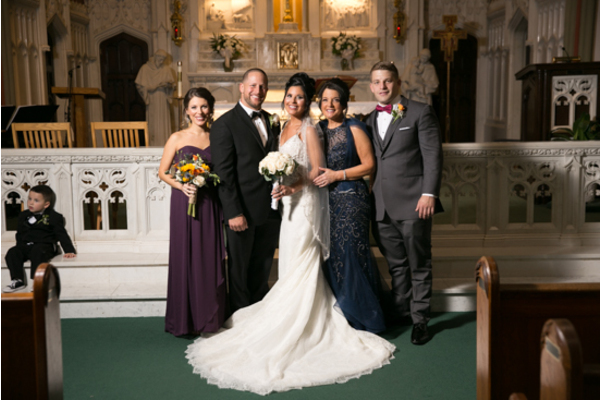 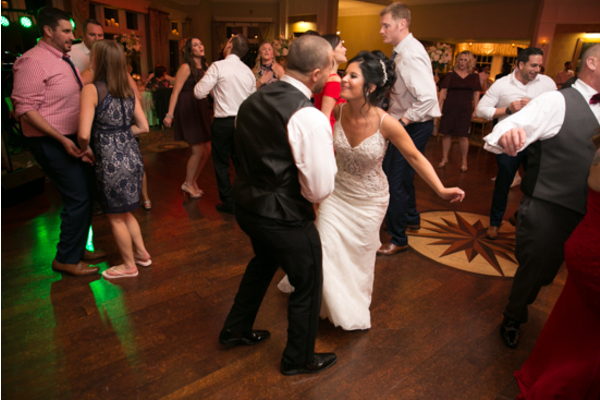 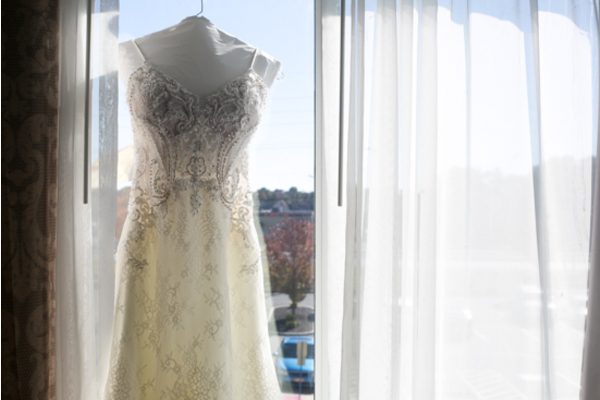 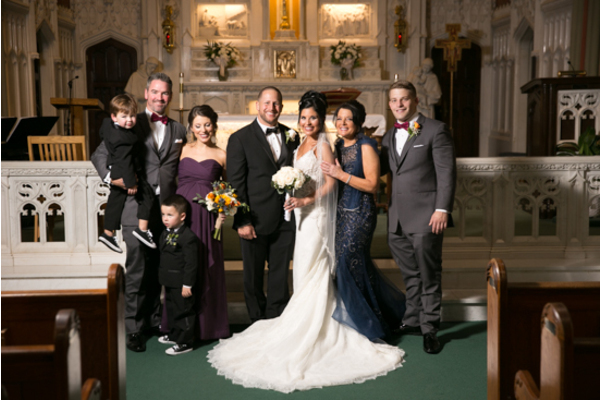 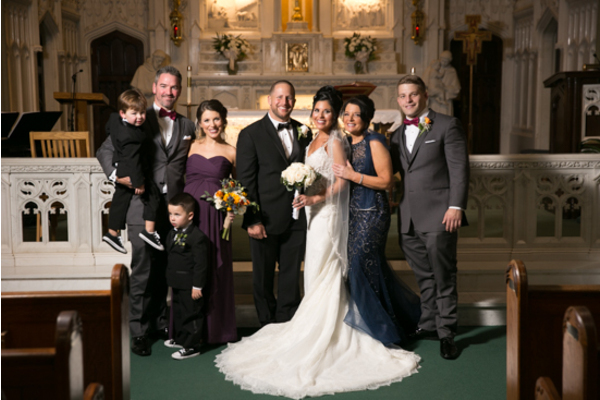 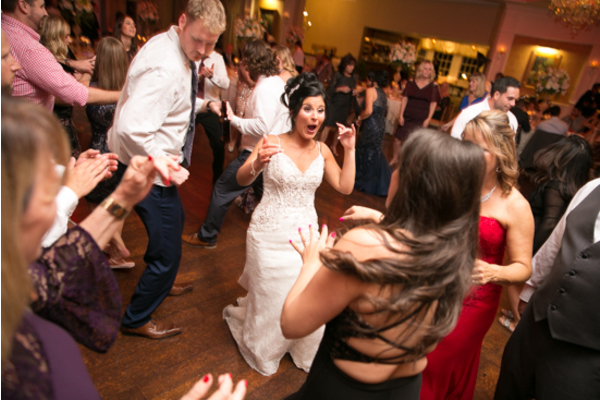 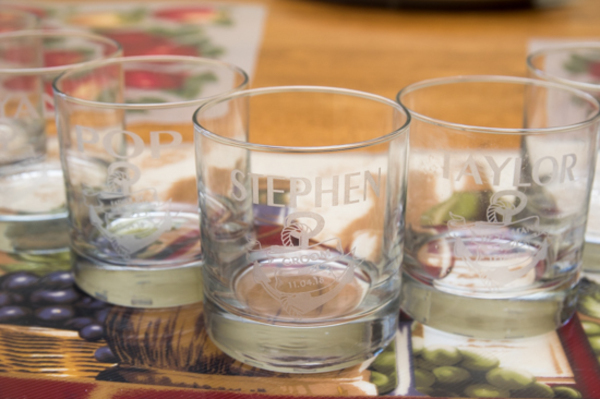 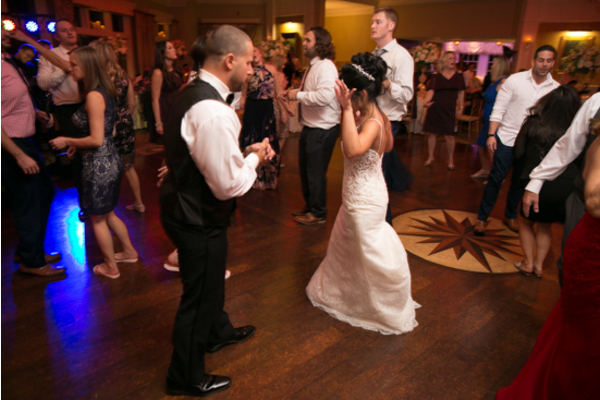 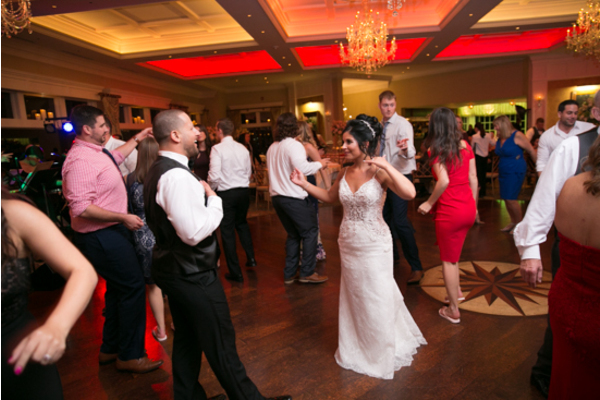 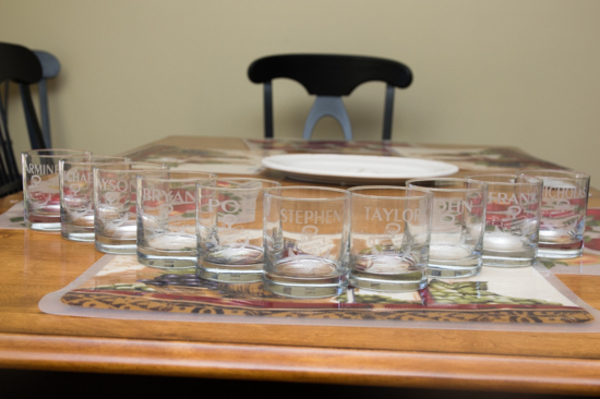 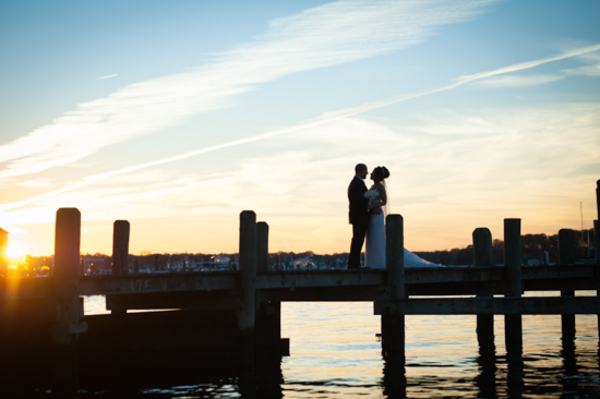 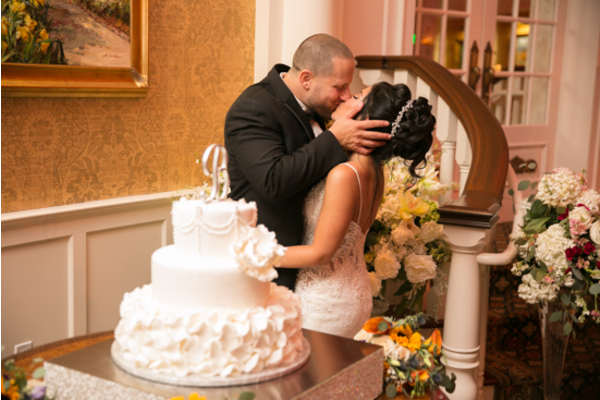 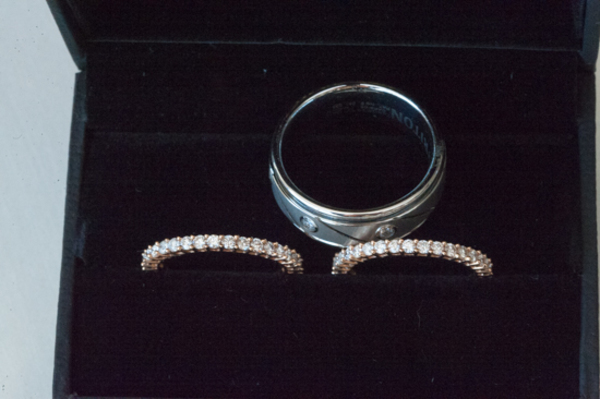 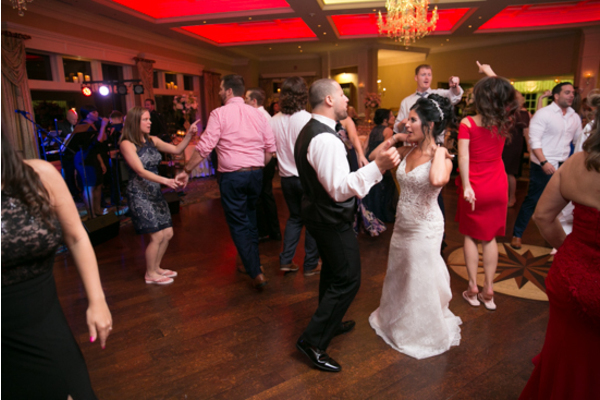 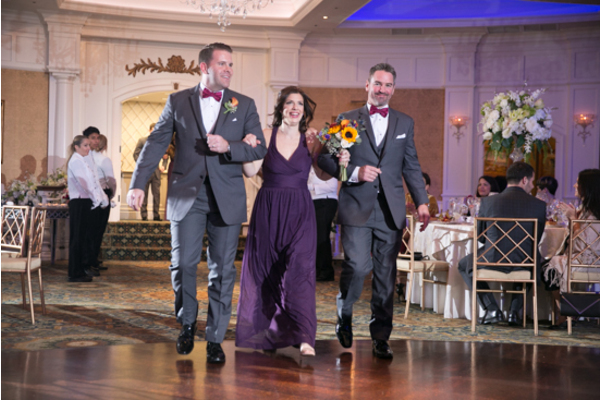 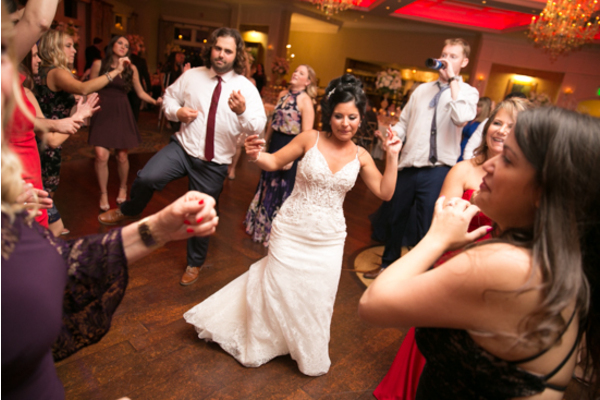 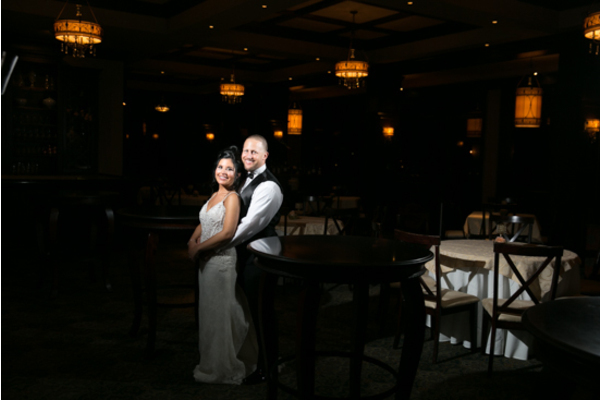 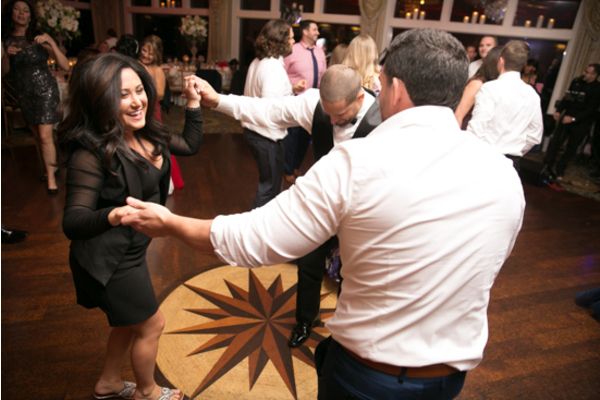 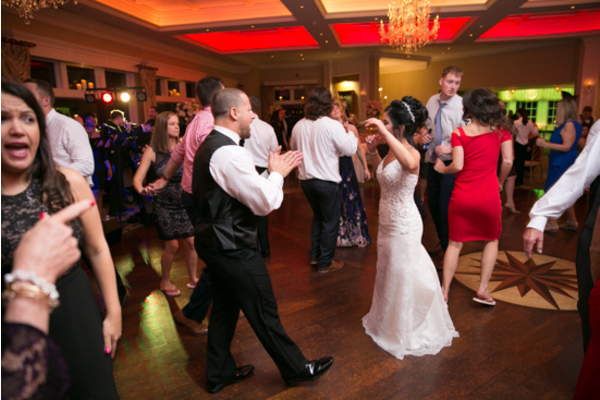 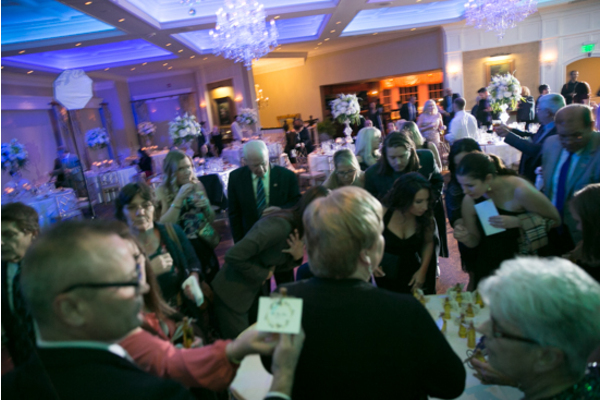 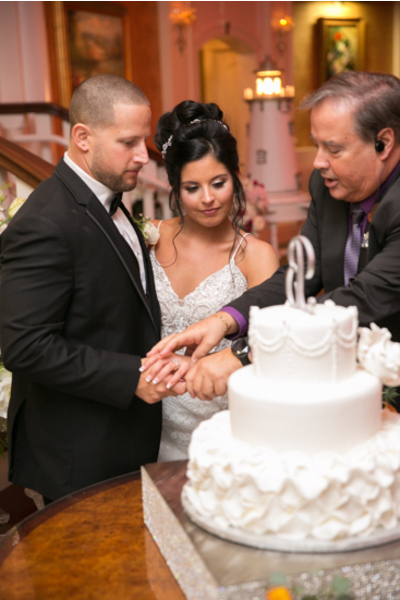 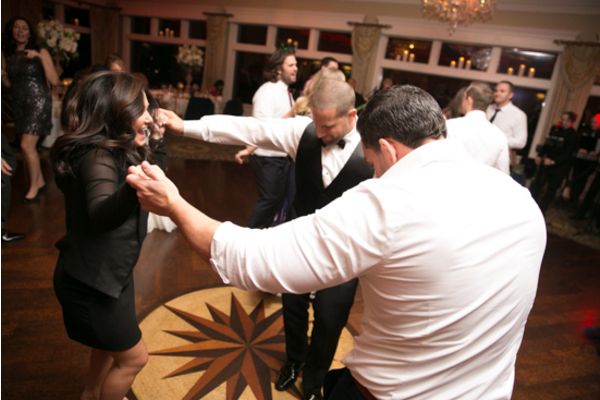 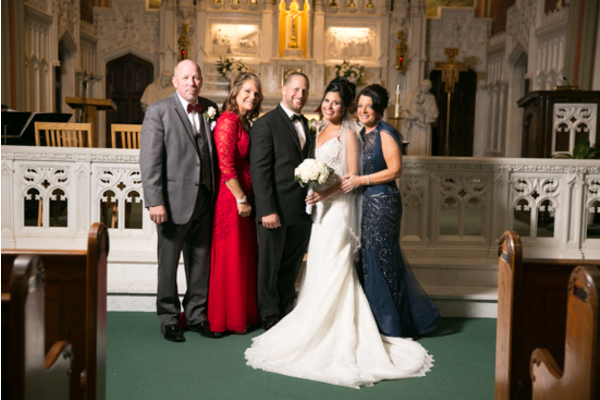 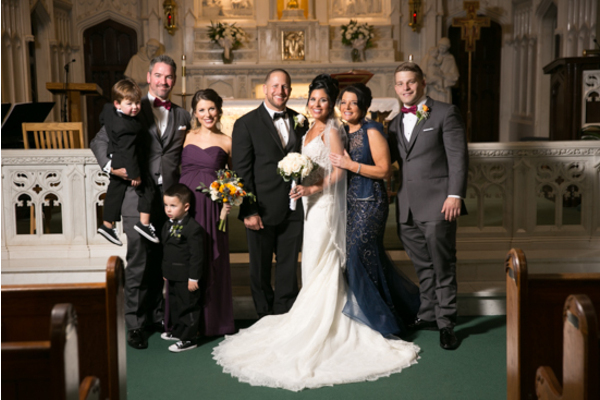 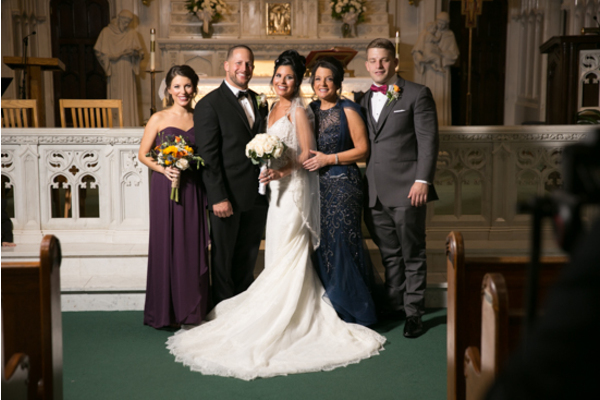 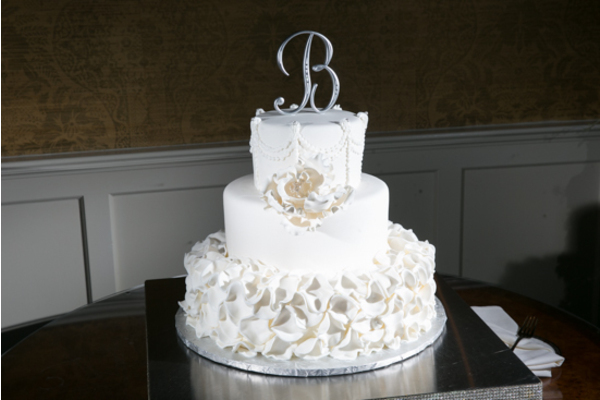 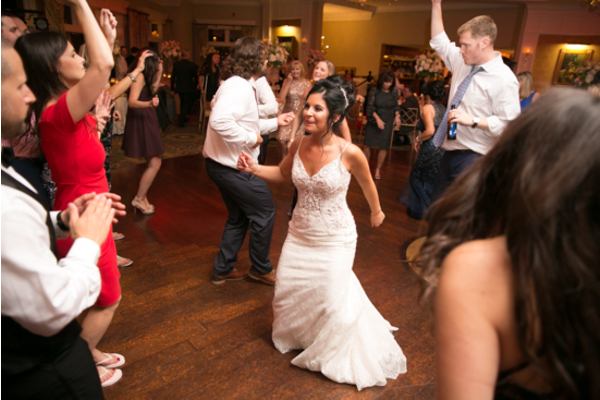 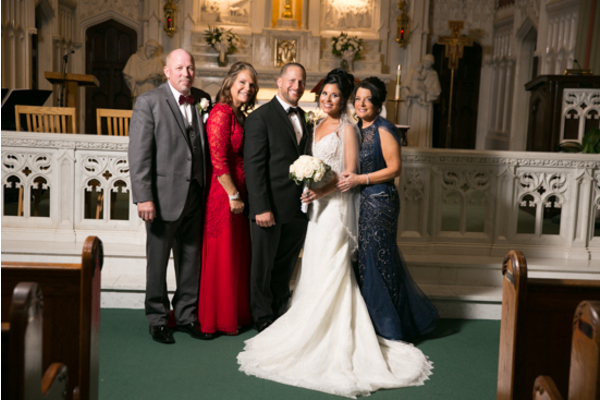 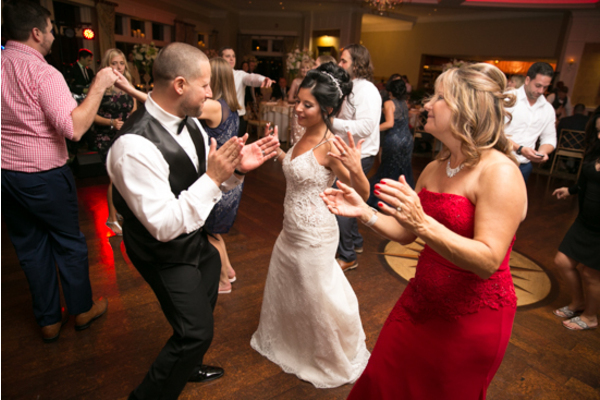 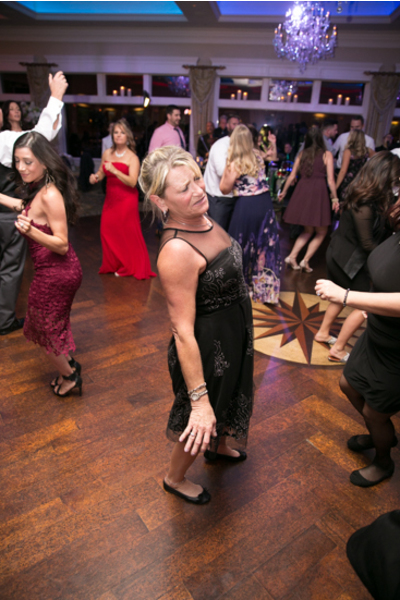 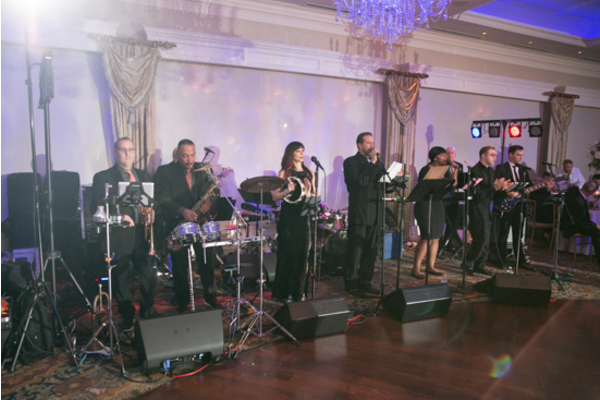 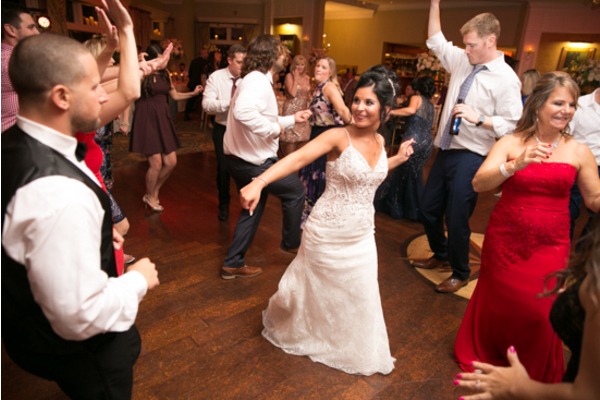 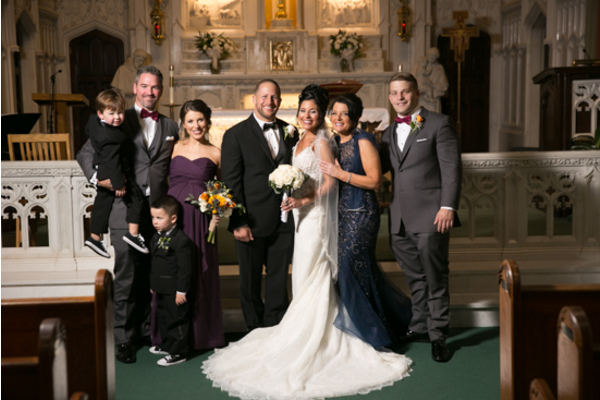 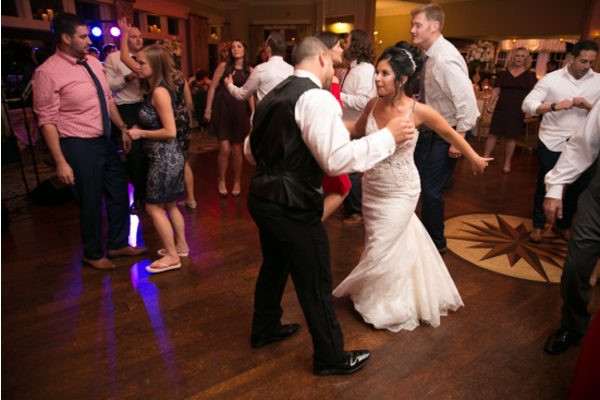 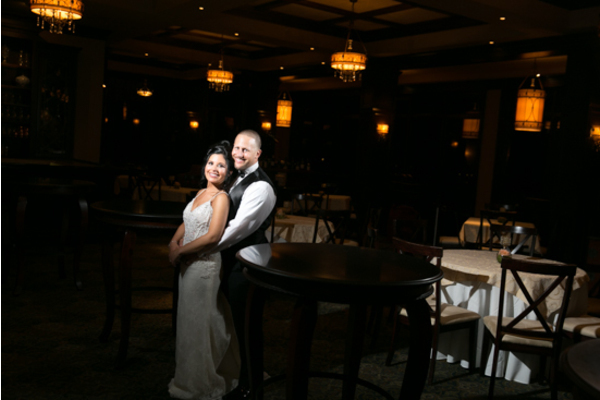 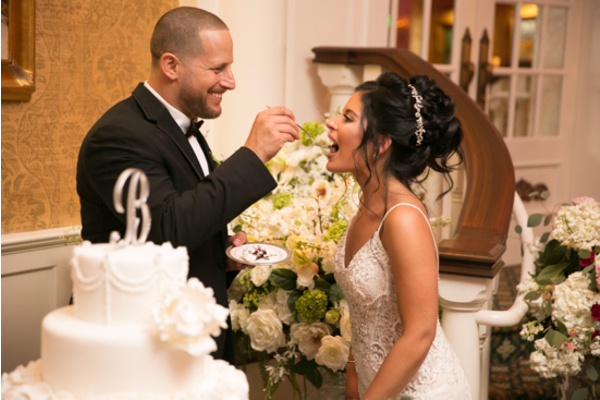 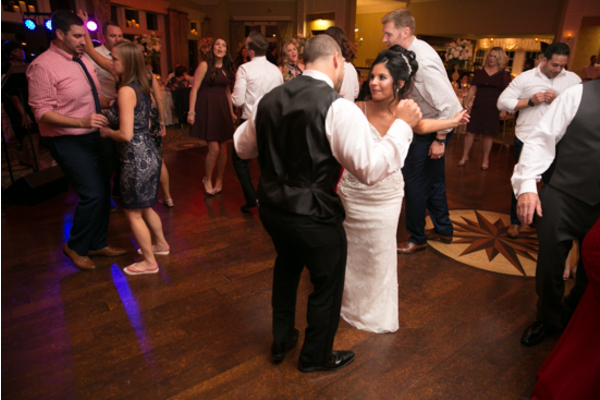 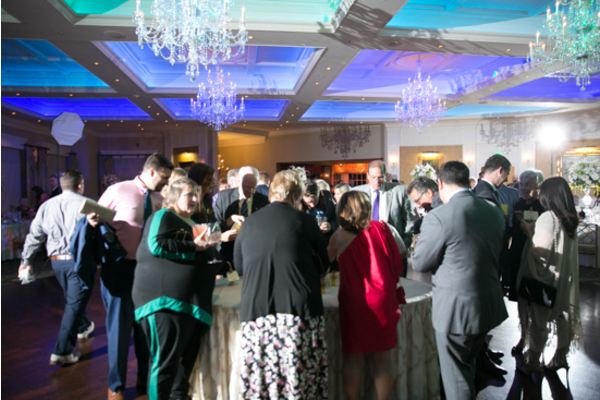 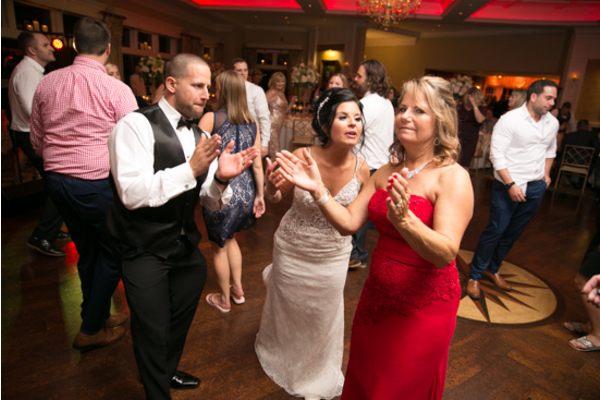 Larissa and Stephen’s celebration took place November 4, 2018 at Clarks Landing Yacht Club in Point Pleasant, New Jersey. 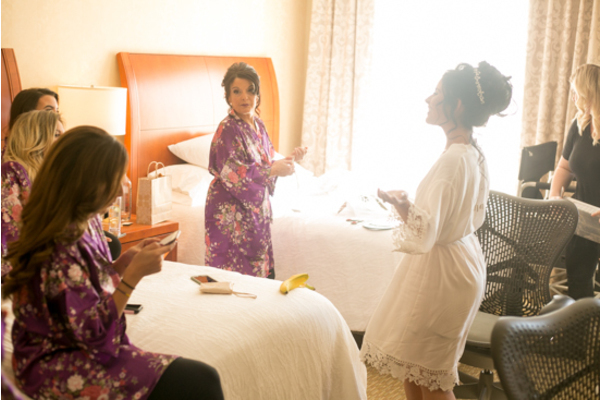 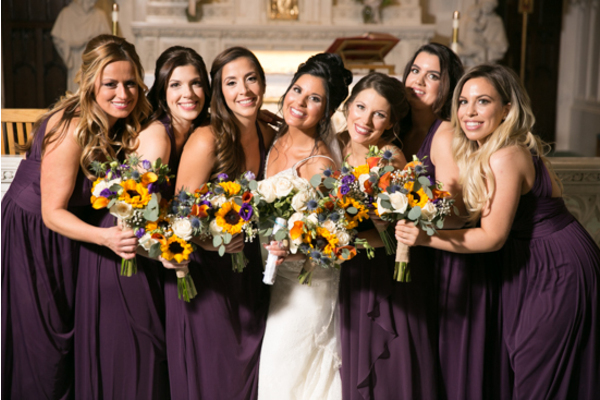 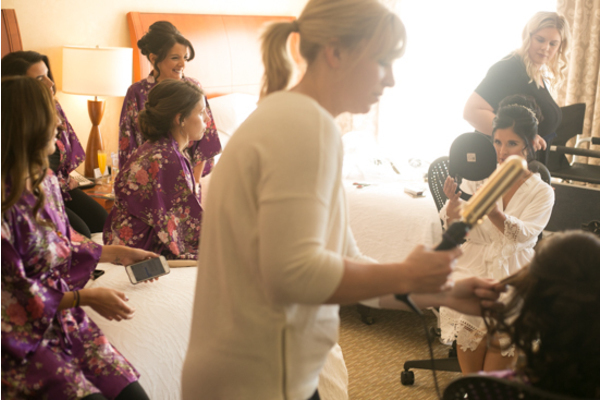 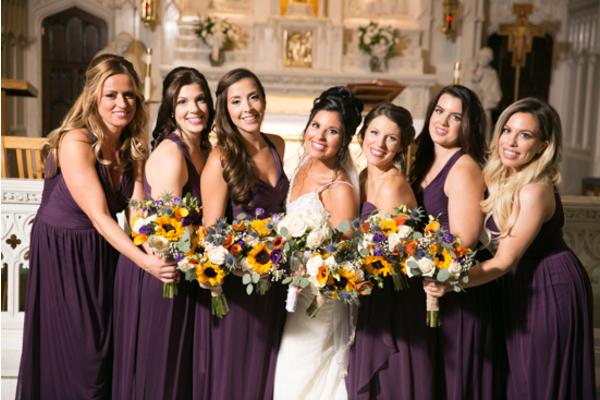 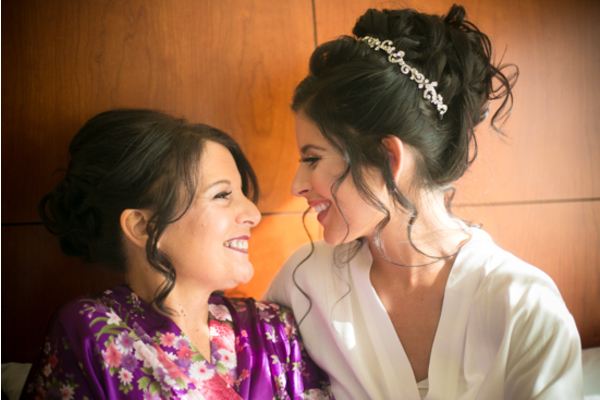 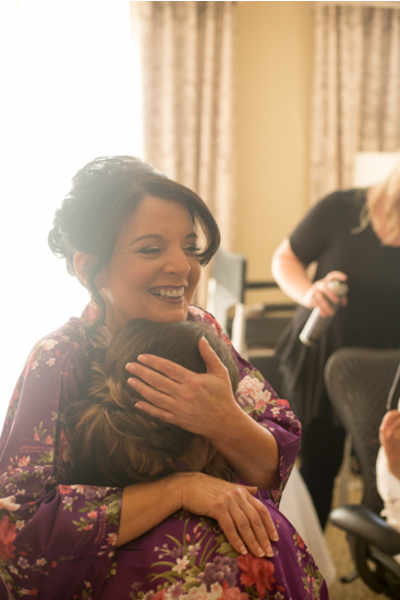 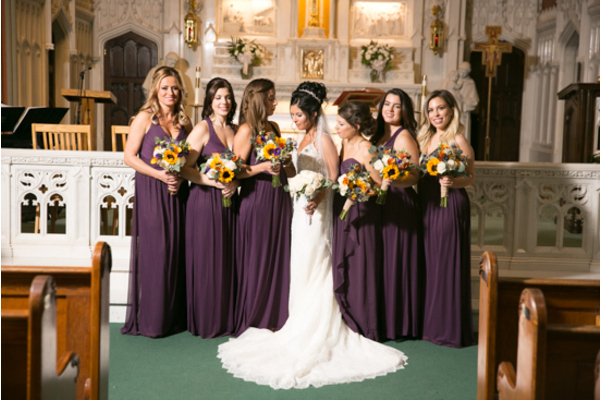 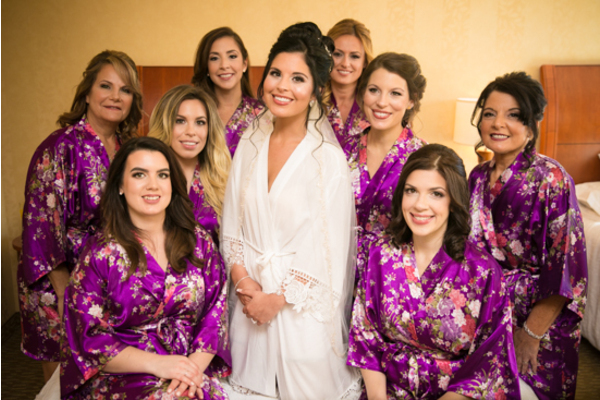 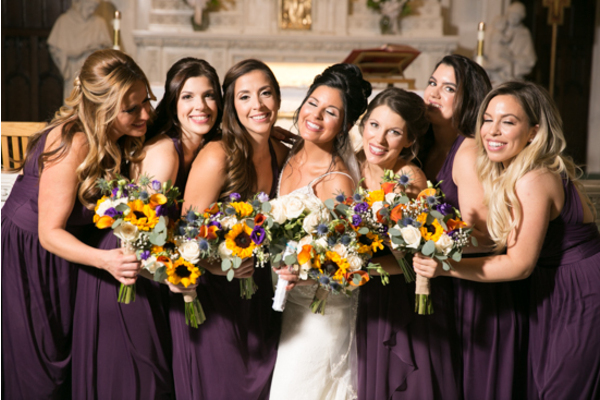 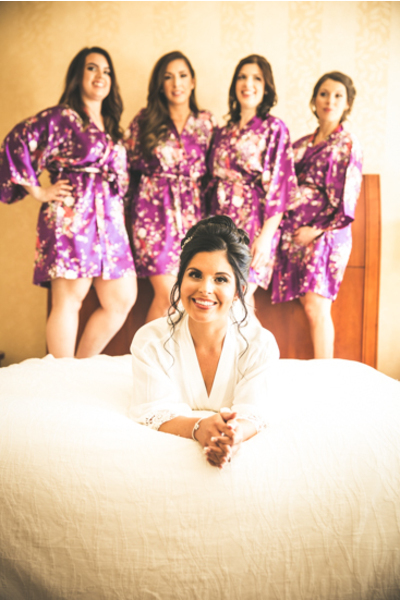 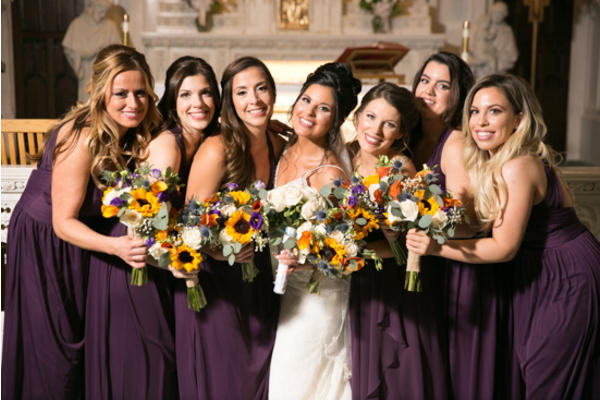 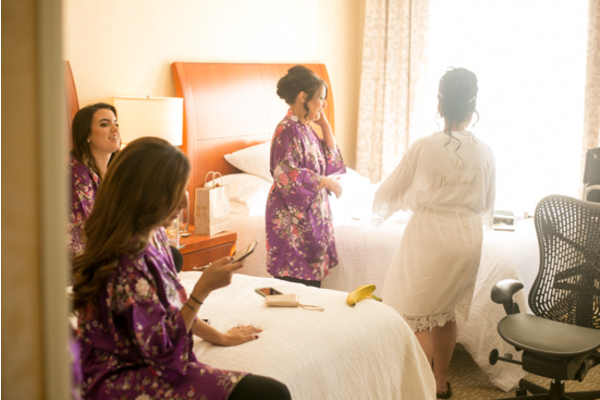 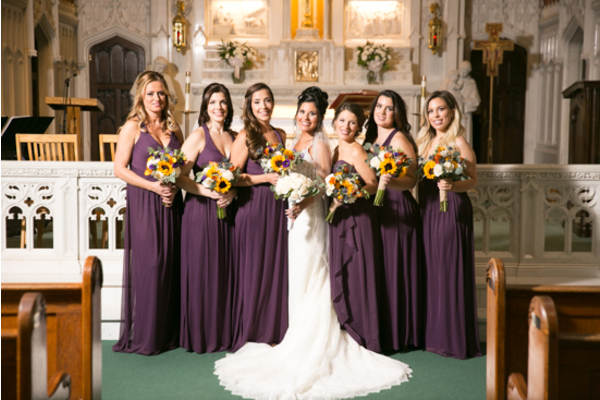 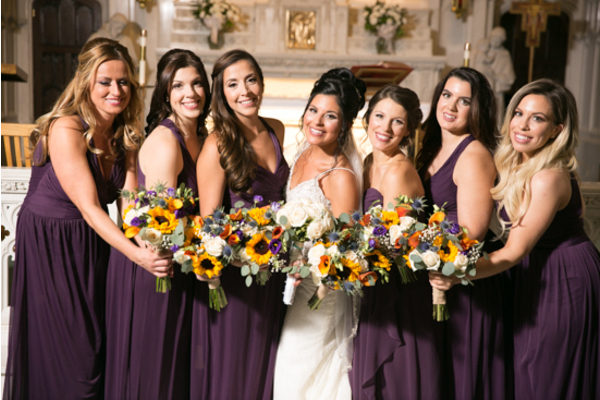 Larissa began her day with her bridesmaids, each in matching floral royal purple robes. 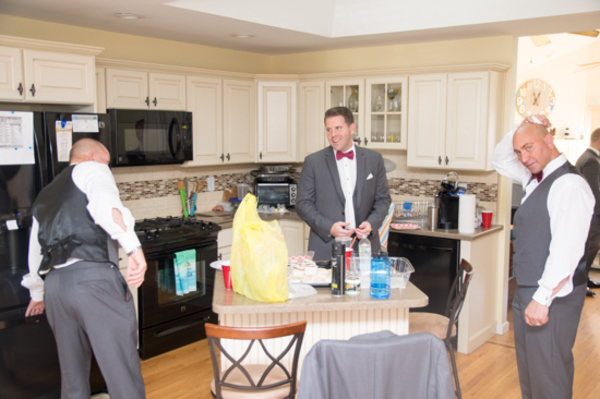 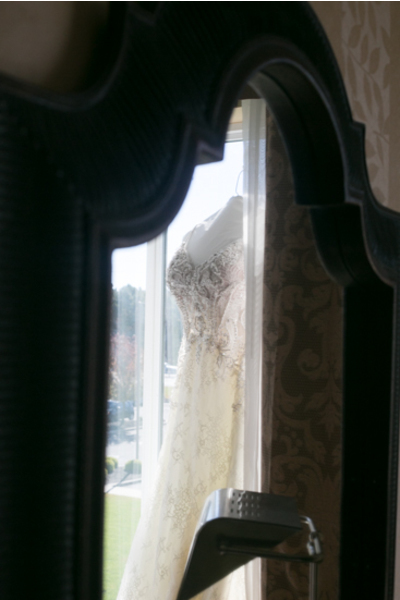 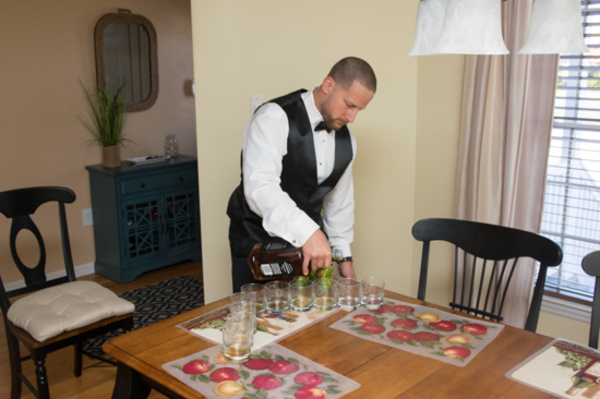 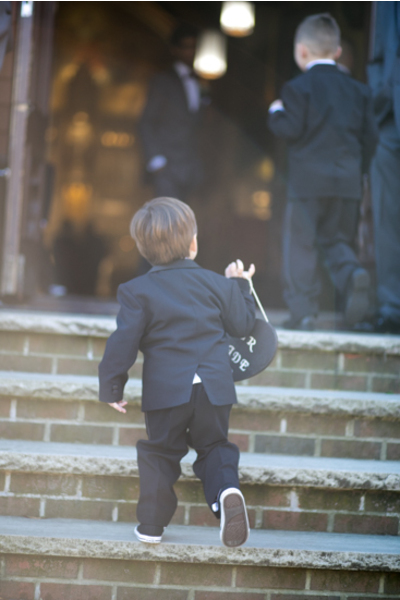 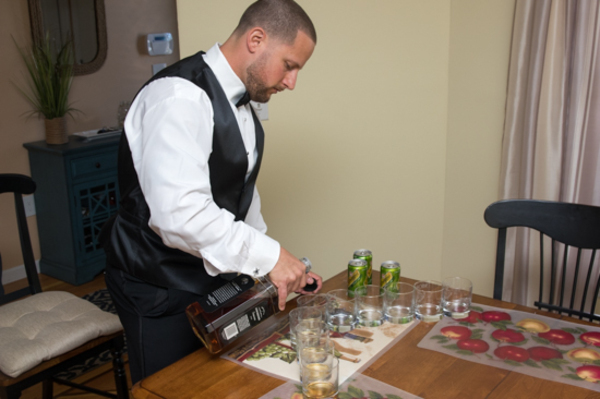 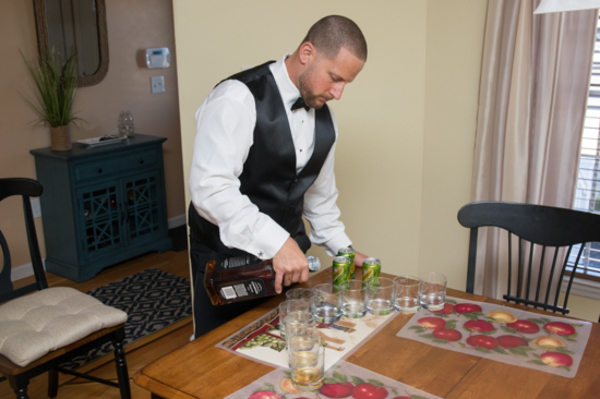 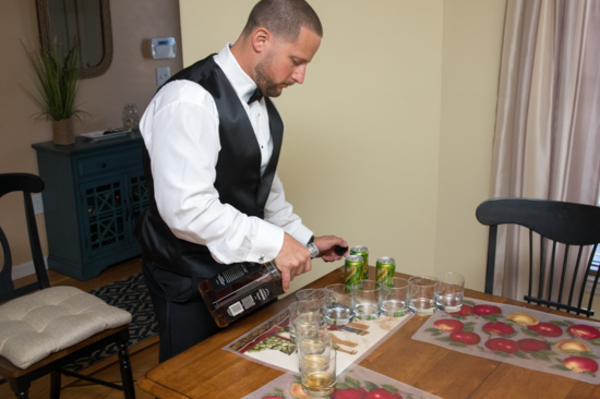 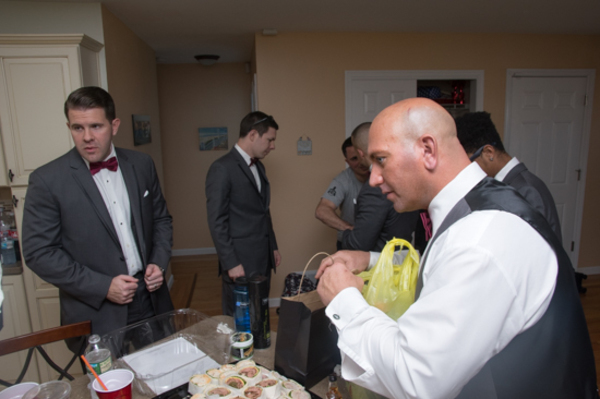 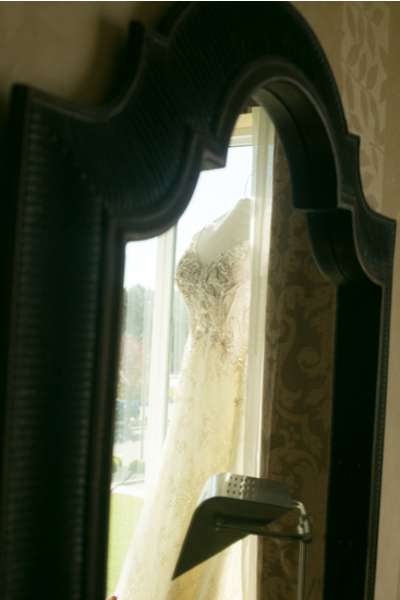 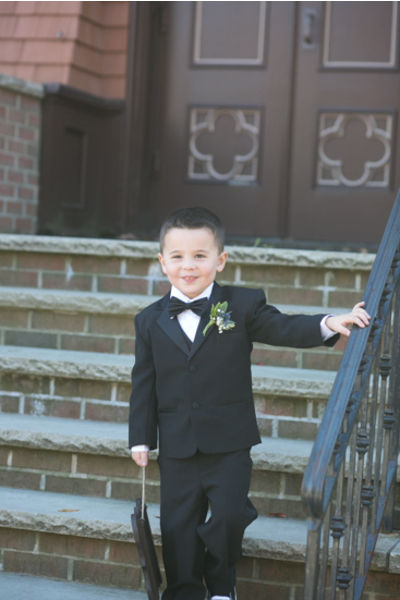 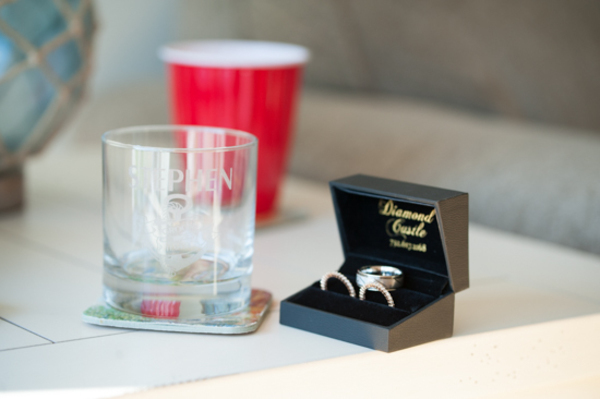 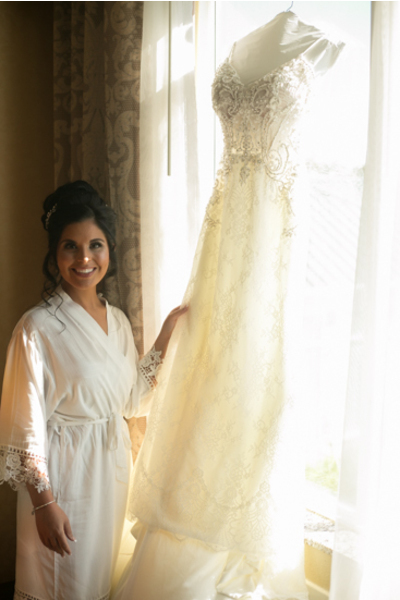 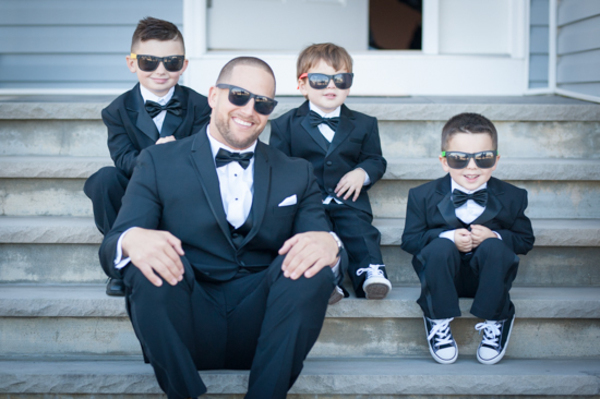 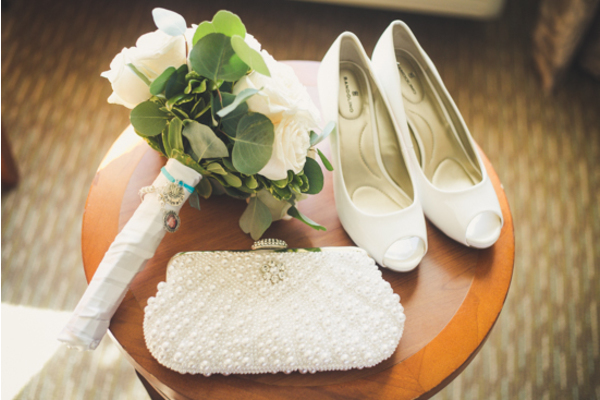 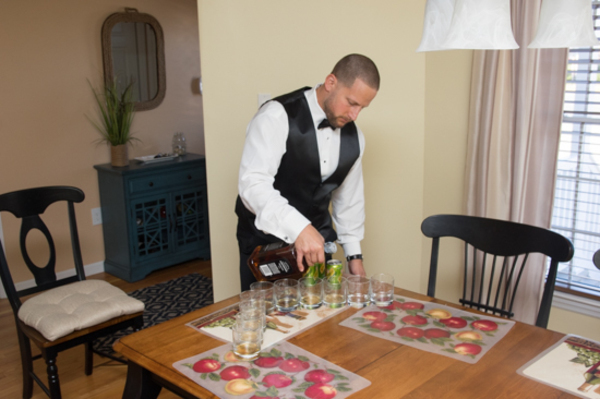 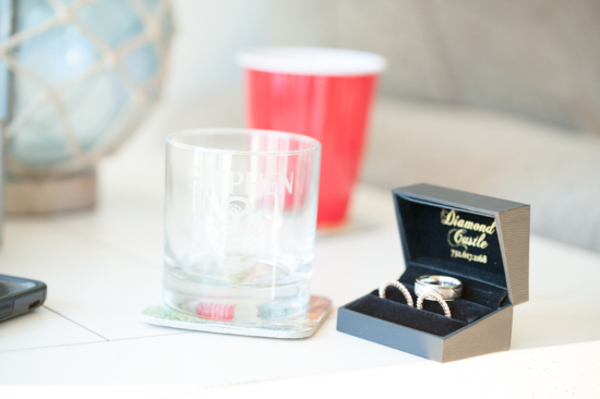 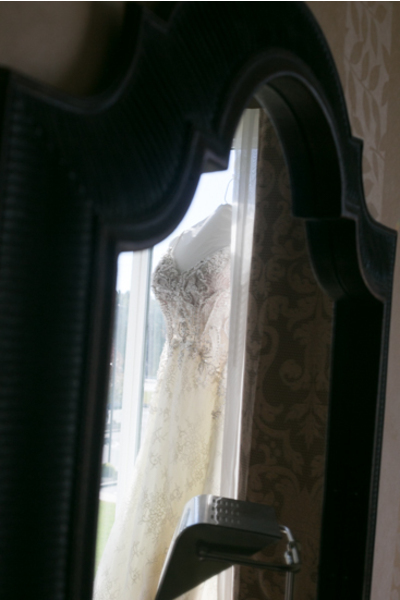 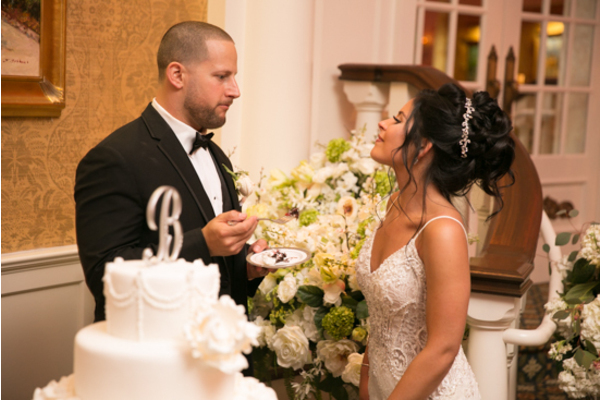 Our NJ Wedding Photographer was there as they gathered around Larissa to pop some champagne and take some beautiful portraits. 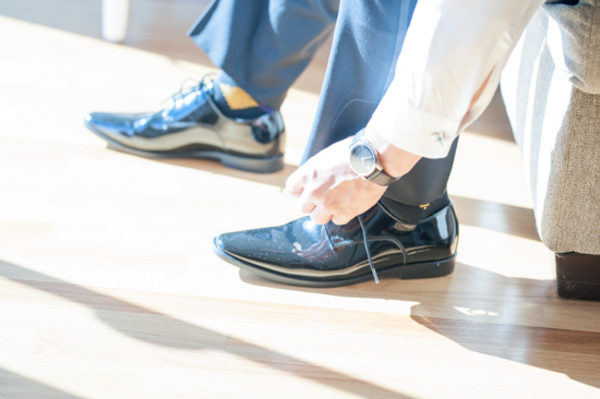 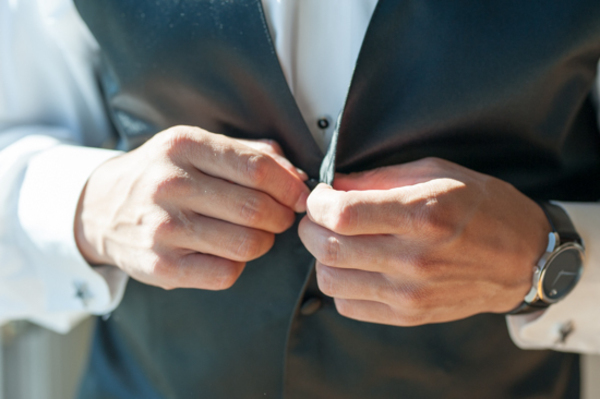 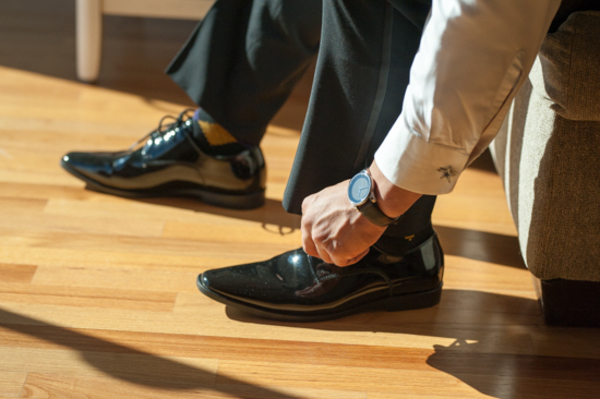 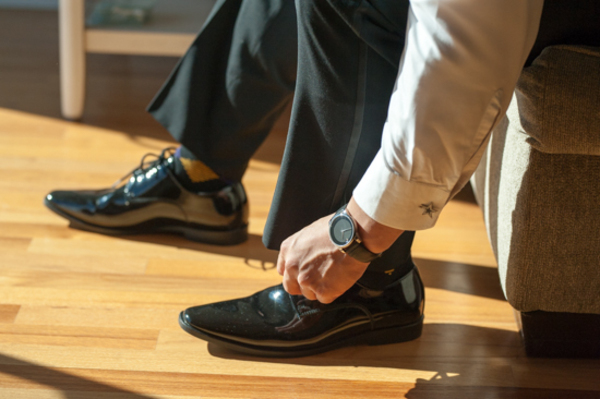 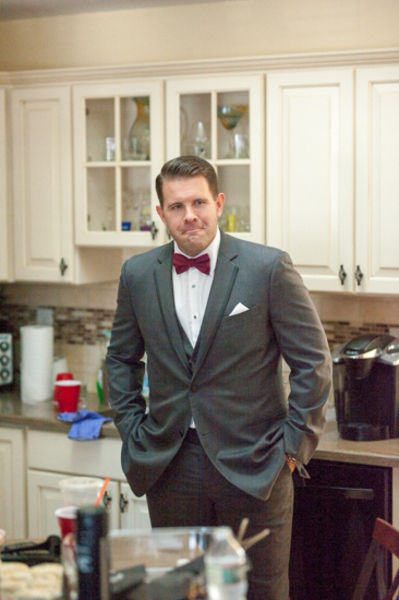 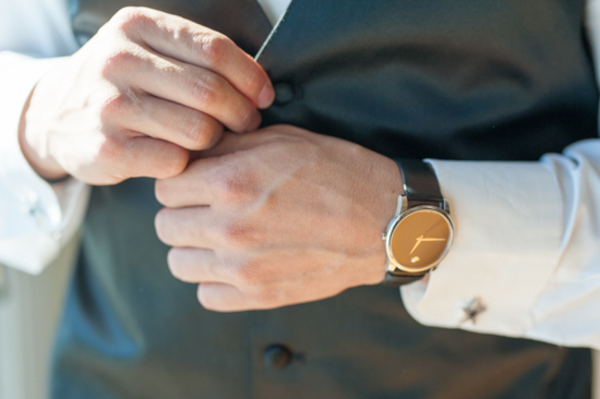 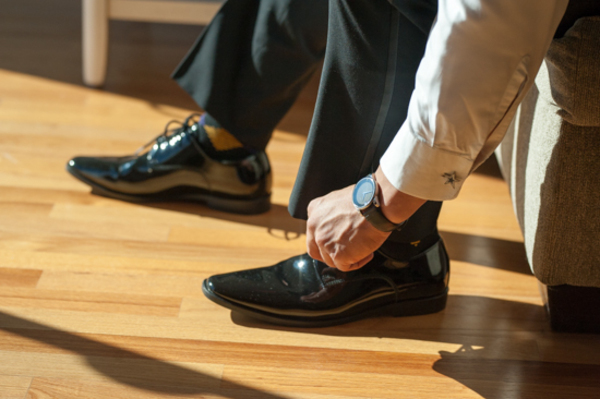 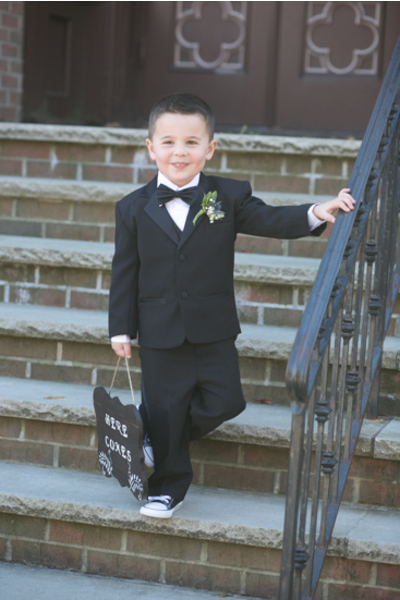 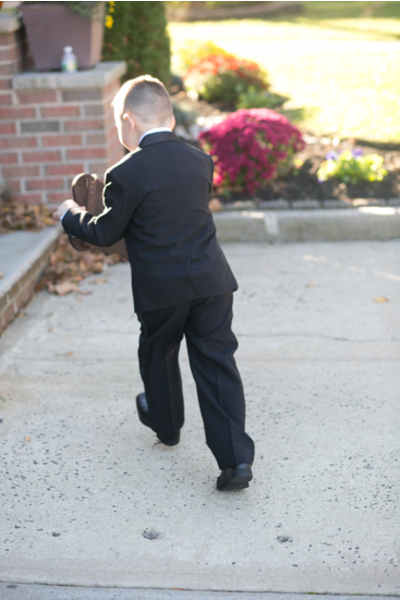 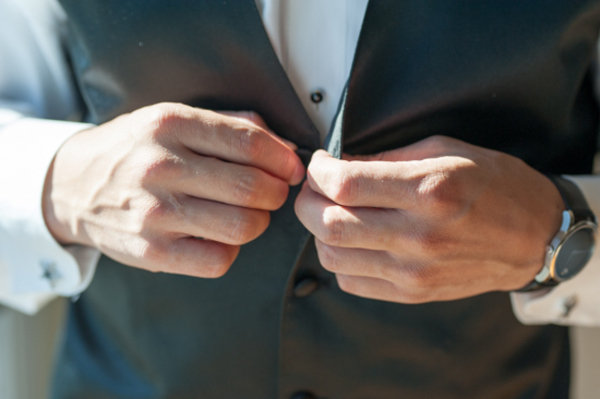 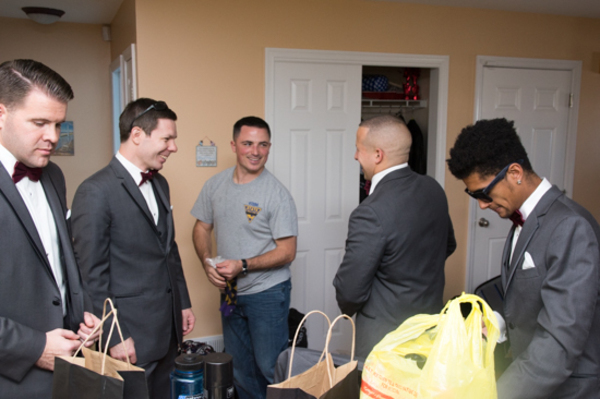 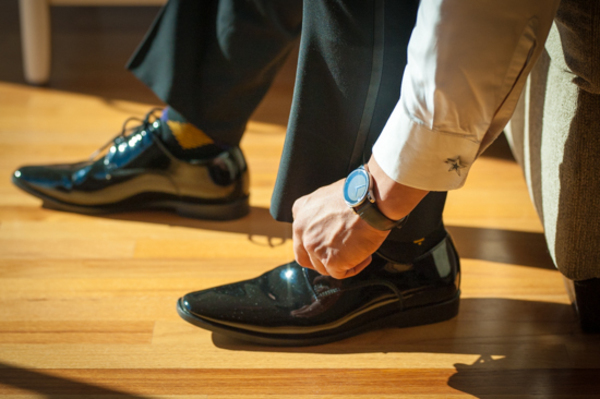 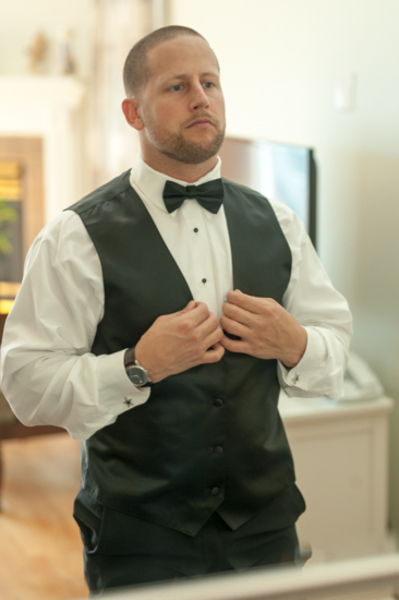 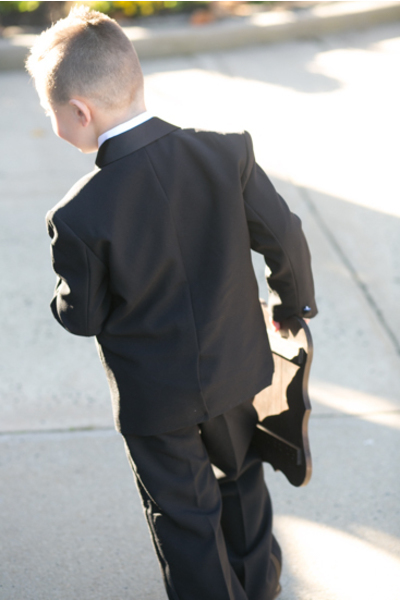 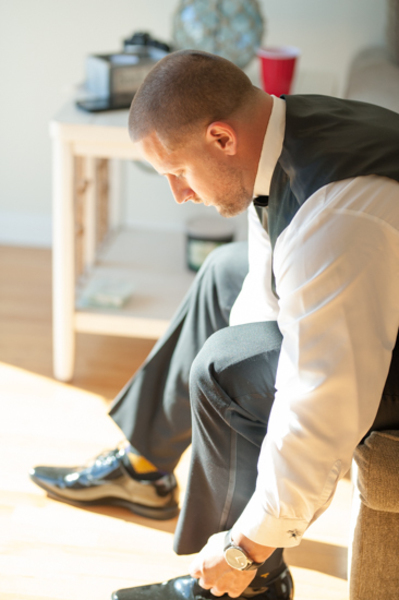 Nearby Stephen completed his look by tying his tie and lacing his shoes. 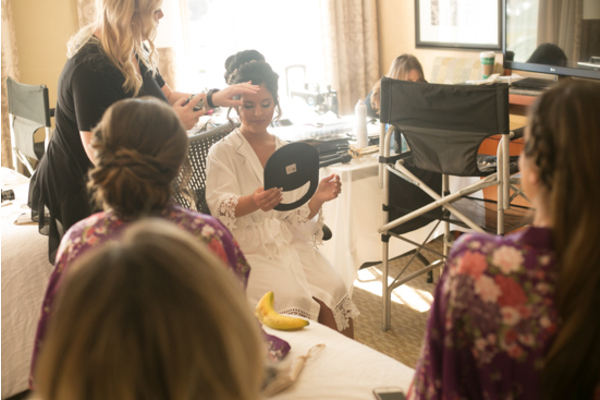 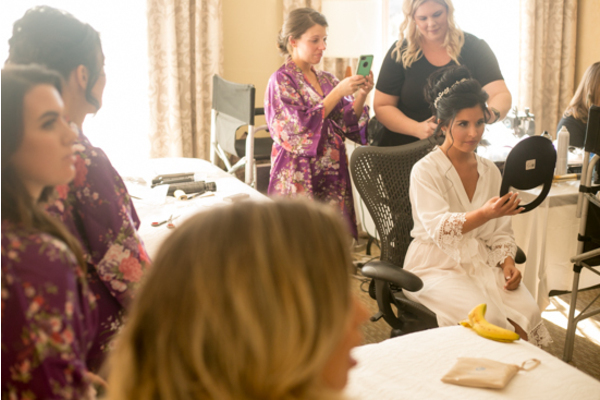 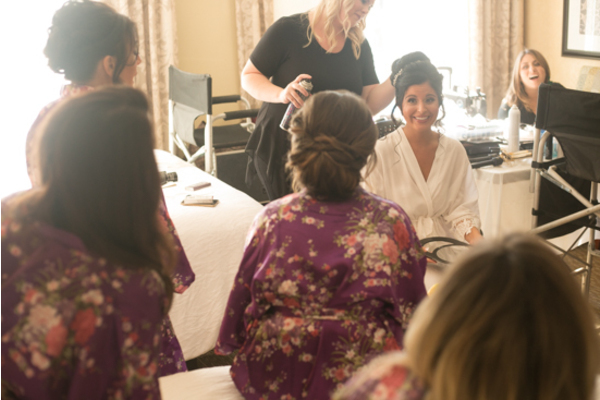 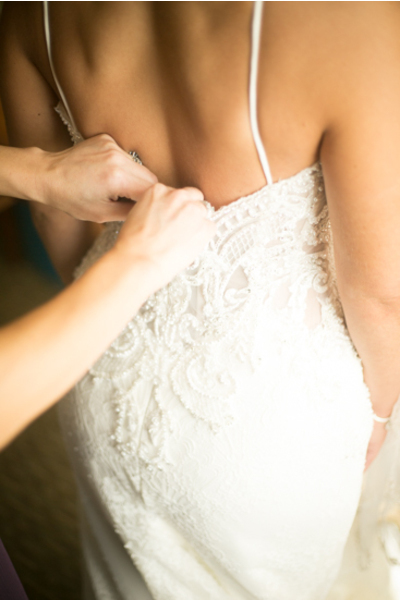 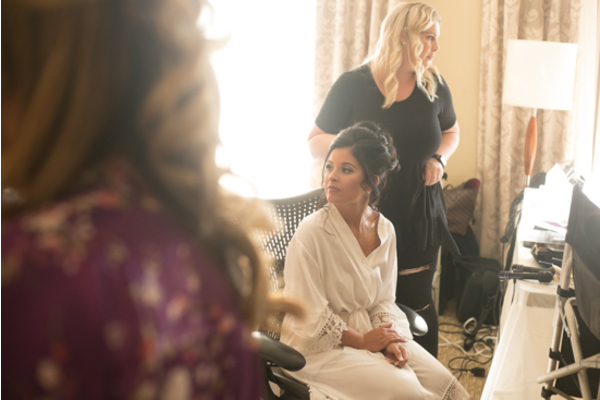 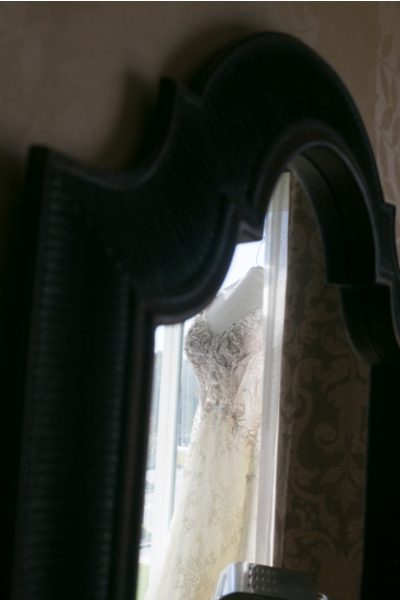 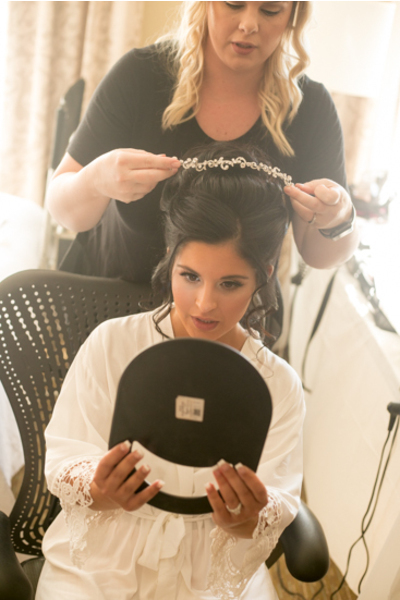 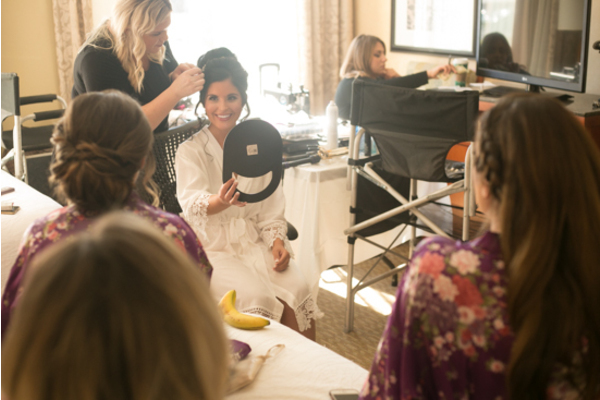 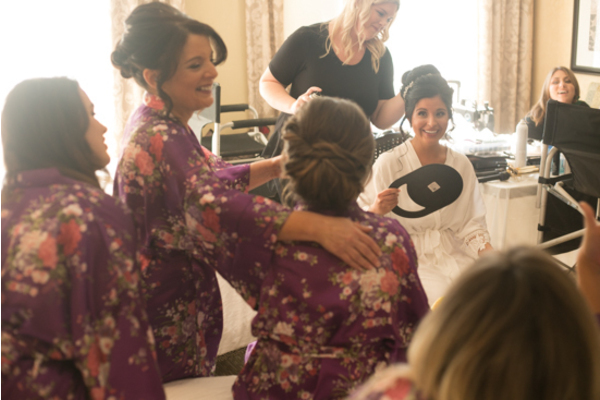 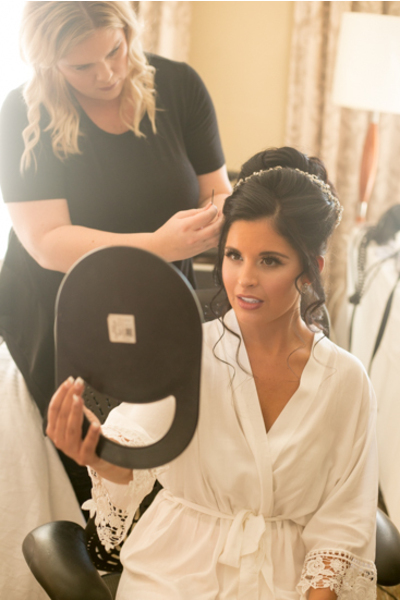 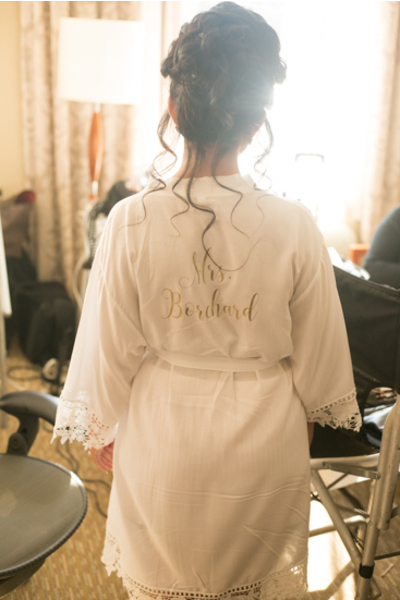 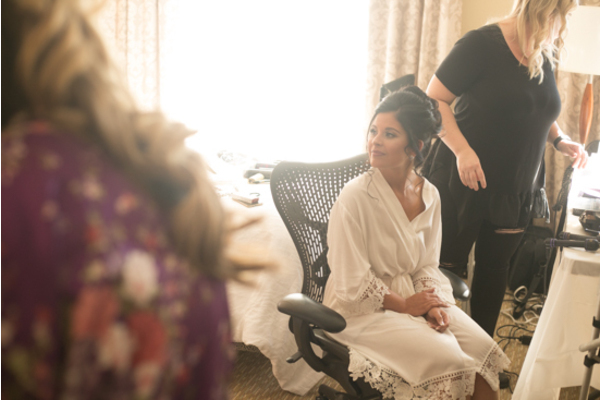 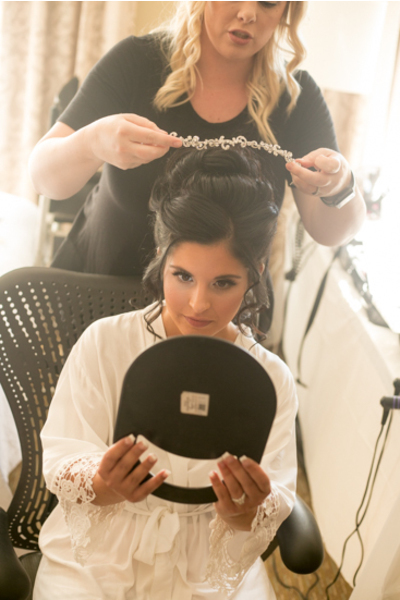 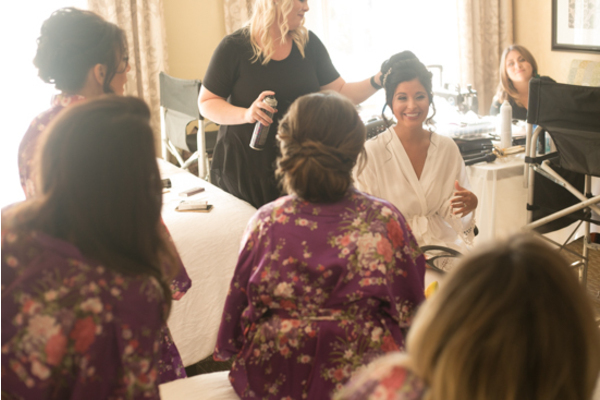 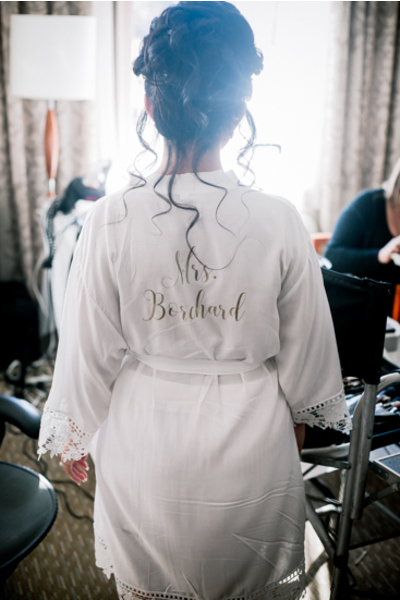 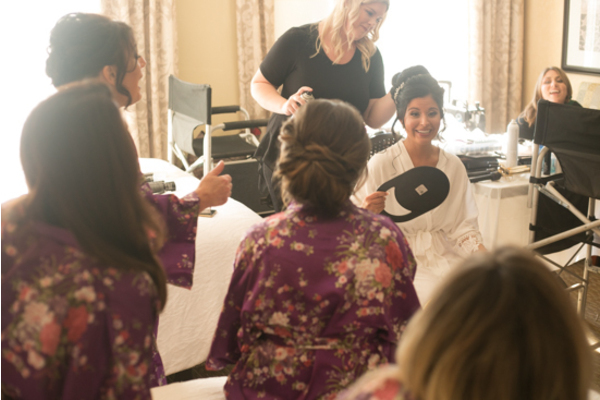 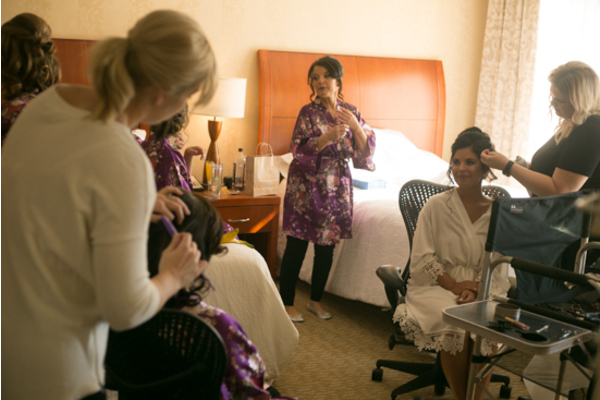 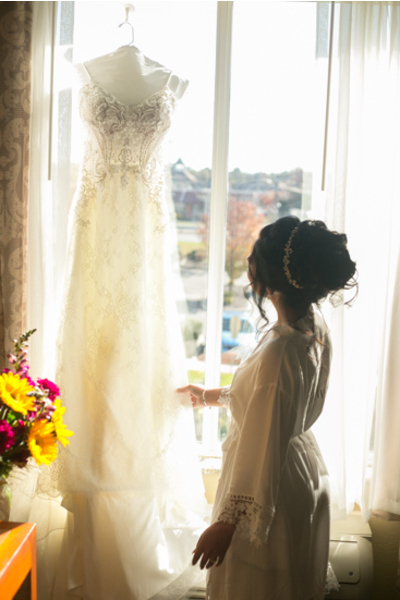 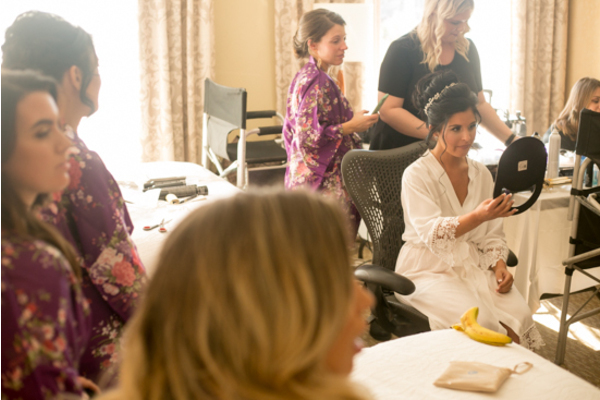 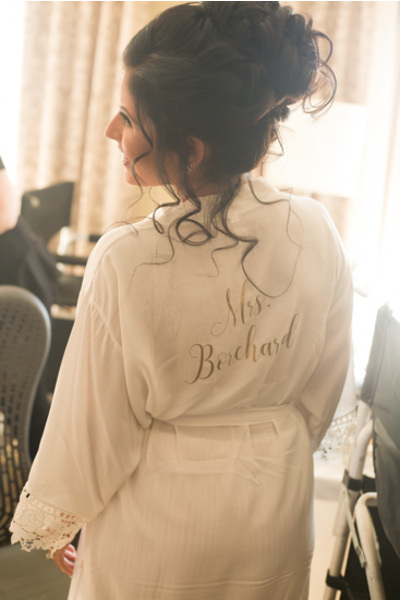 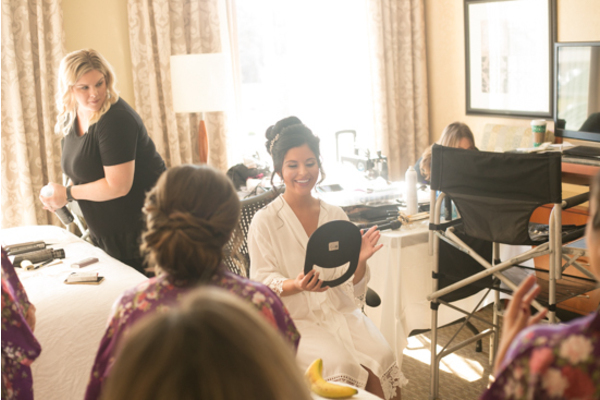 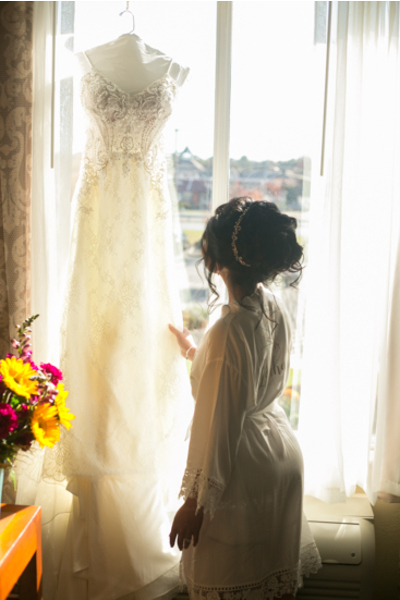 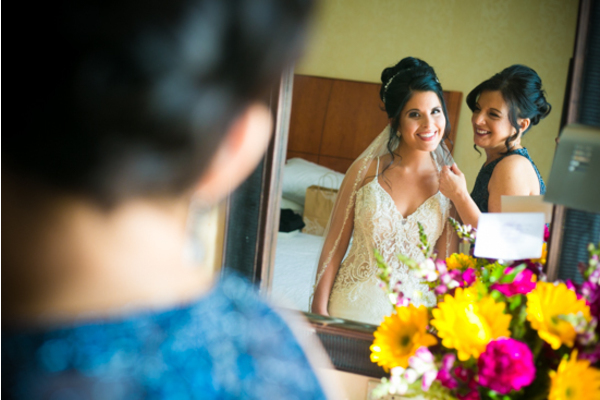 Once Larissa added the finishing touches to her hair and make up our NJ Wedding Photographer was there as she revealed her final look to her bridesmaids. 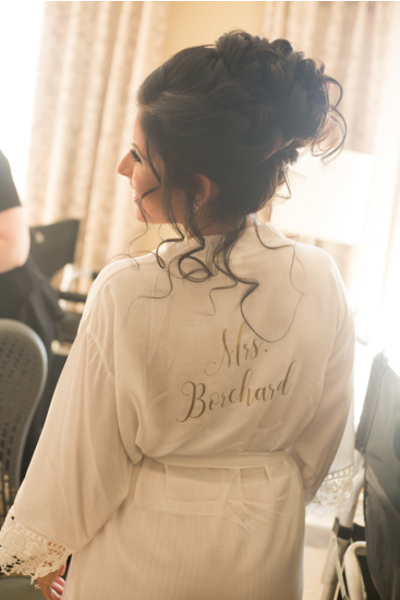 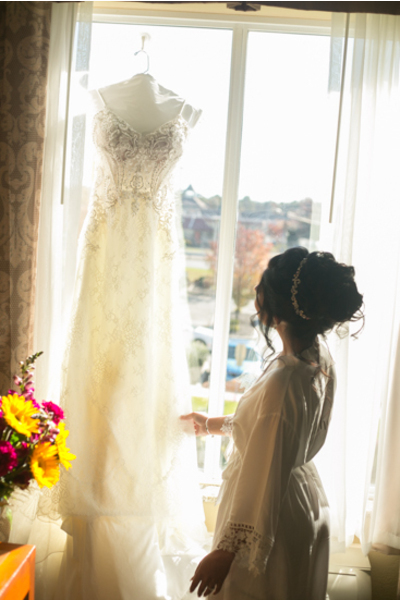 Feeling confident and full of love she was ready to head to the ceremony! 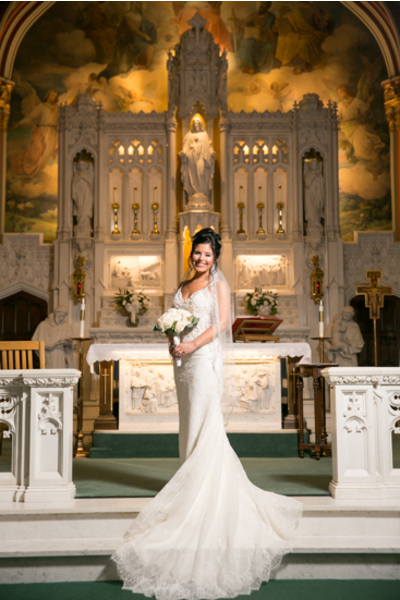 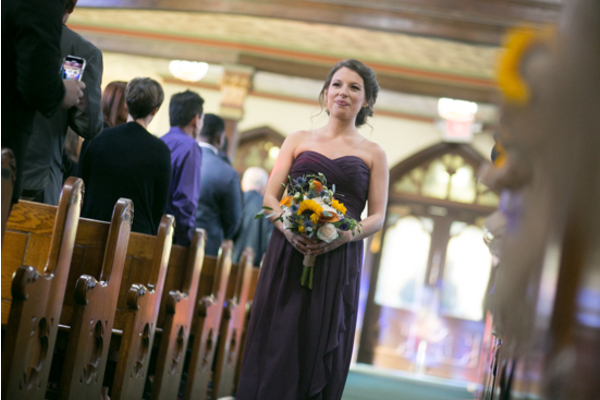 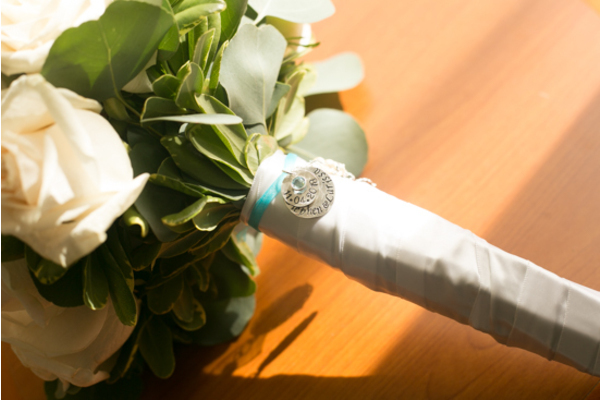 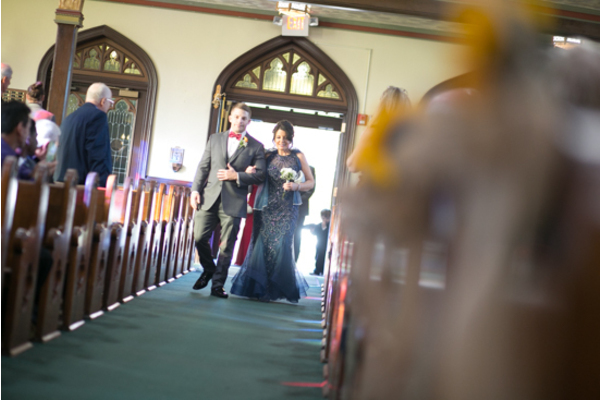 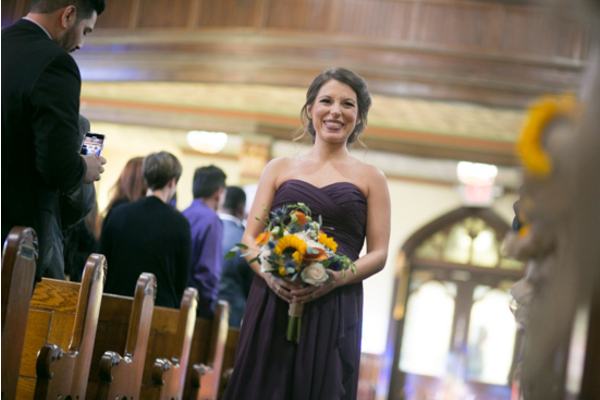 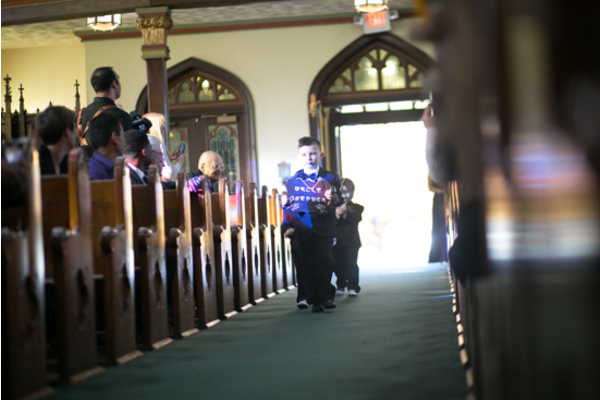 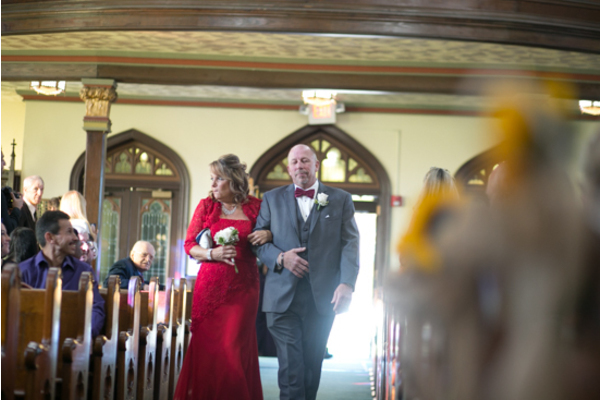 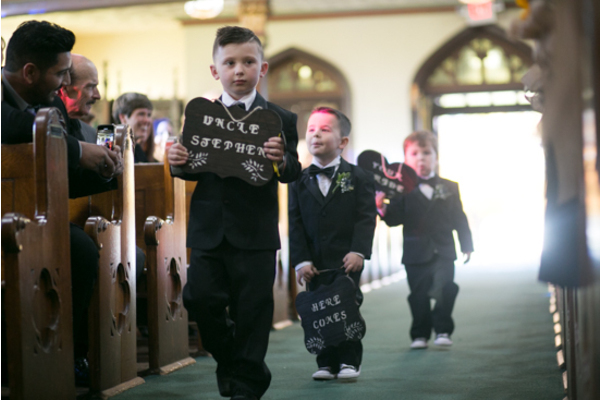 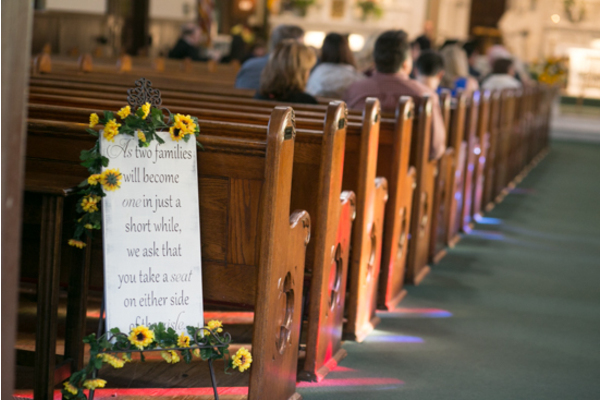 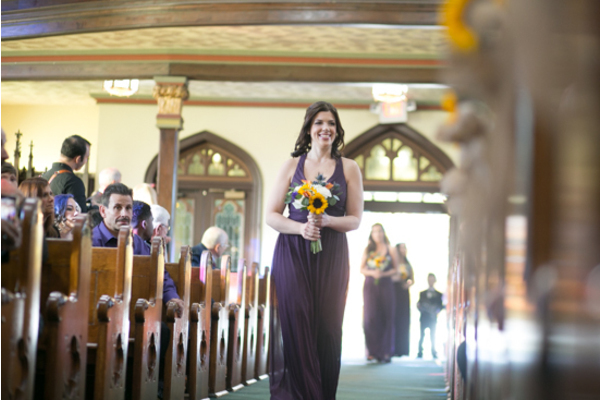 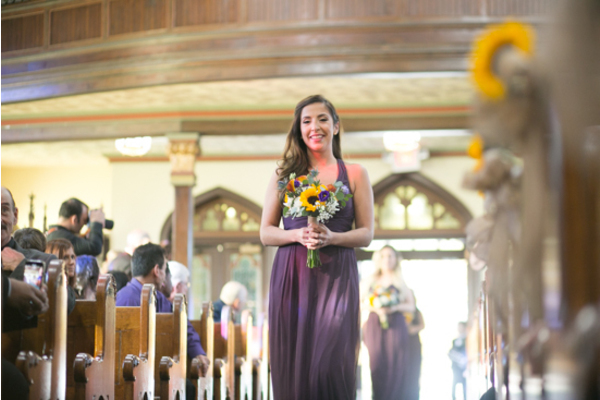 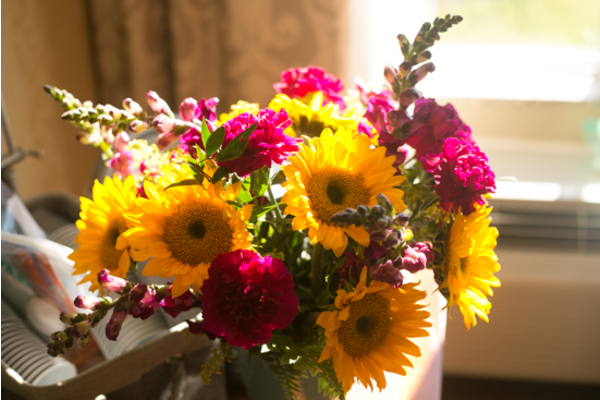 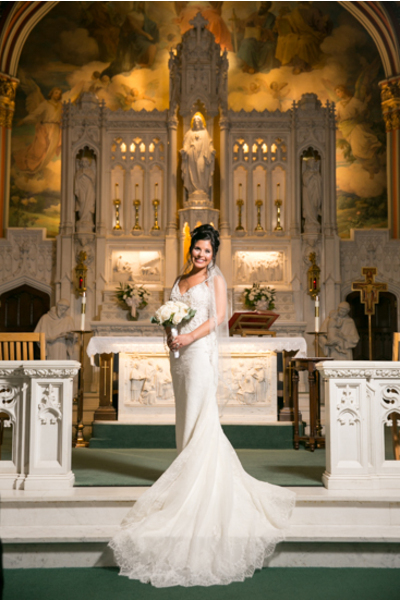 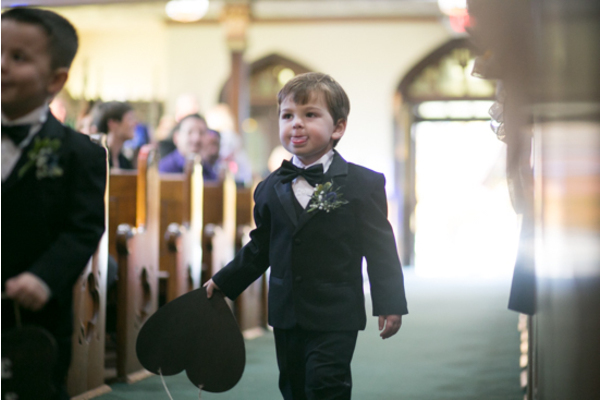 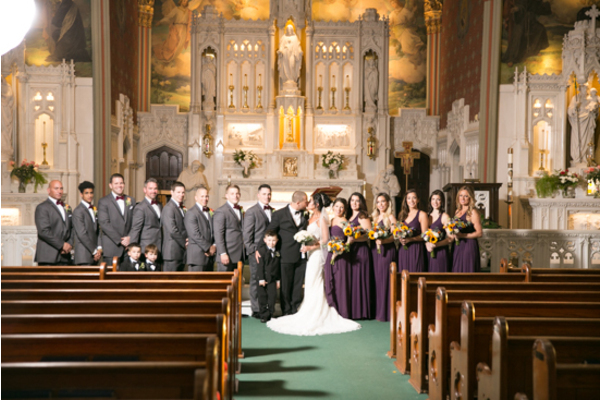 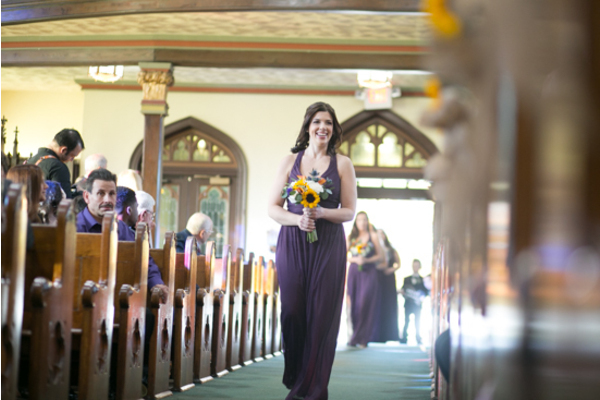 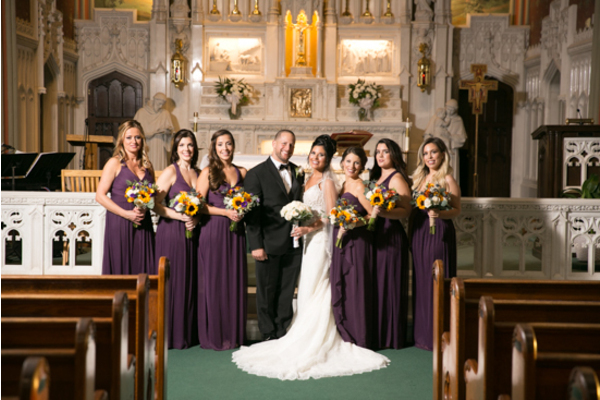 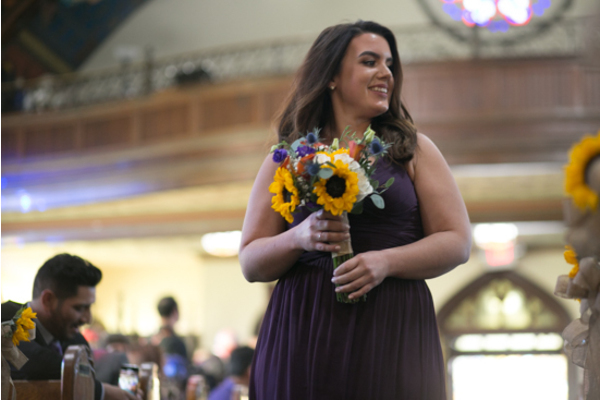 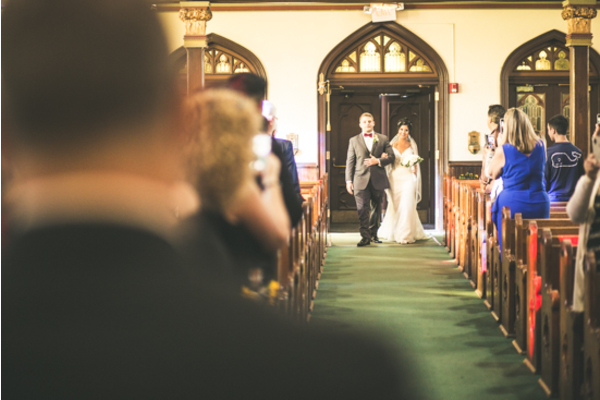 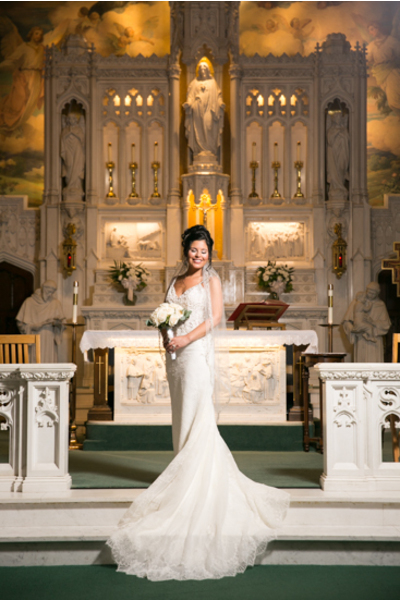 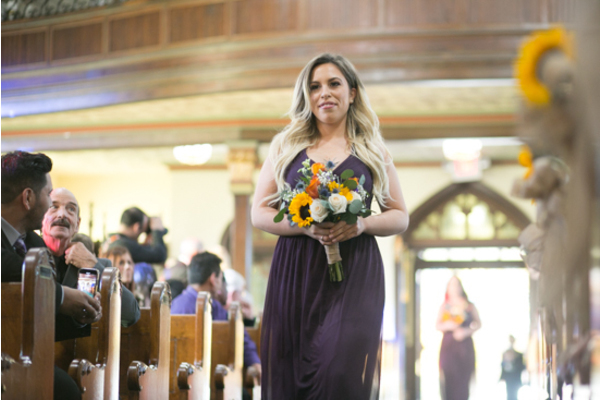 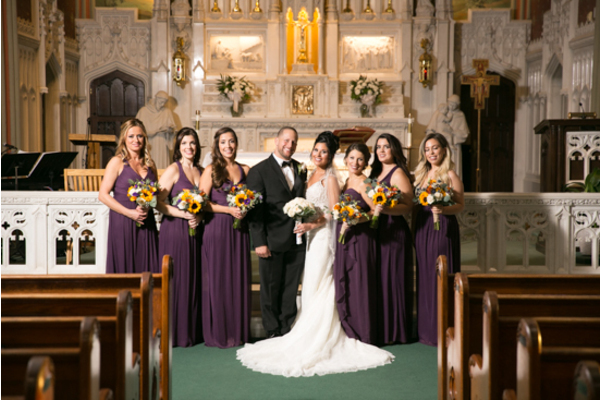 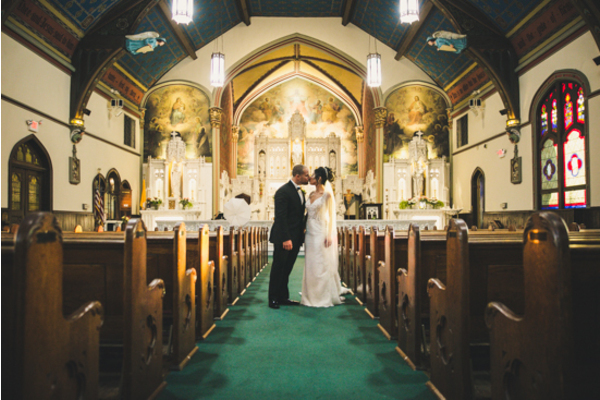 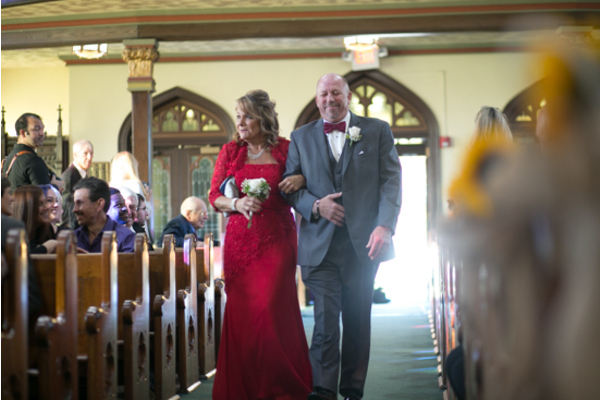 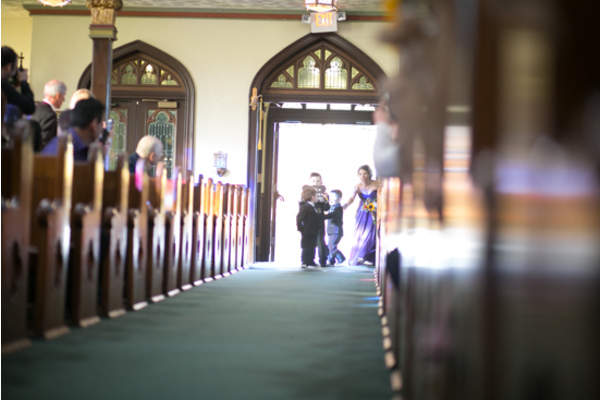 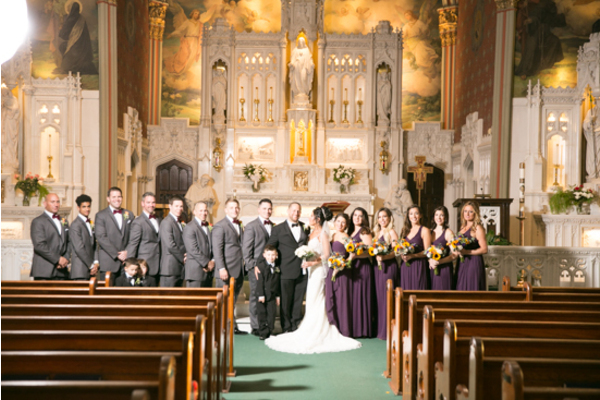 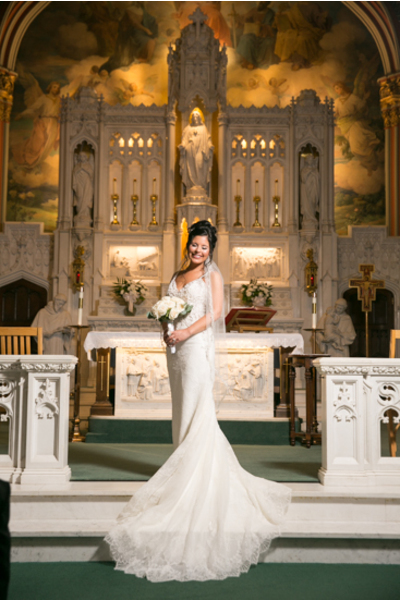 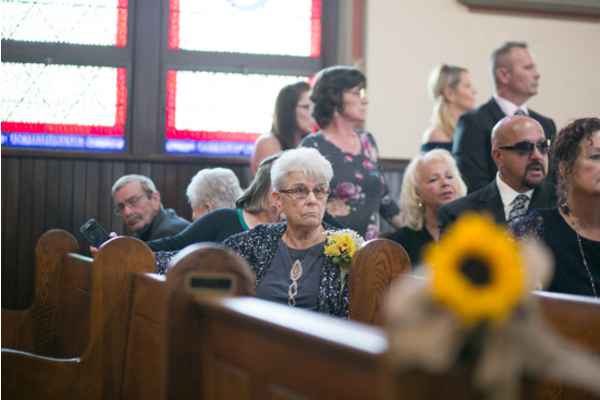 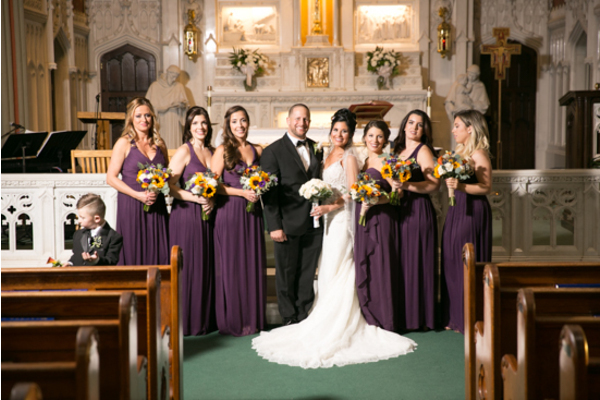 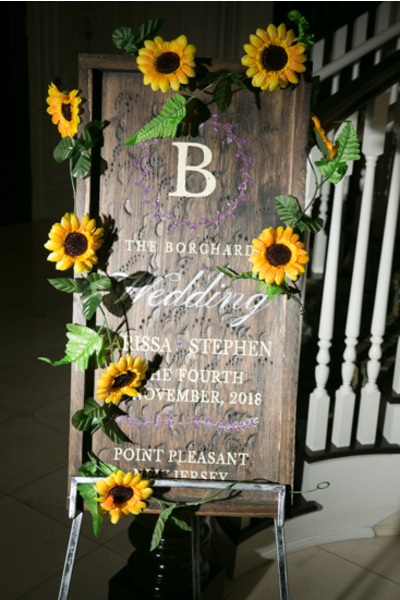 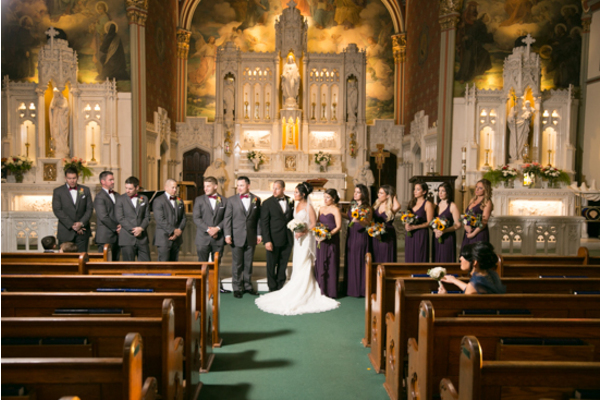 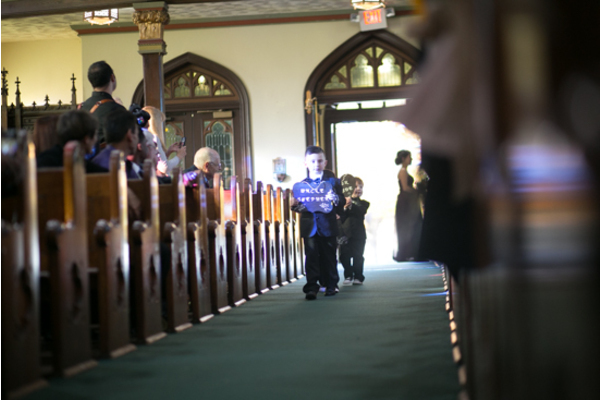 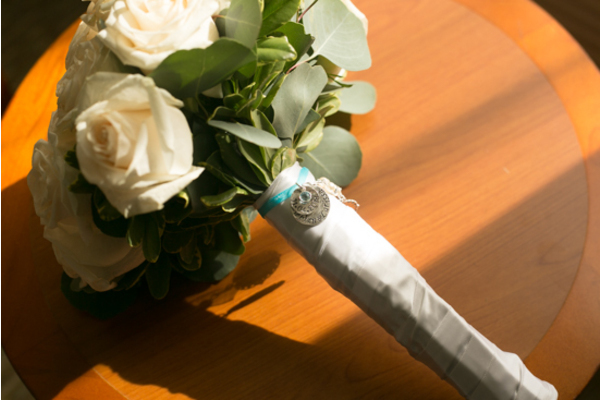 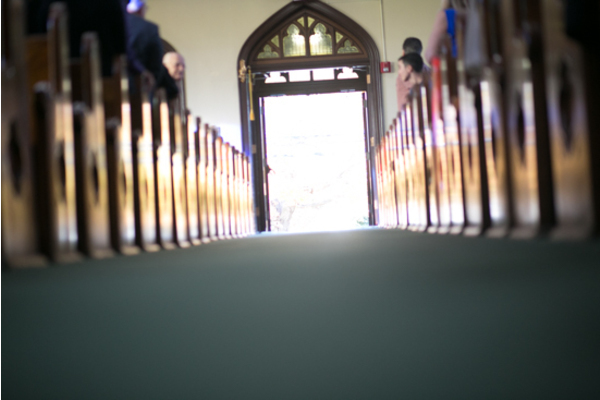 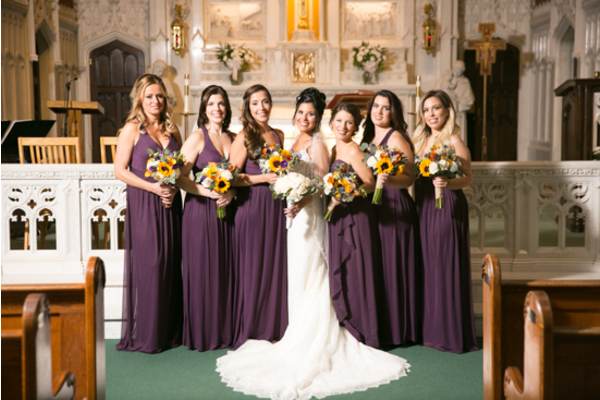 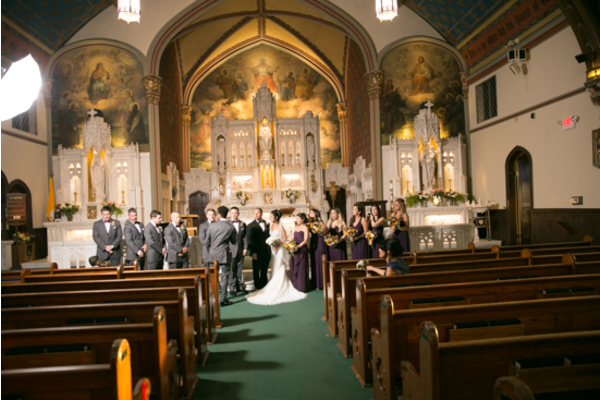 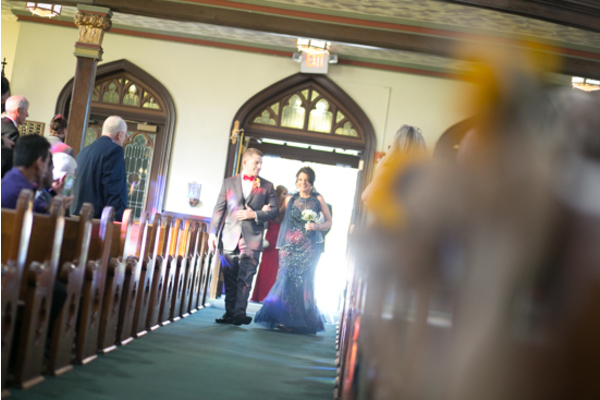 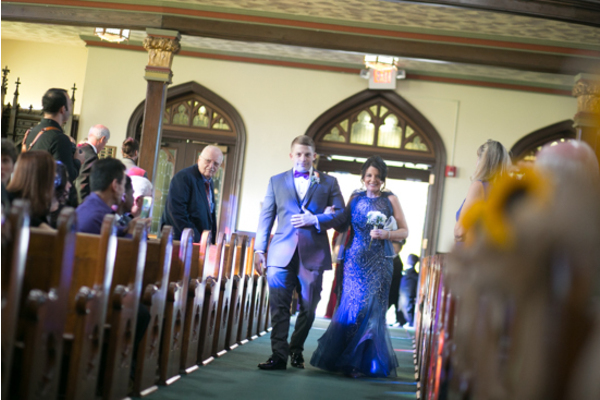 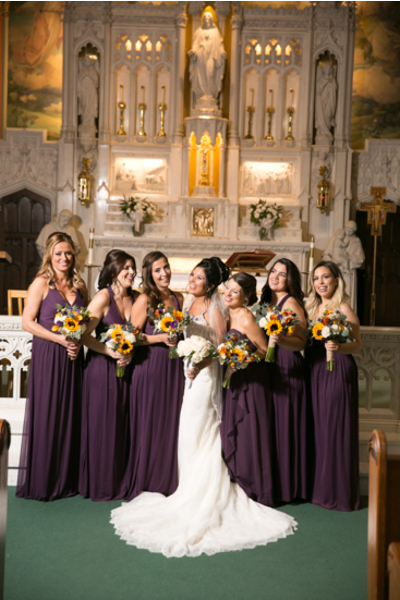 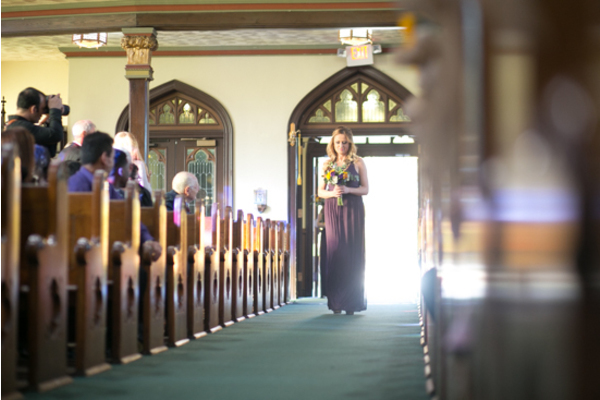 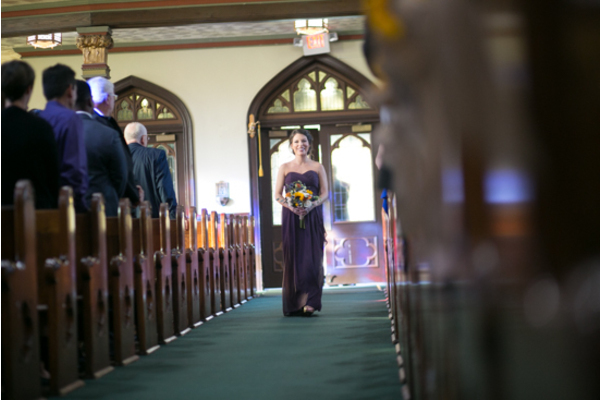 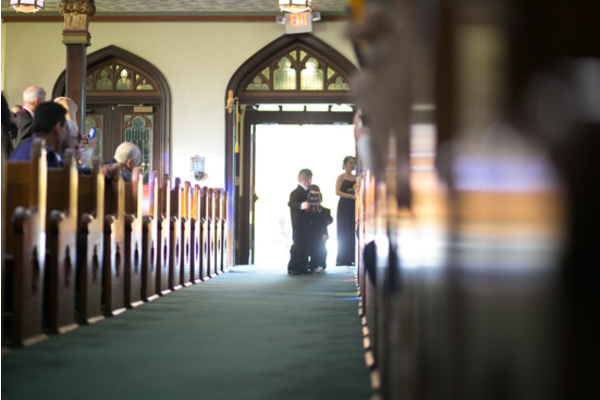 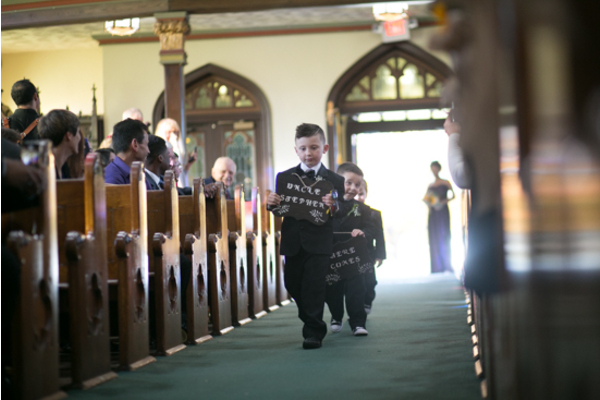 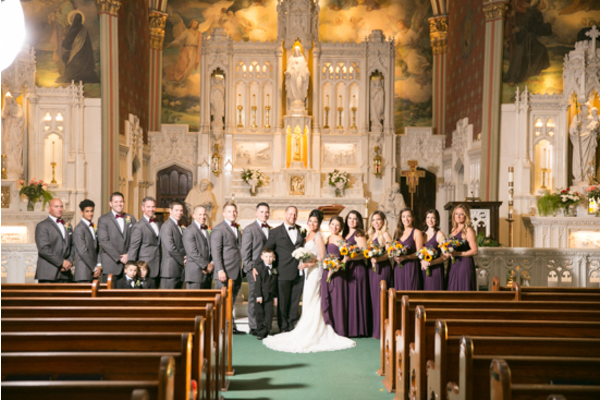 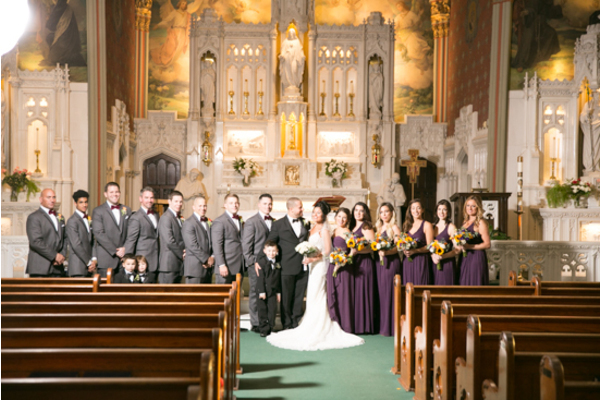 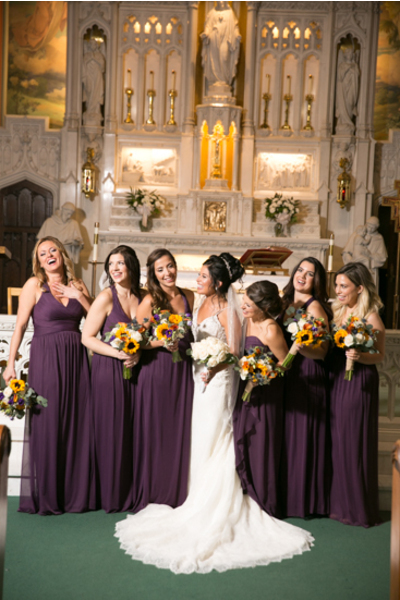 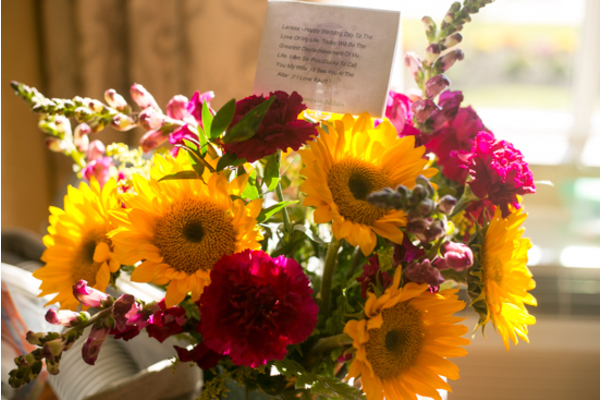 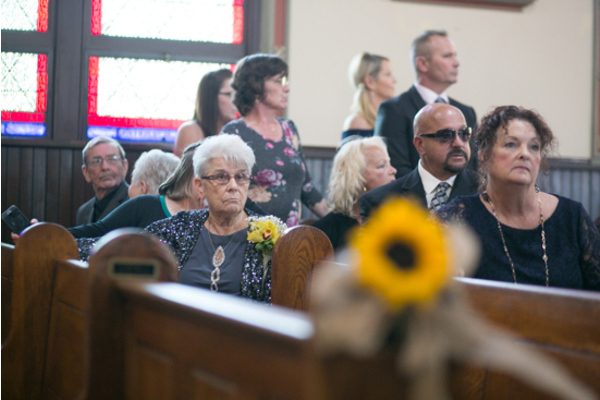 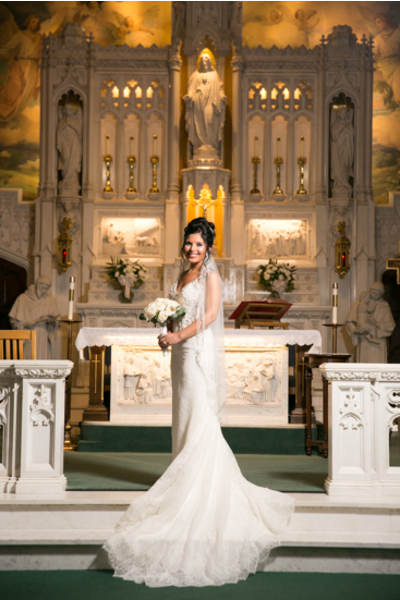 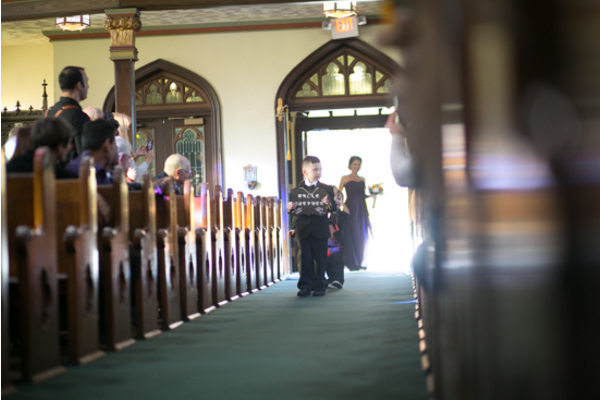 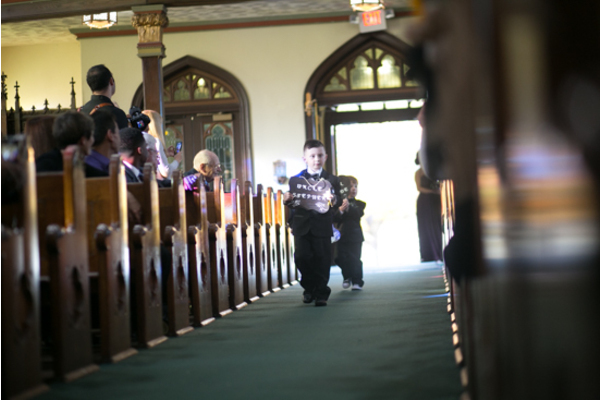 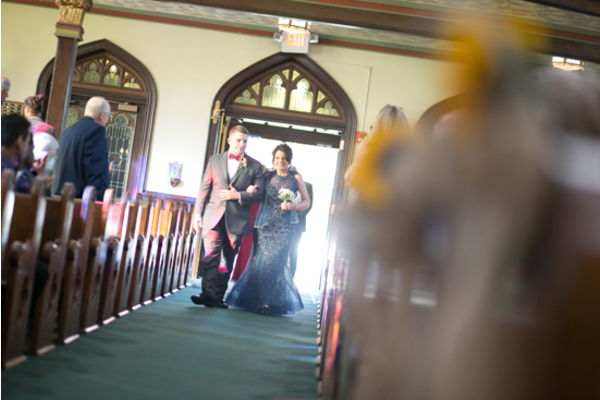 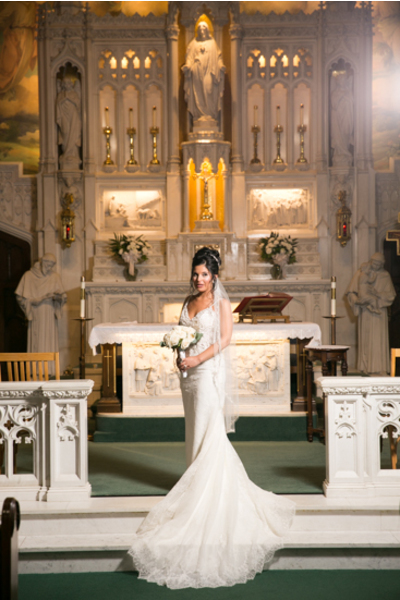 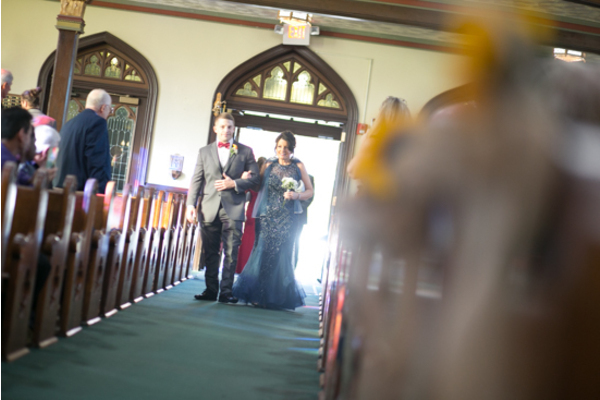 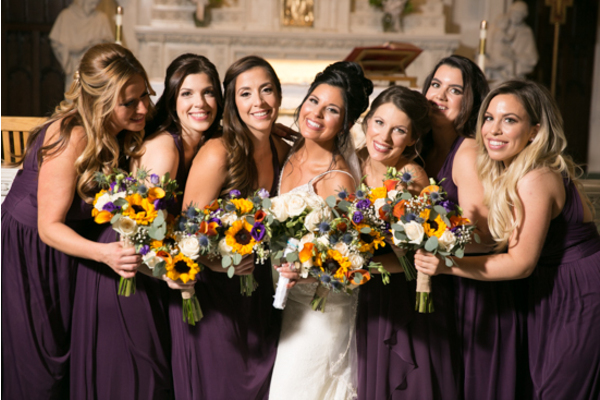 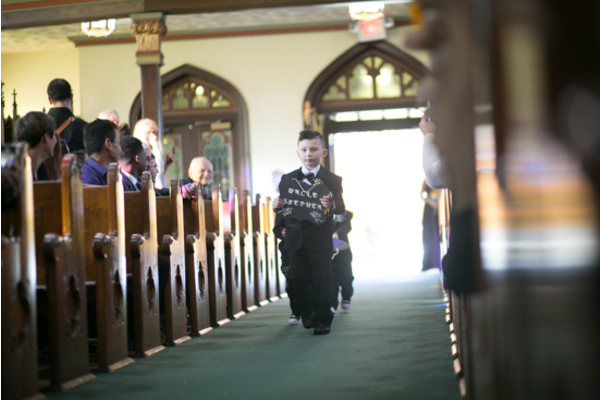 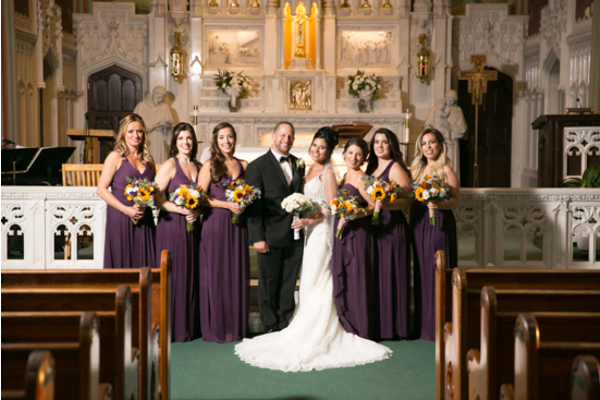 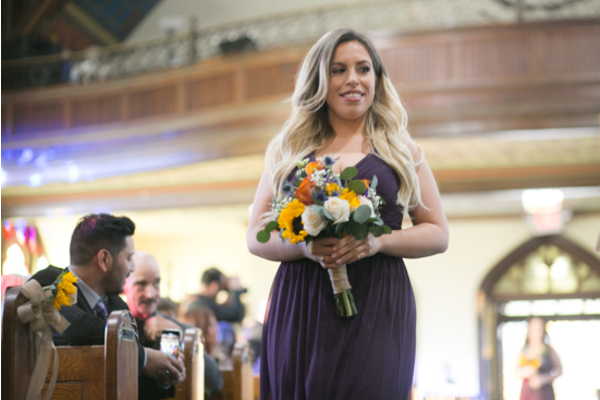 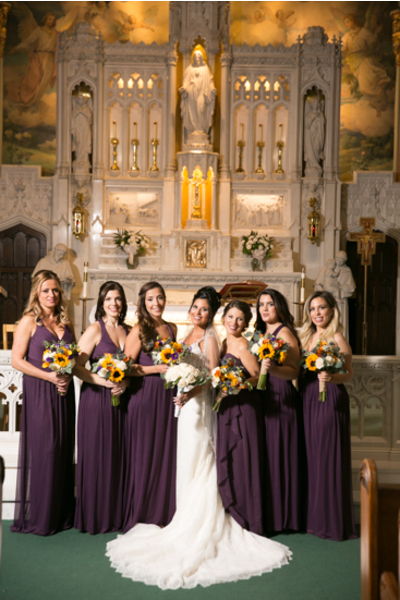 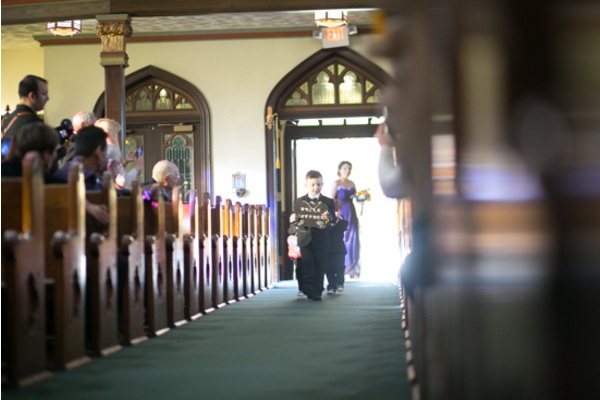 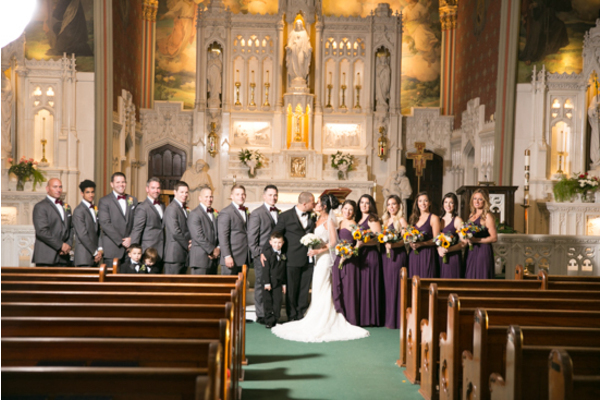 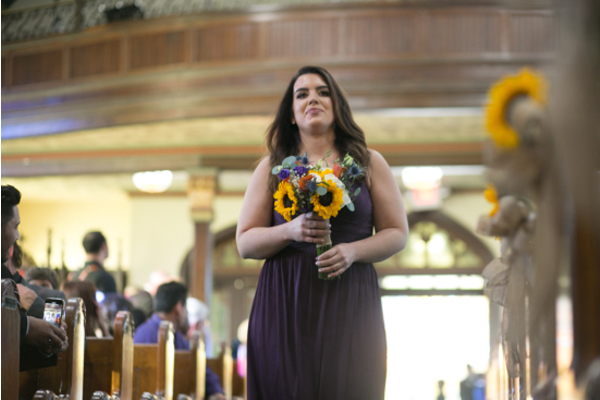 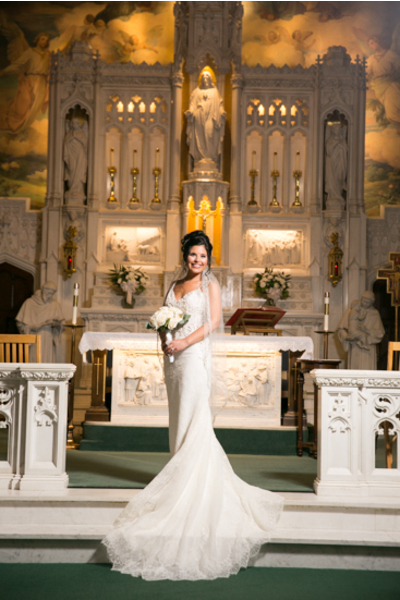 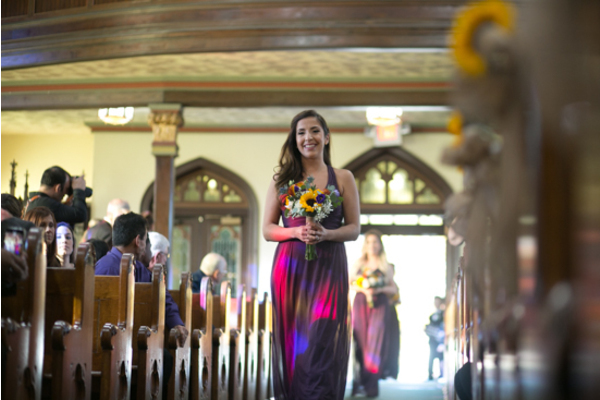 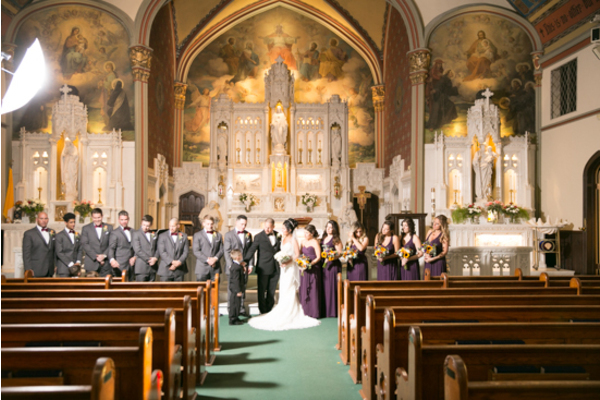 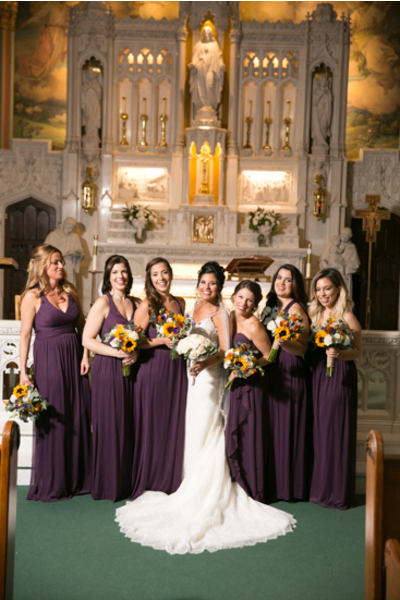 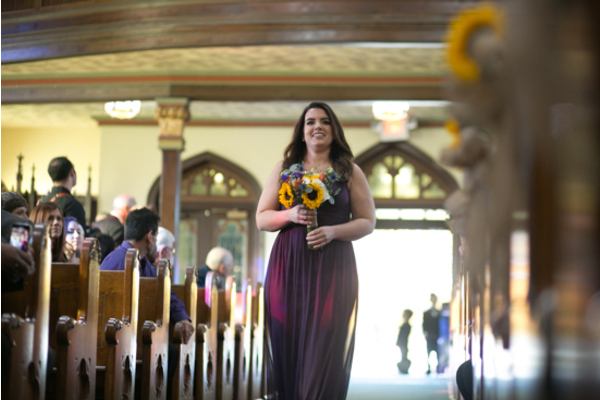 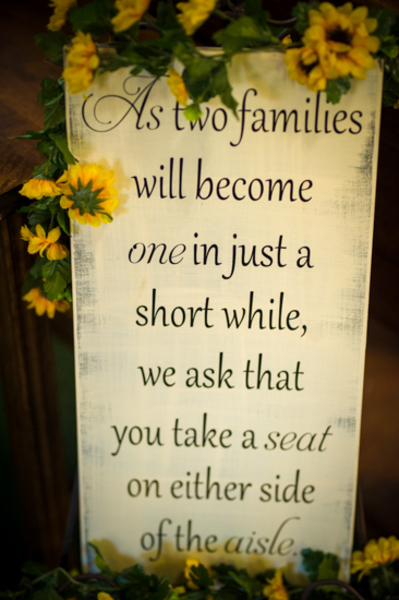 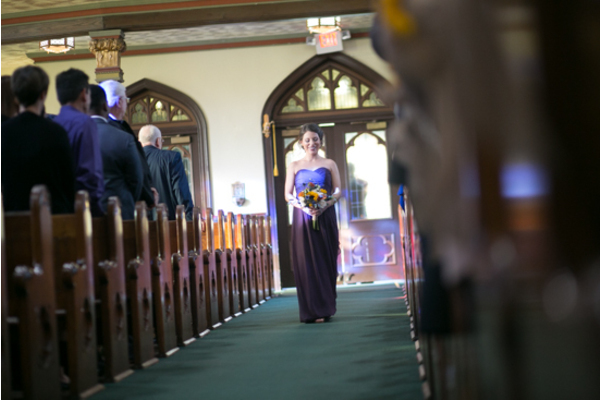 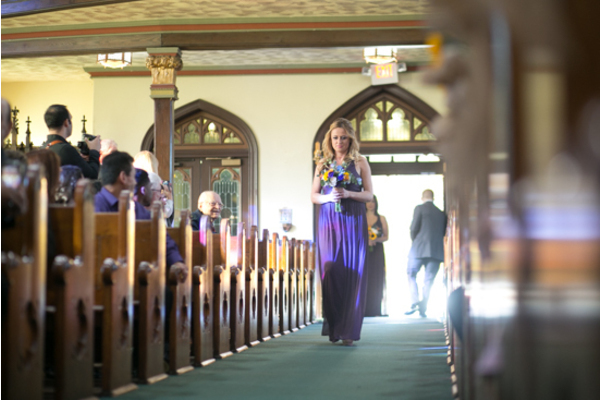 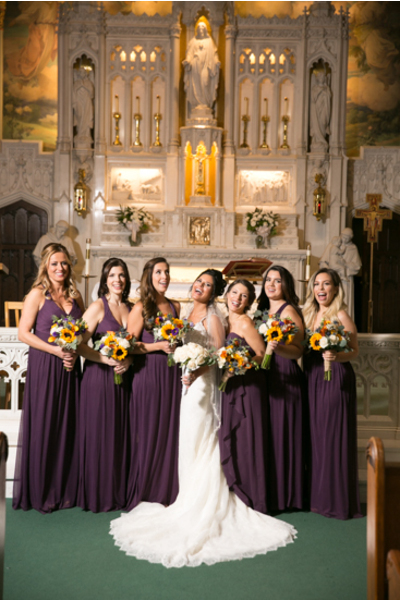 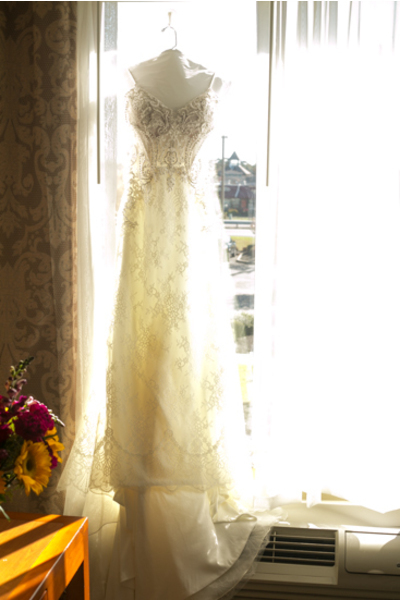 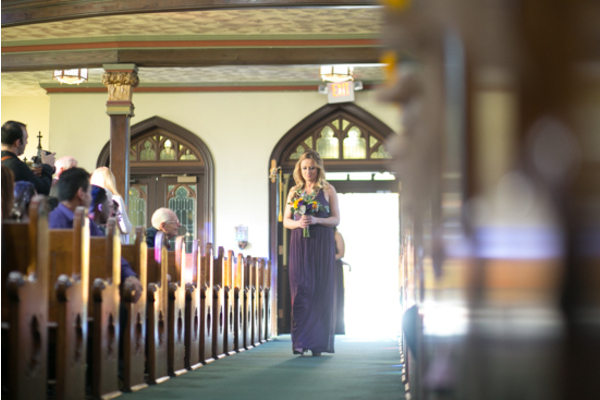 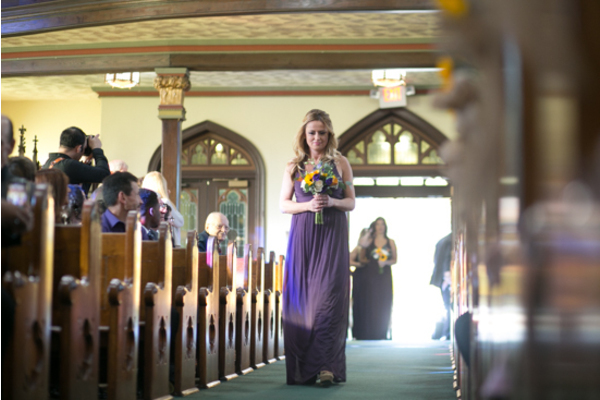 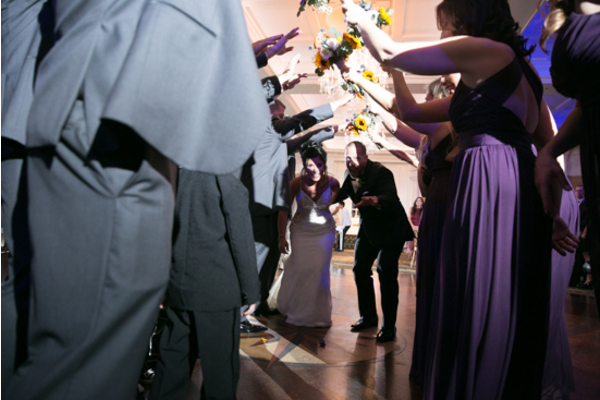 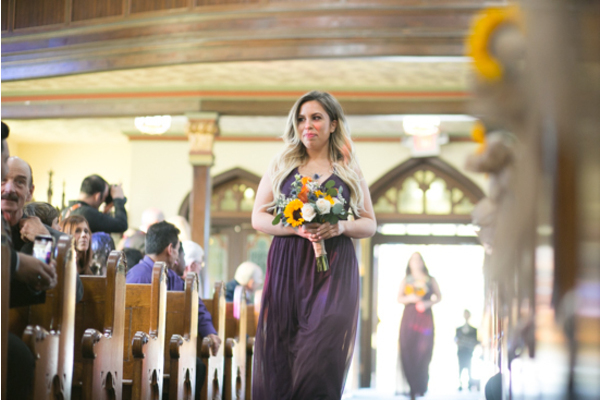 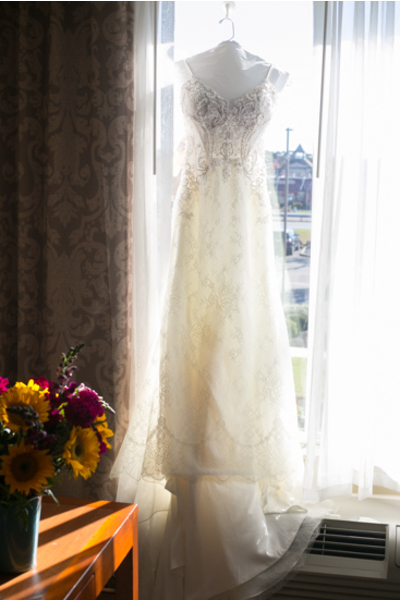 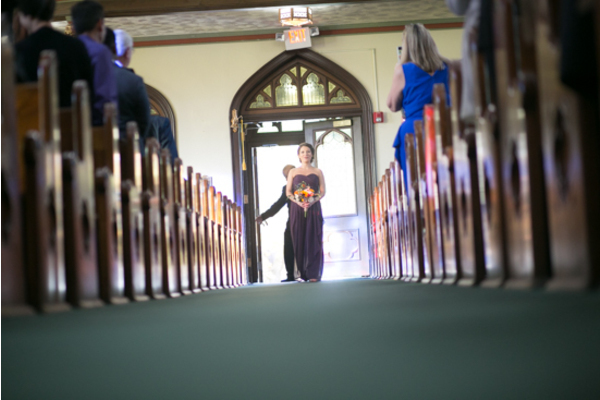 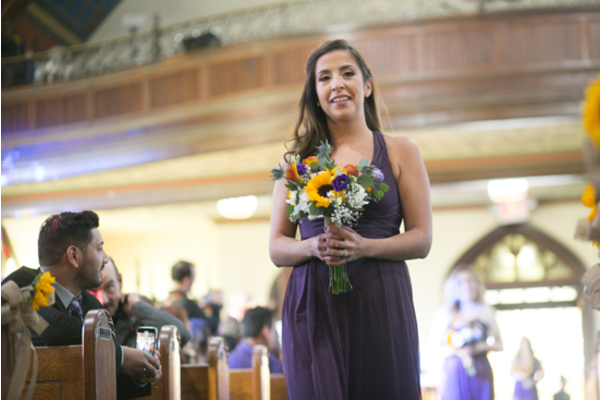 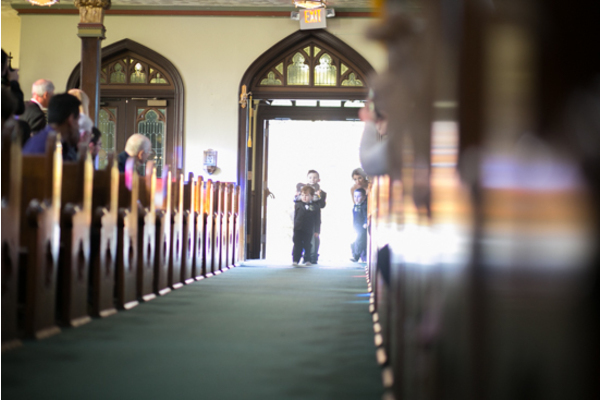 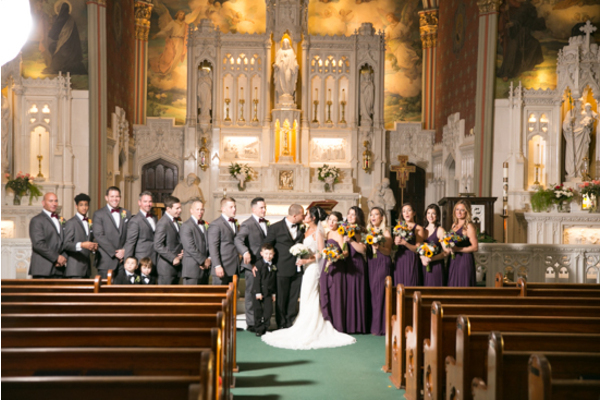 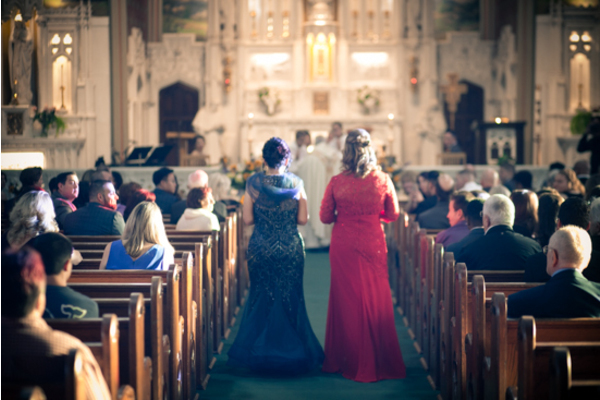 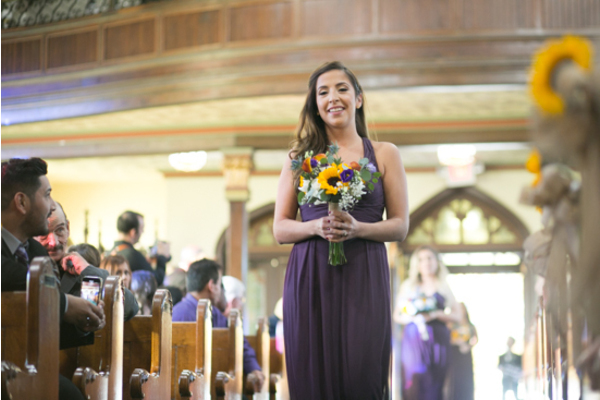 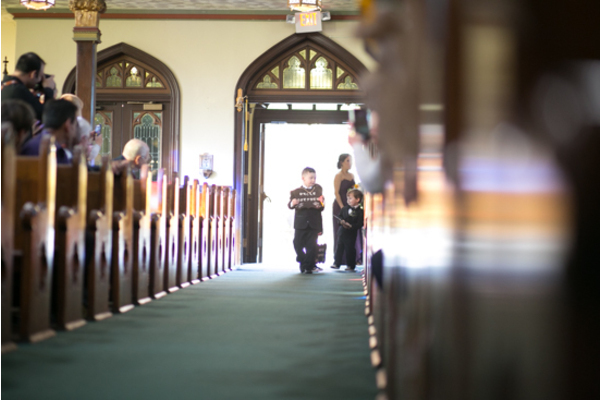 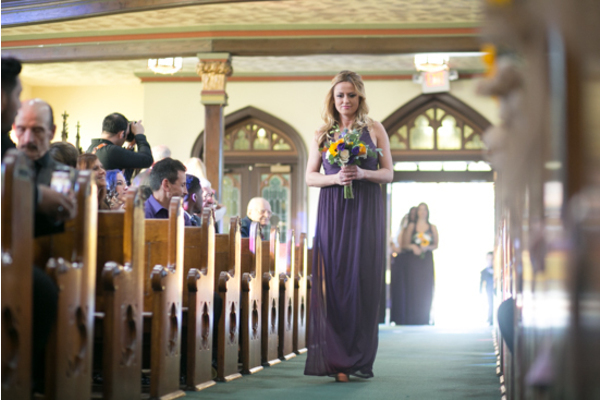 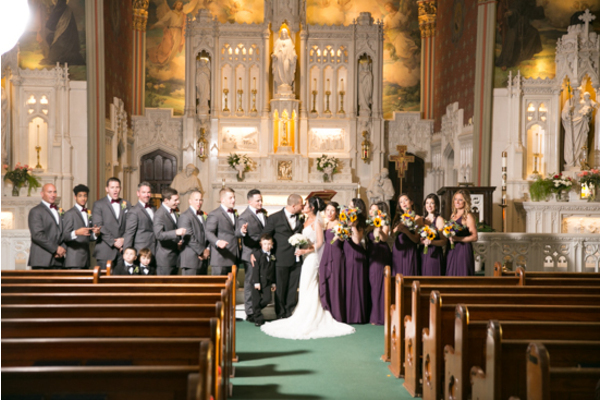 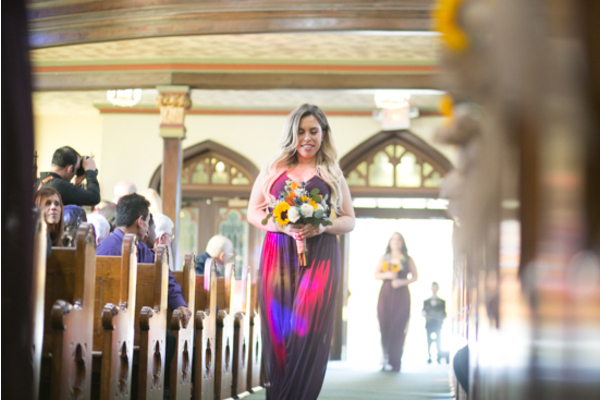 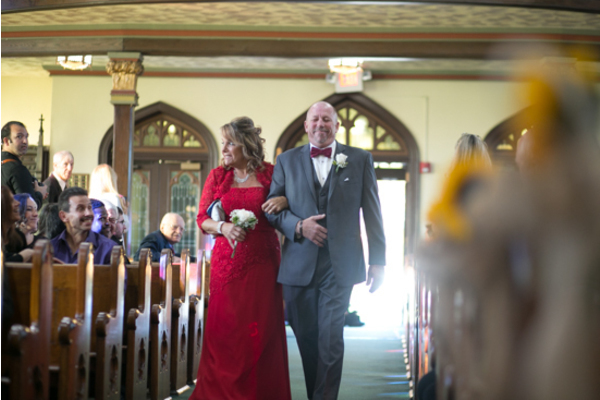 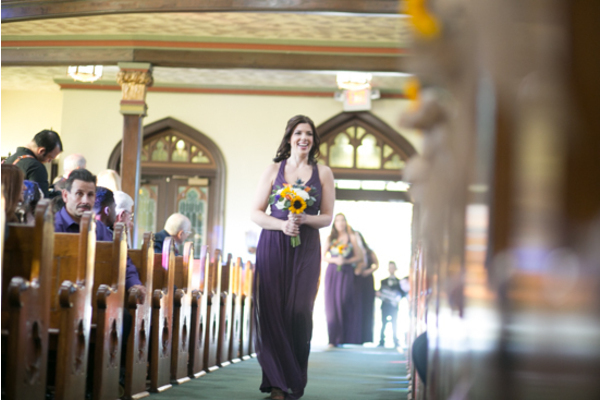 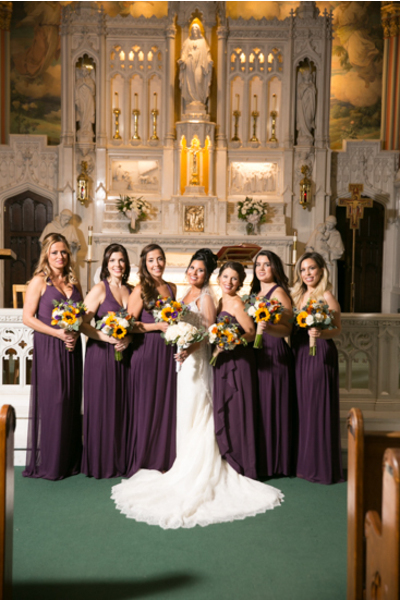 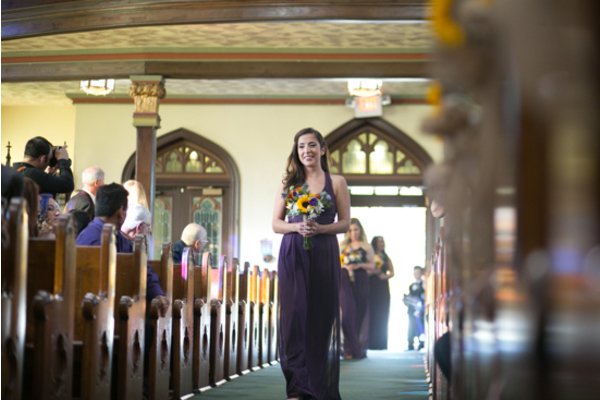 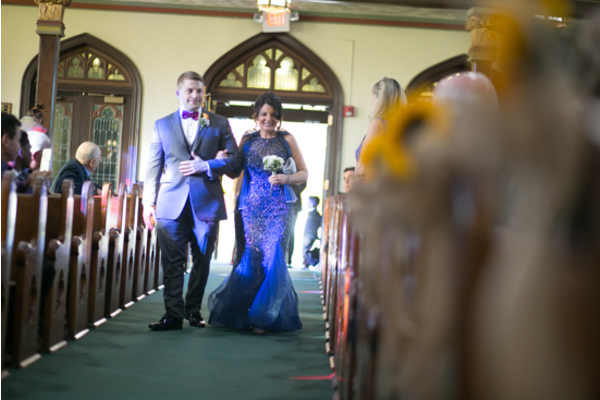 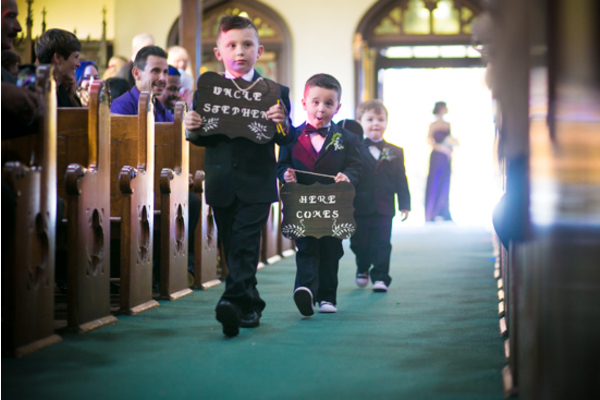 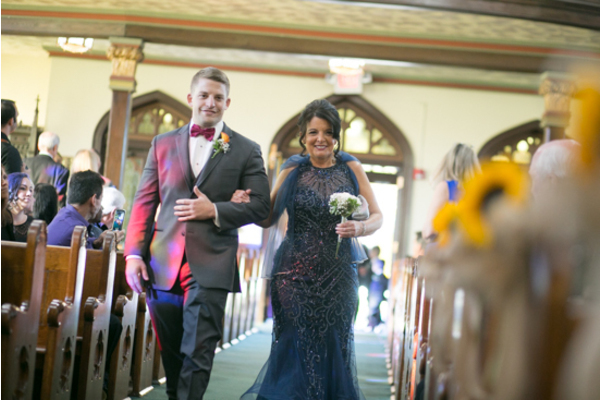 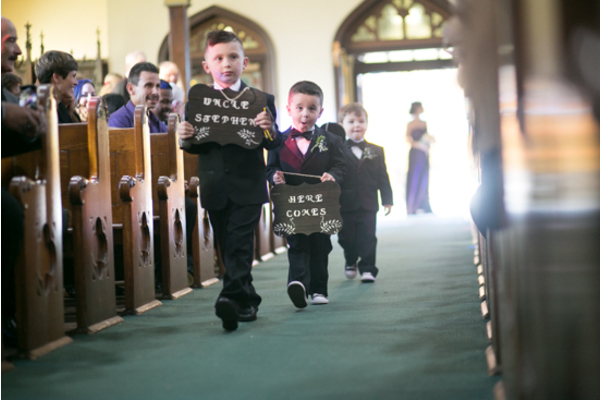 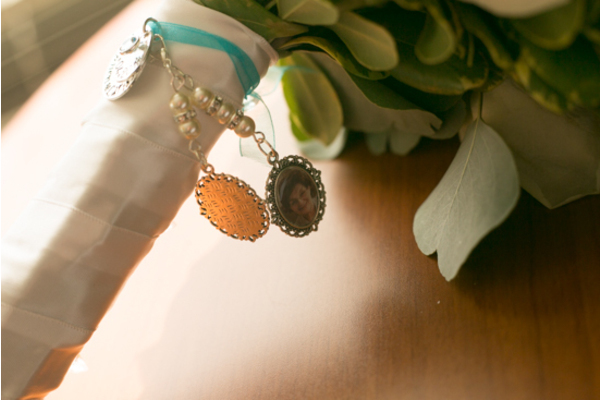 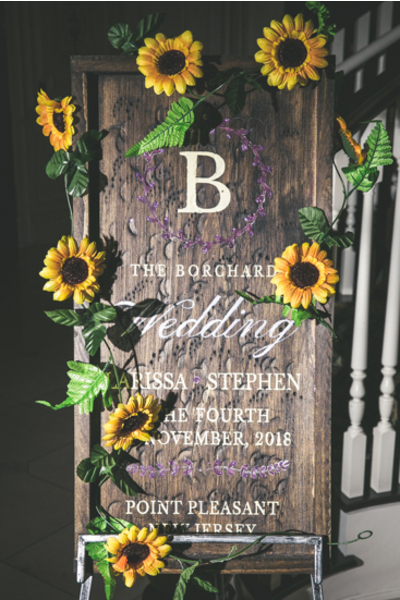 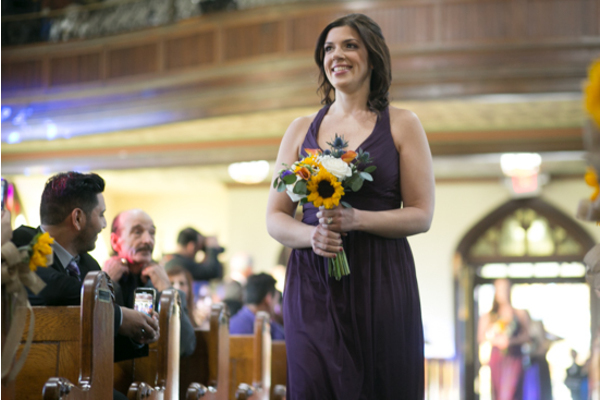 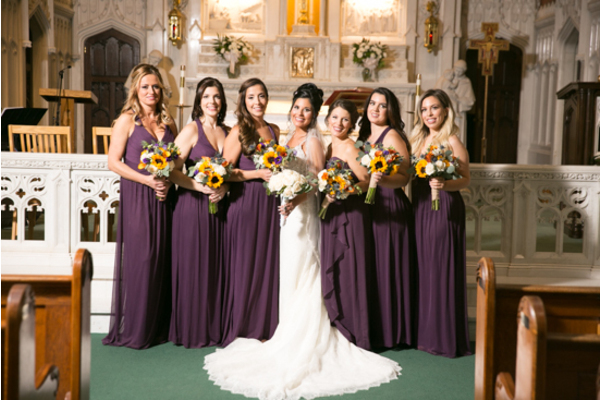 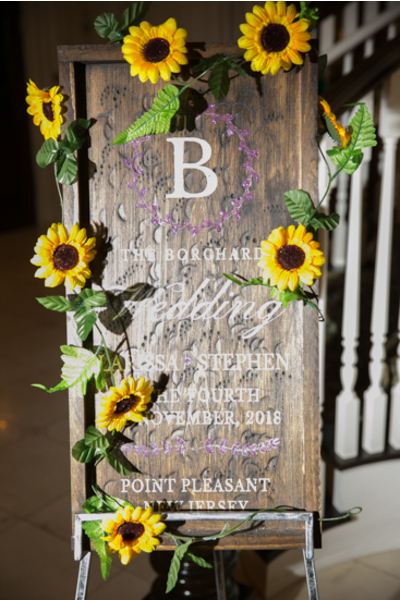 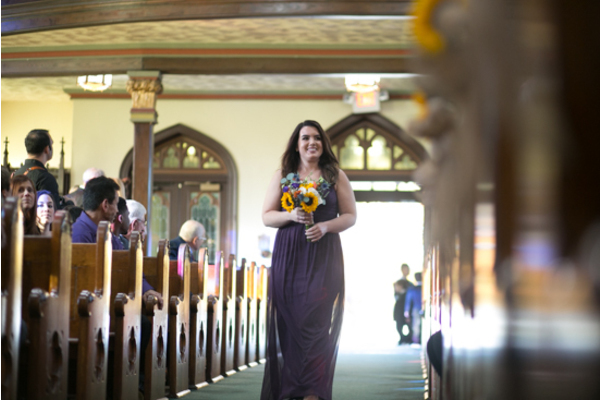 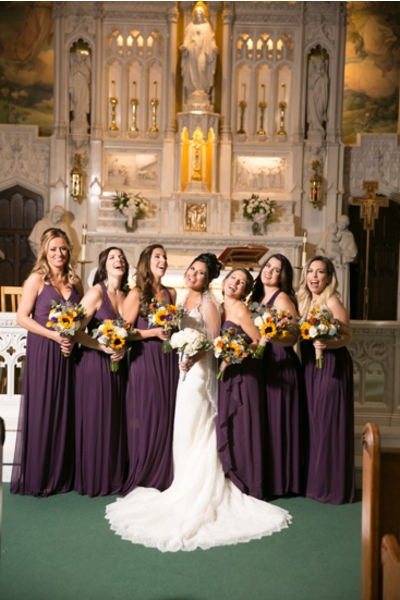 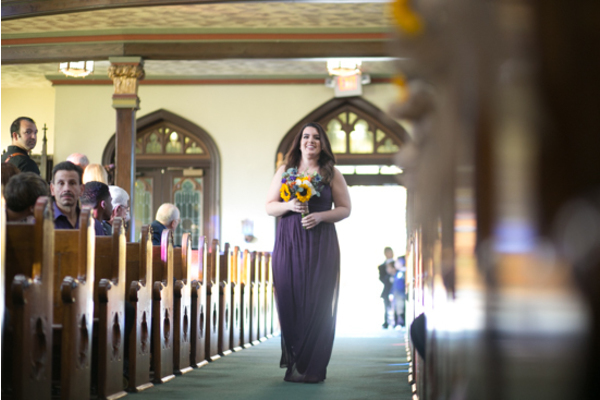 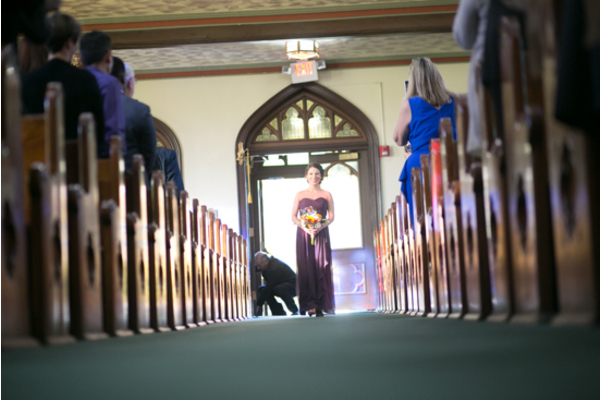 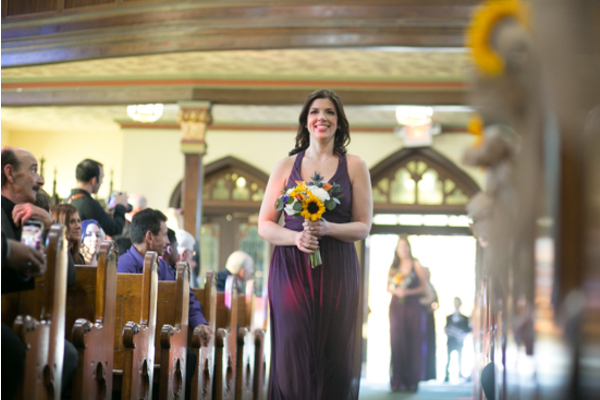 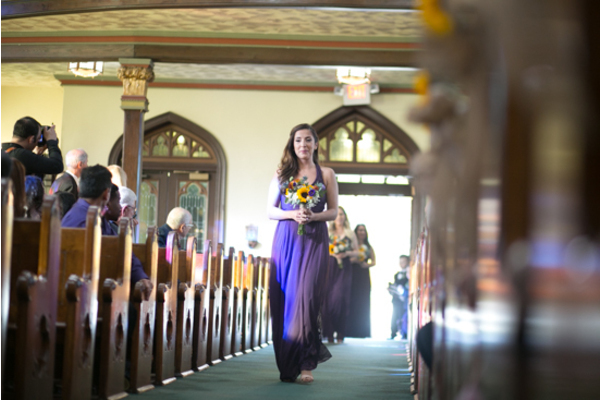 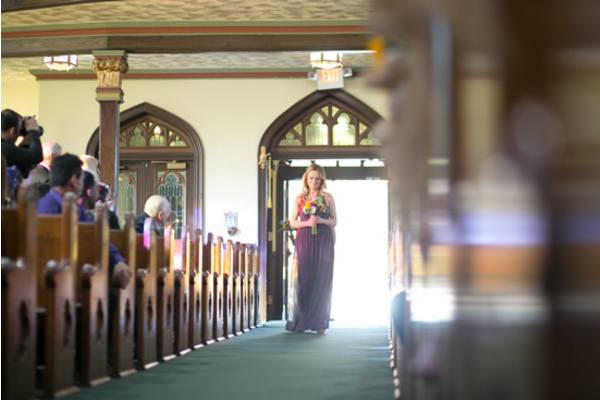 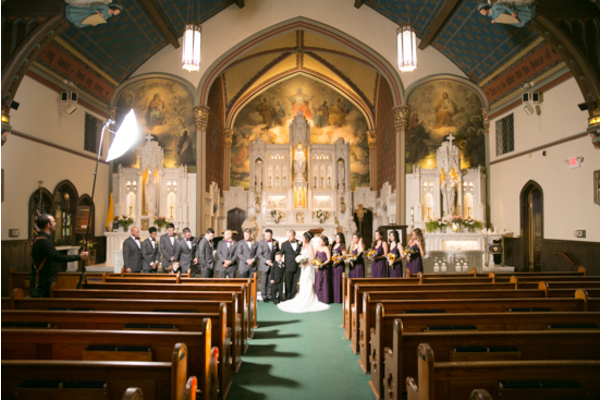 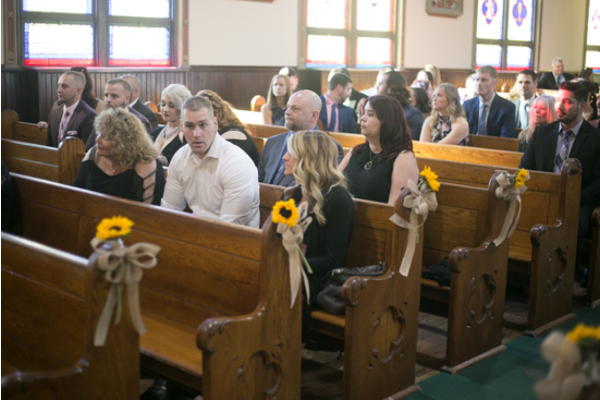 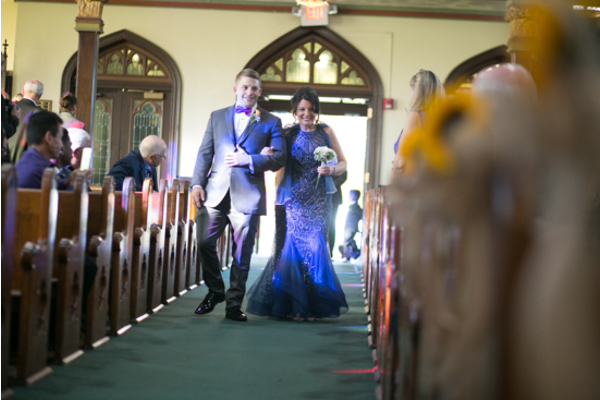 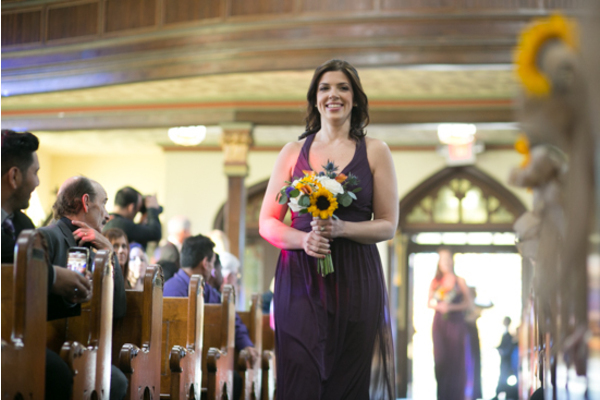 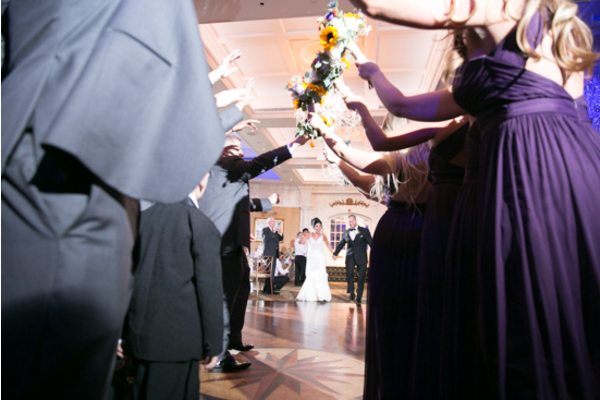 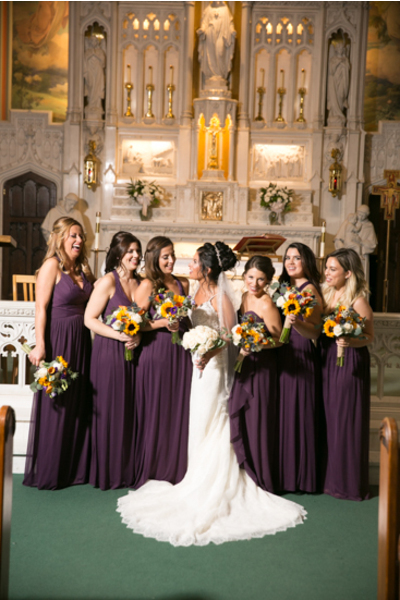 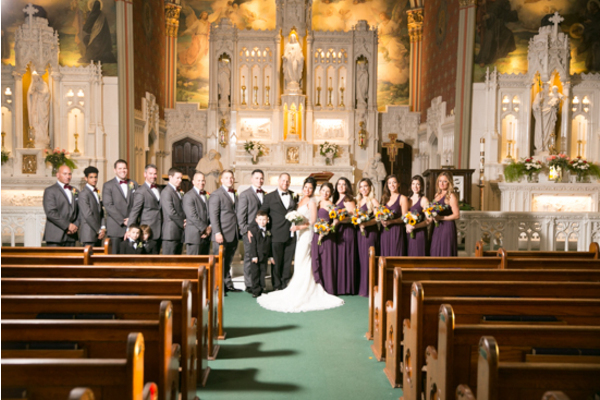 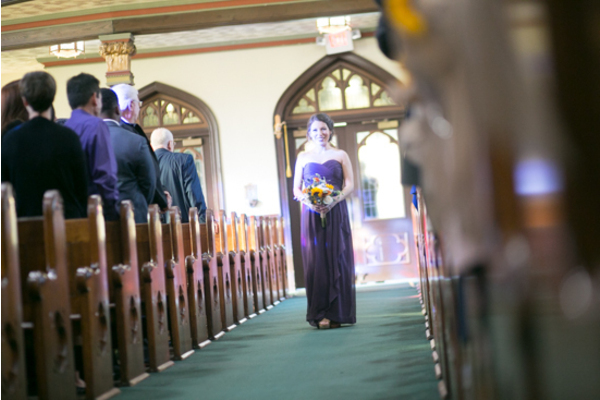 The ceremony was held indoors at a gorgeous church venue where the pews were lined with sunflowers. 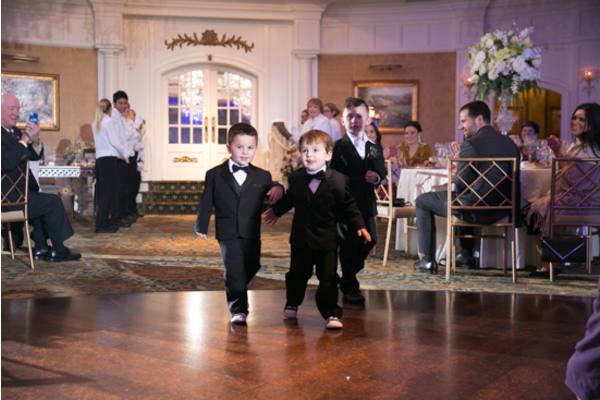 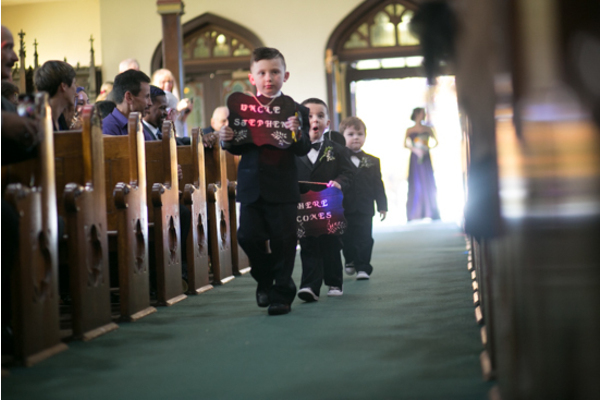 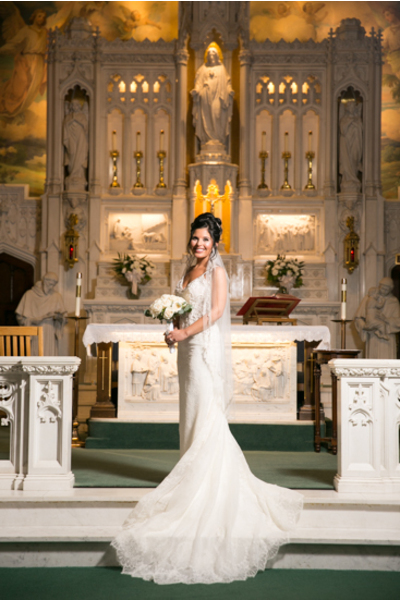 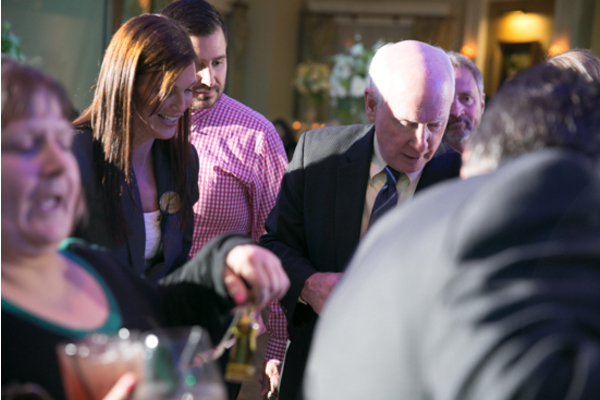 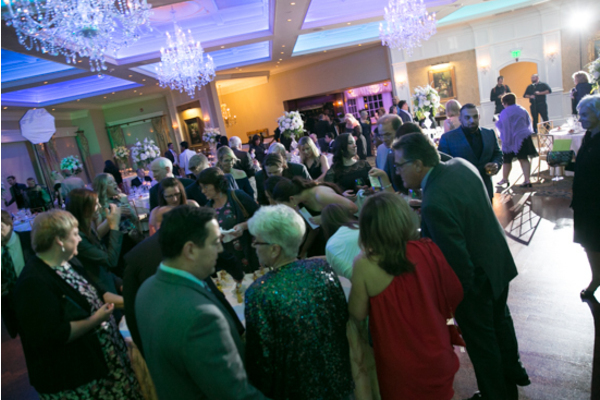 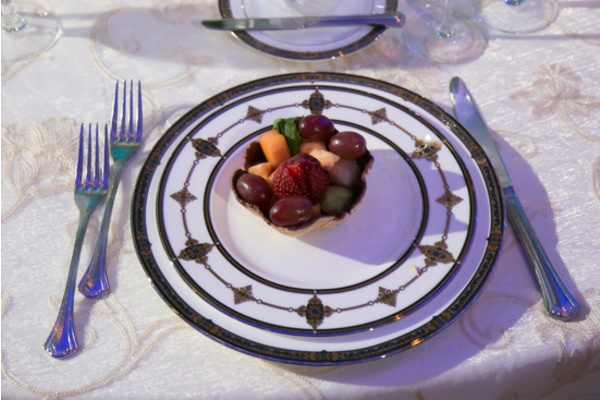 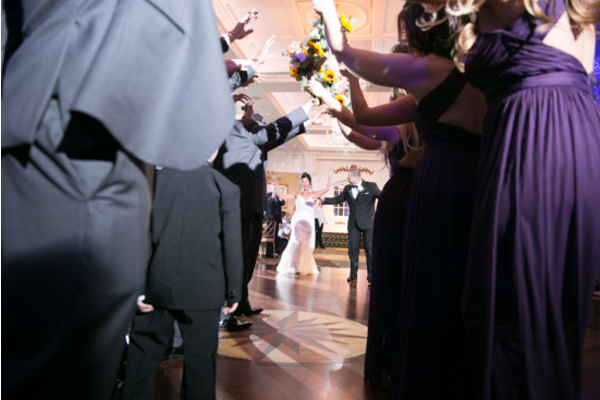 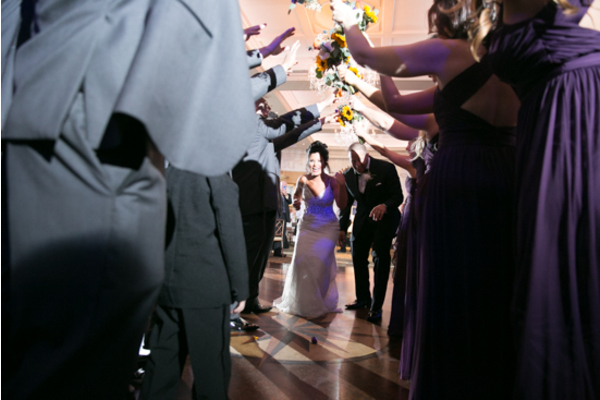 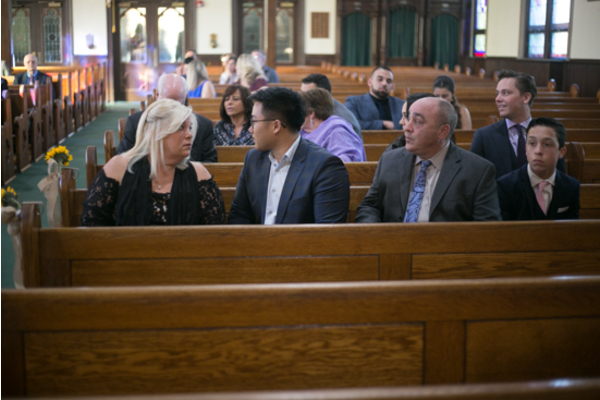 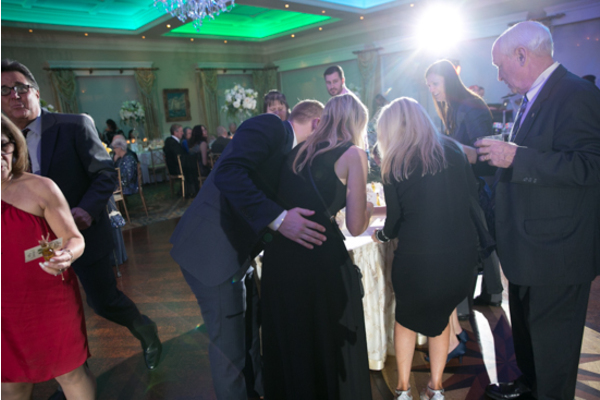 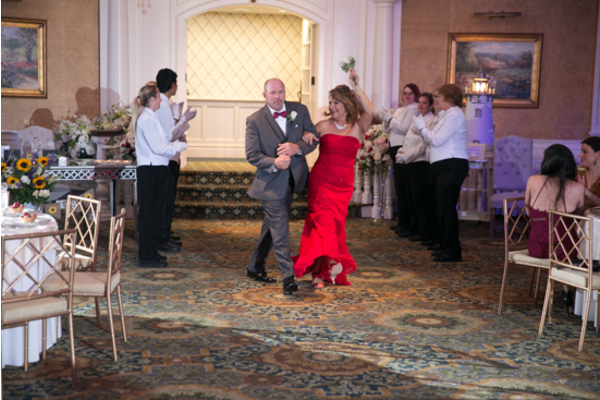 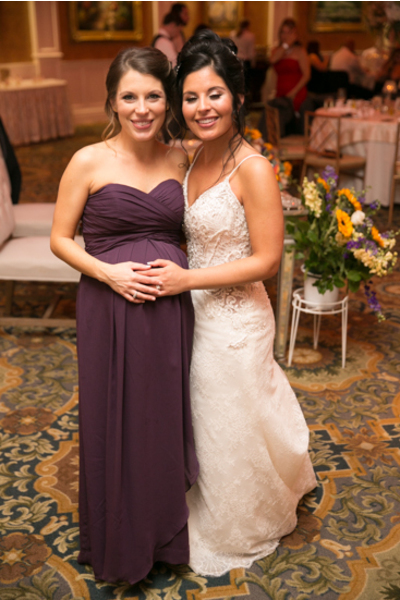 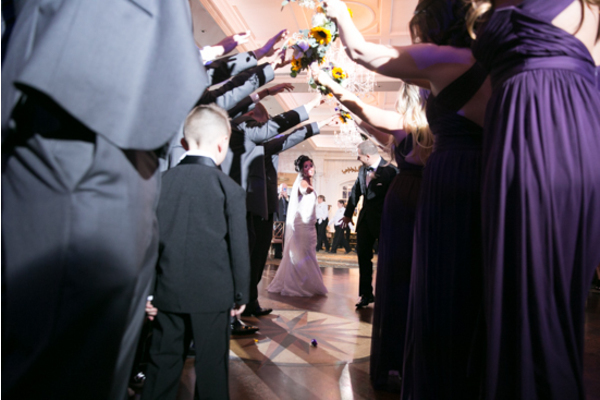 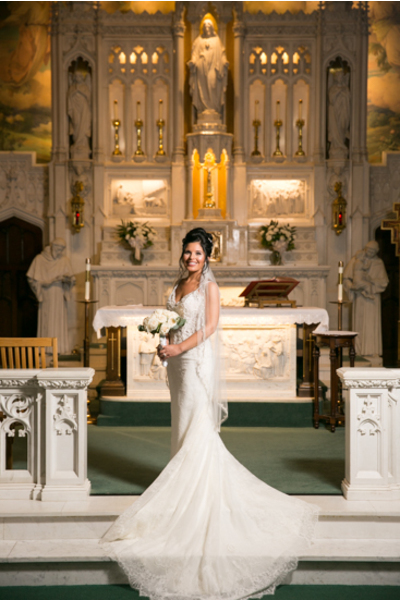 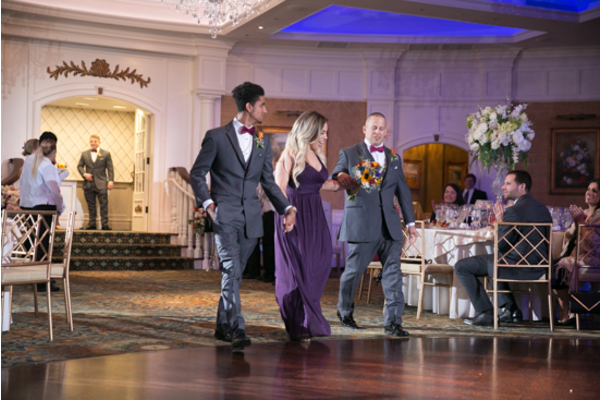 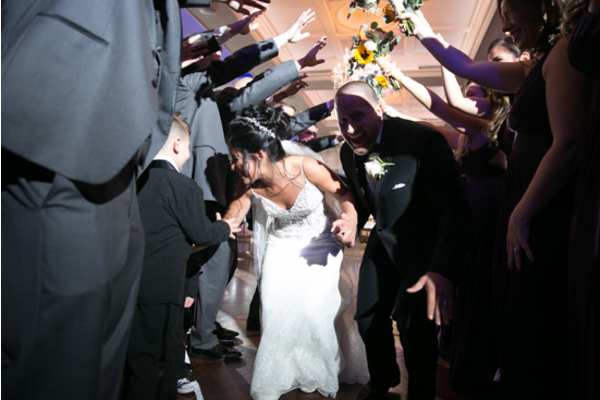 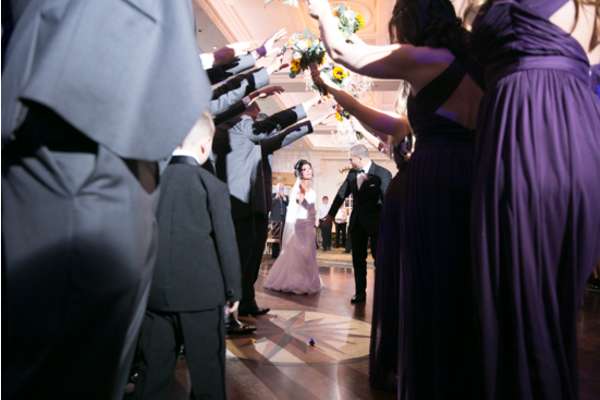 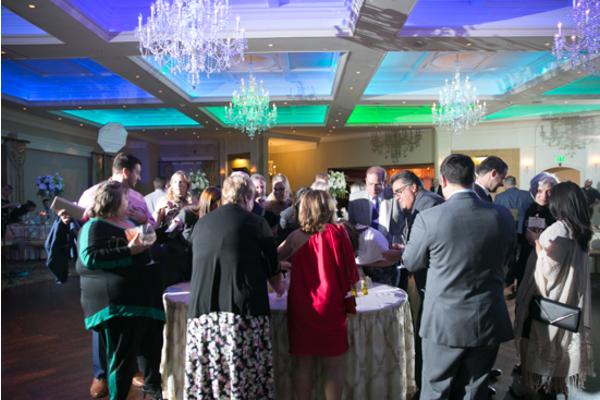 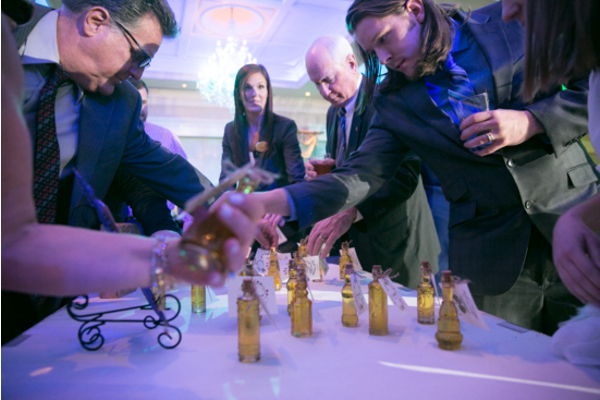 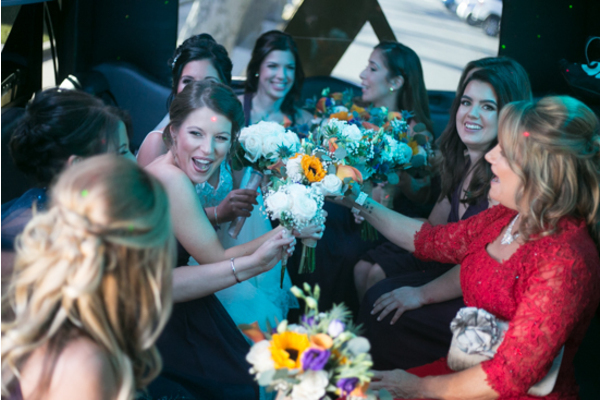 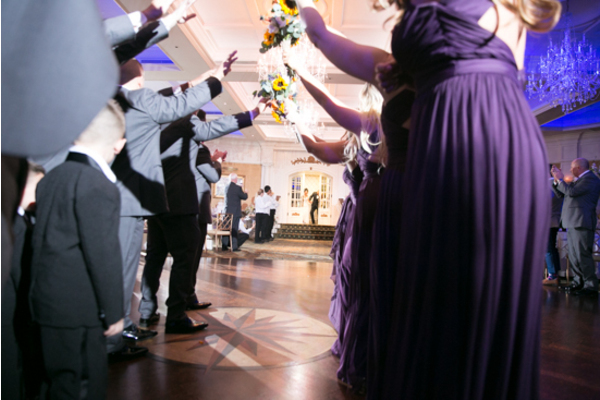 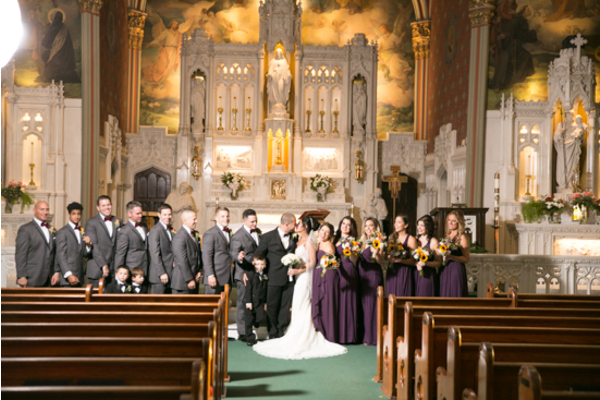 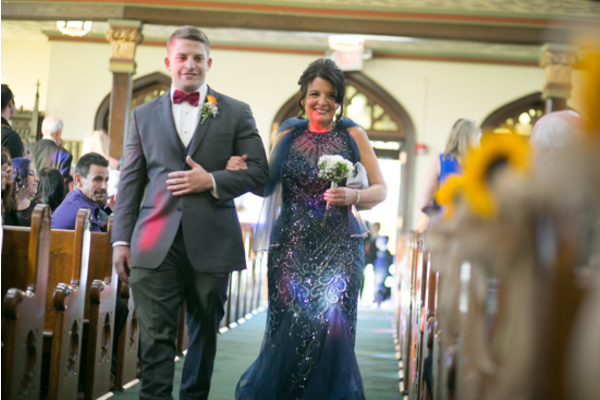 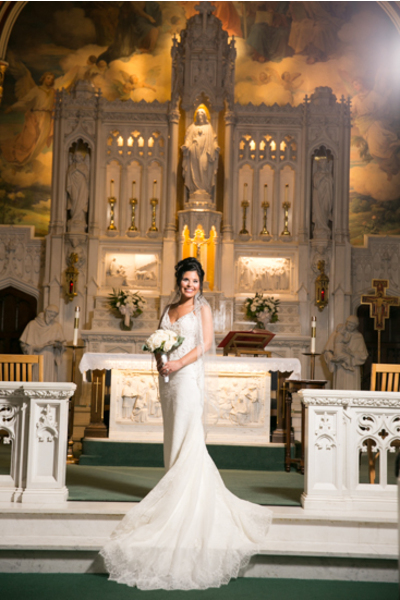 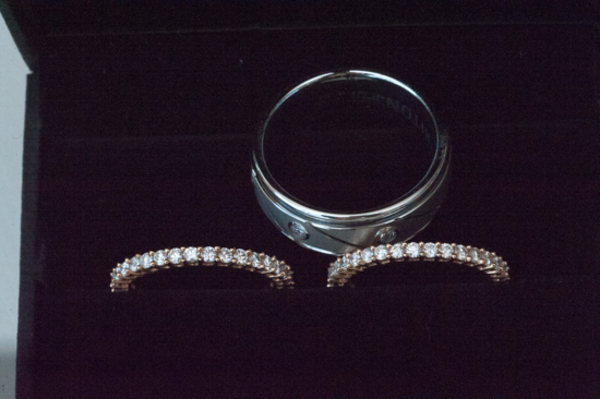 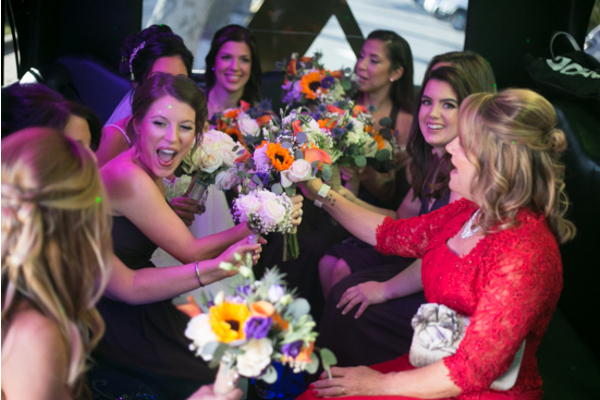 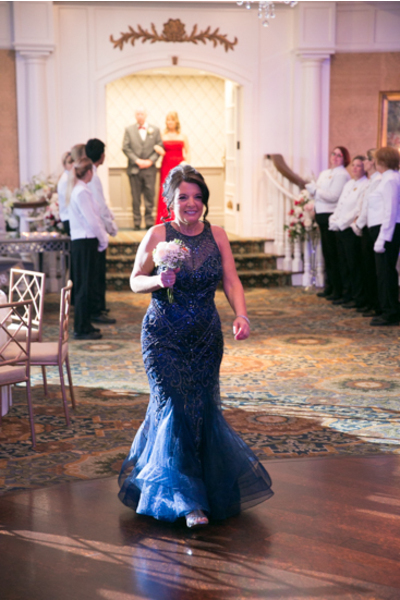 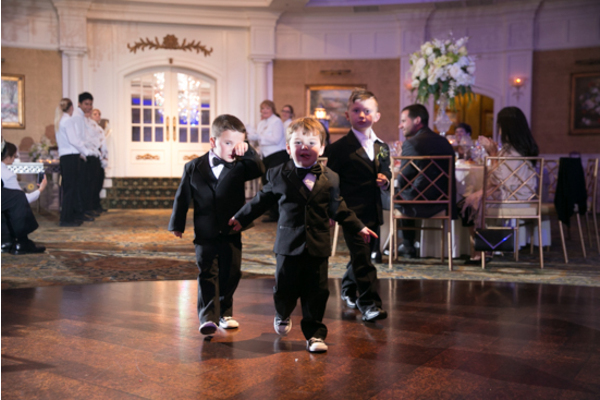 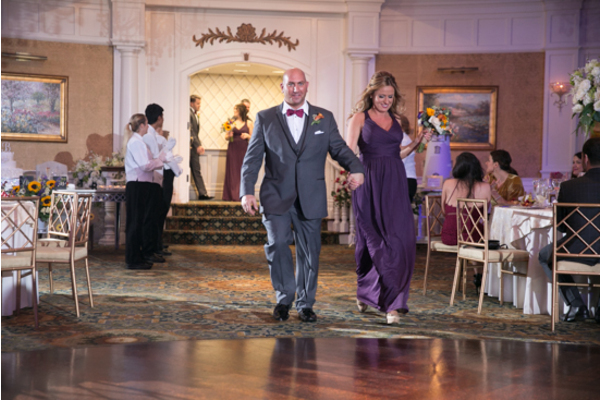 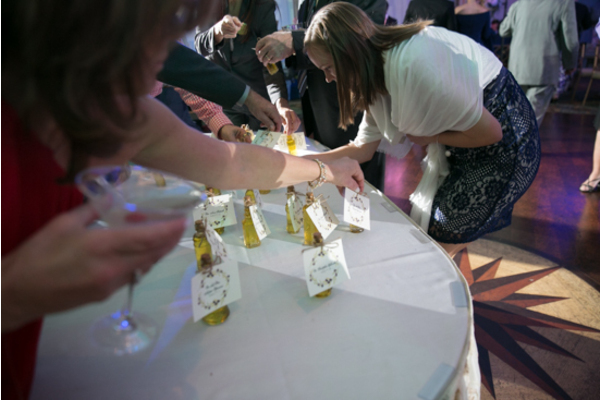 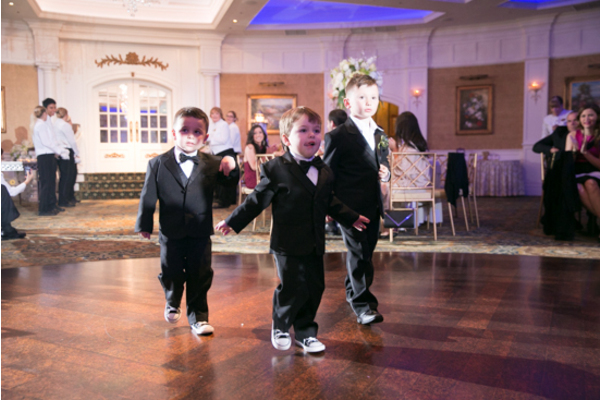 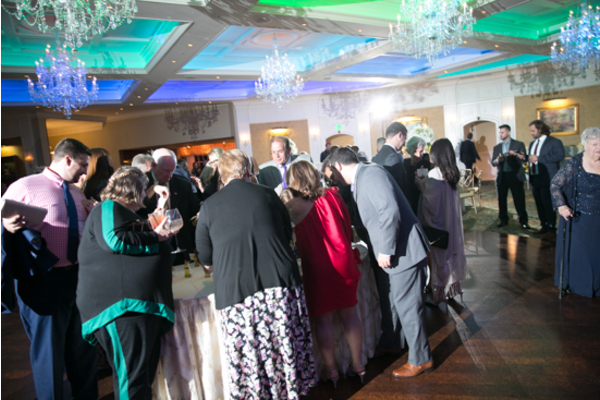 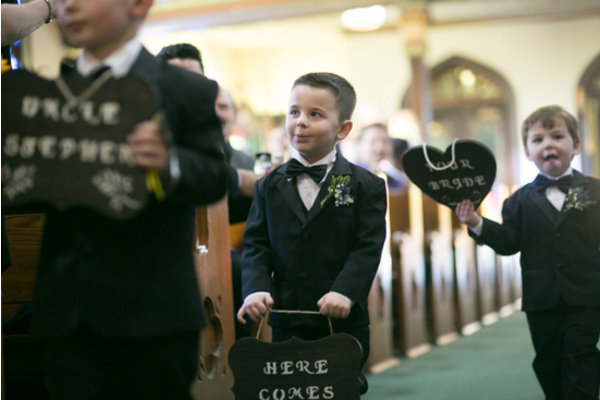 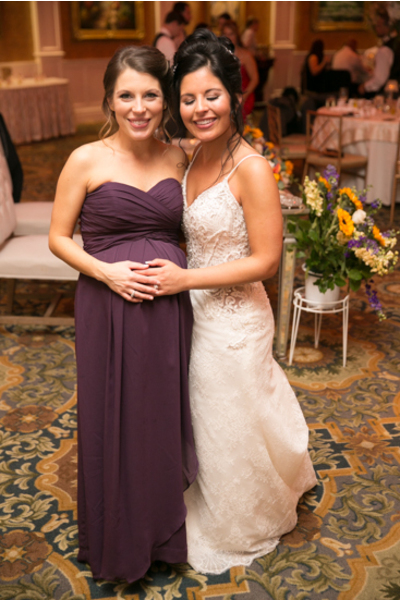 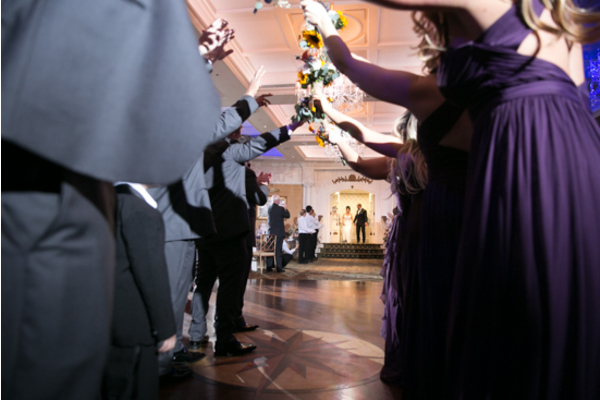 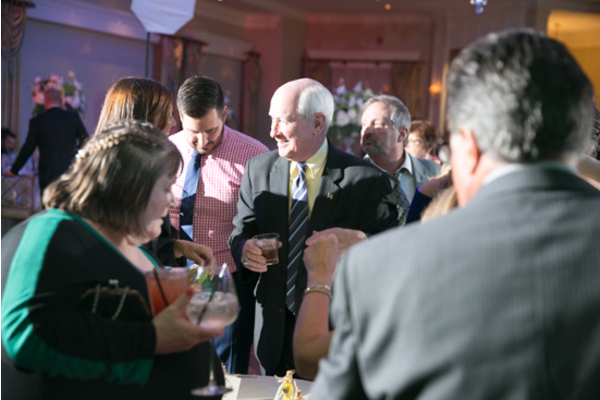 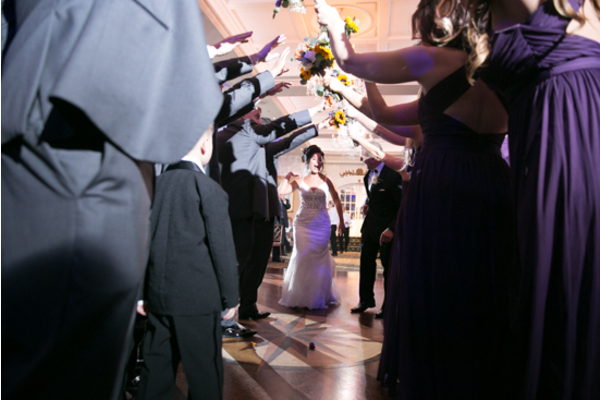 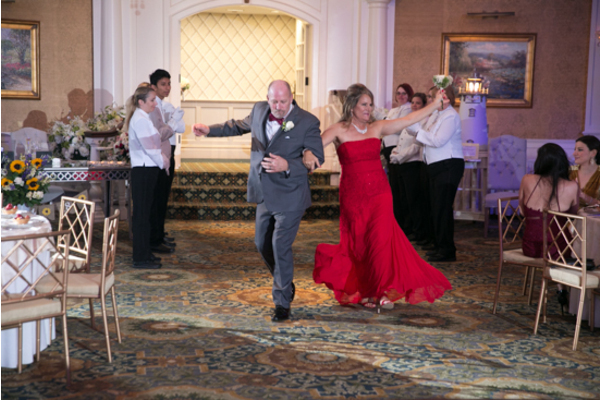 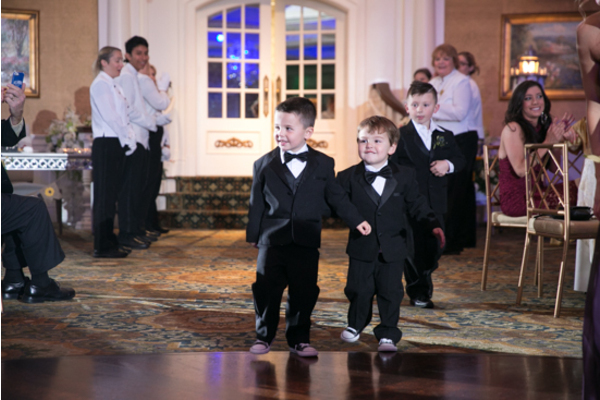 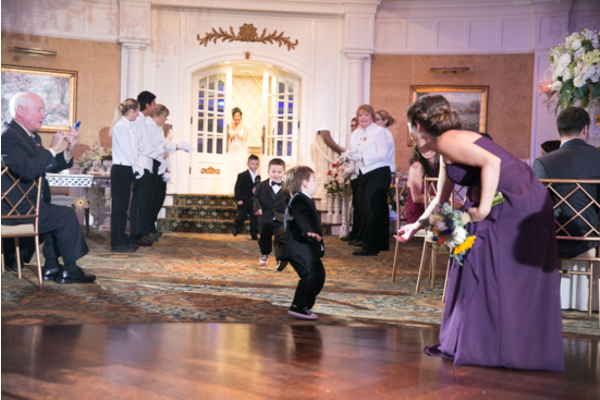 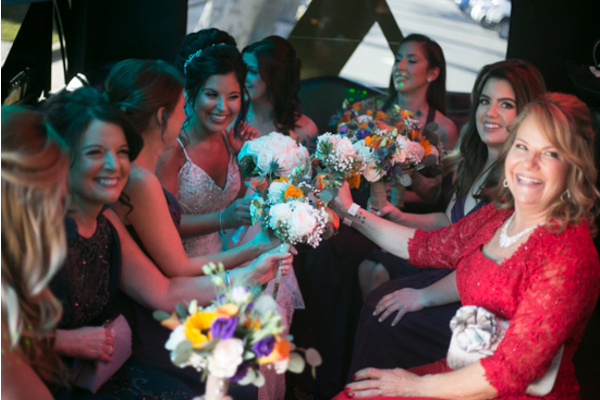 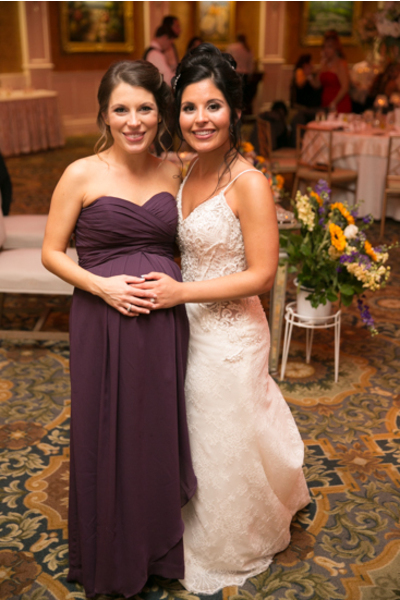 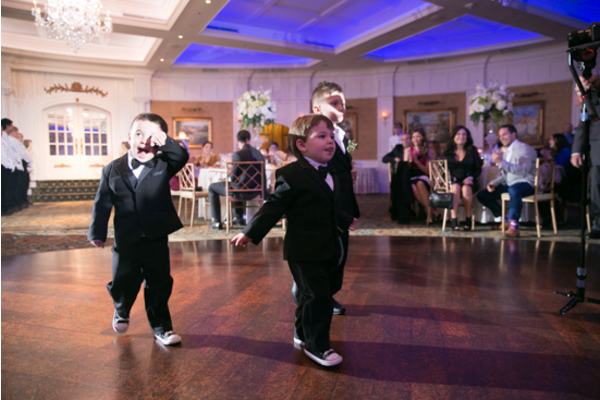 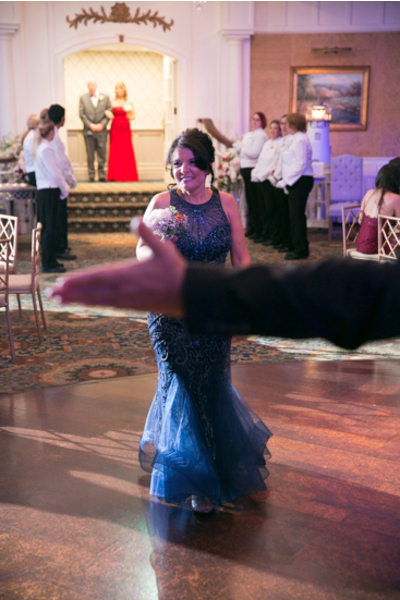 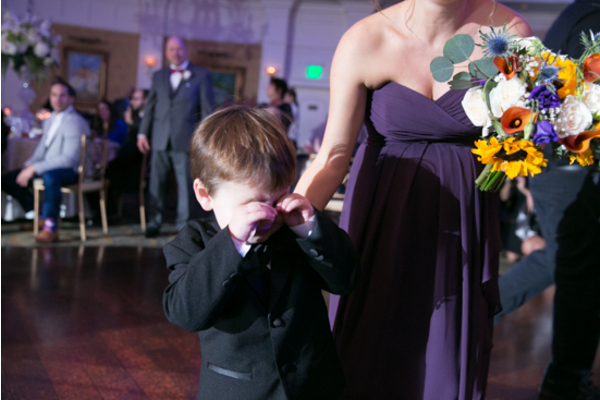 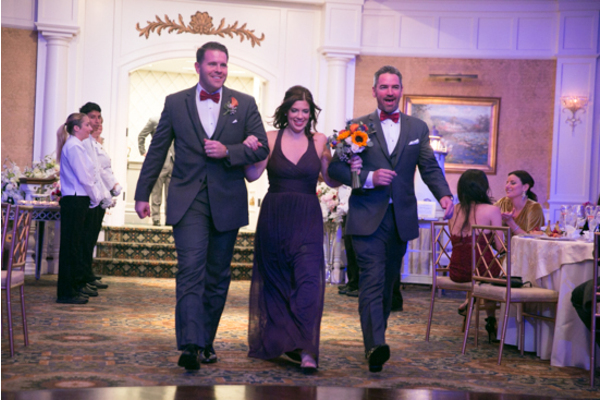 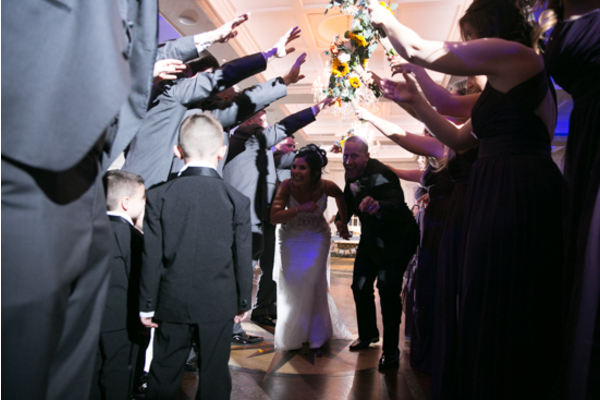 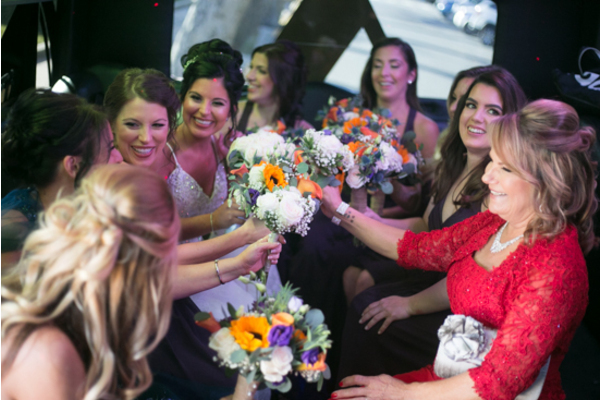 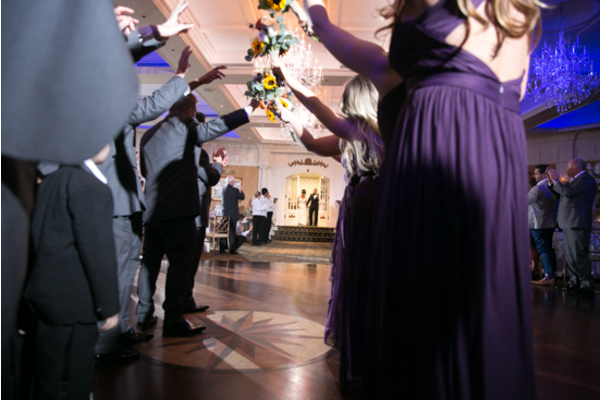 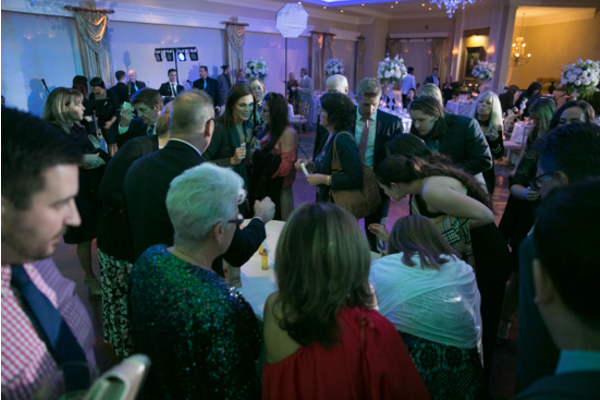 Guests made their way to their seats as they anxiously awaited Larissa’s grand entrance. 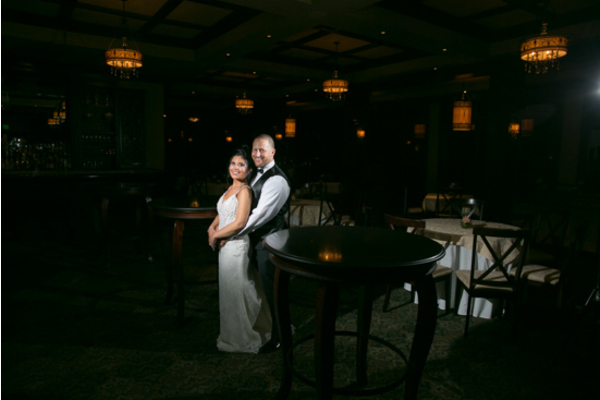 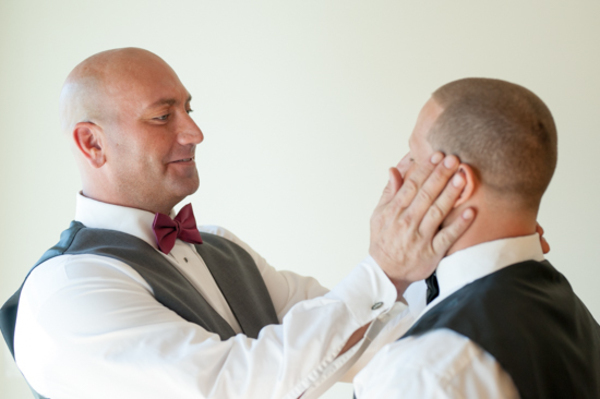 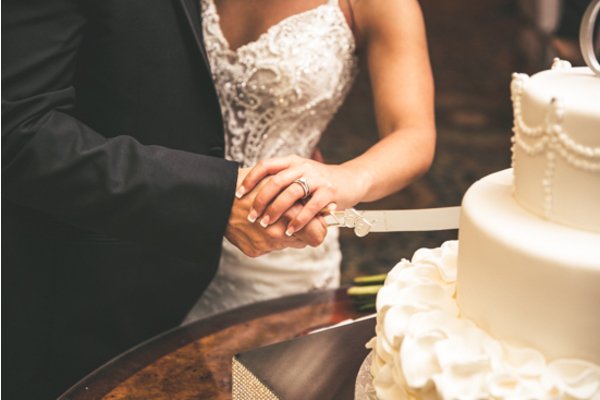 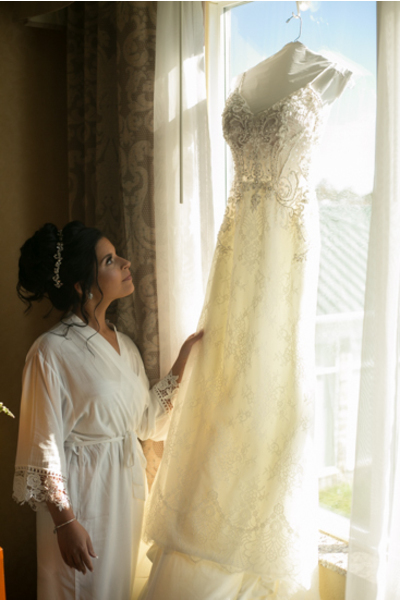 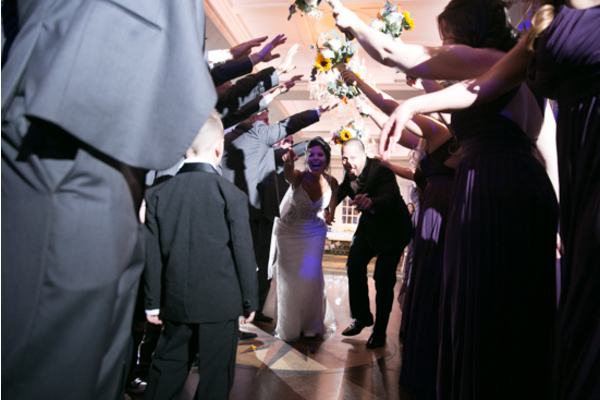 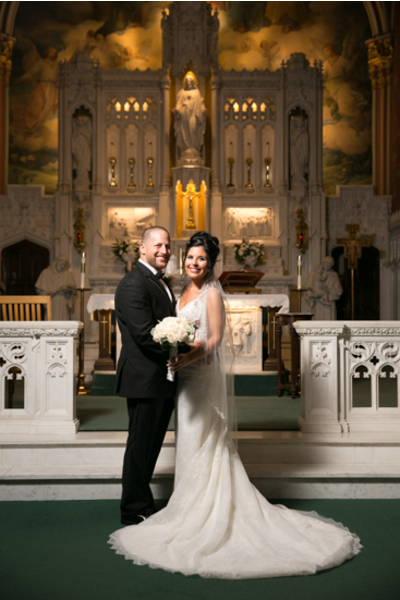 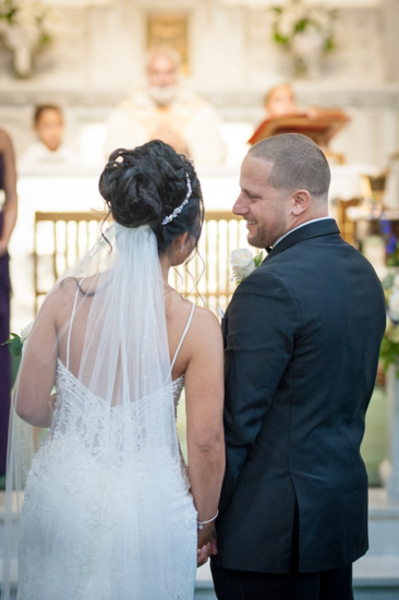 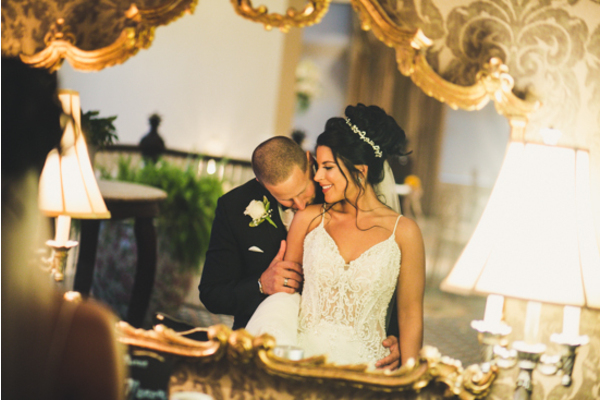 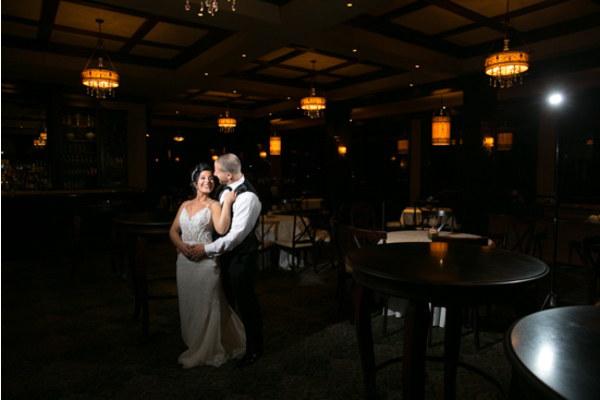 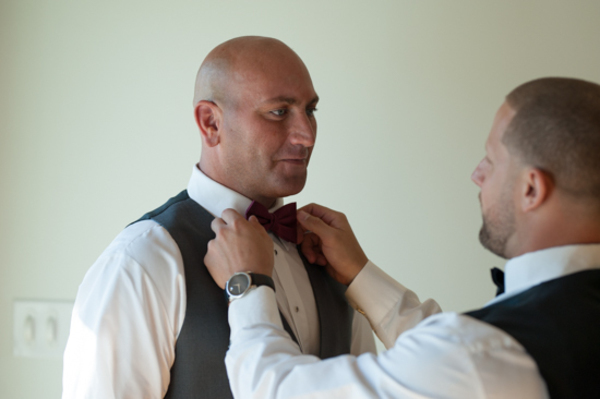 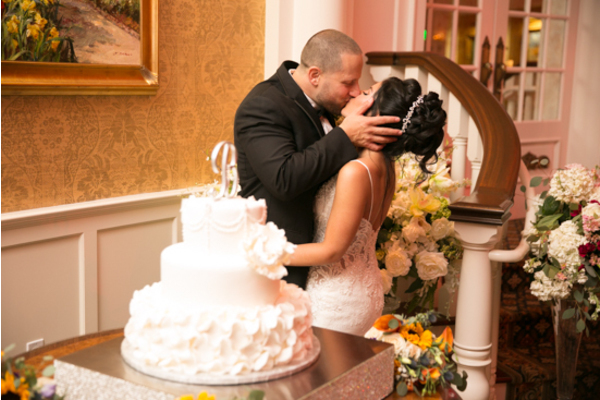 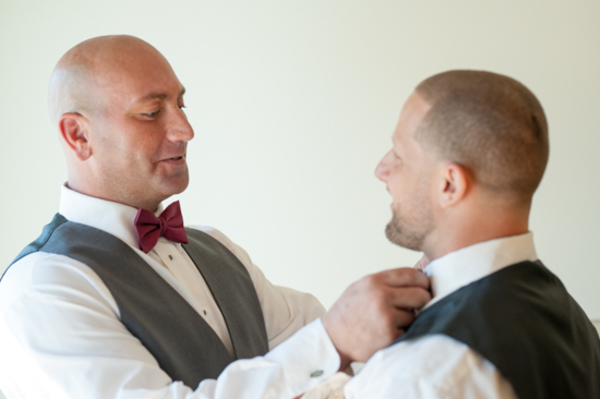 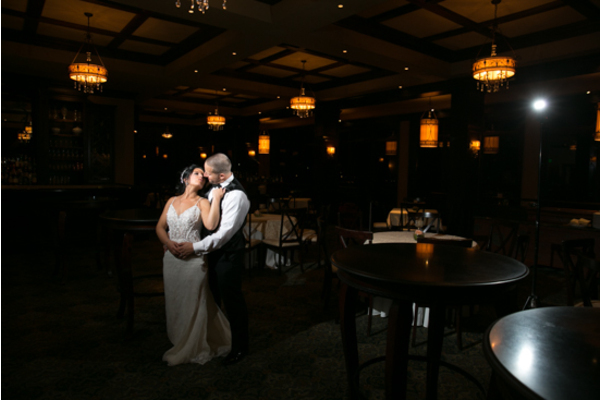 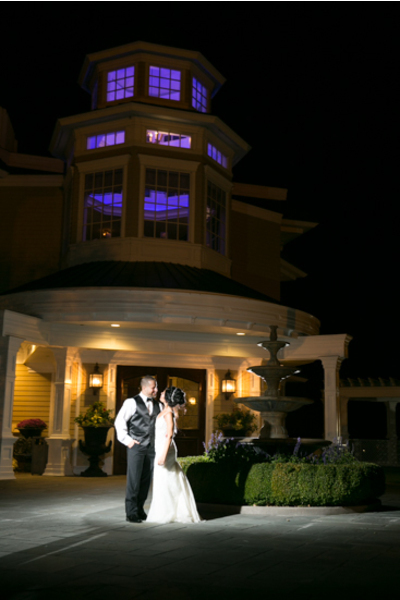 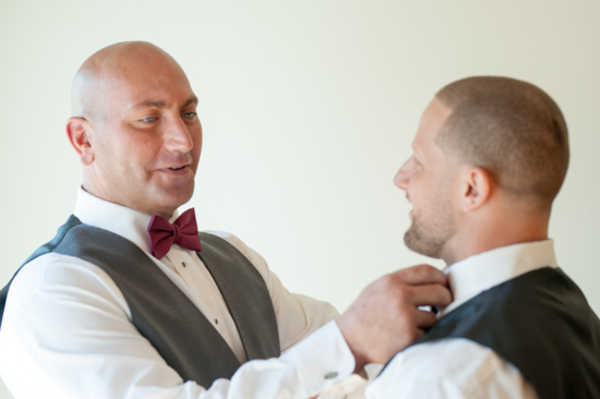 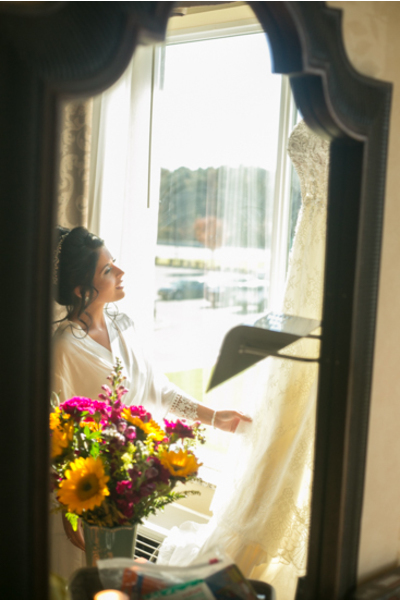 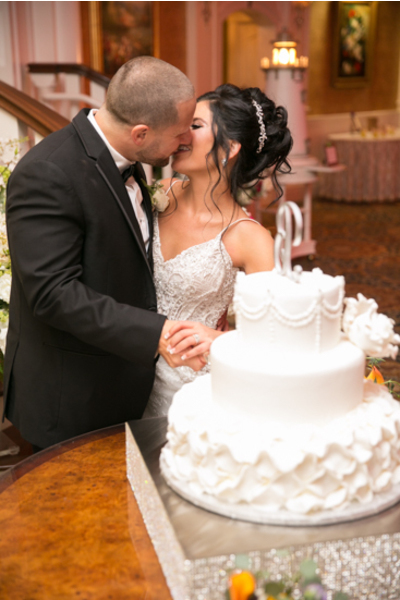 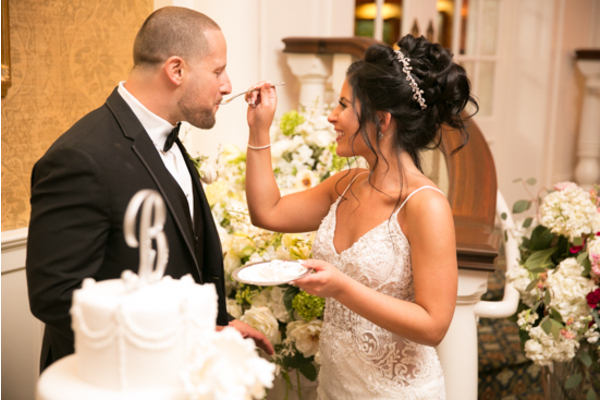 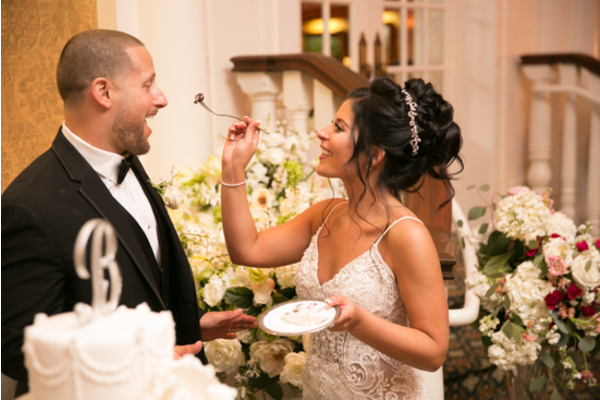 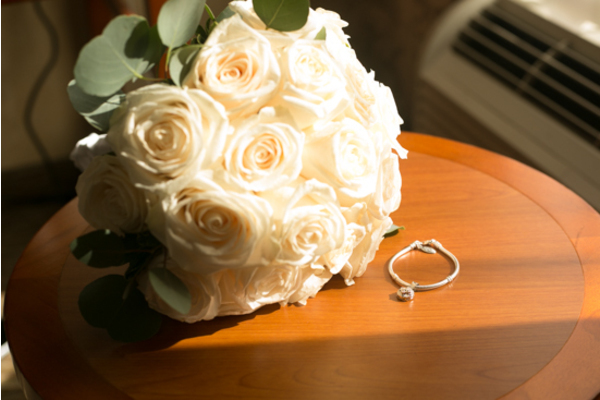 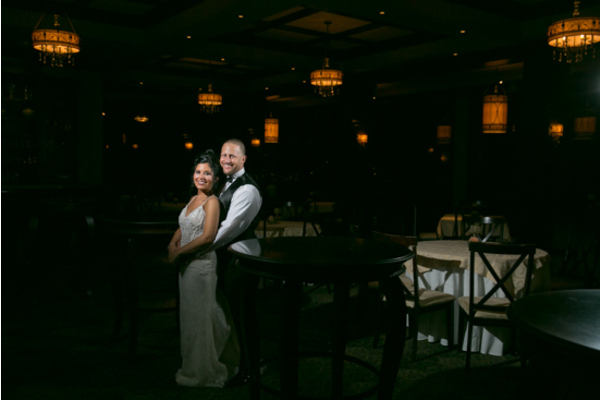 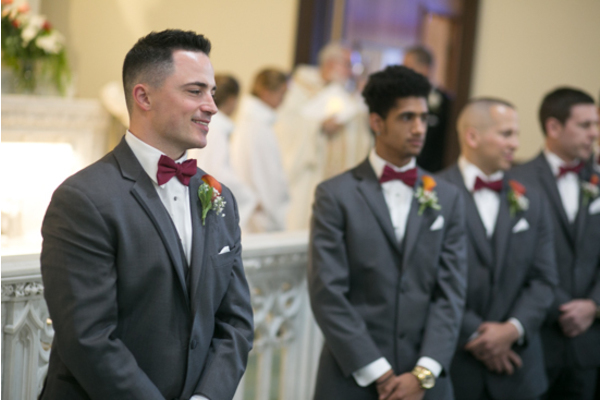 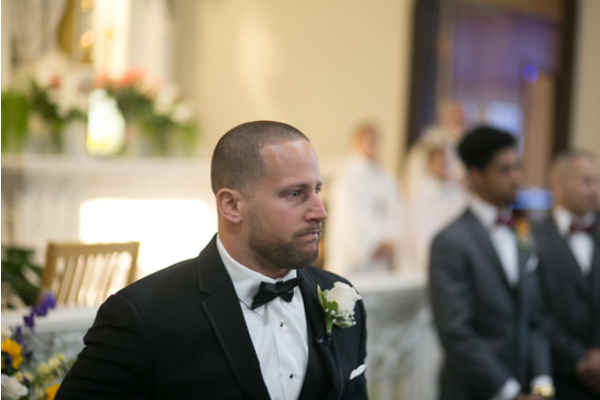 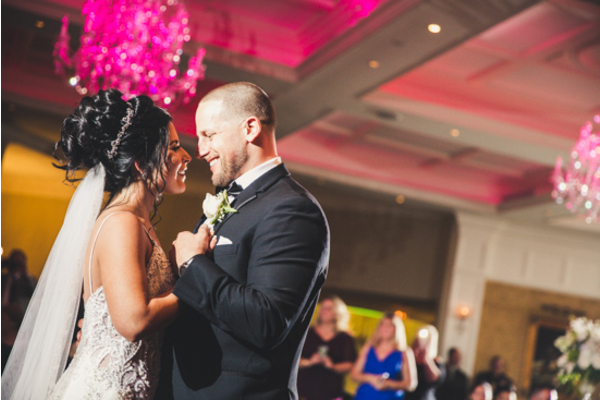 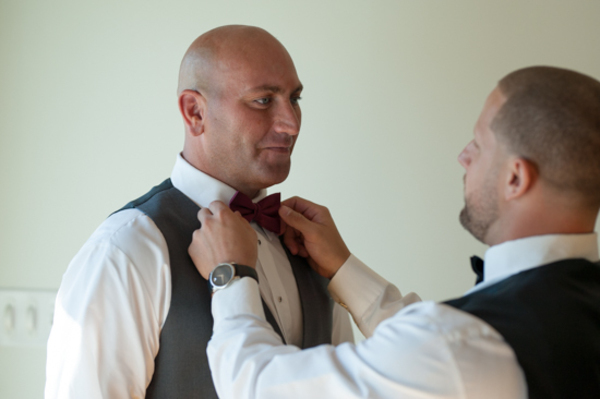 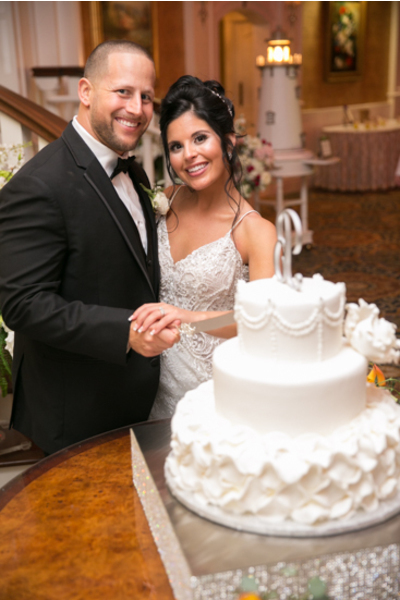 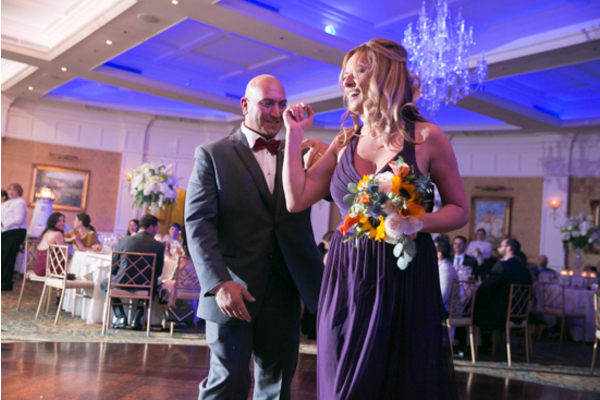 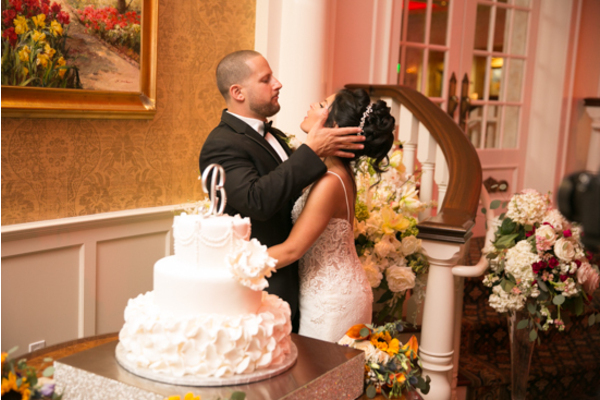 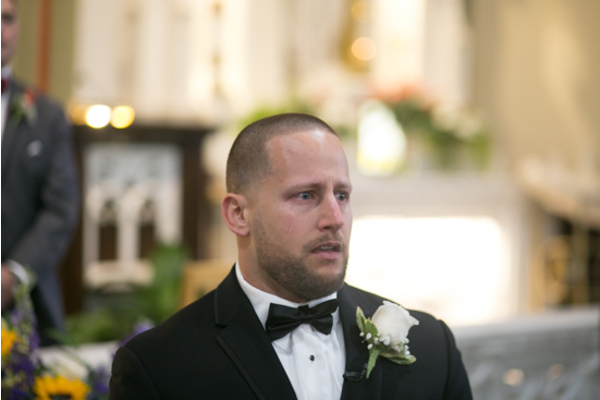 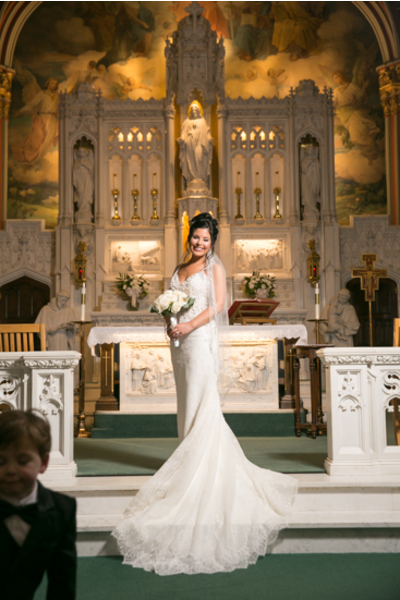 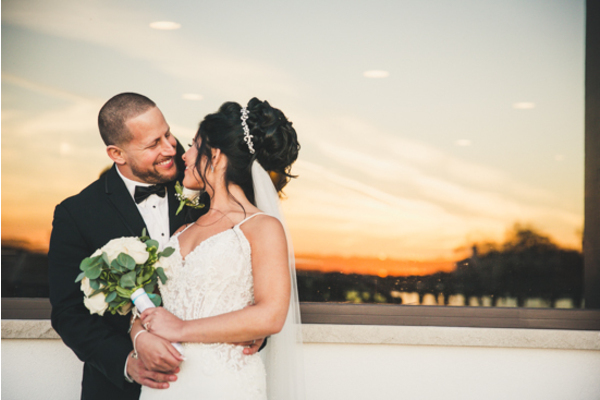 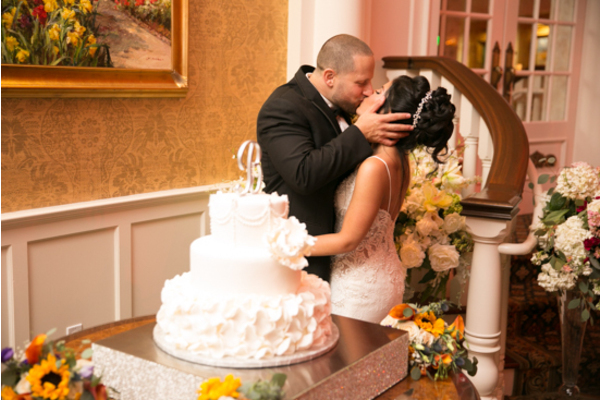 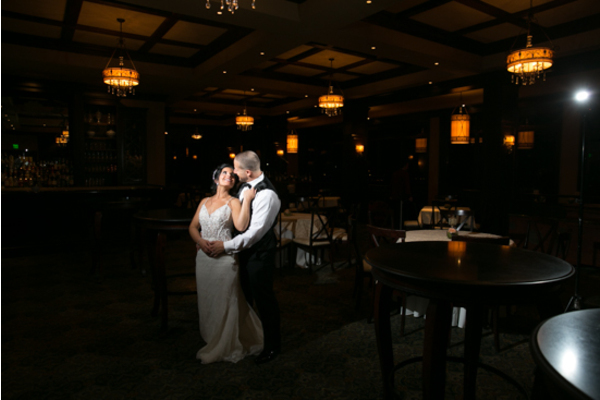 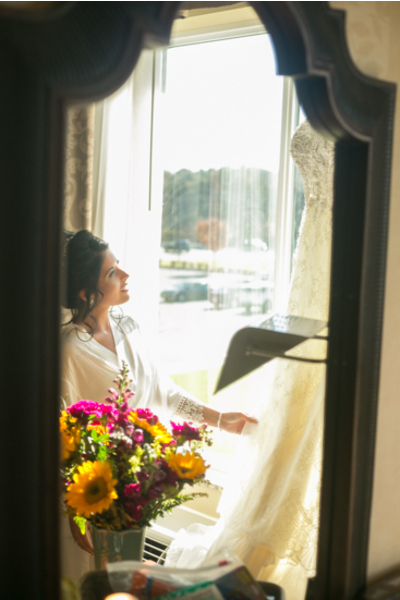 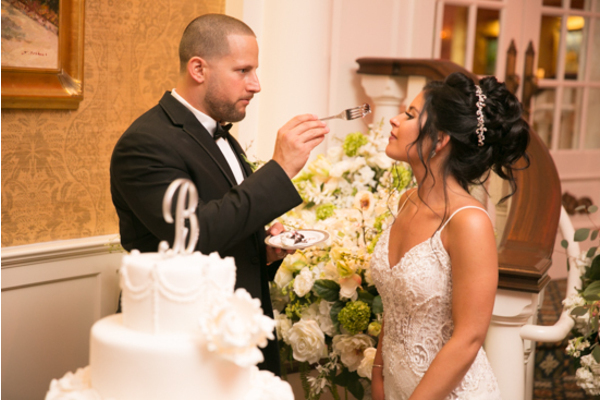 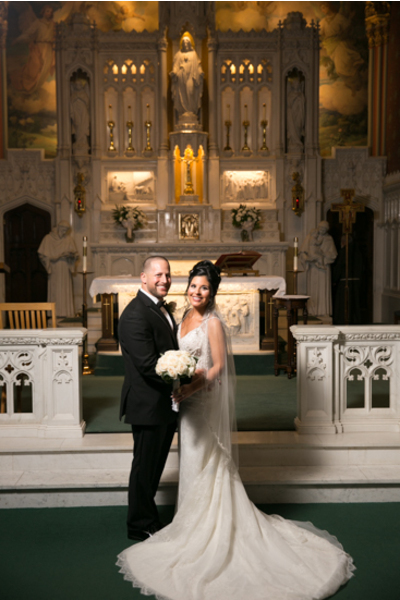 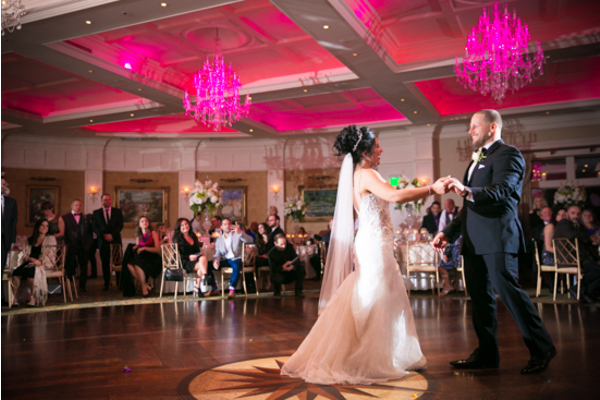 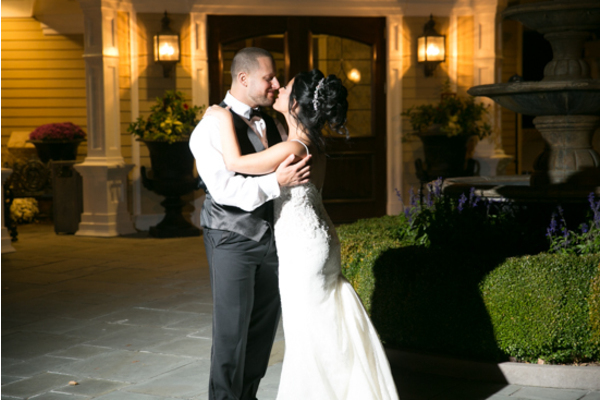 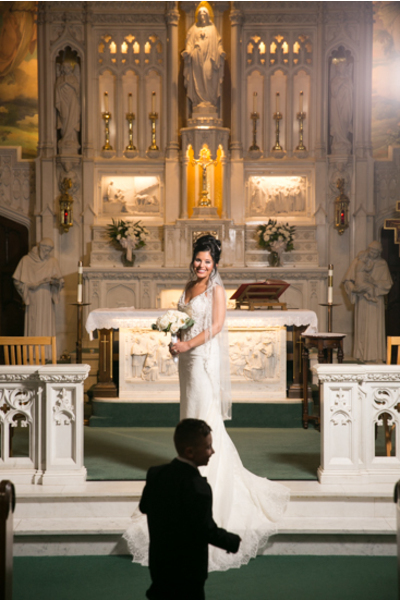 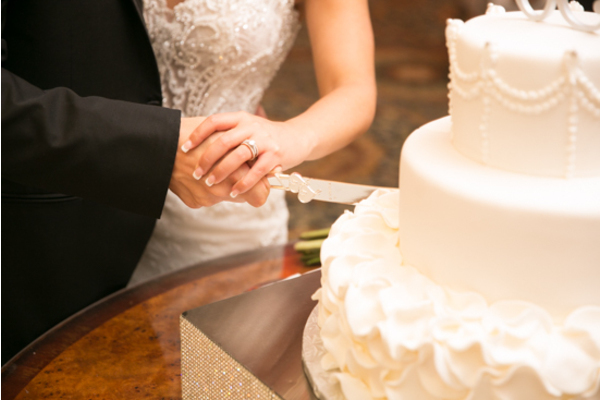 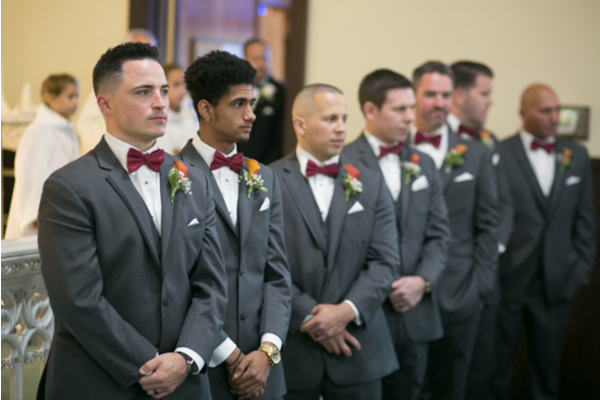 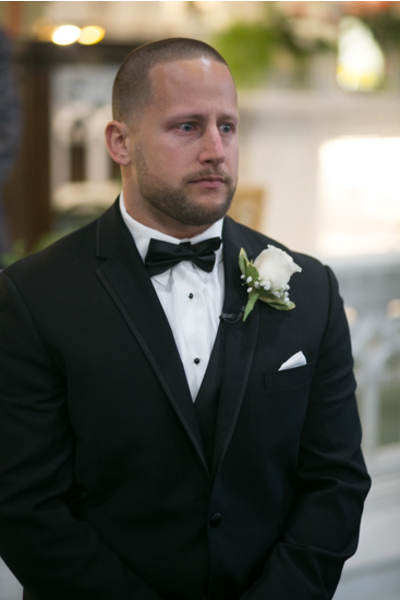 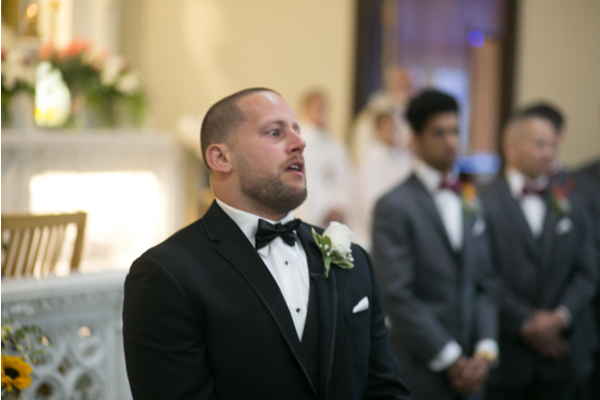 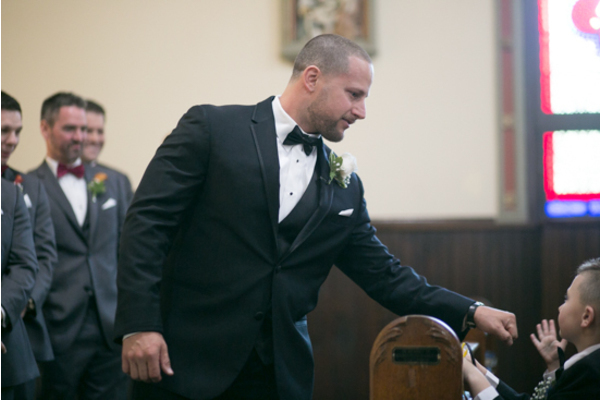 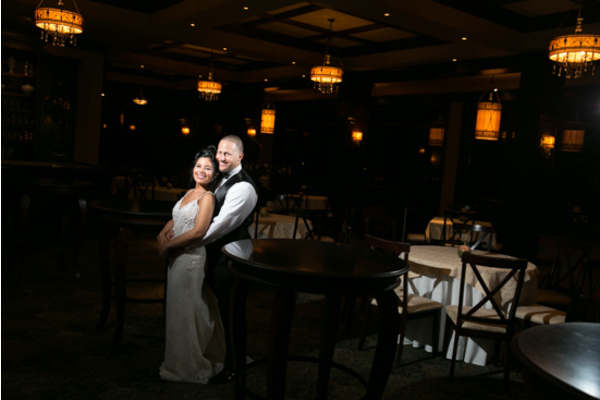 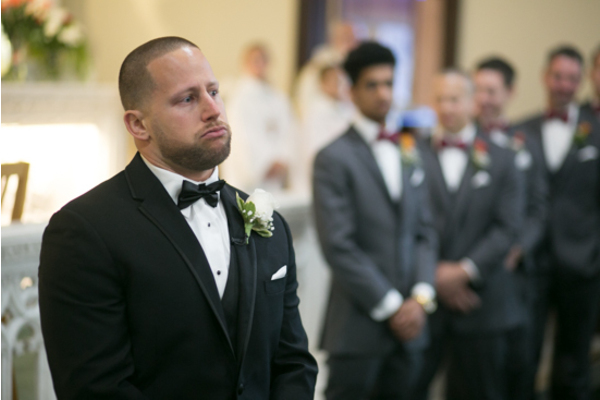 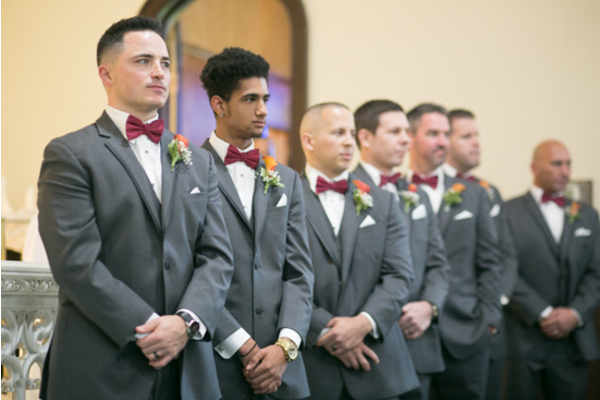 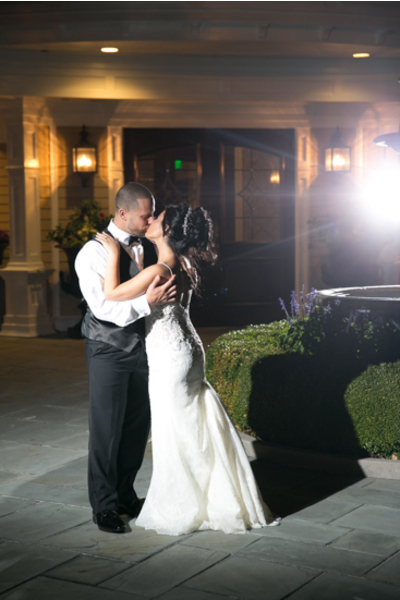 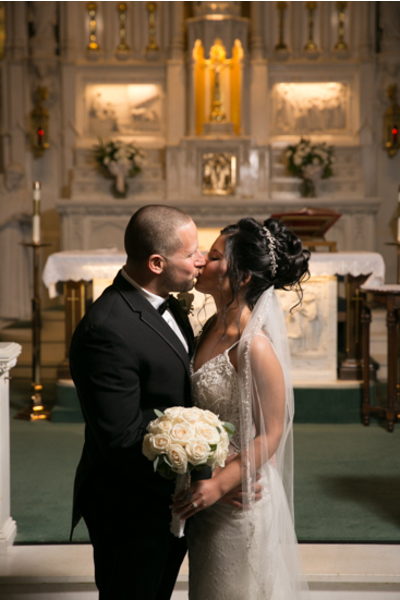 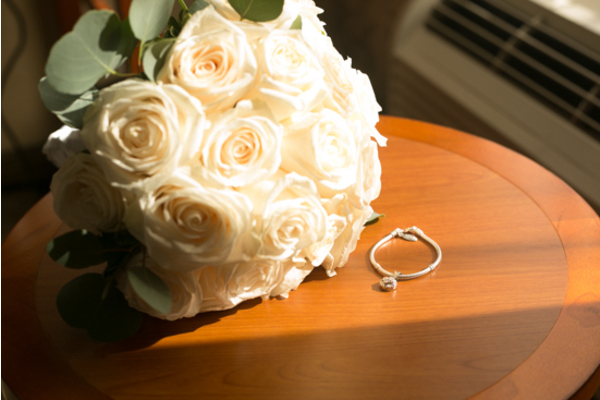 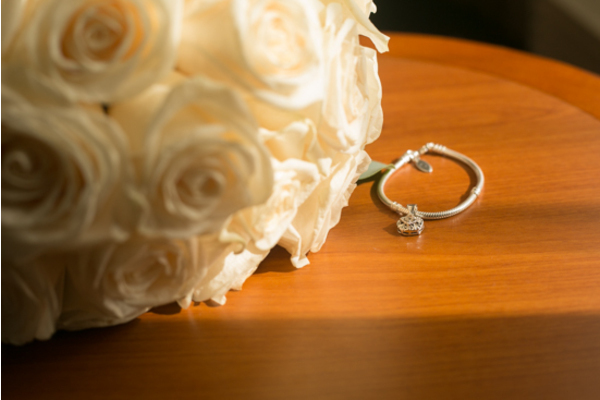 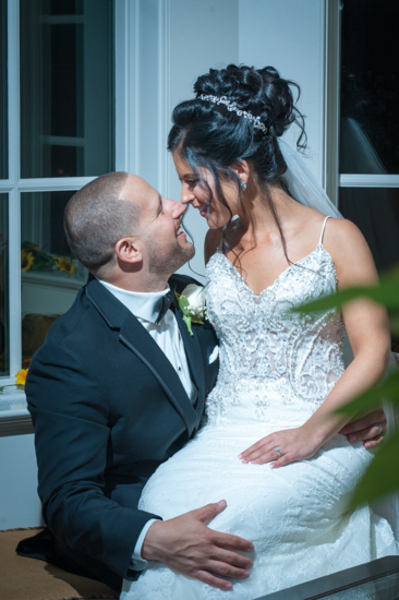 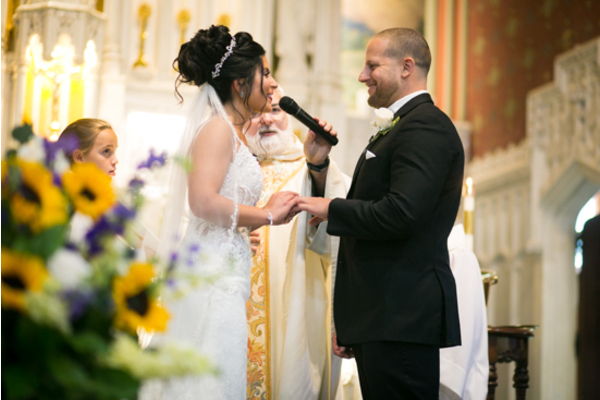 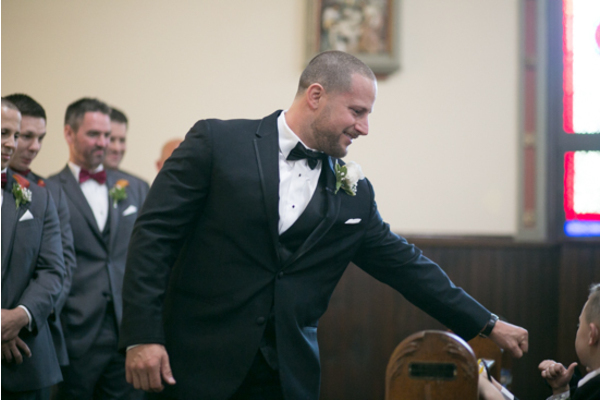 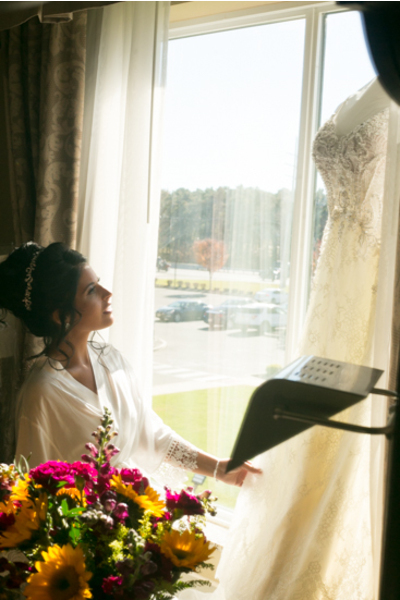 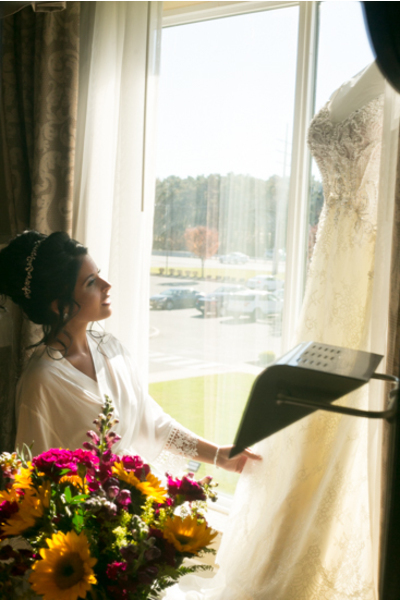 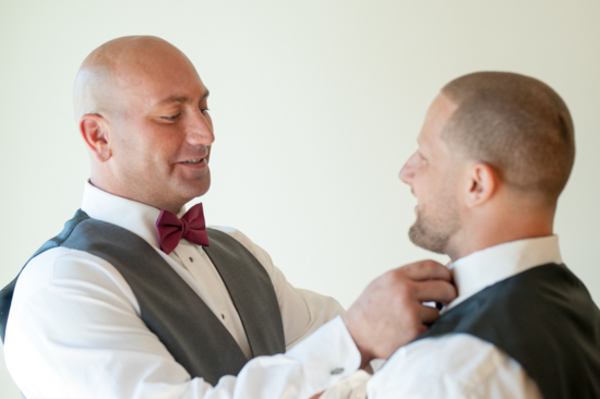 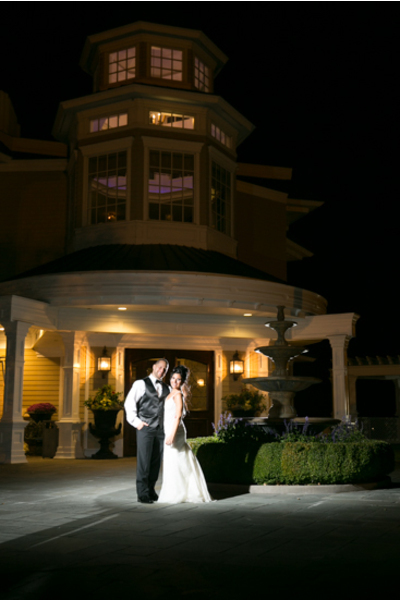 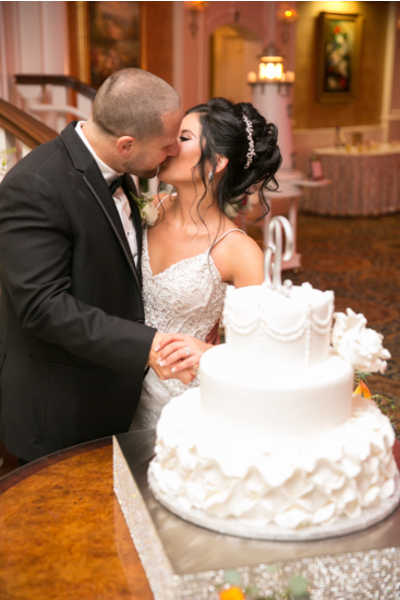 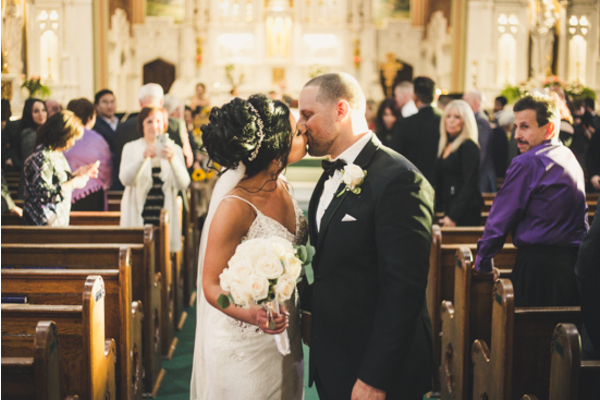 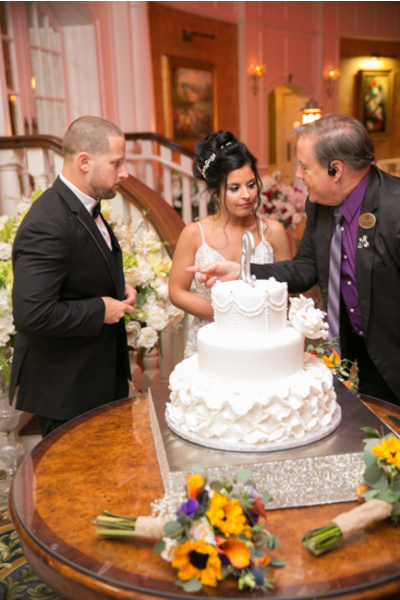 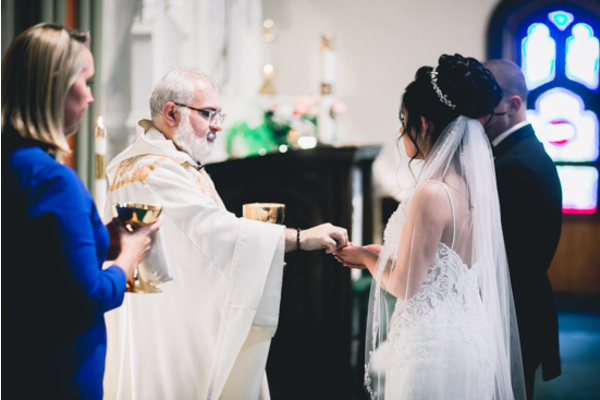 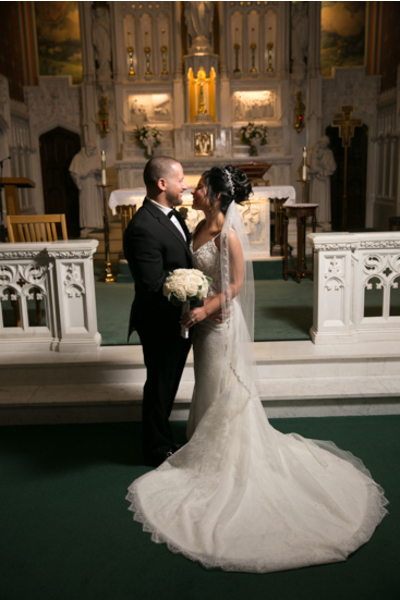 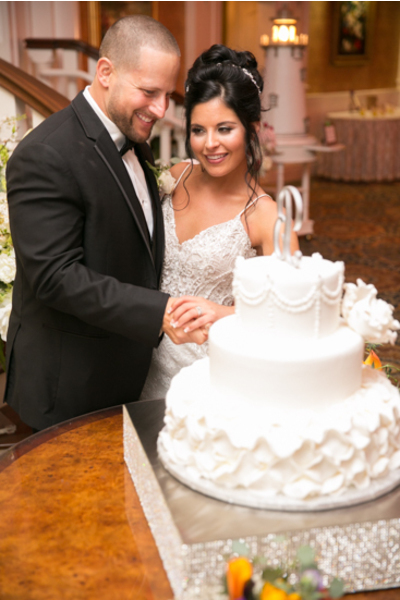 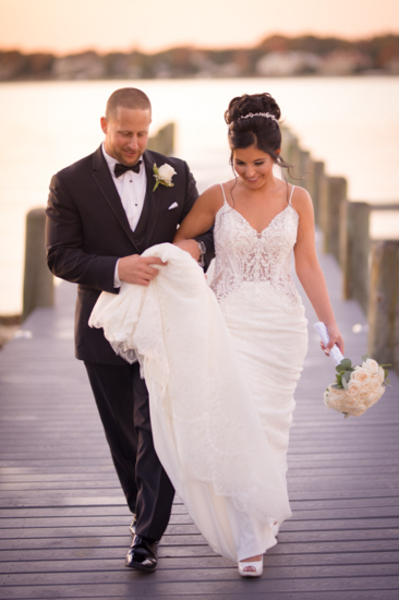 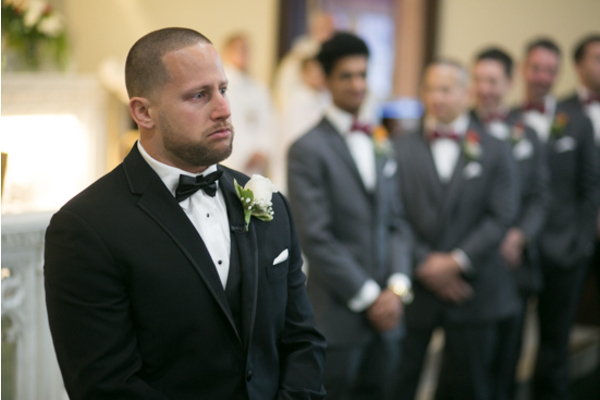 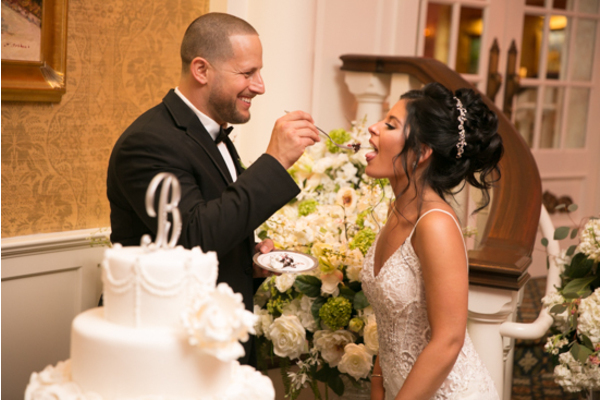 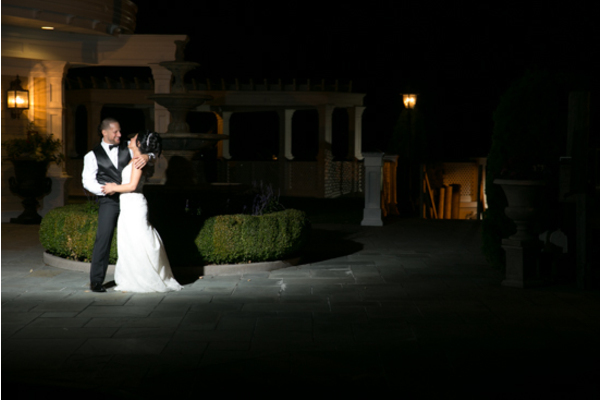 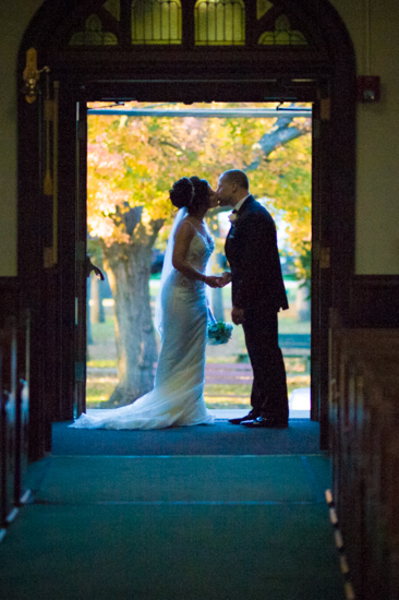 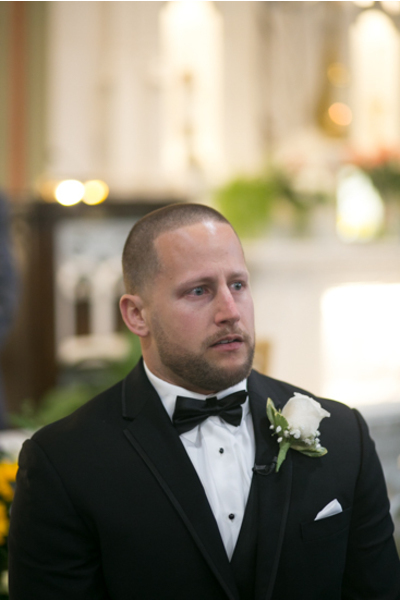 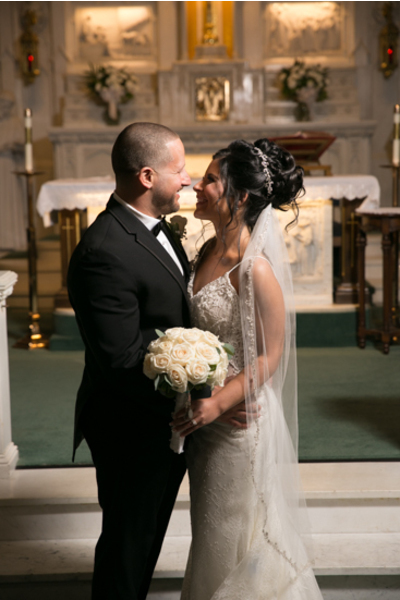 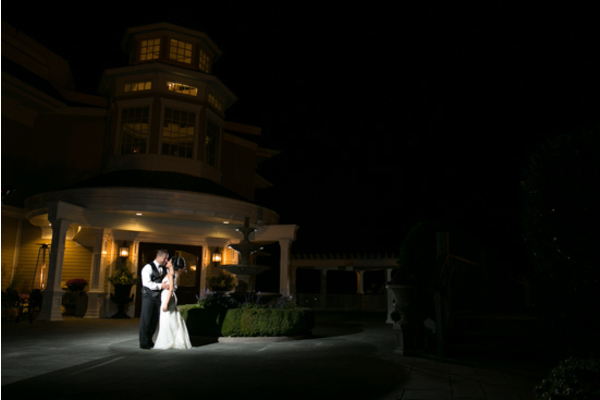 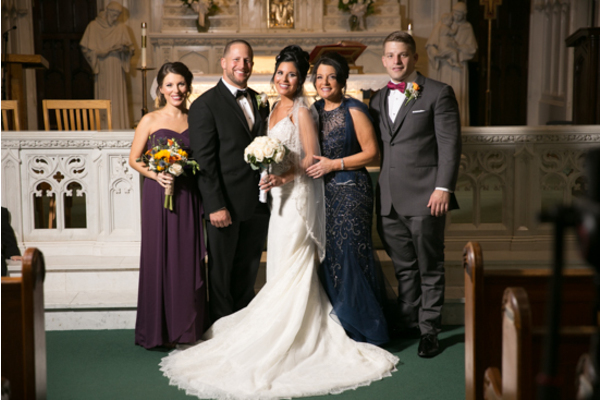 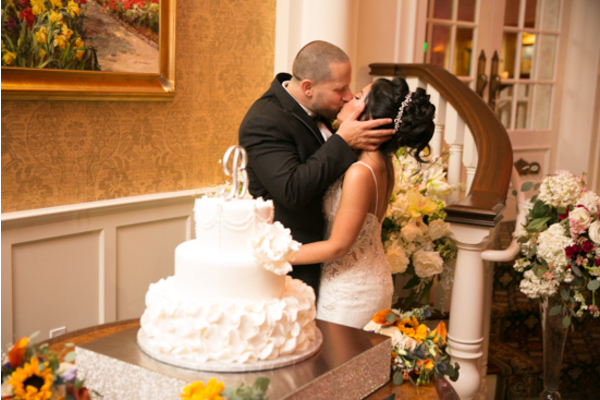 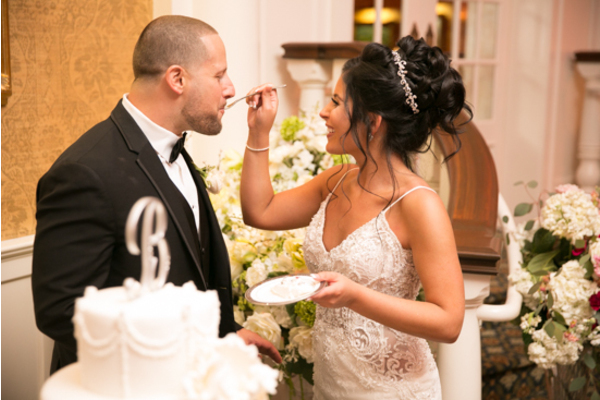 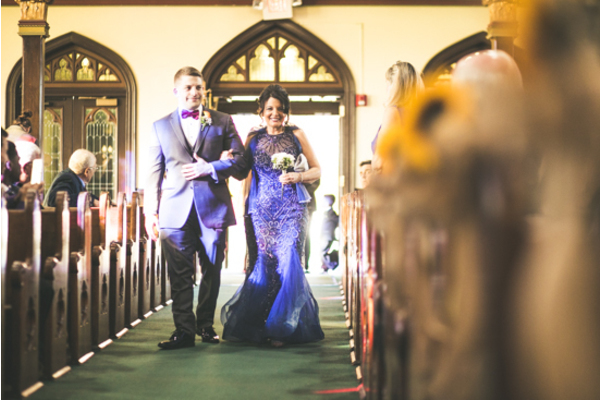 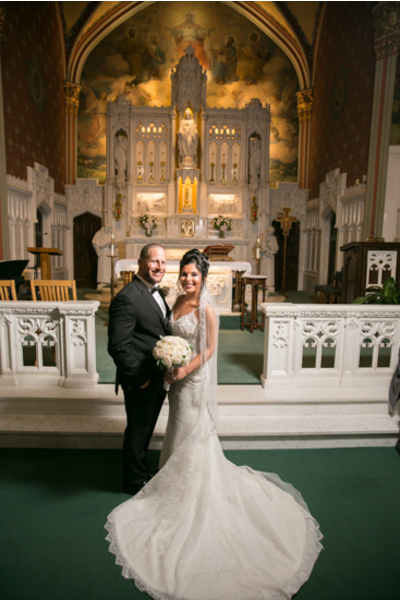 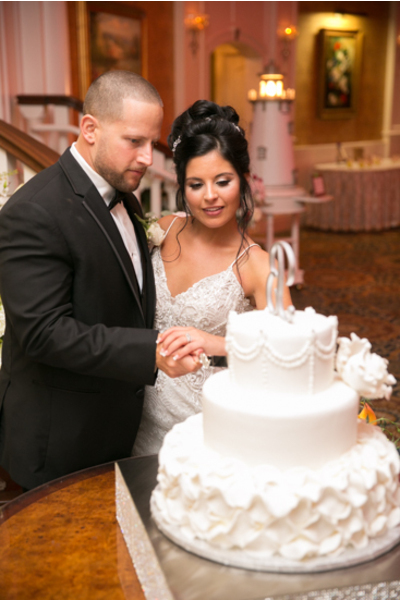 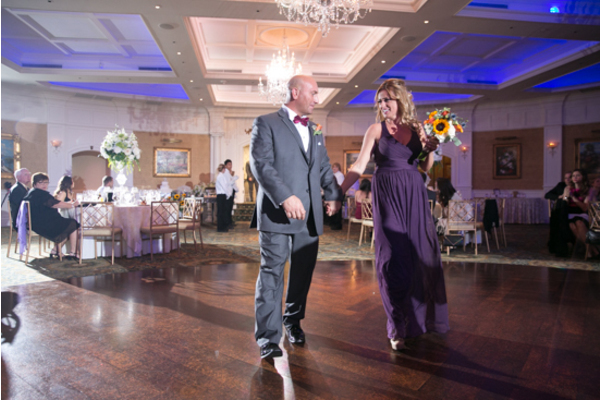 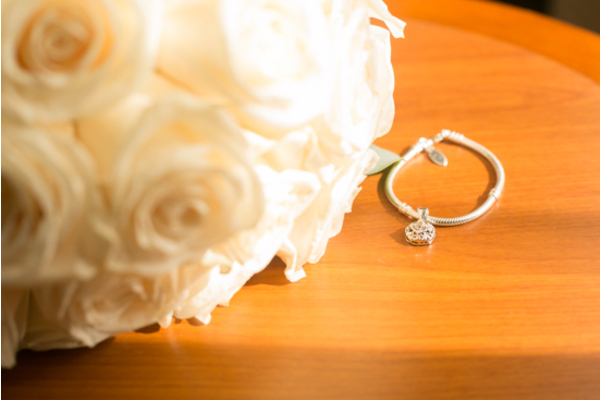 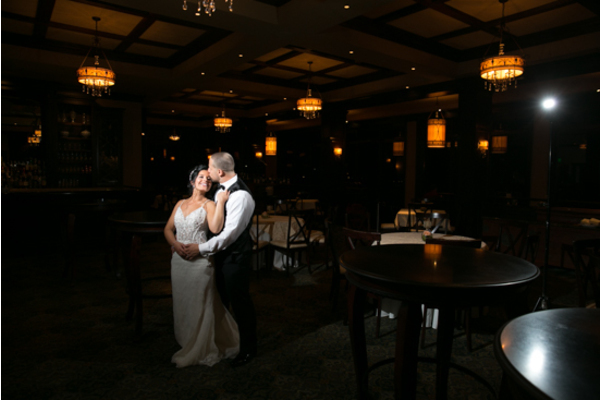 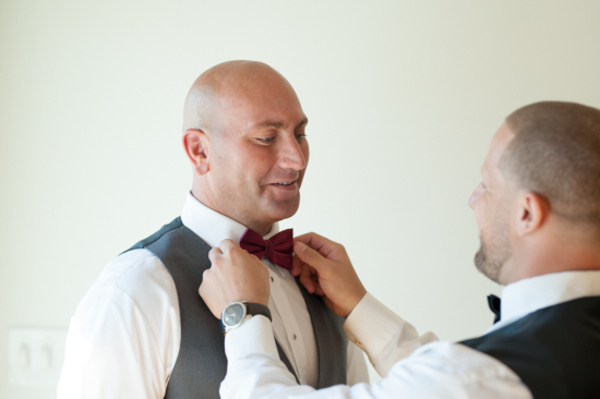 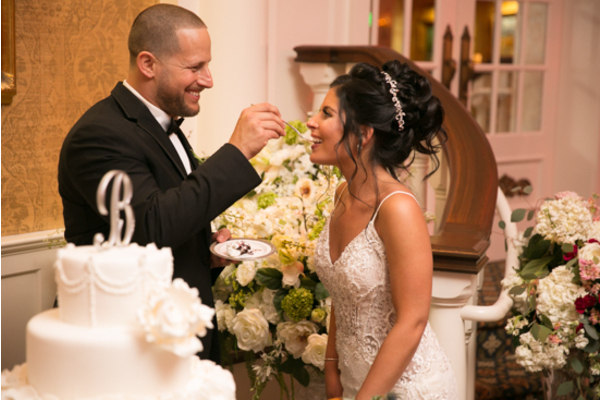 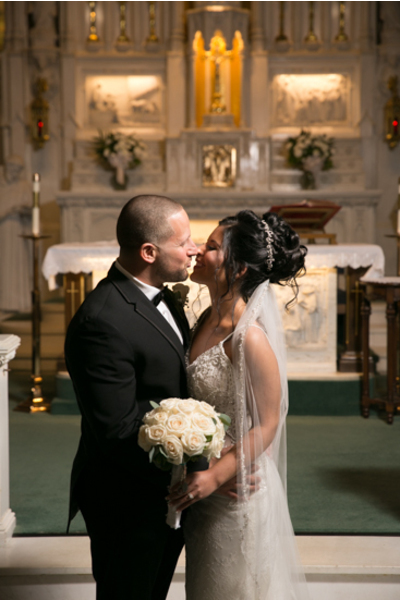 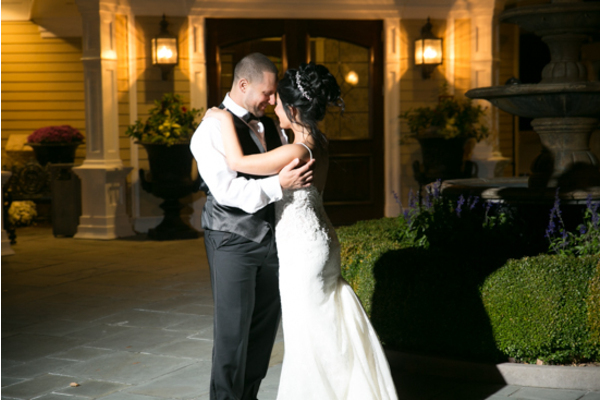 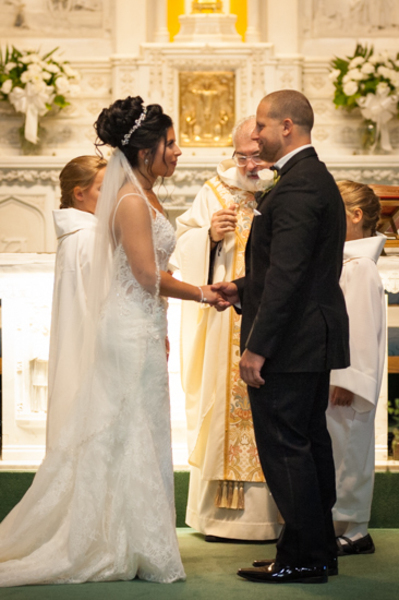 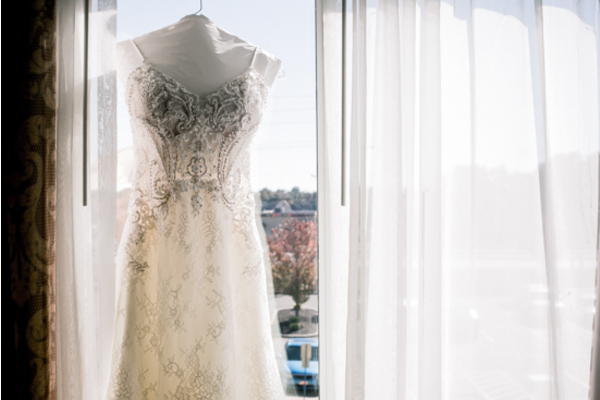 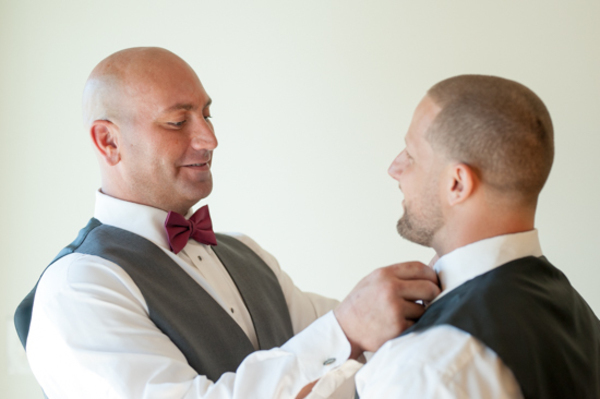 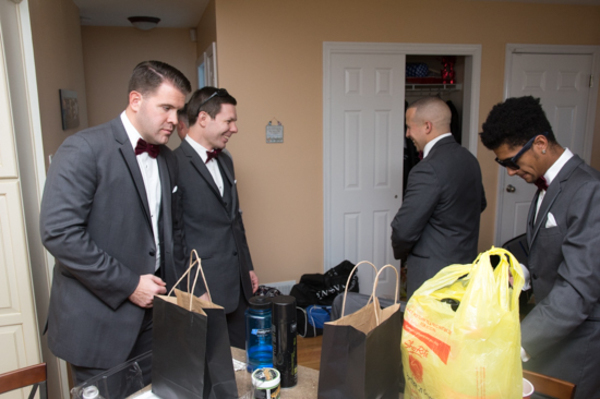 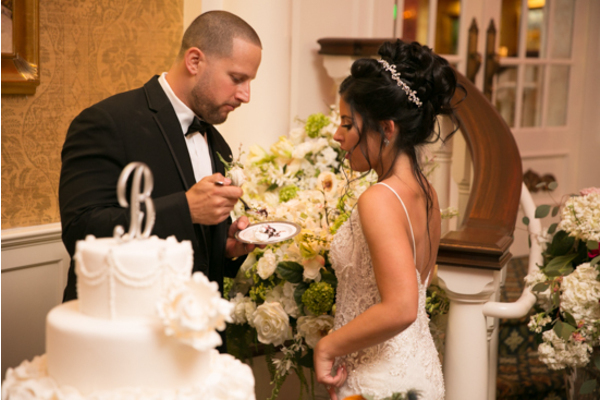 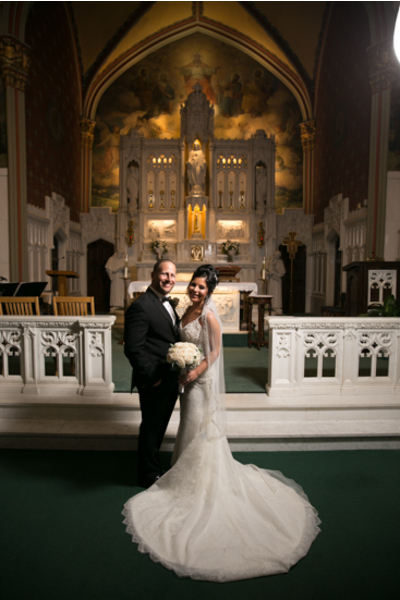 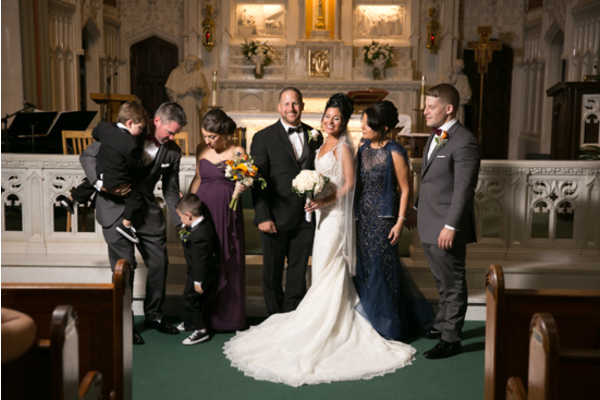 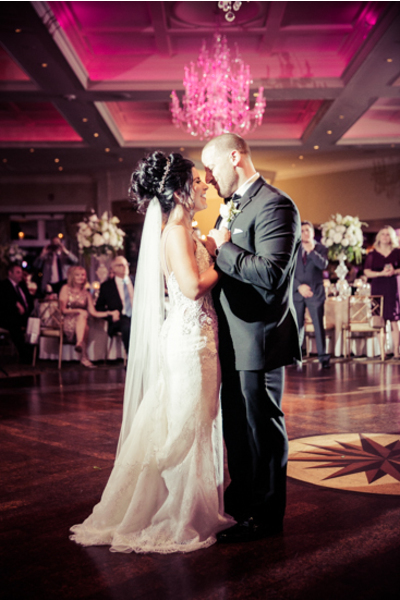 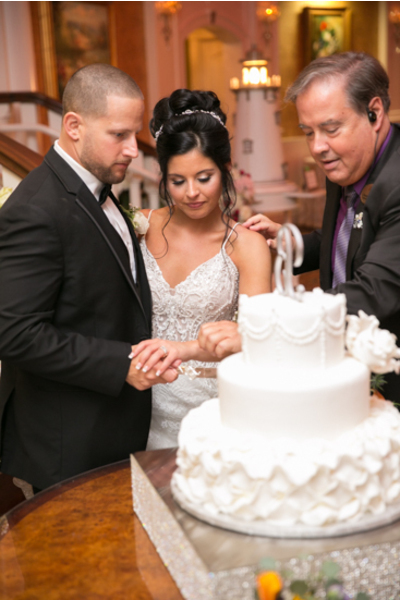 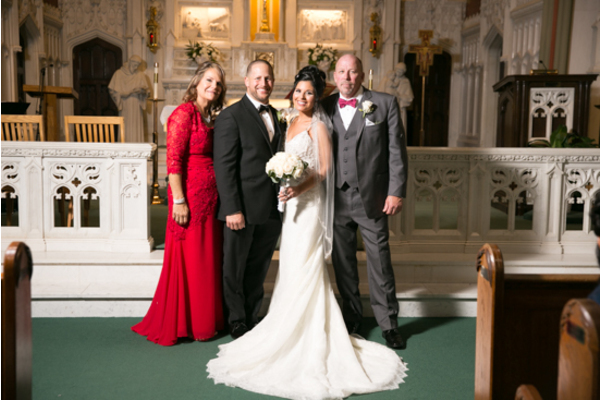 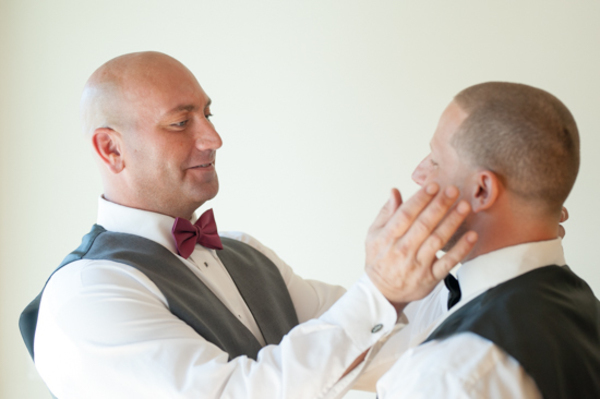 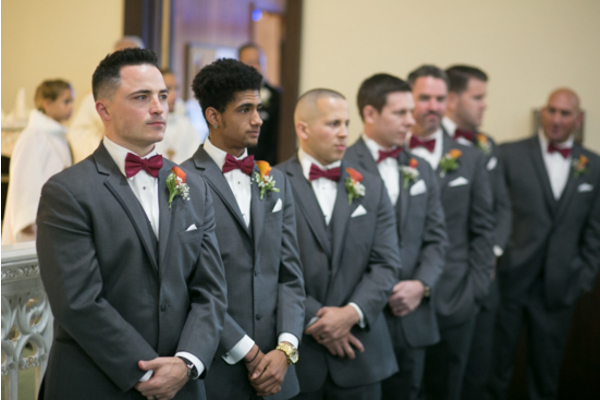 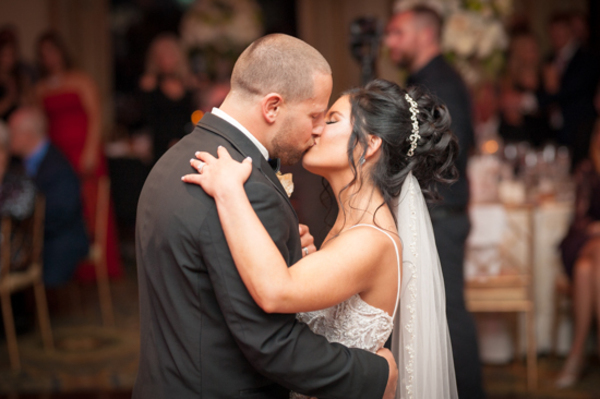 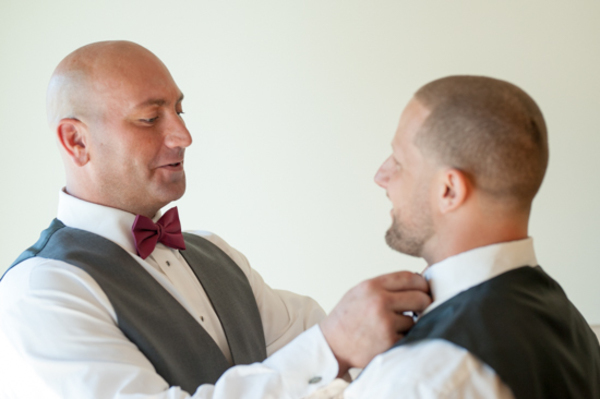 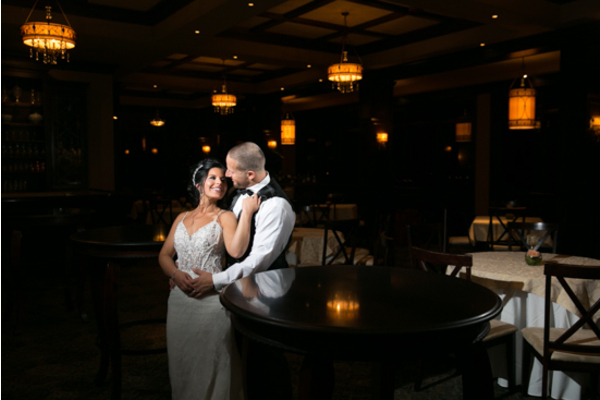 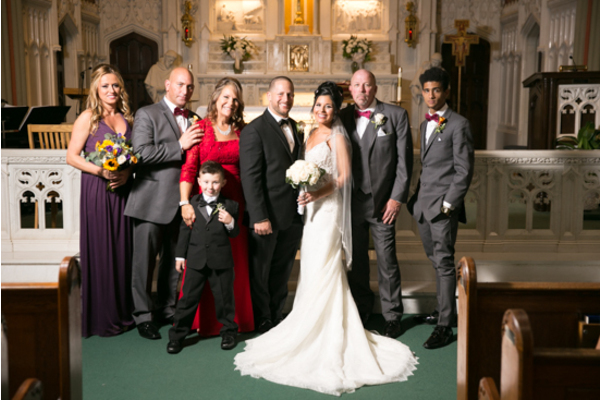 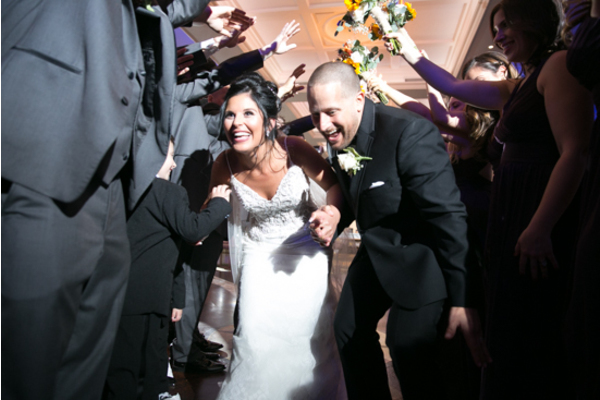 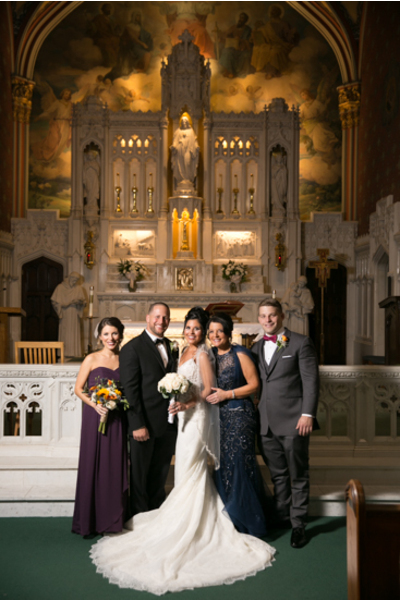 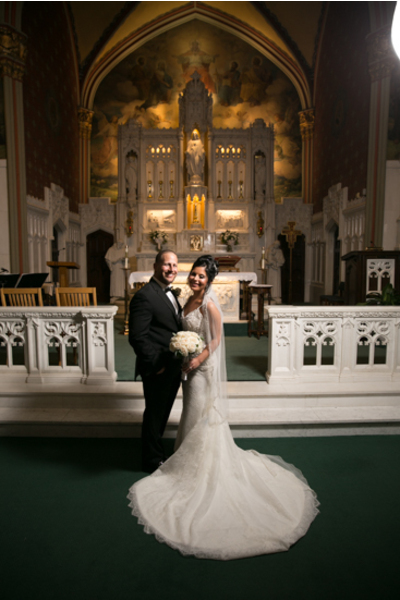 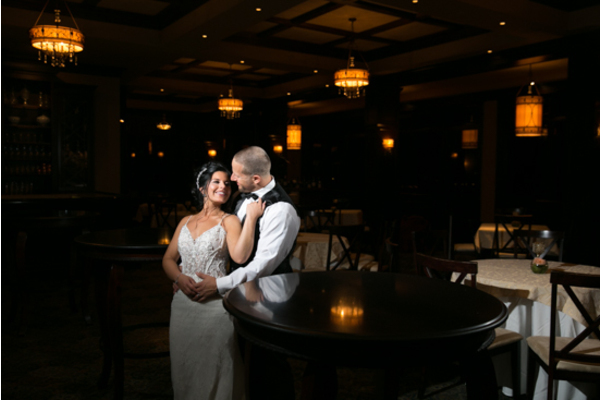 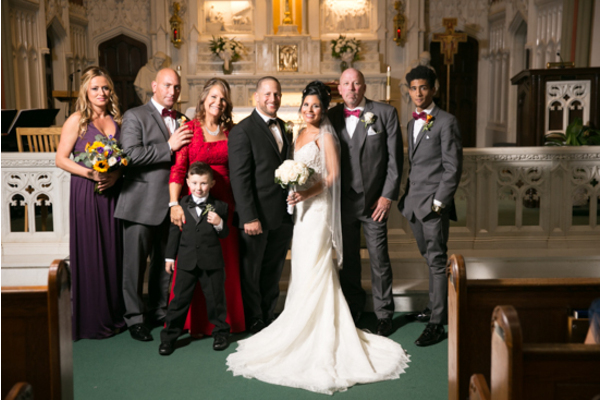 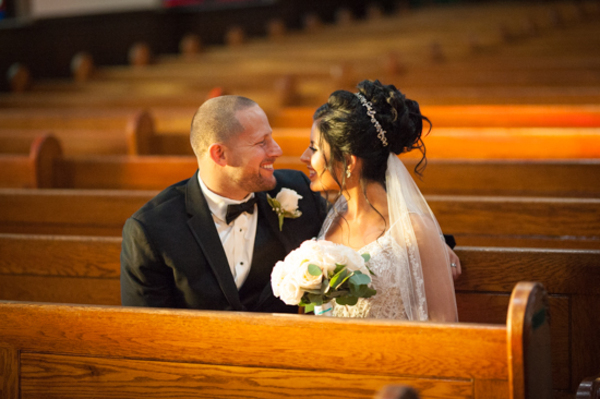 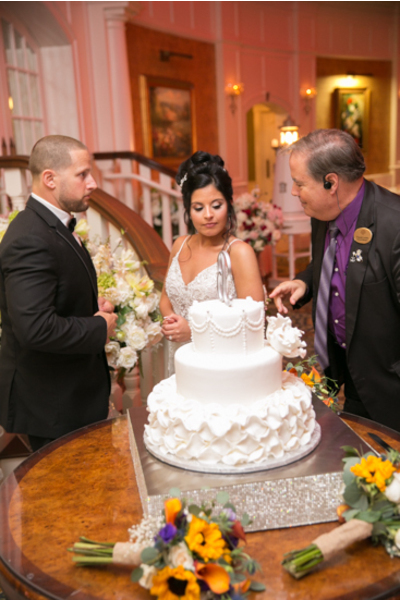 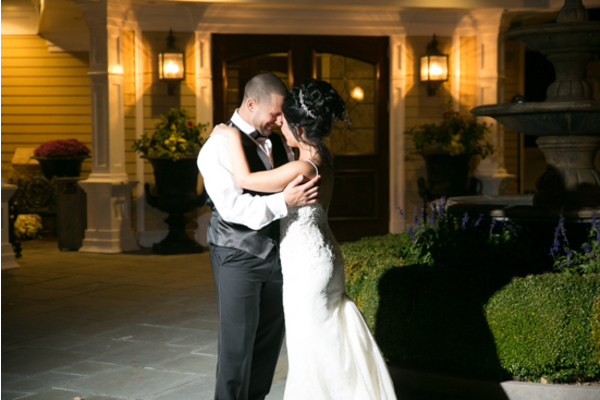 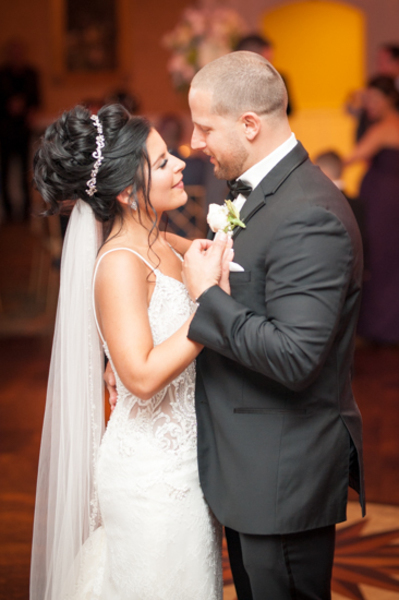 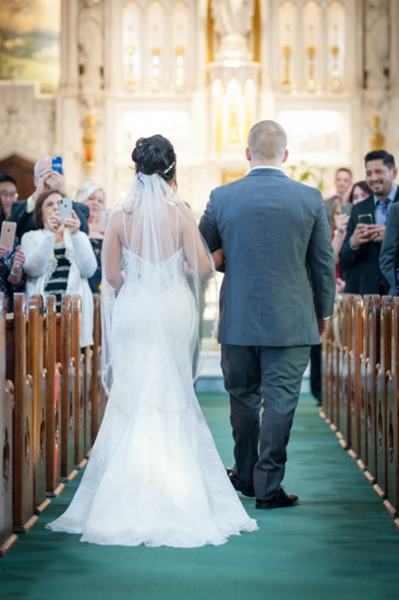 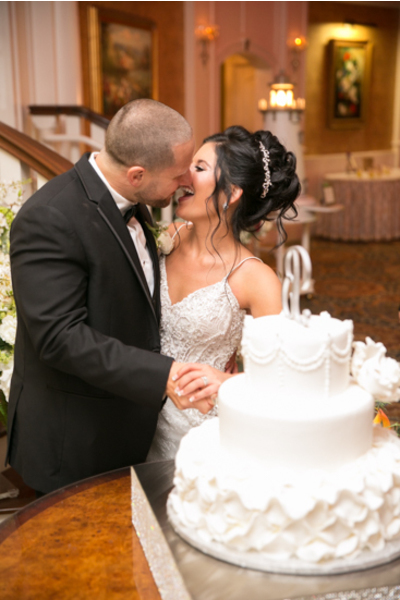 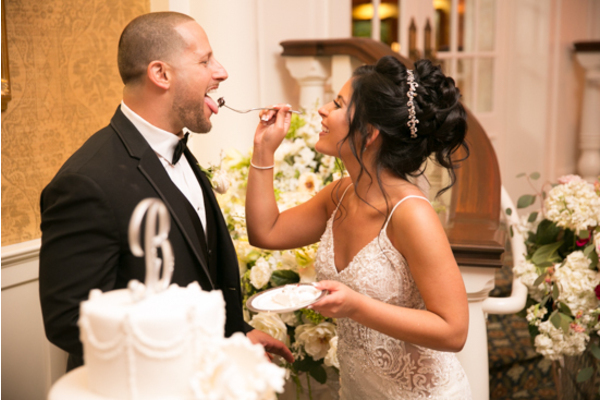 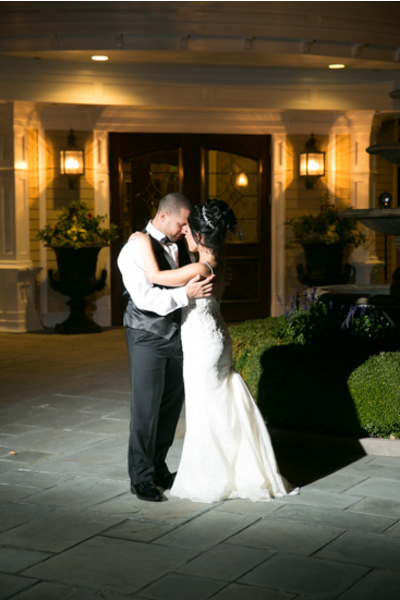 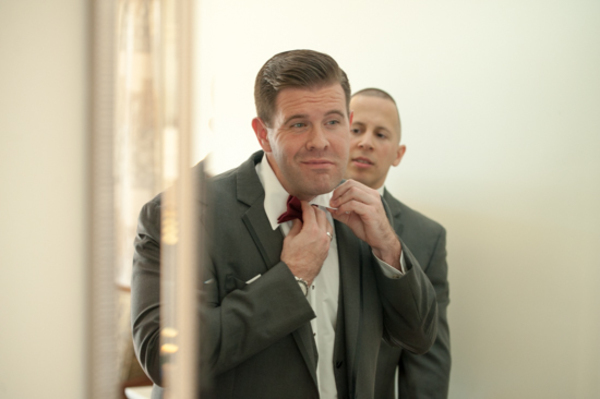 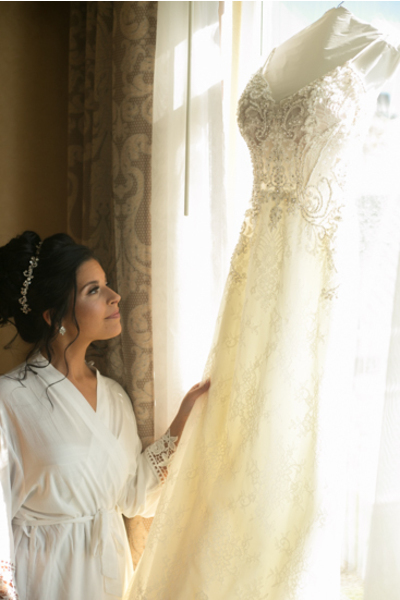 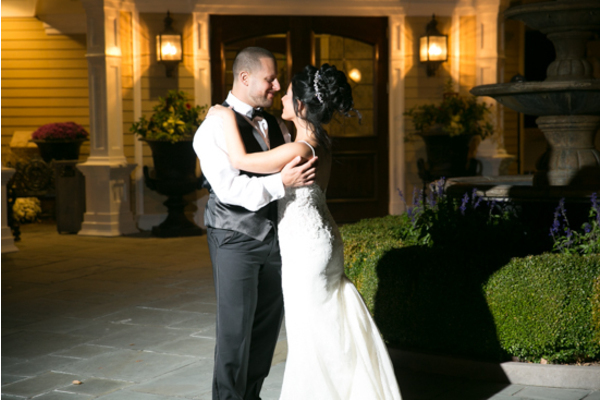 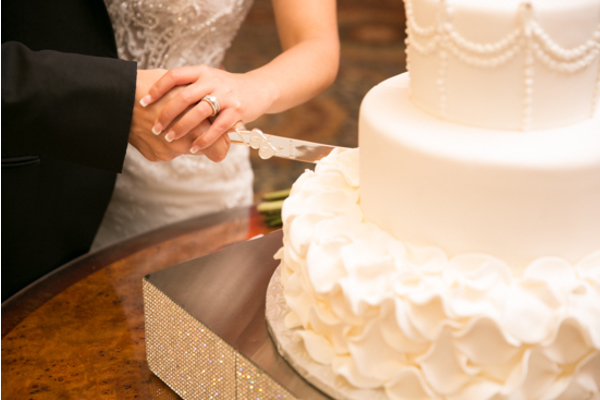 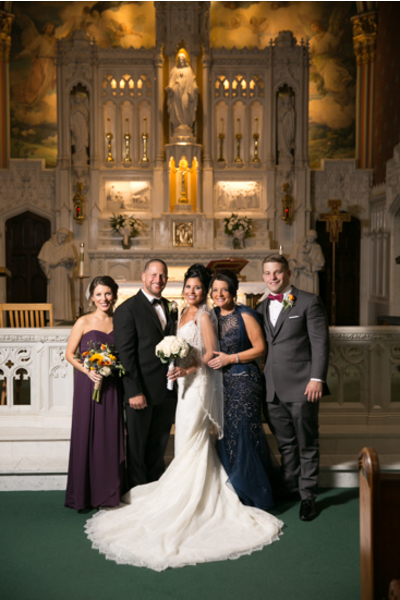 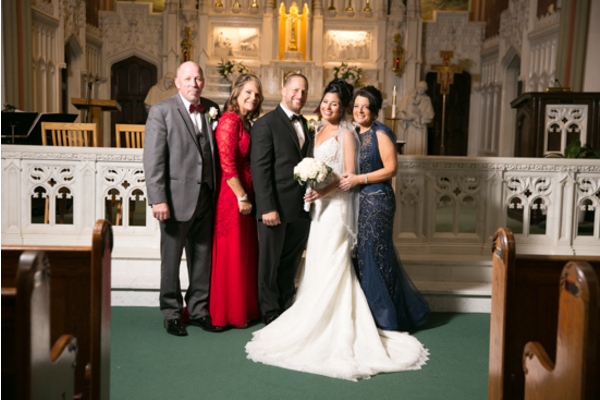 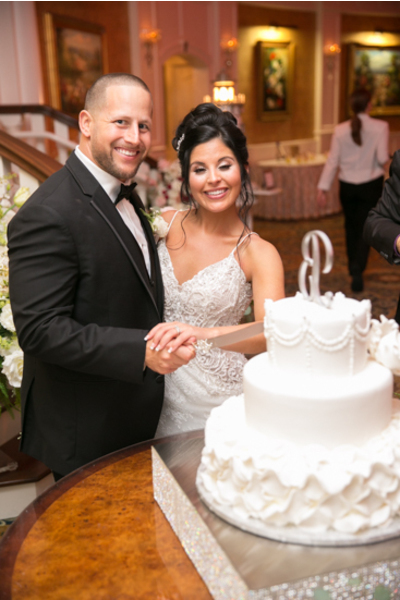 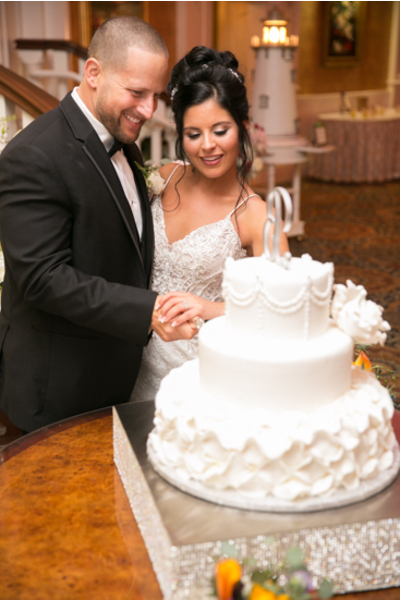 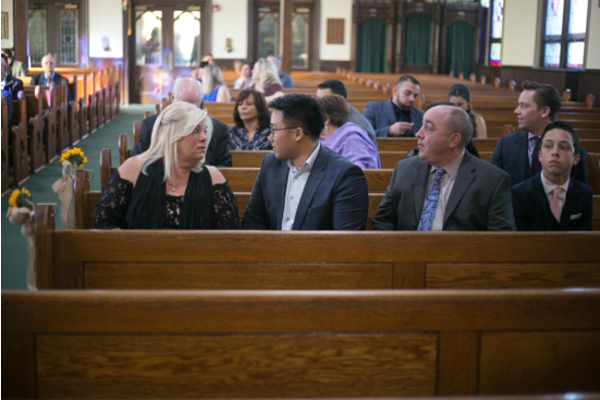 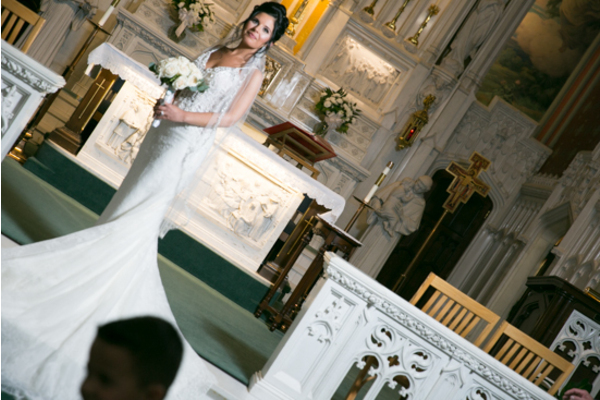 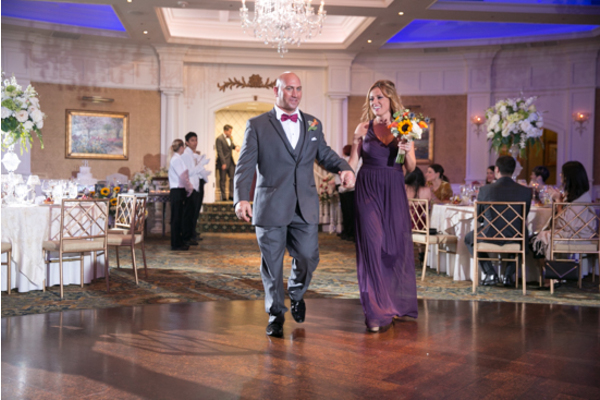 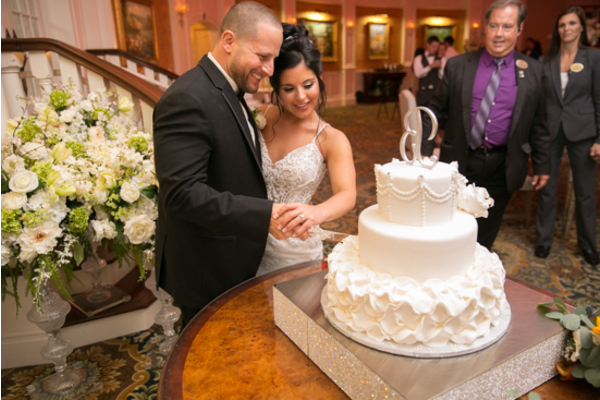 Our NJ Wedding Photographer captured the perfect moment Larissa and Stephen locked eyes for the first time. 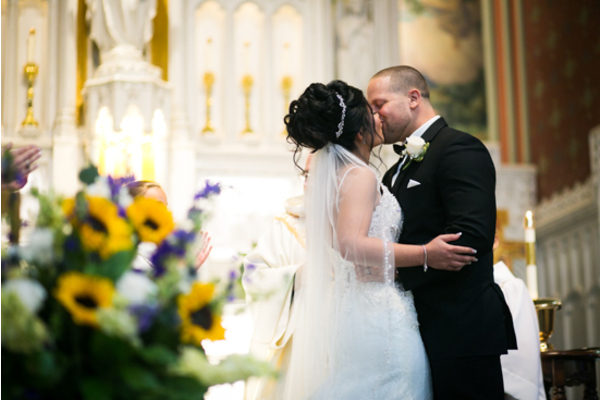 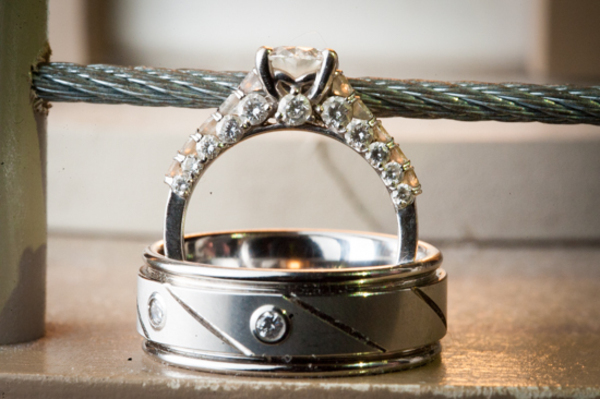 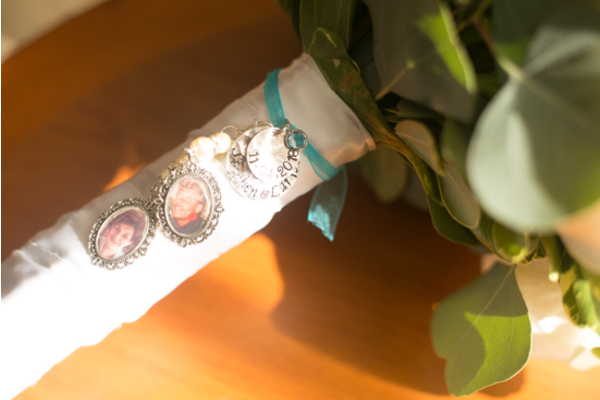 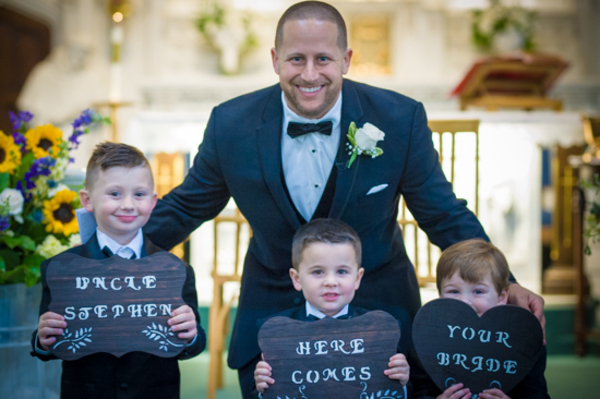 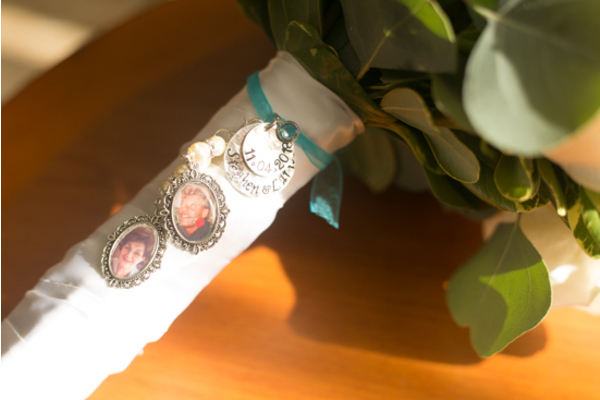 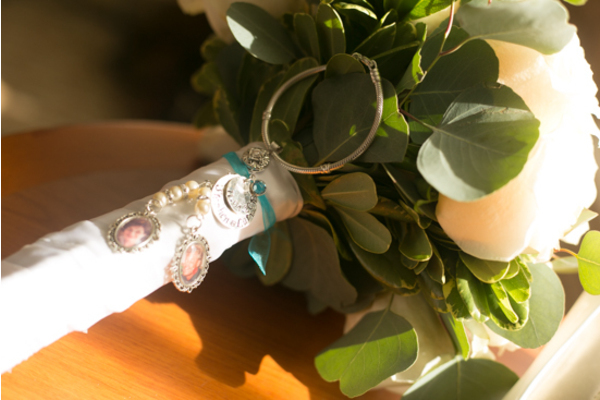 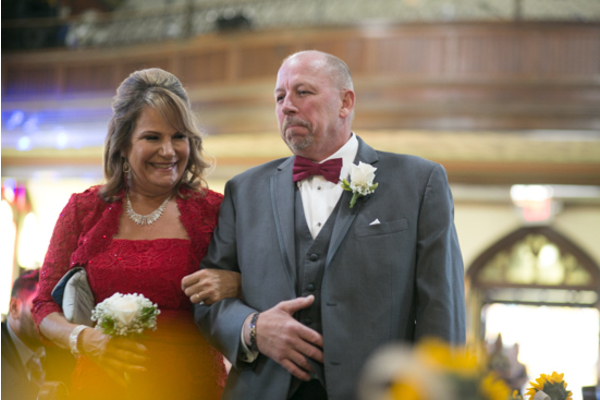 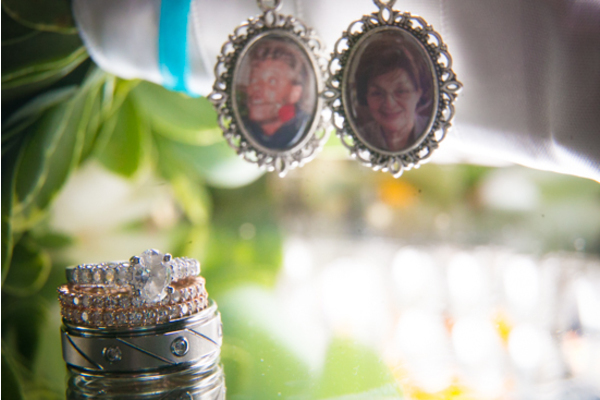 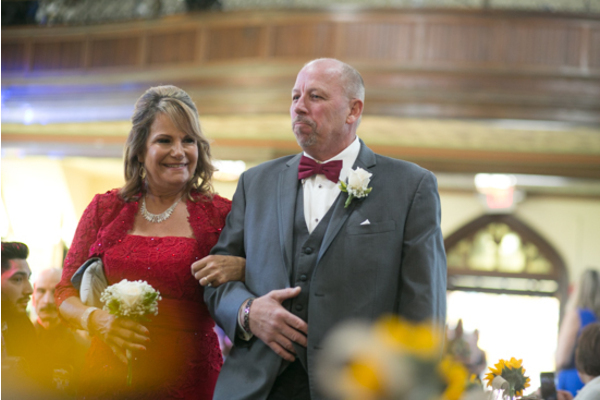 There wasn’t a single dry eye in the crowd as the couple shared their vows and sealed them with a kiss. 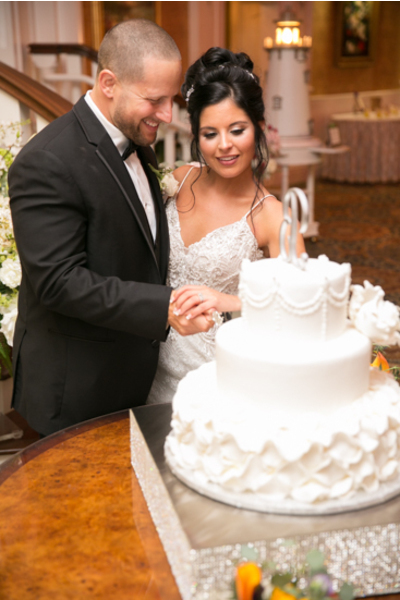 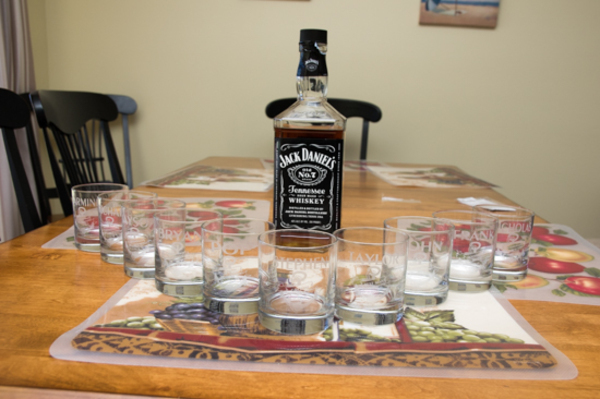 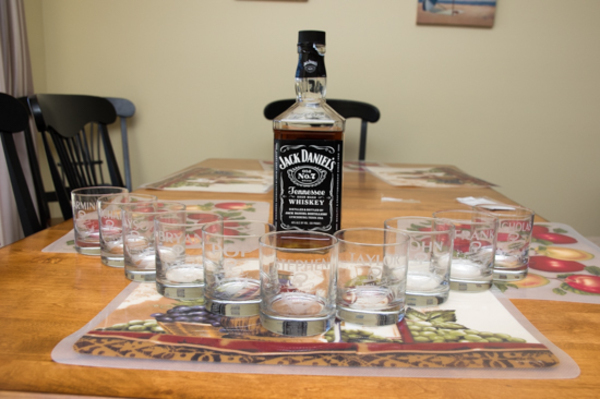 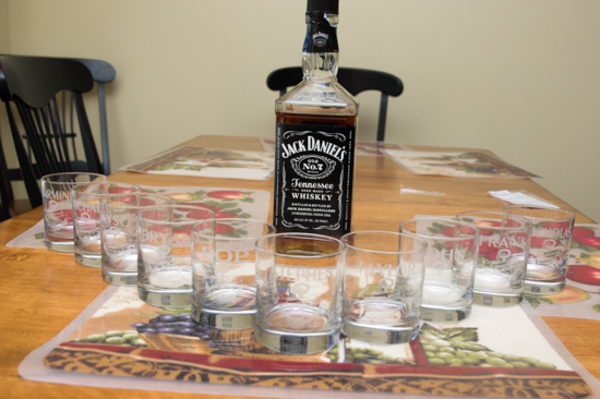 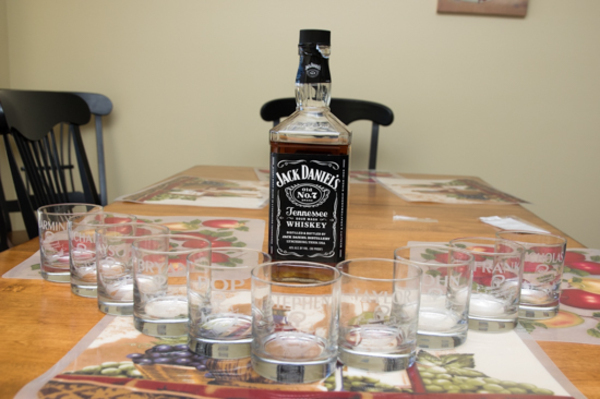 It was now time to celebrate! Prior to the reception Larissa and Stephen the opportunity to pose for some portraits outside with our NJ Wedding Photographer. 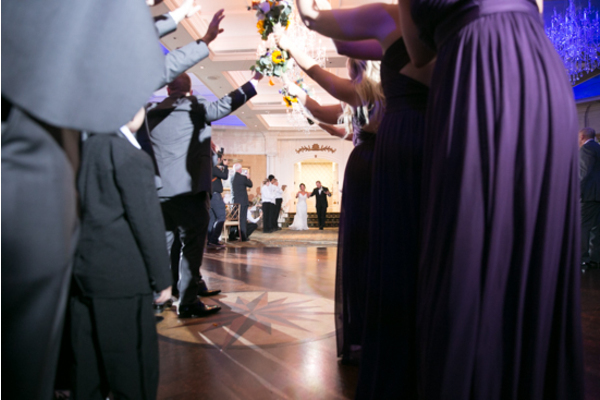 Moving the celebration indoors, guests cheered as the newlyweds made their grand entrance. 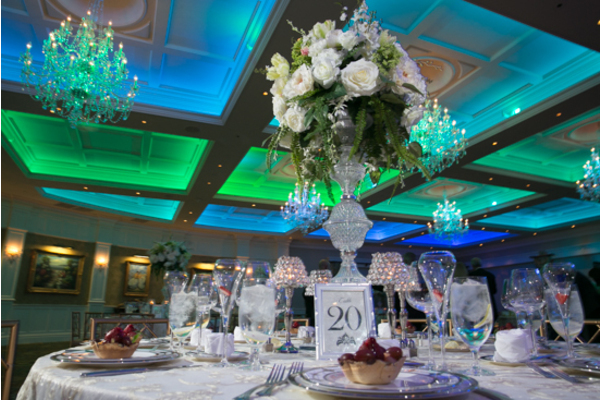 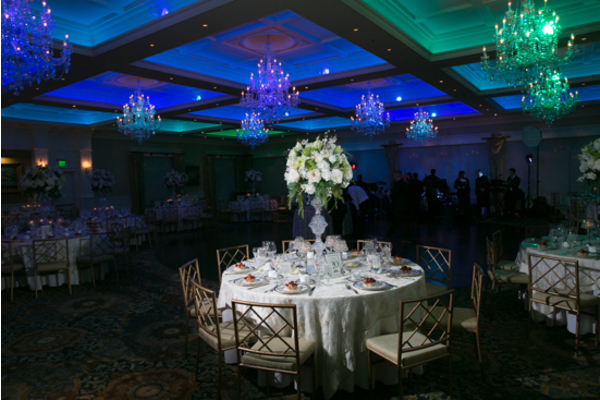 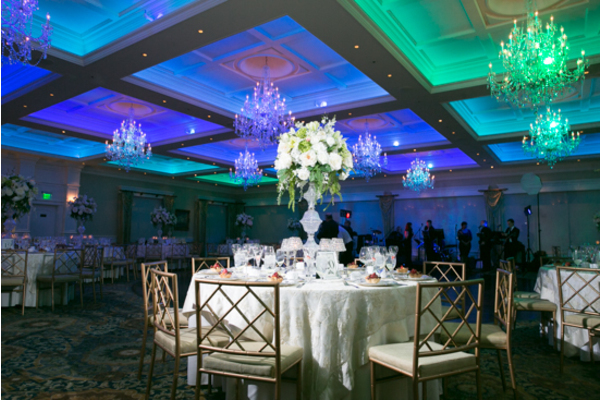 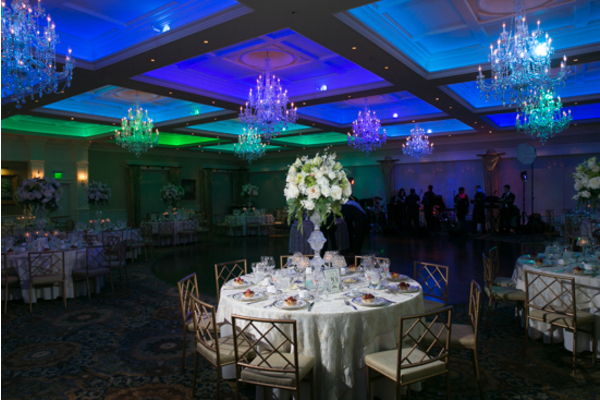 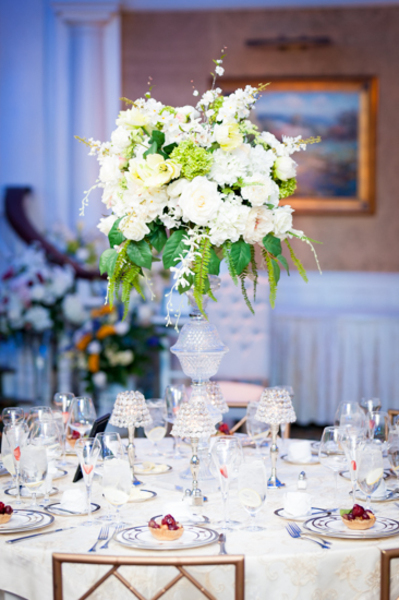 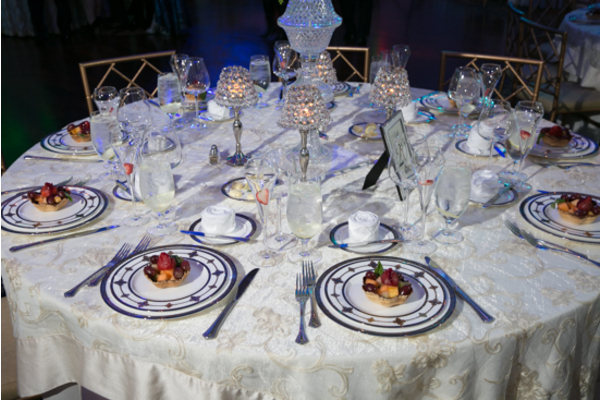 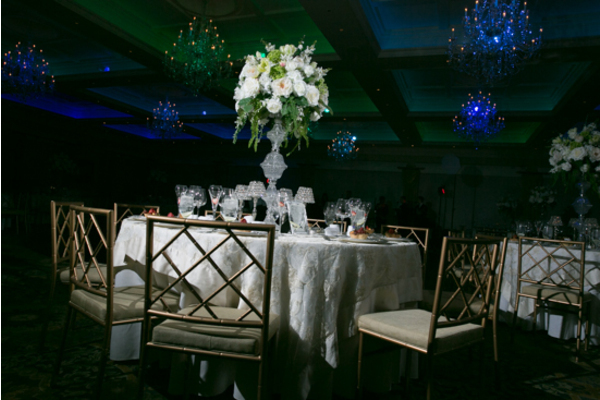 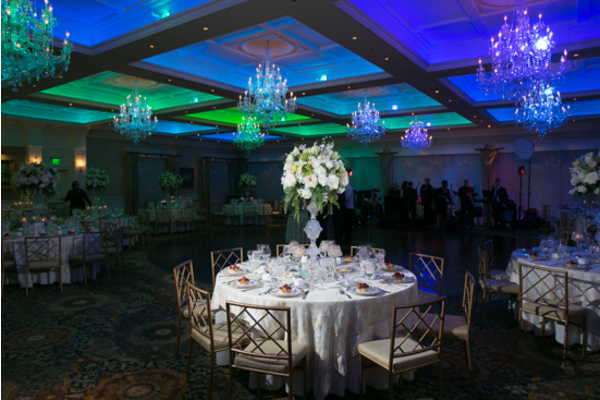 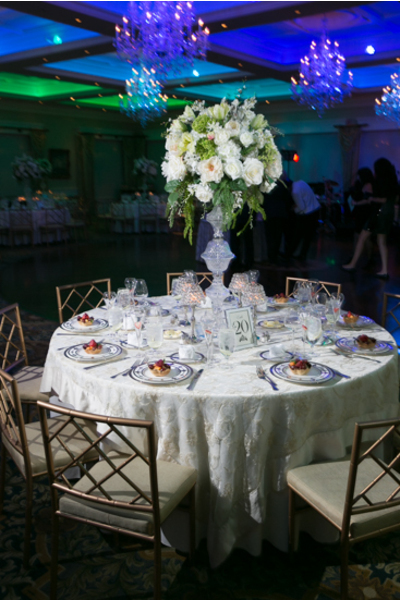 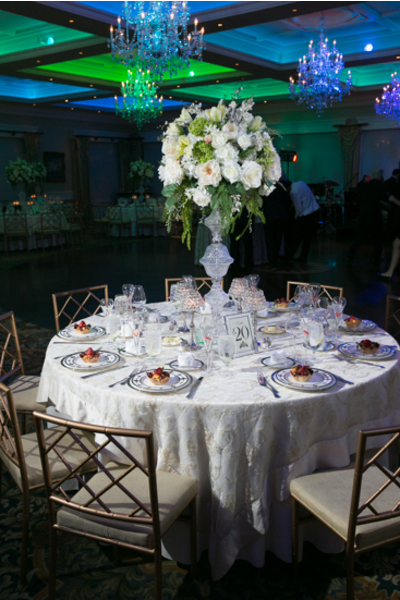 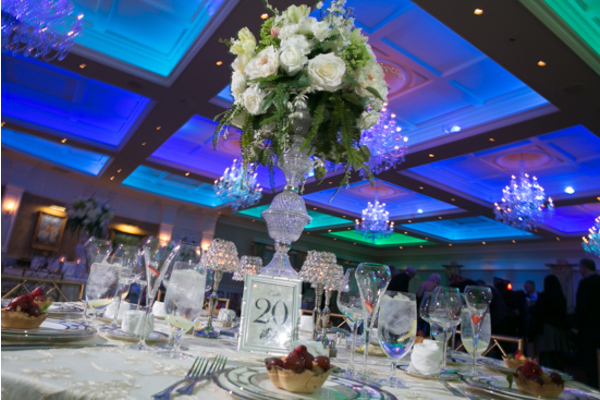 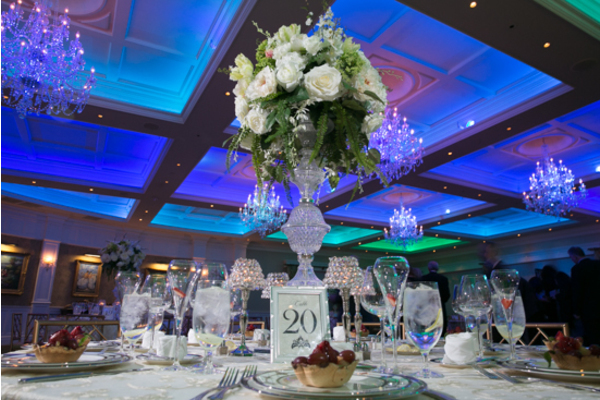 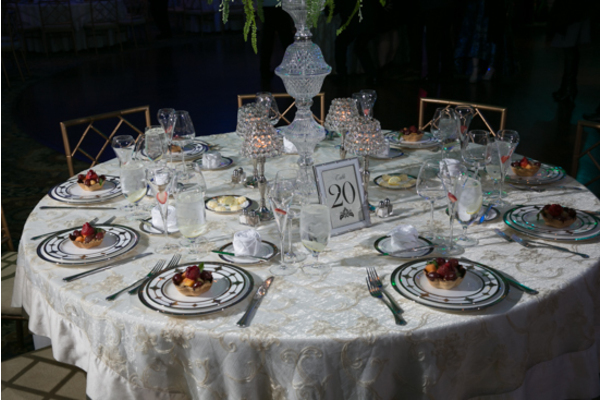 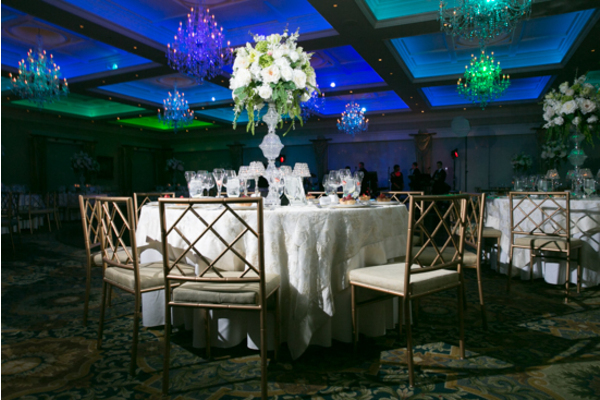 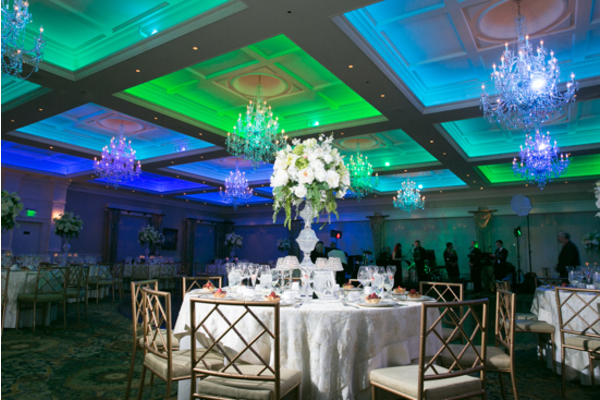 The ballroom was filled with chandeliers and beautiful lights, each table decorated with elegant glass centerpieces filled with white roses. 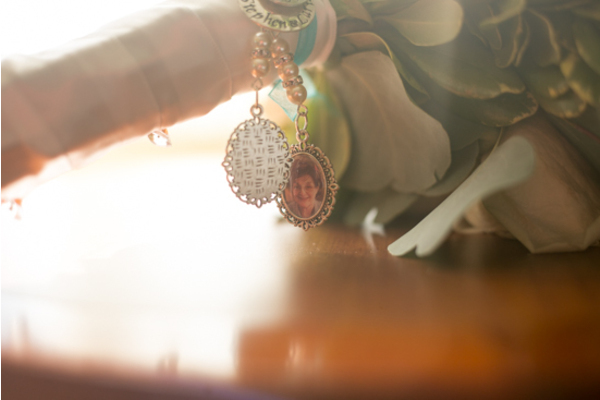 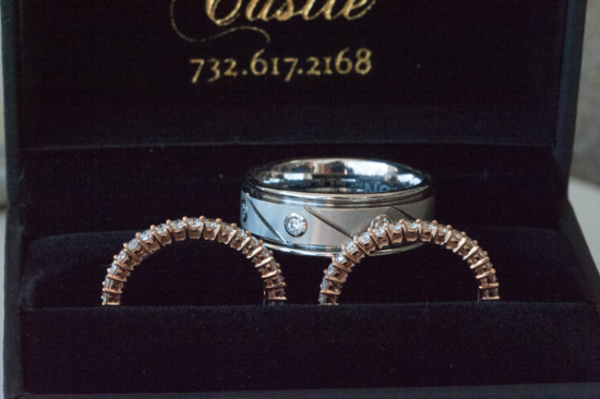 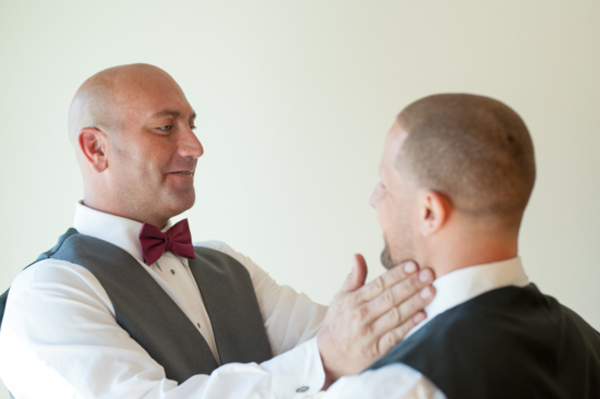 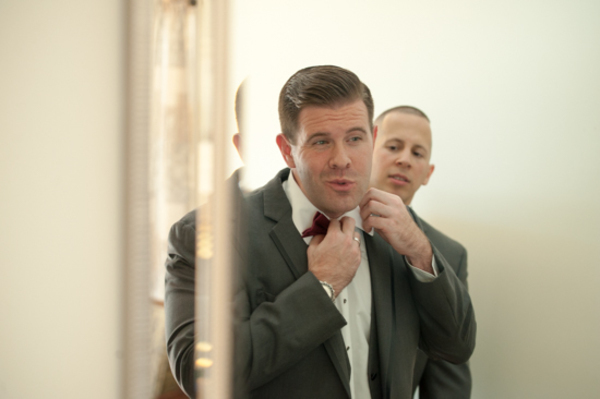 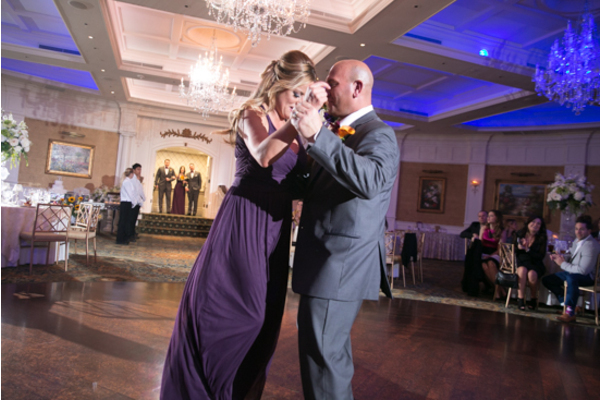 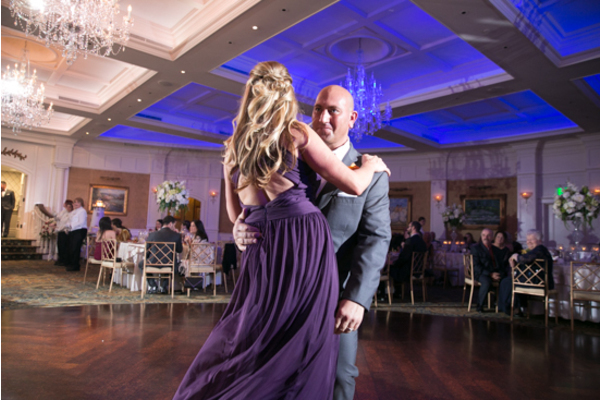 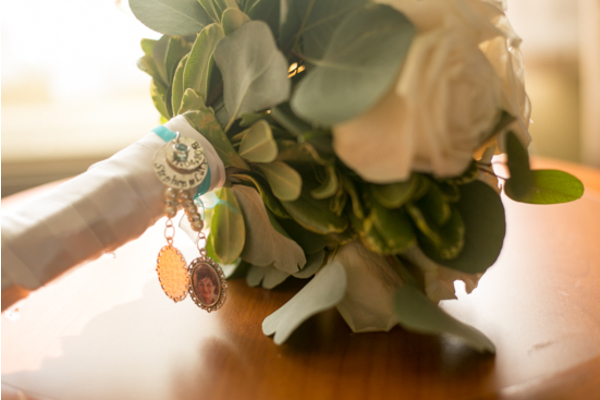 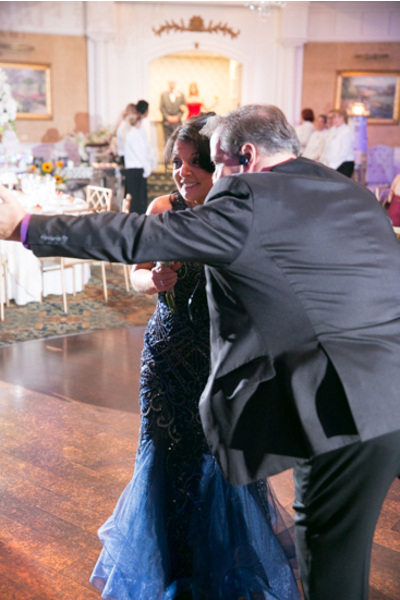 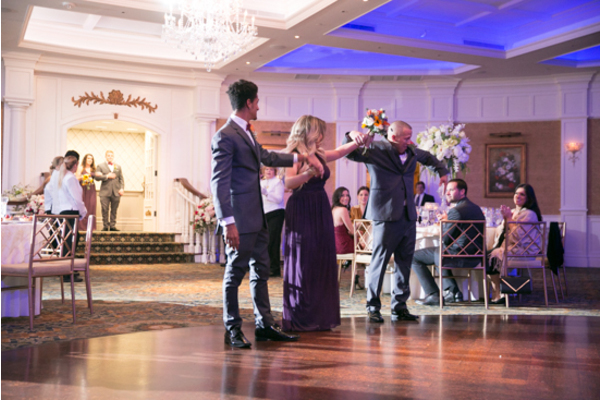 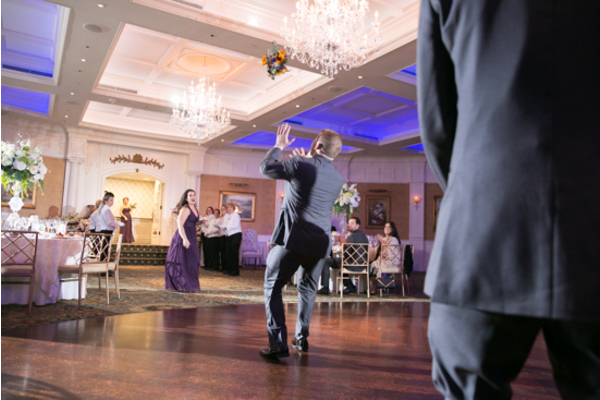 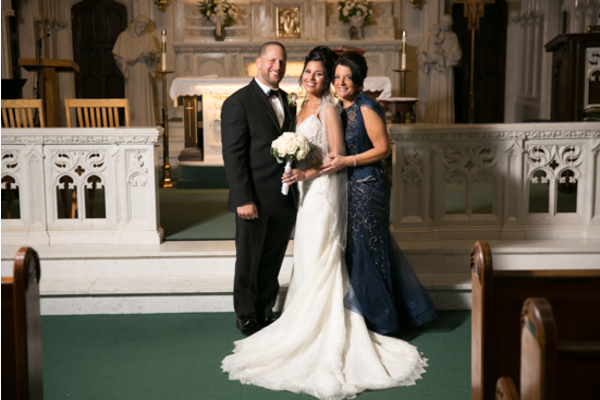 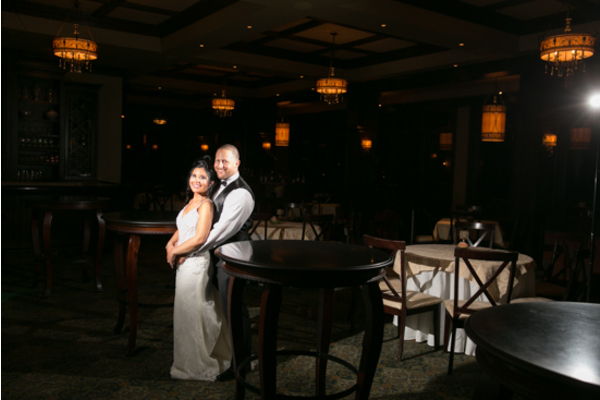 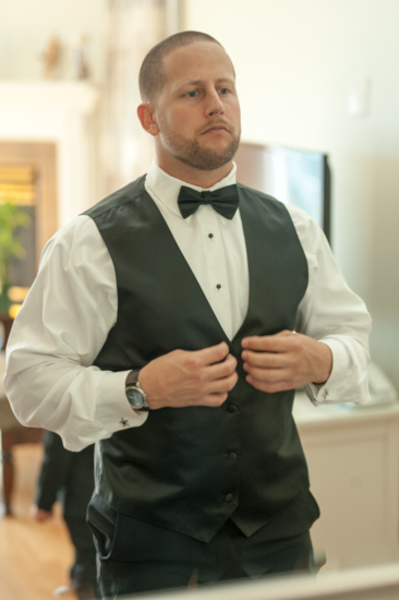 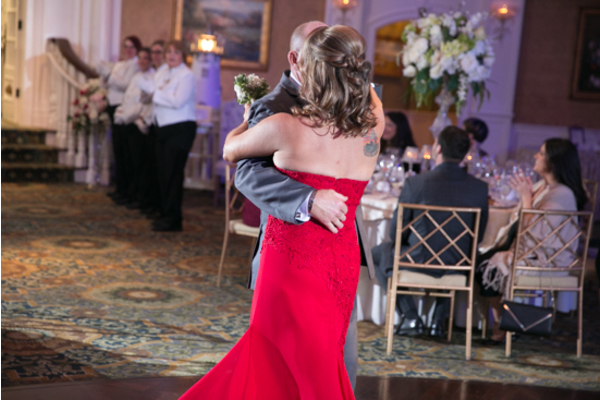 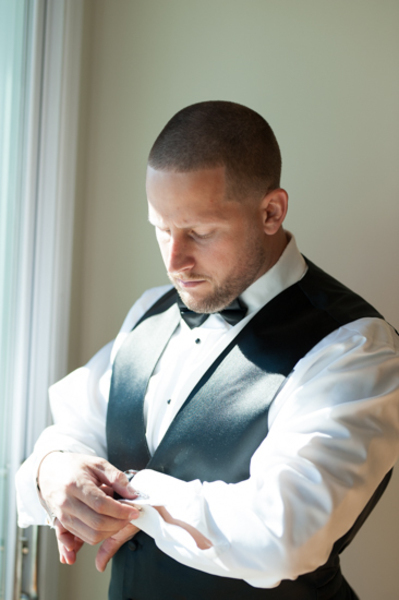 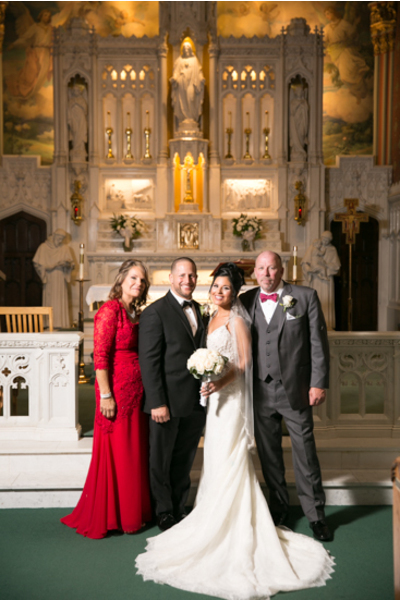 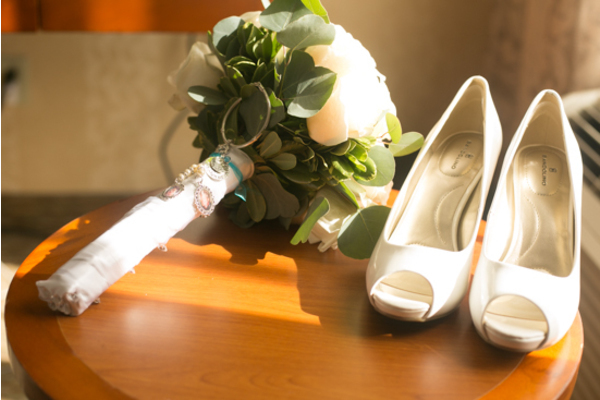 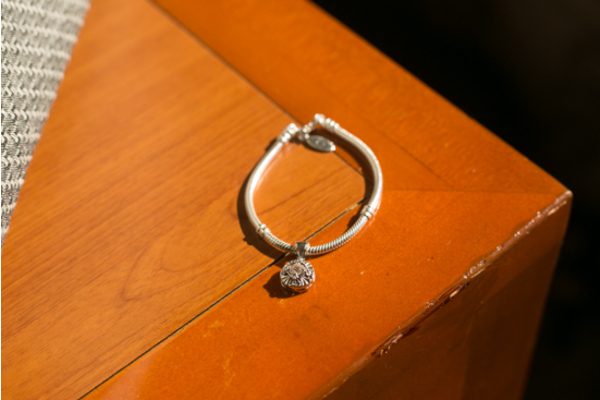 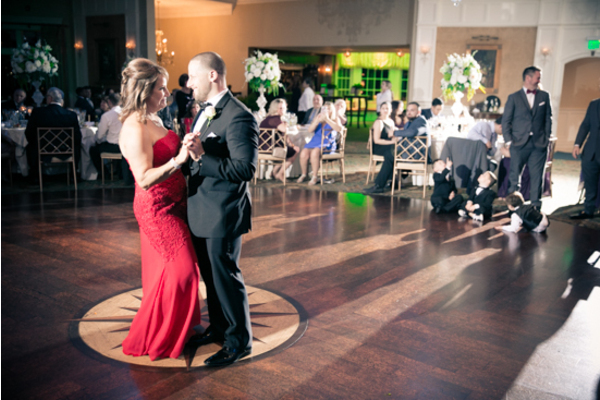 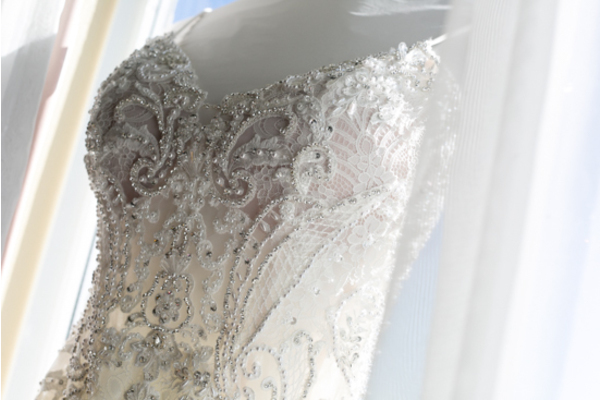 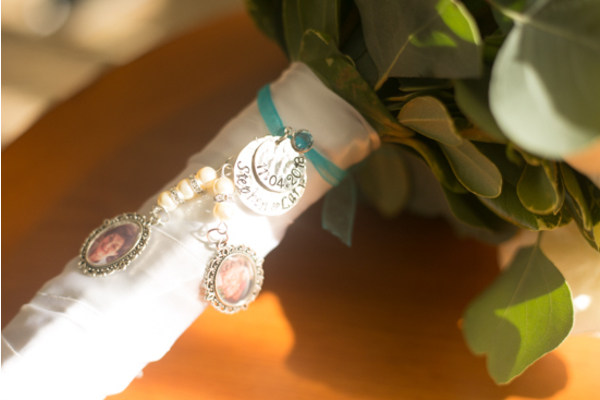 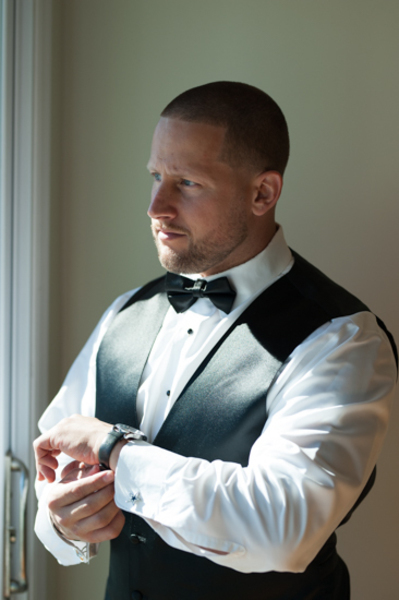 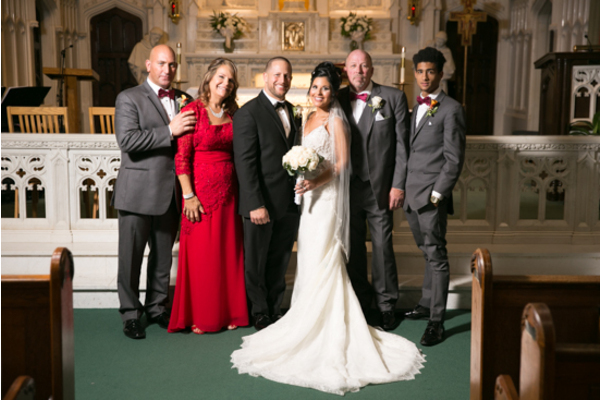 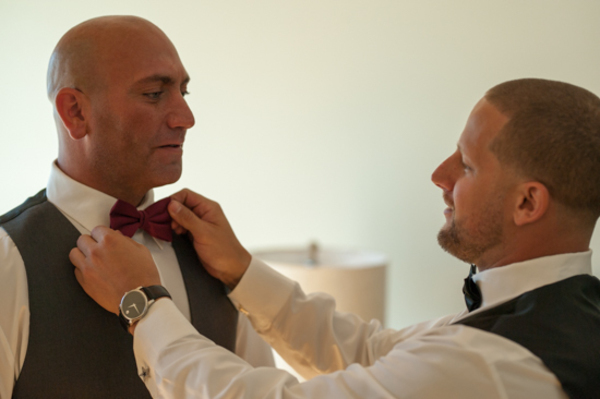 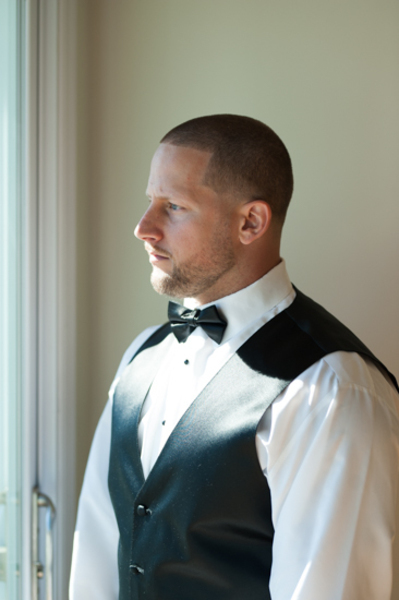 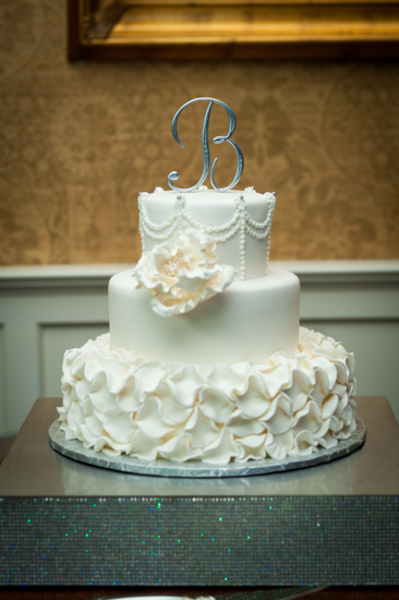 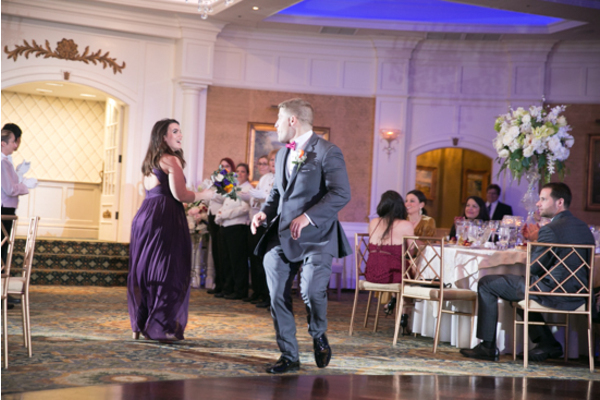 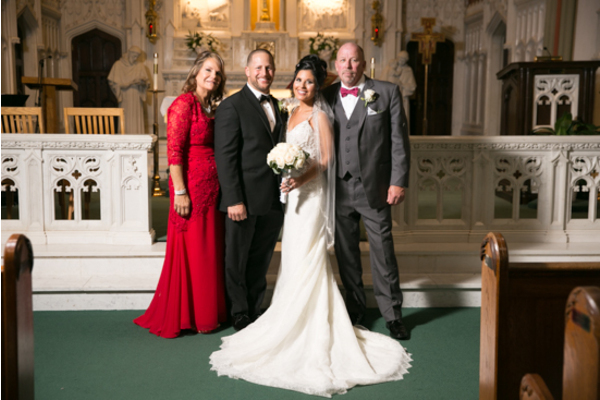 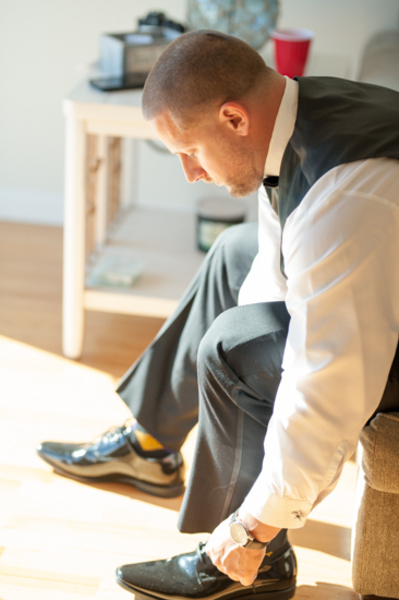 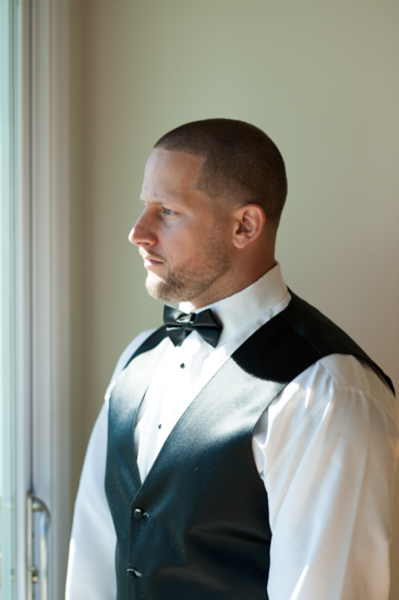 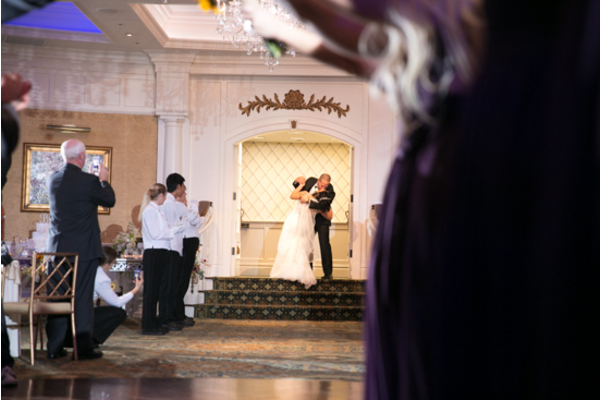 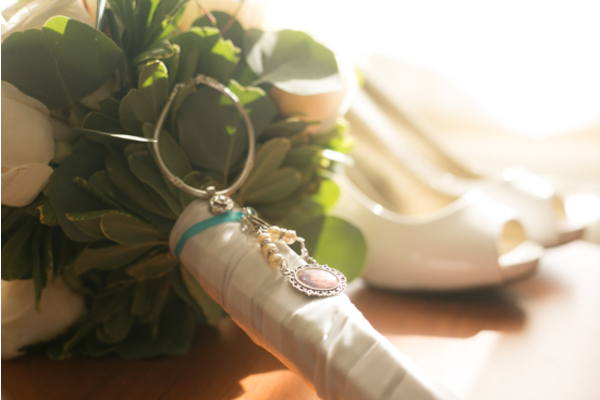 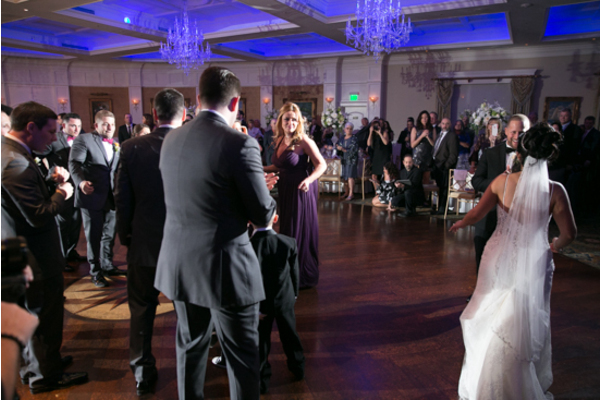 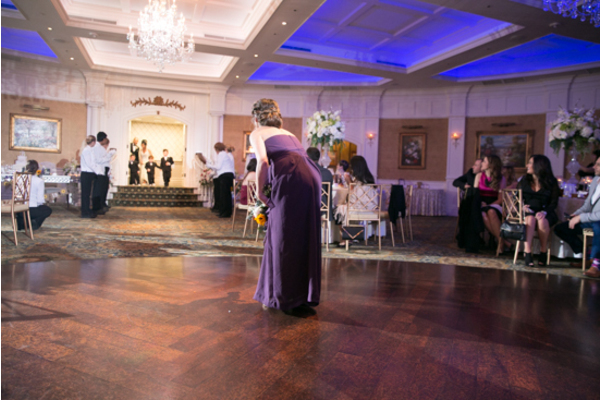 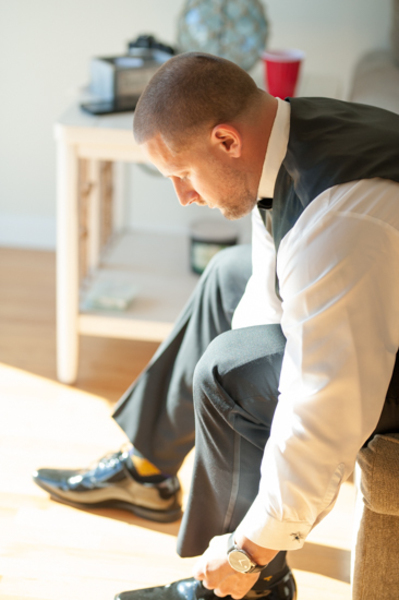 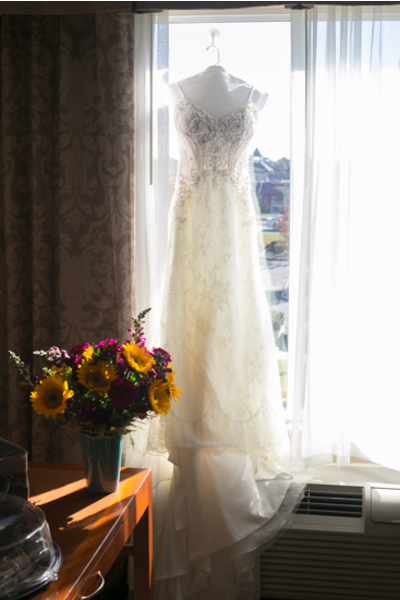 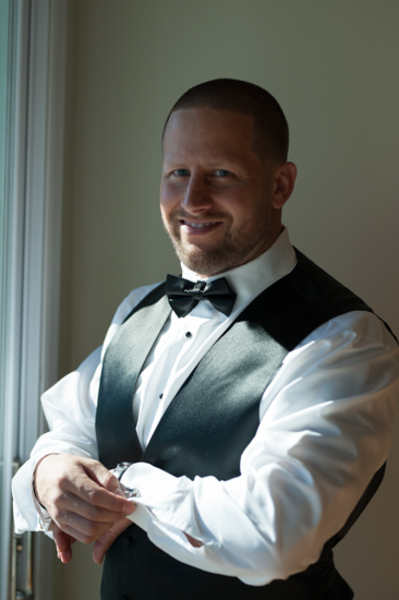 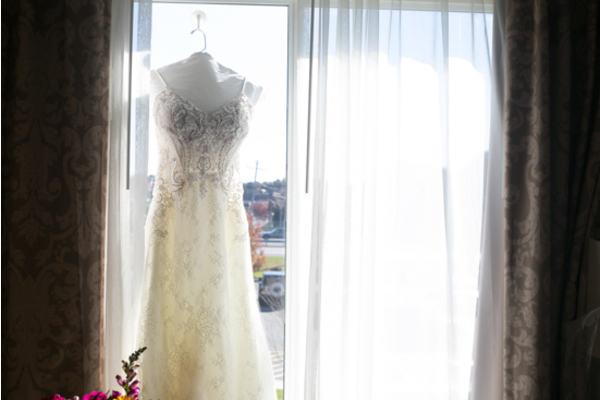 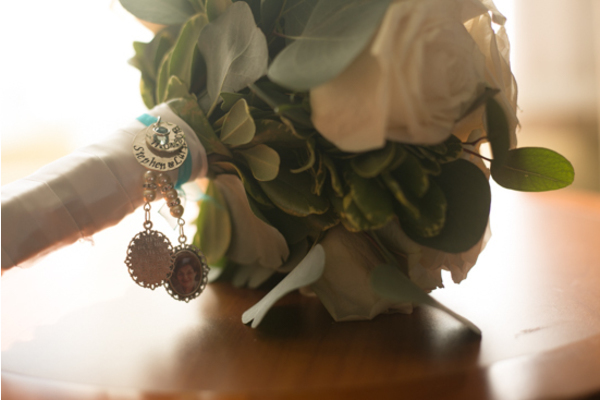 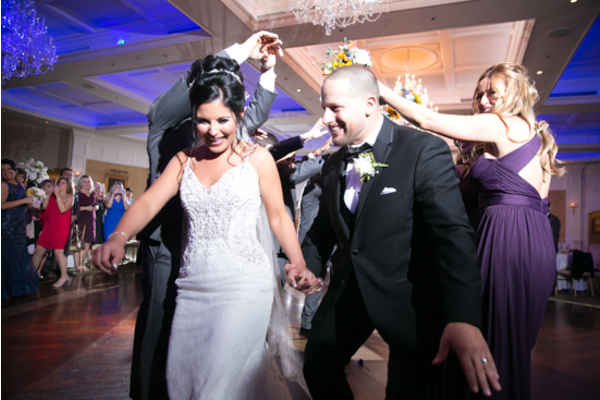 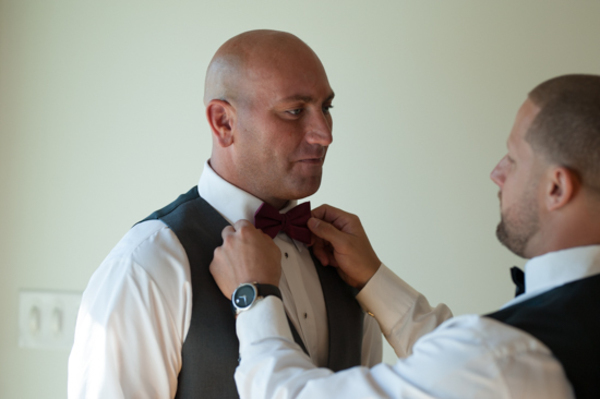 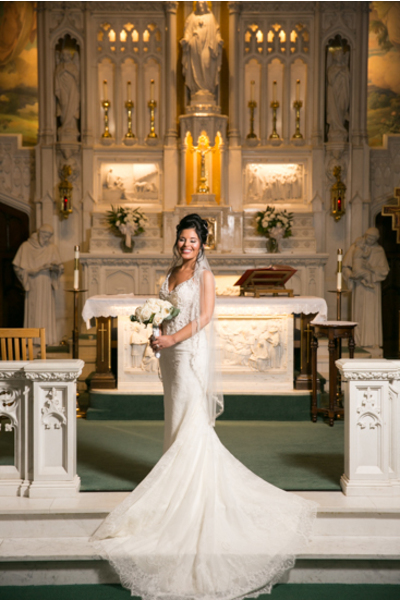 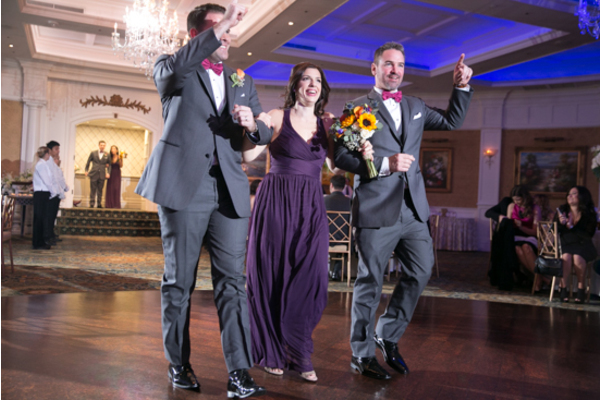 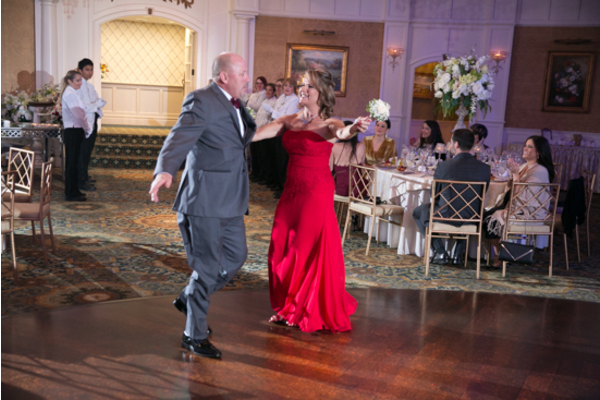 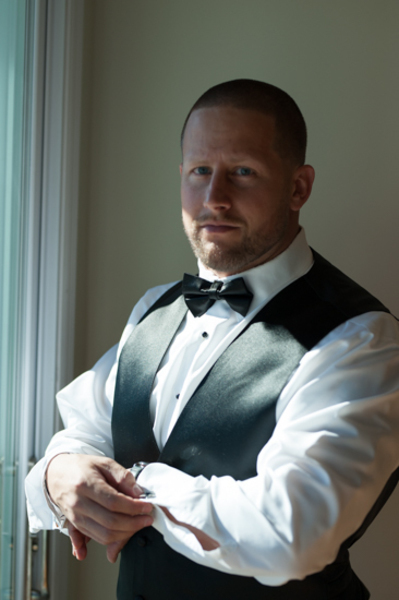 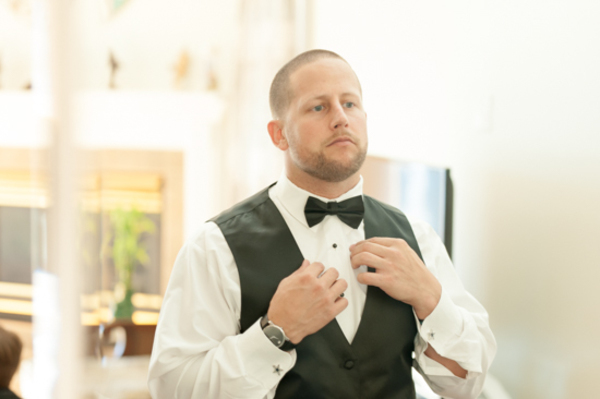 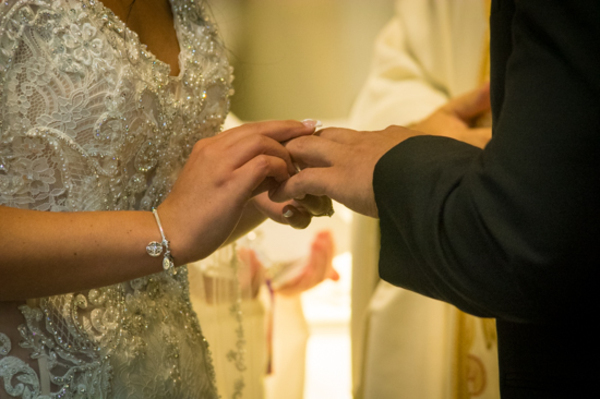 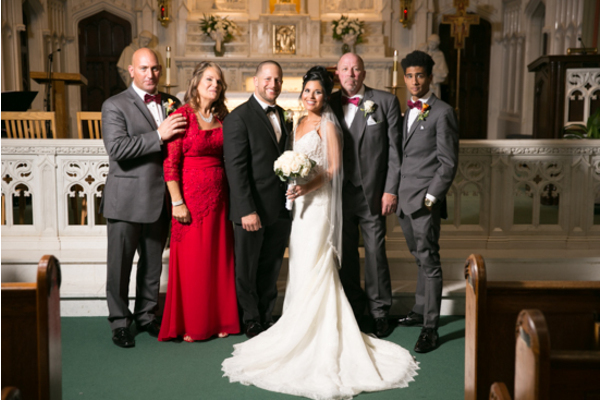 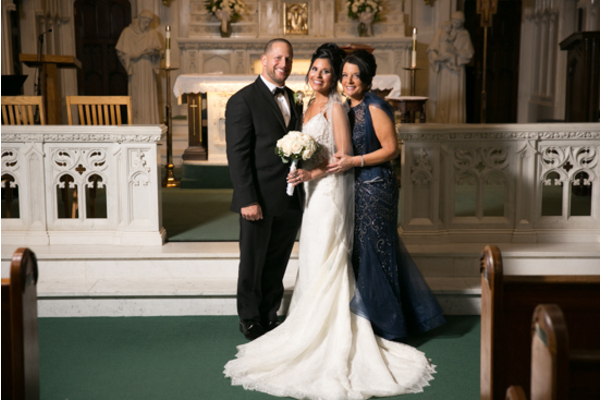 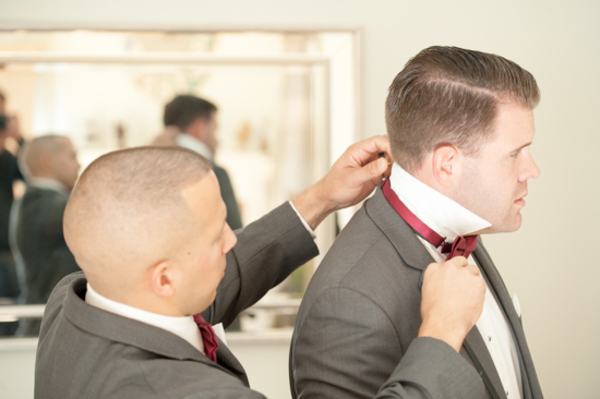 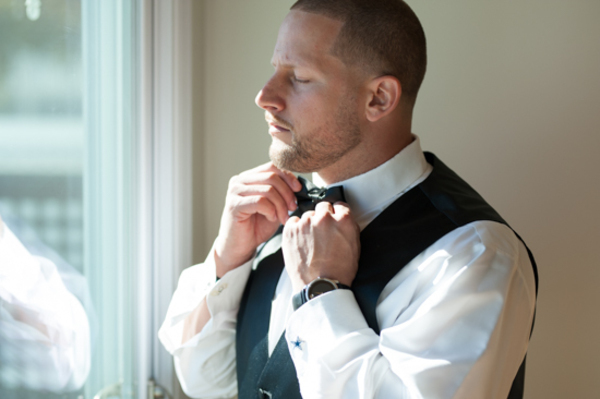 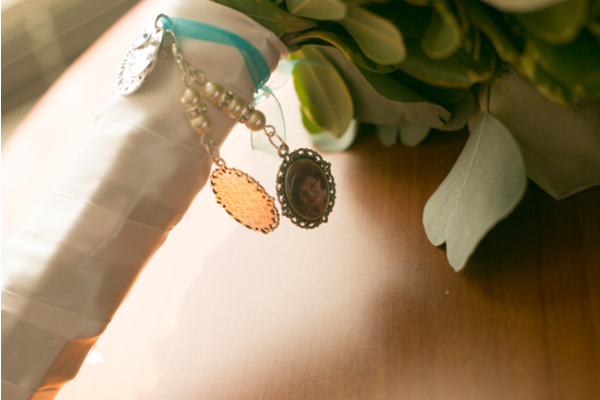 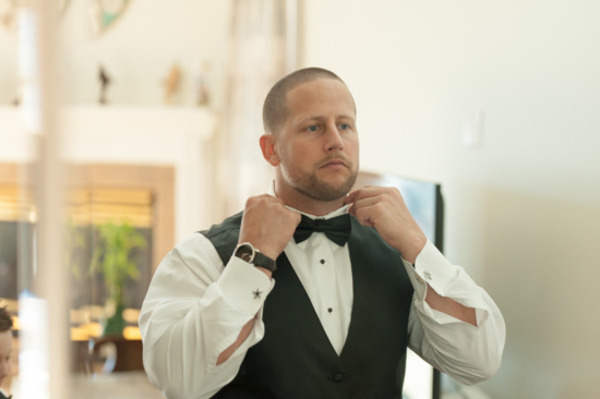 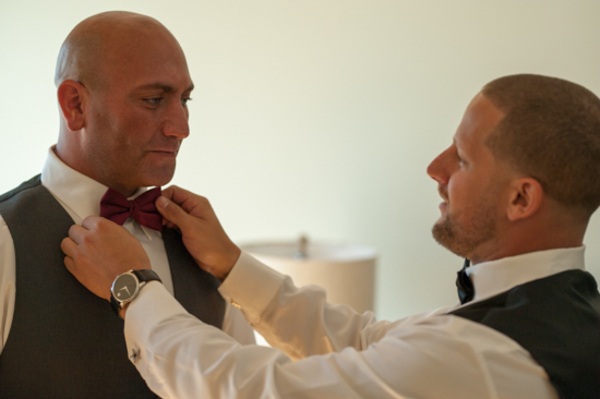 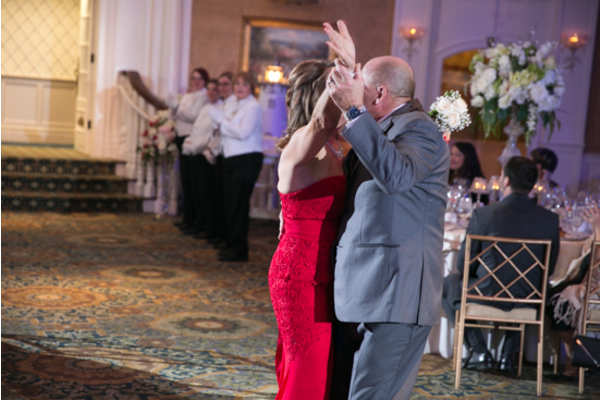 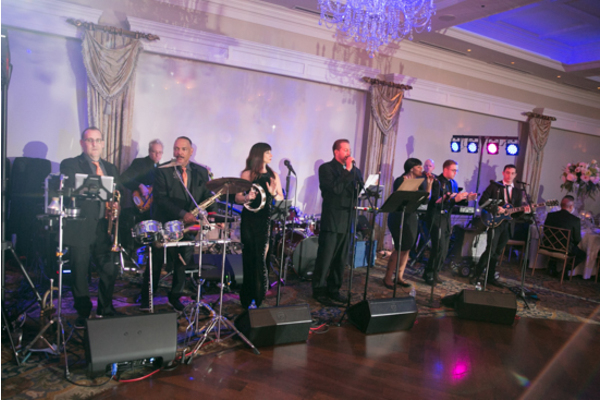 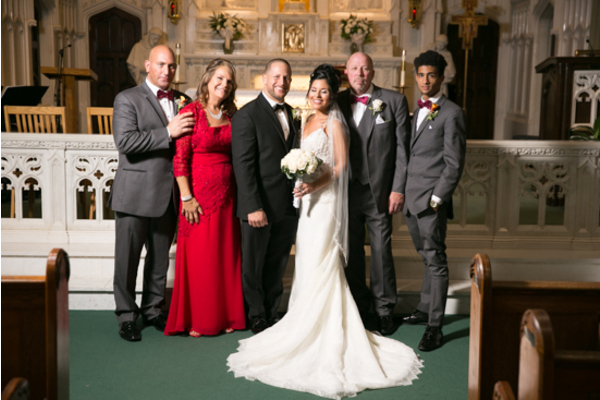 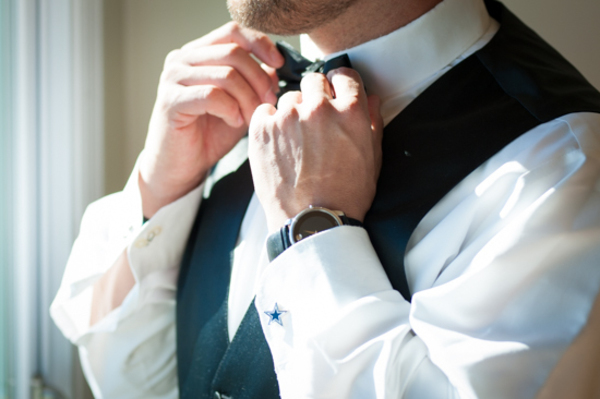 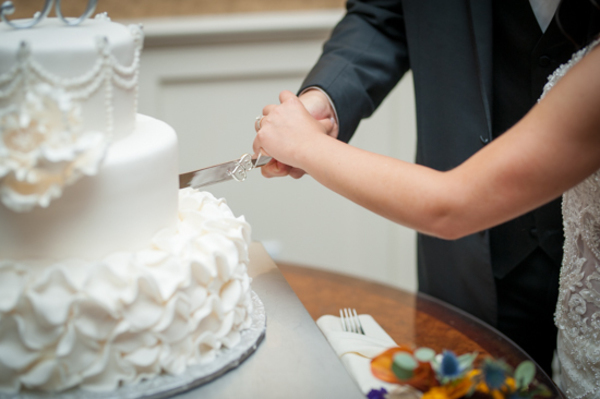 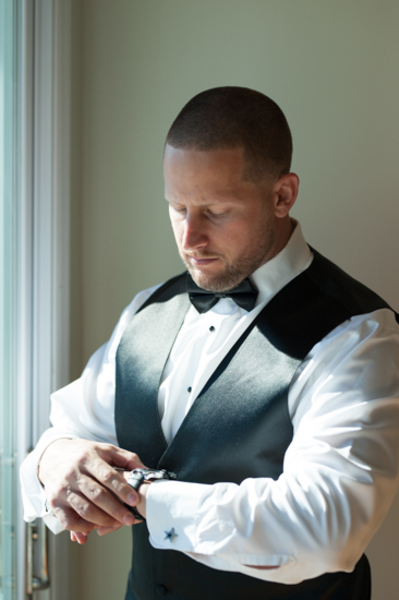 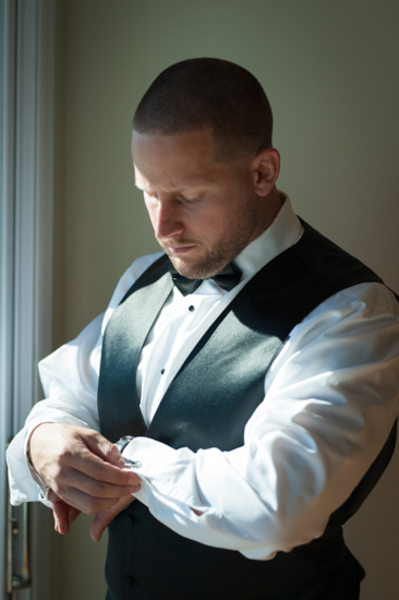 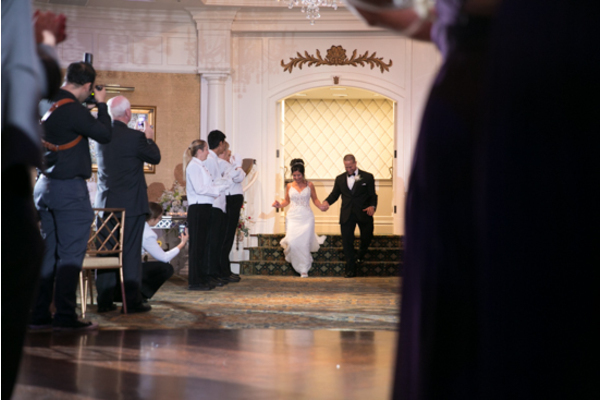 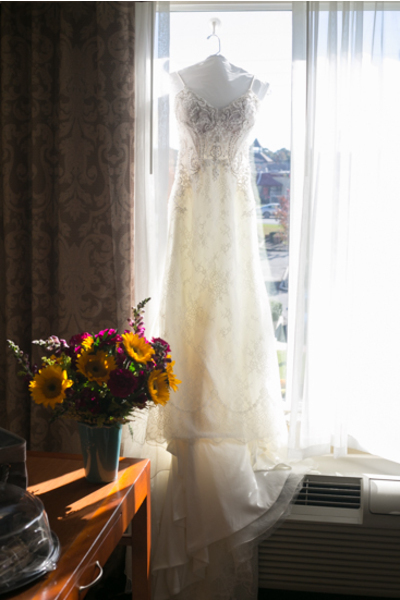 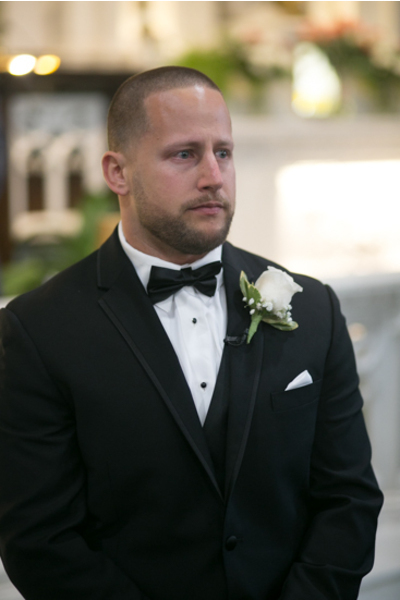 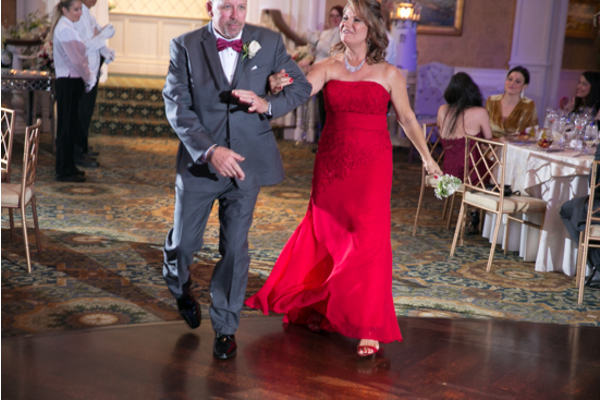 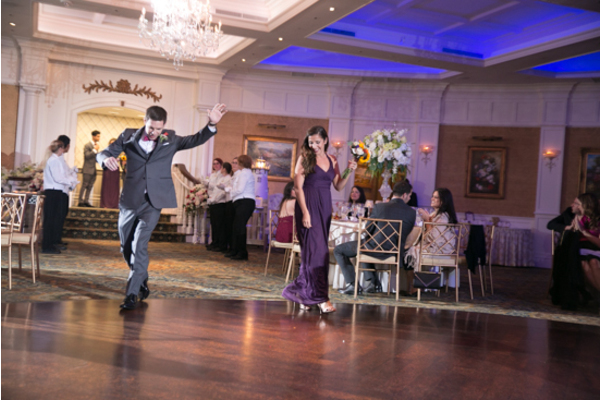 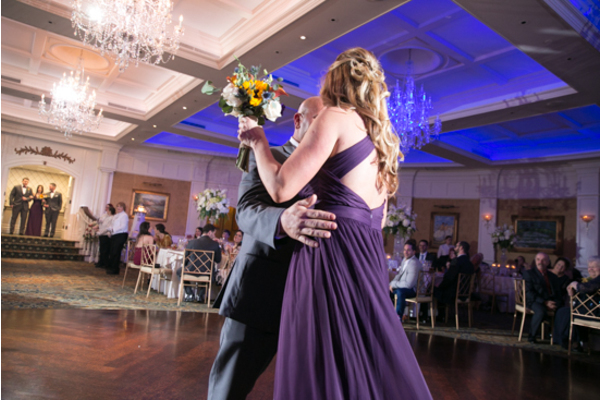 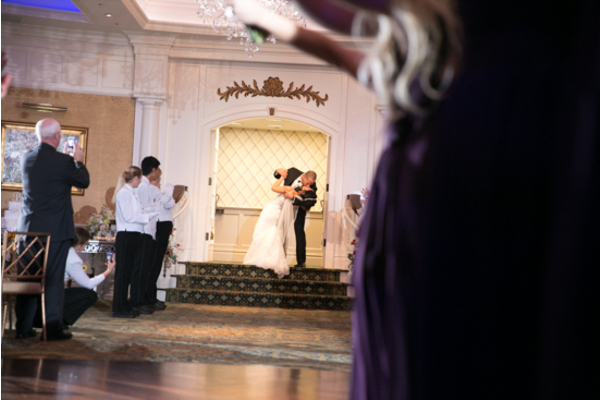 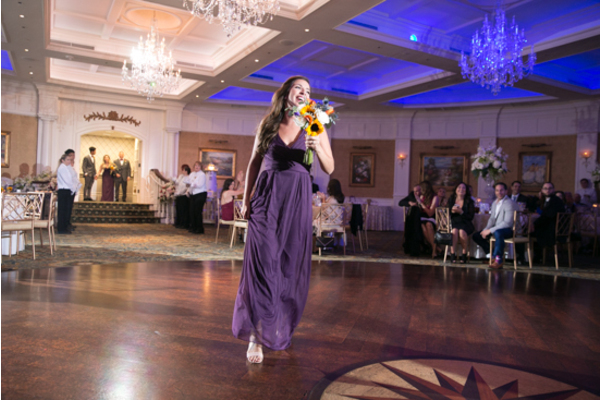 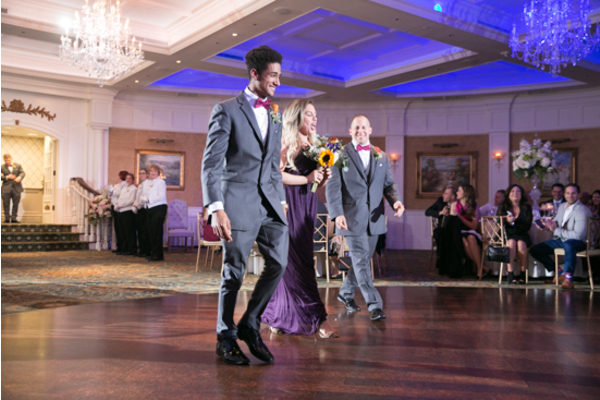 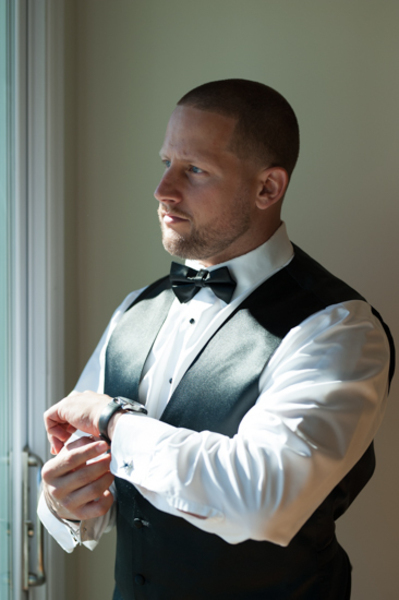 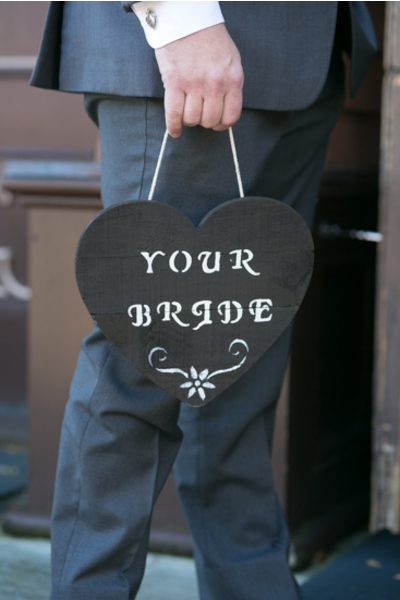 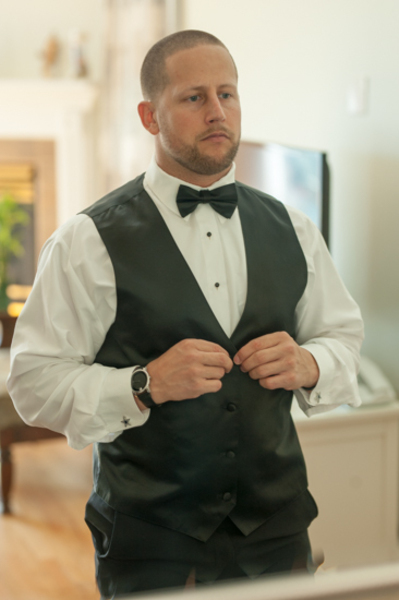 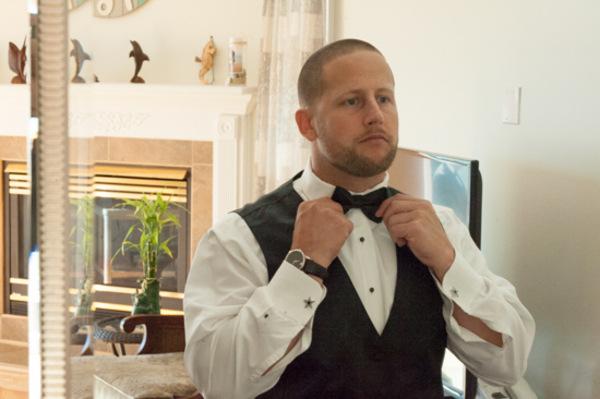 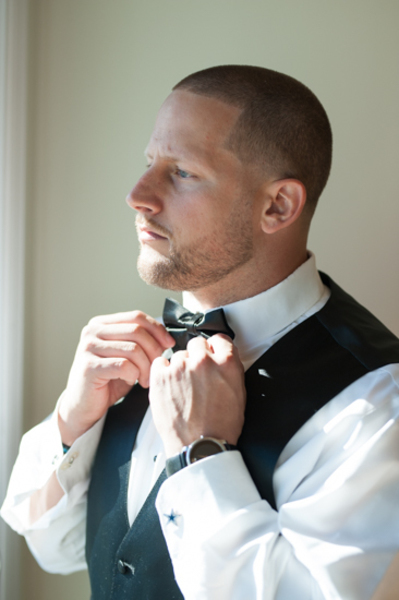 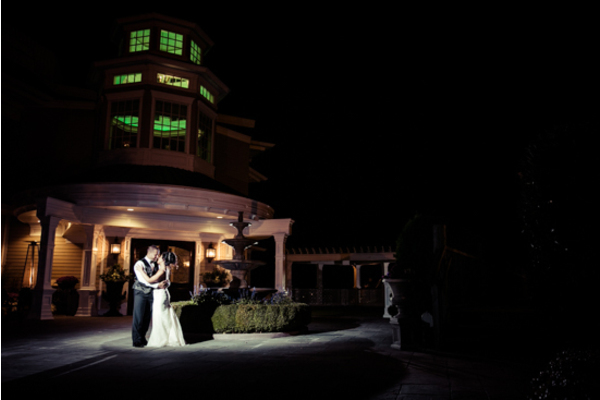 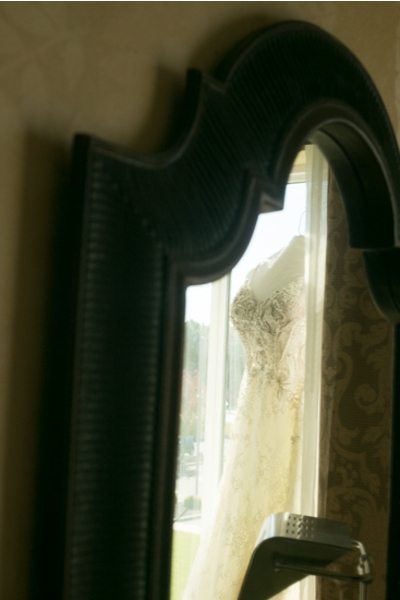 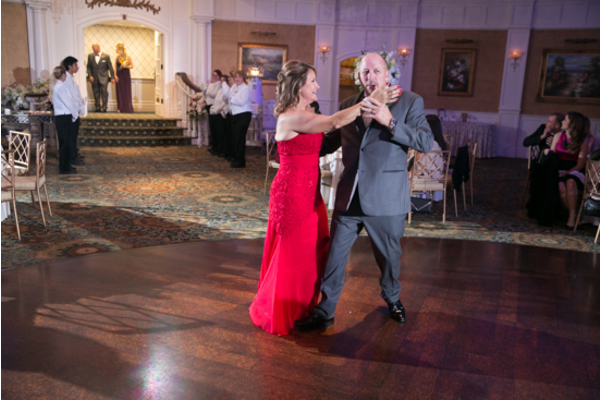 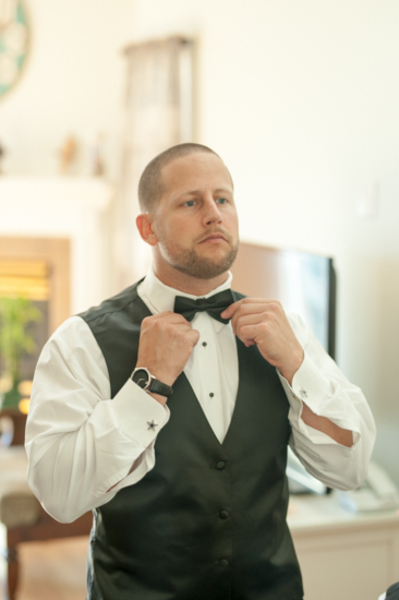 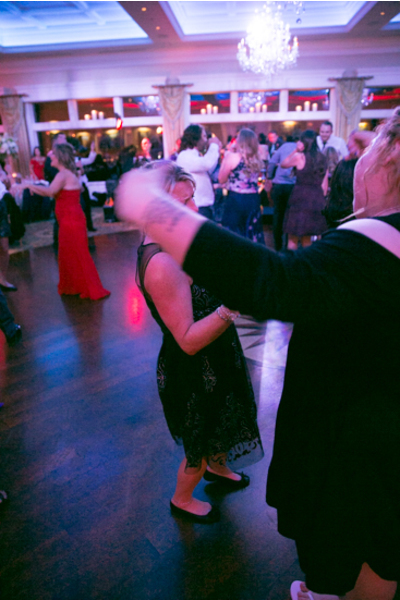 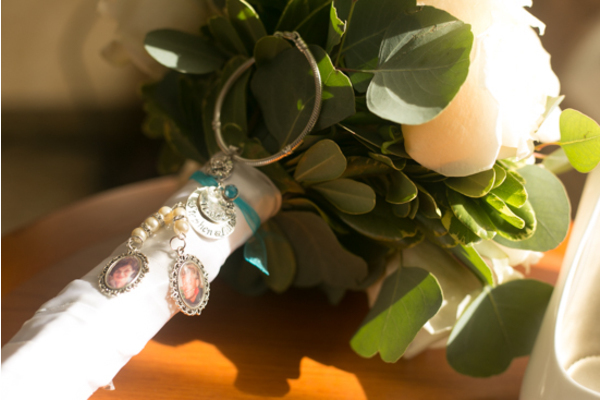 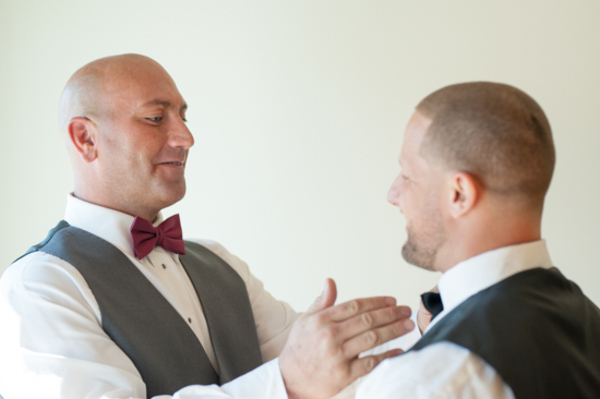 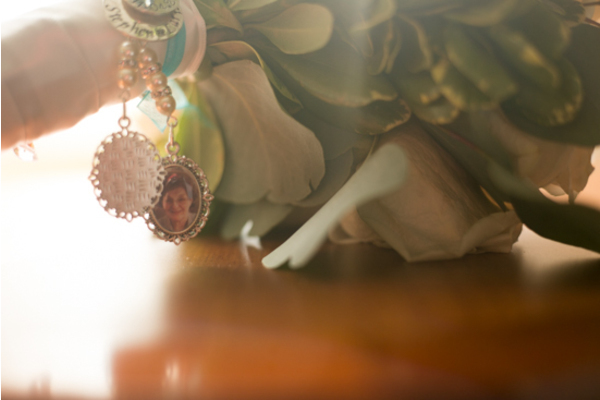 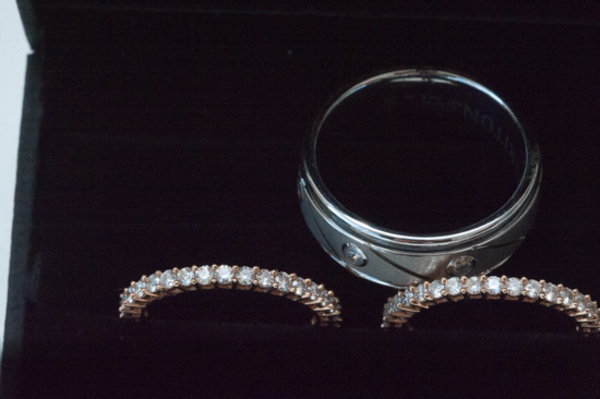 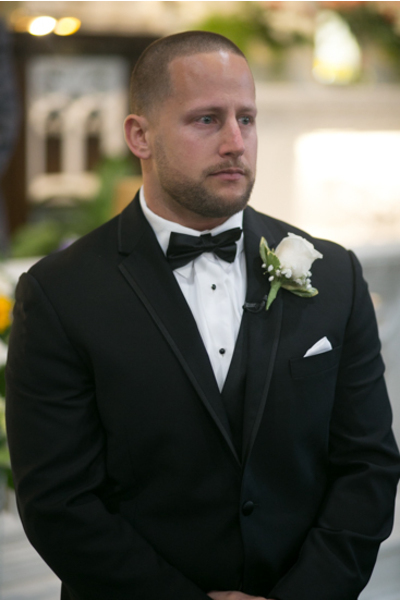 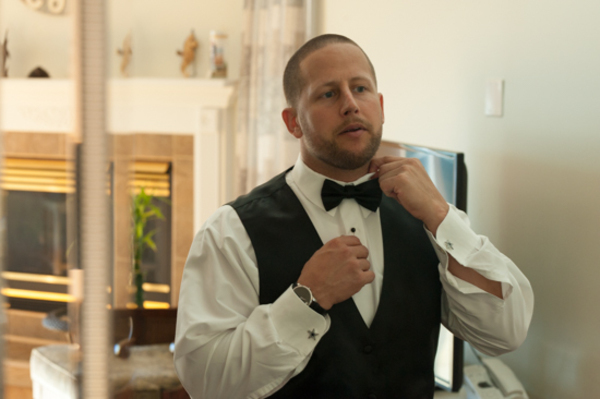 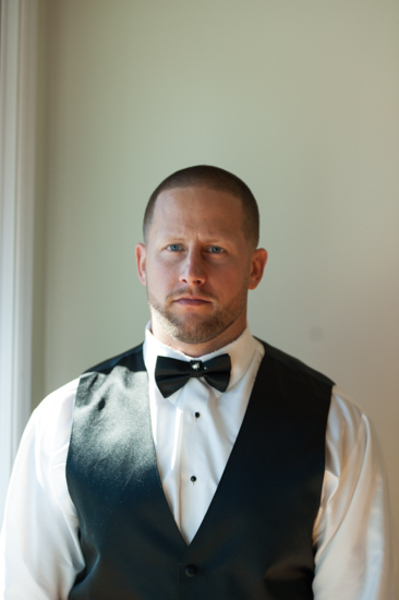 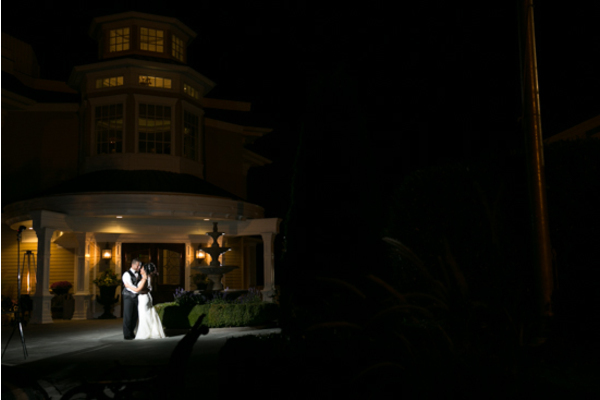 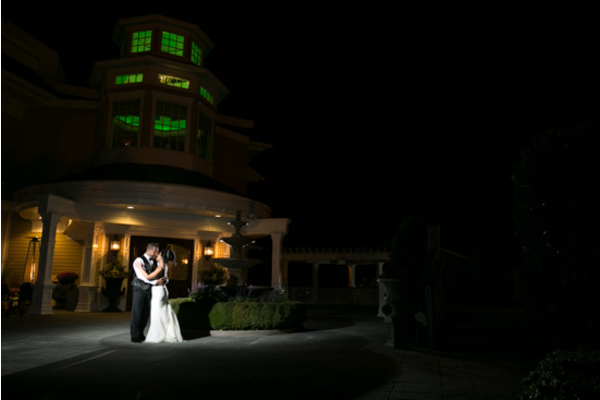 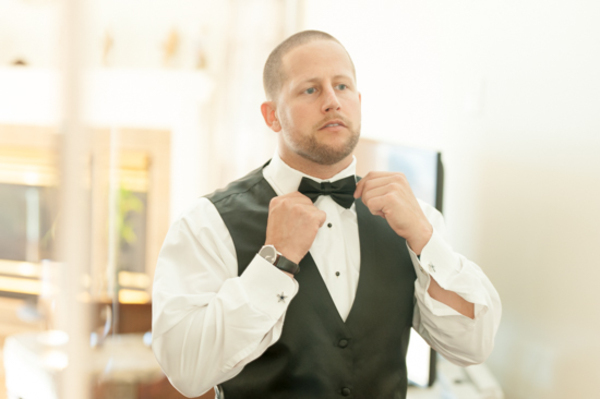 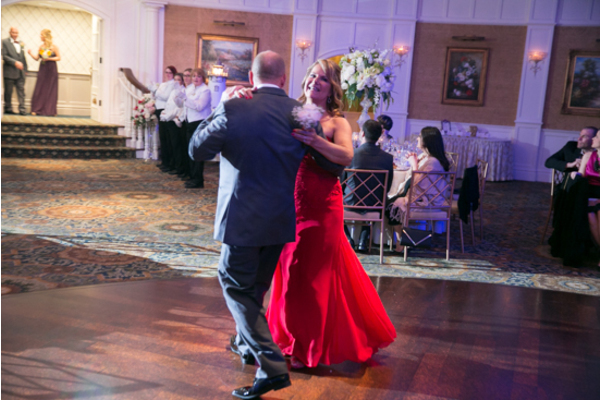 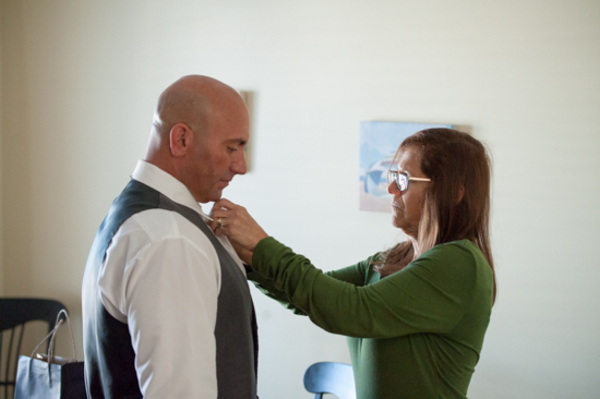 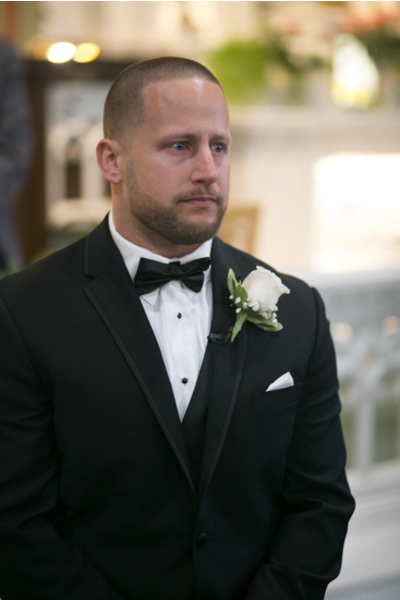 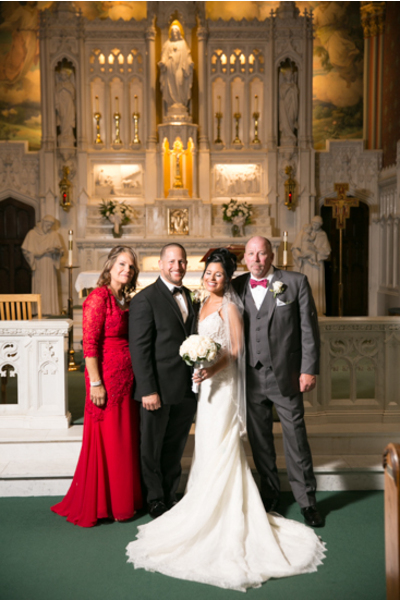 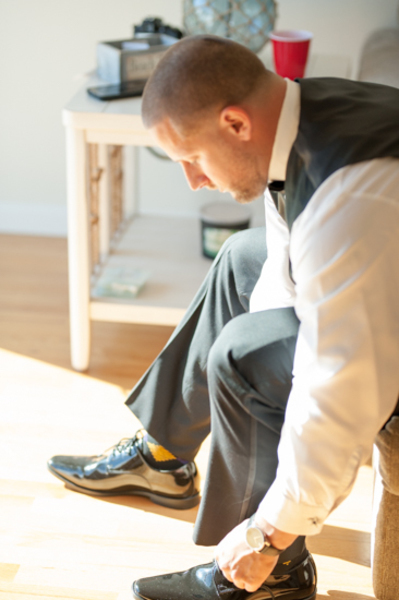 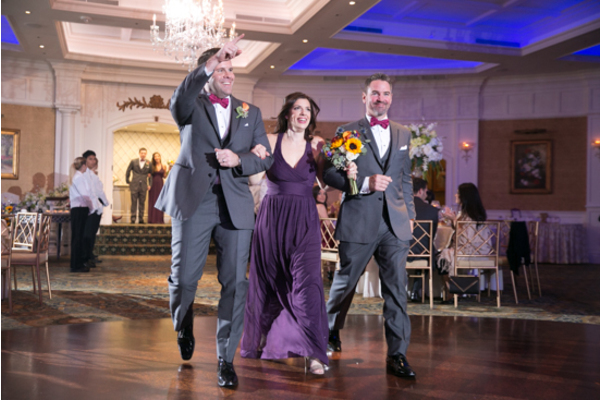 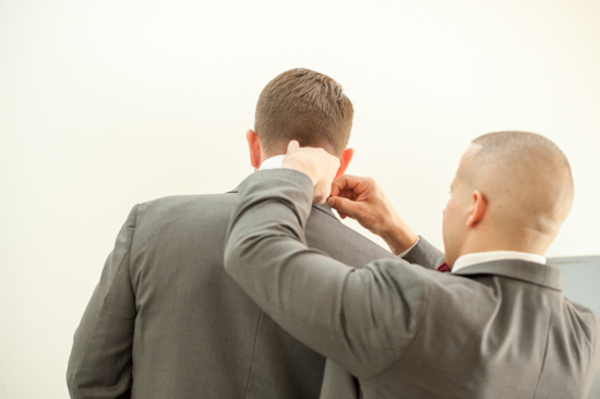 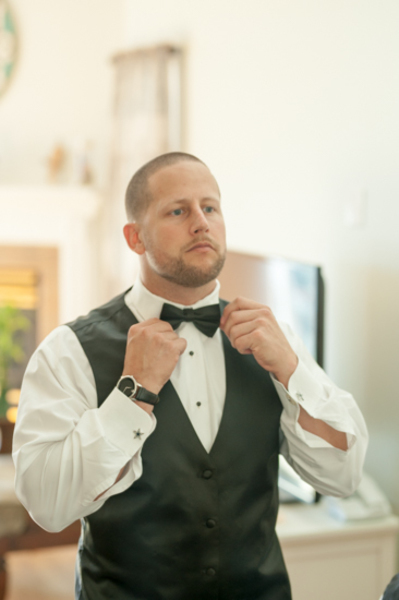 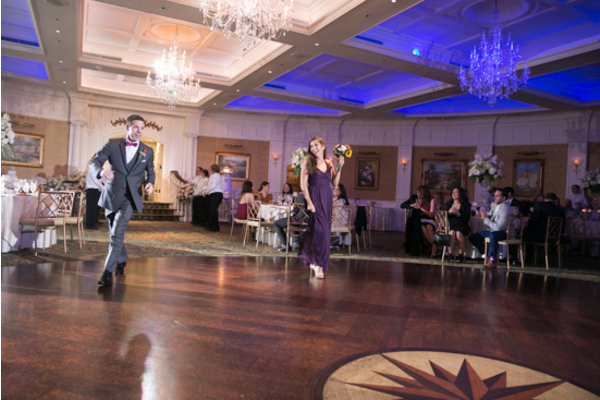 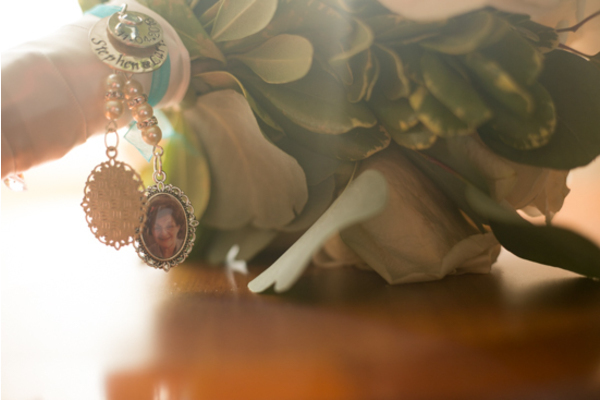 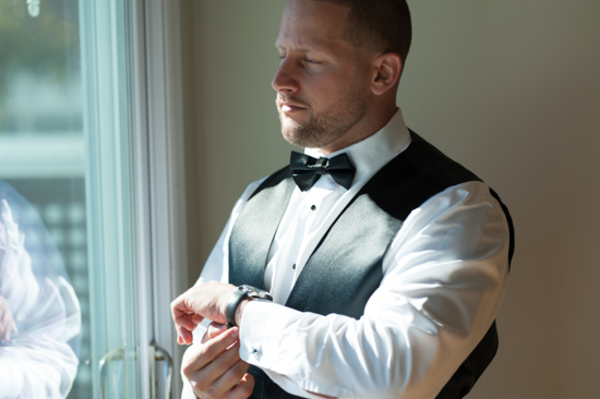 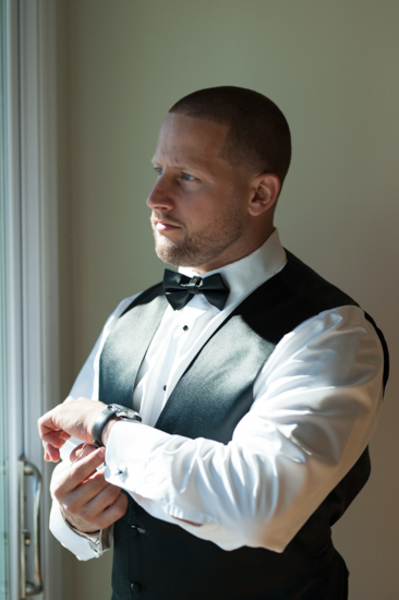 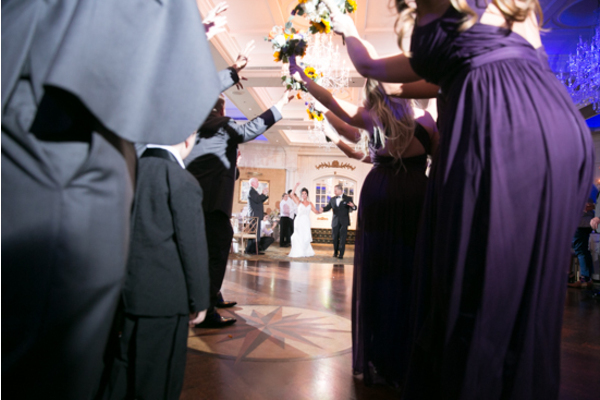 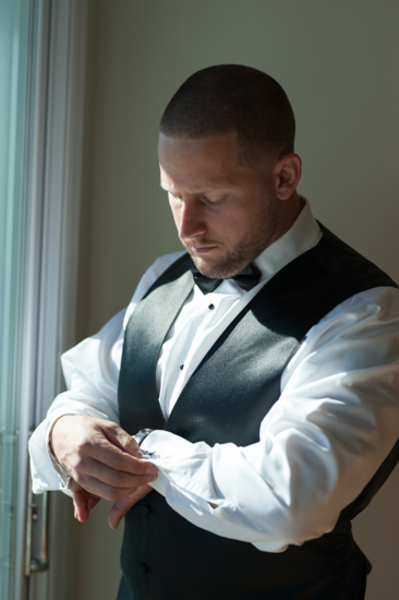 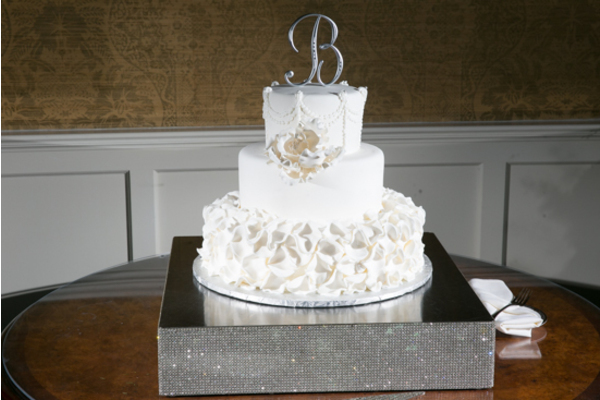 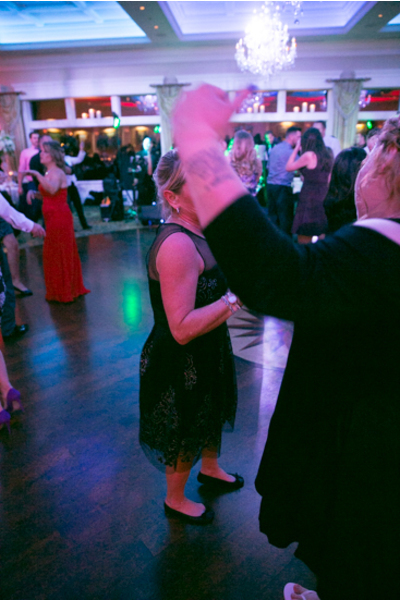 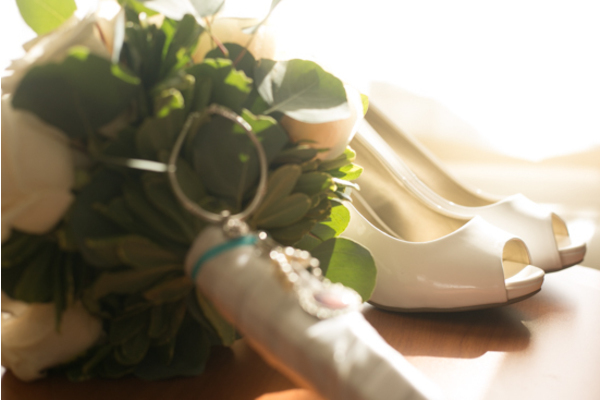 Our NJ Wedding Photographer was there as the couple shared their first dance together as newlyweds. 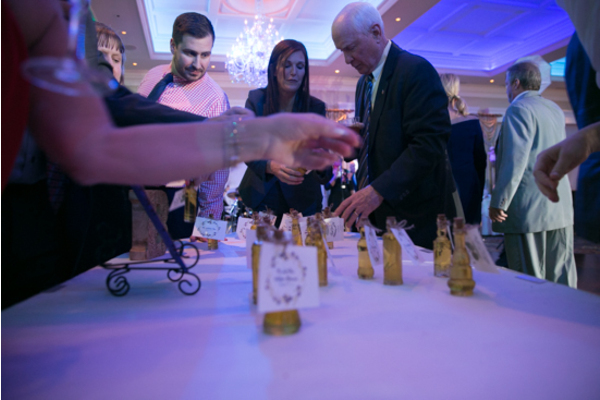 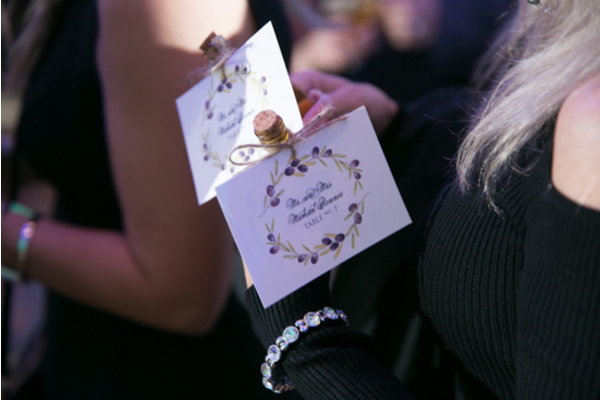 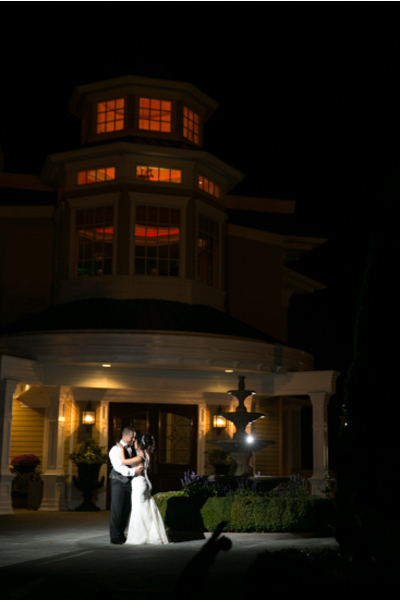 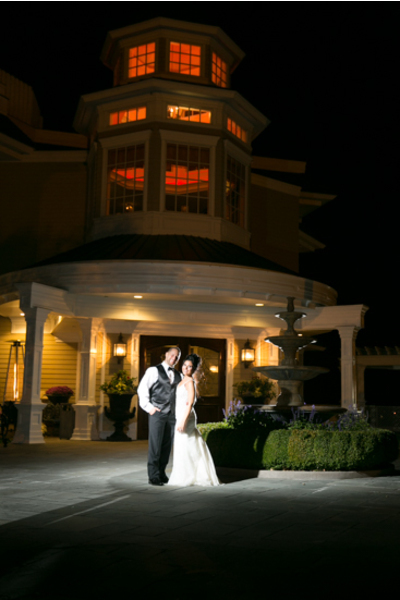 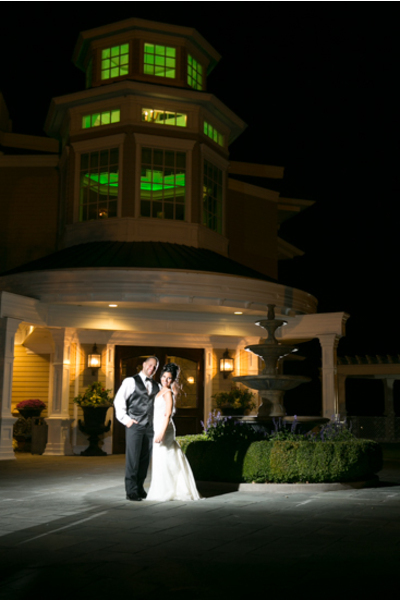 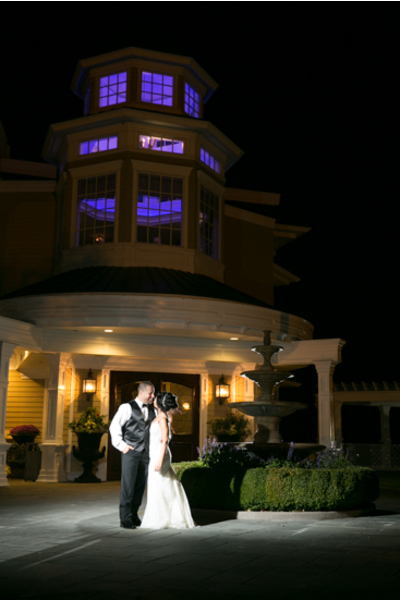 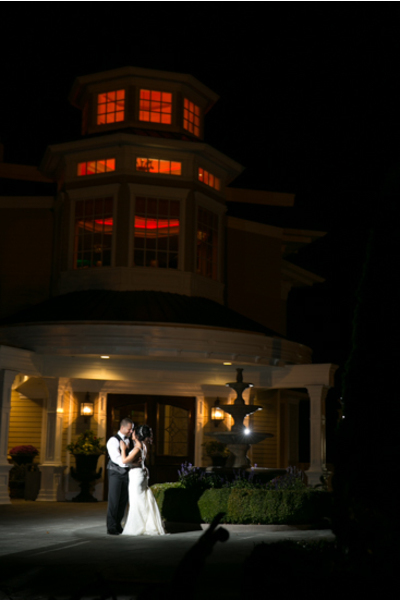 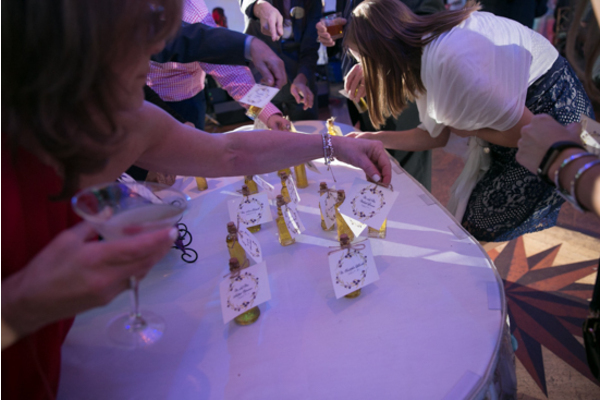 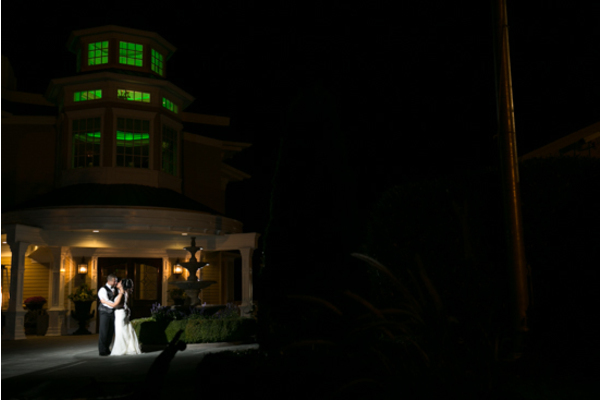 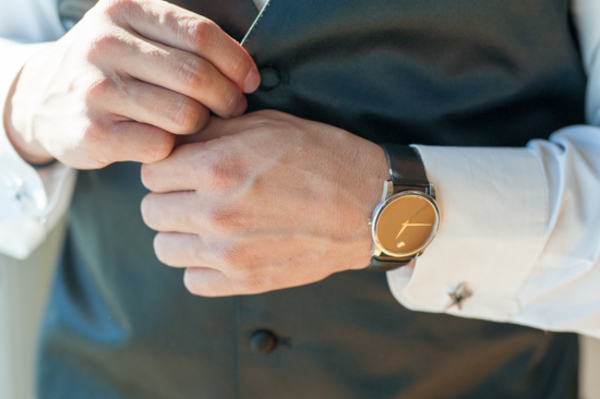 From the speeches to the dancing this couple didn’t miss a detail on this magical fall night. 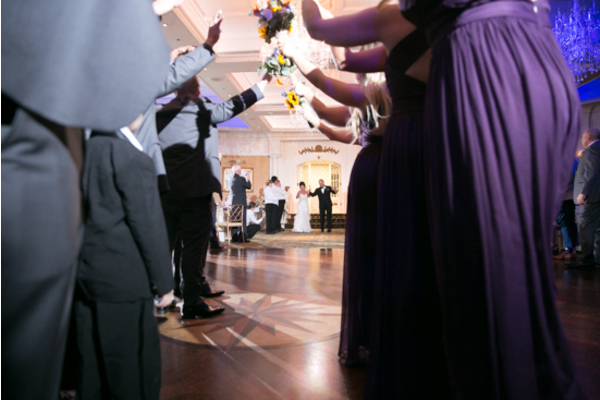 So many amazing memories were made on this magical night we are so happy to have been able to be apart of the celebration! 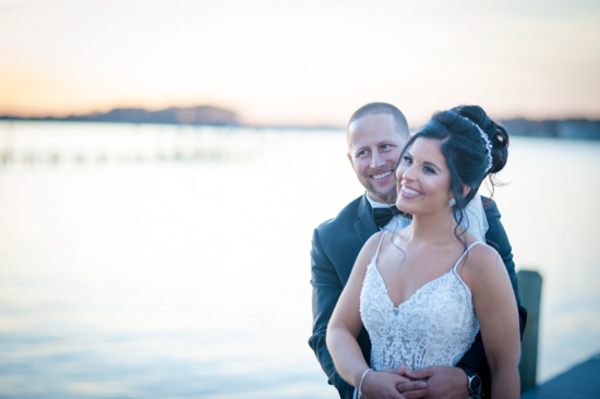 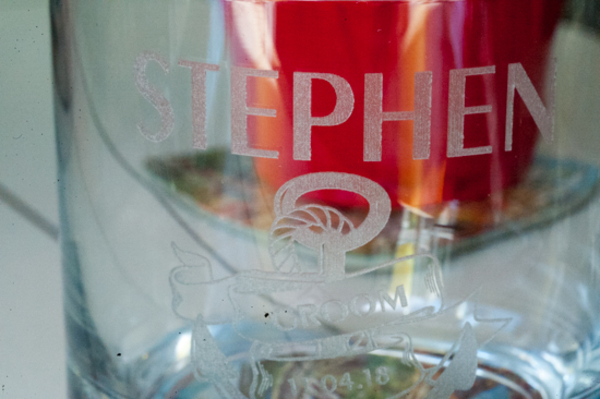 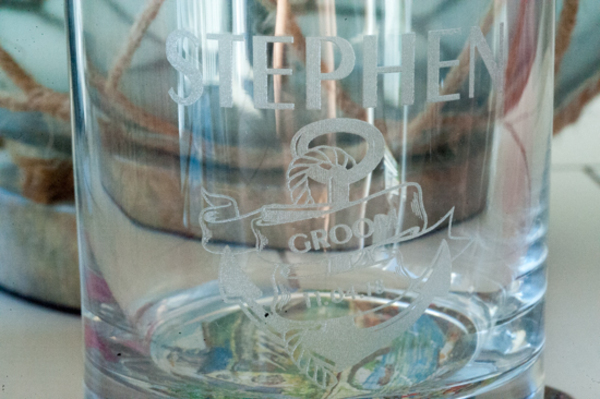 Congratulations, again to Larissa and Stephen! 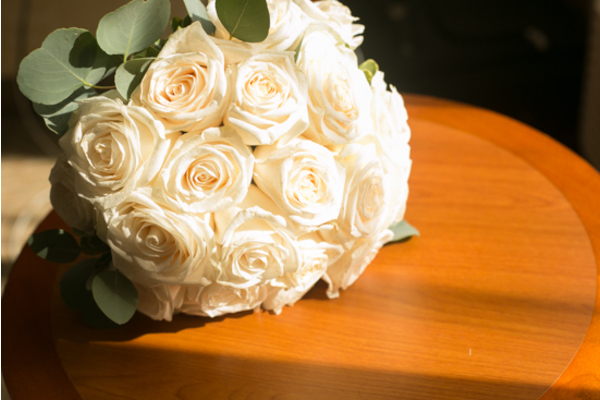 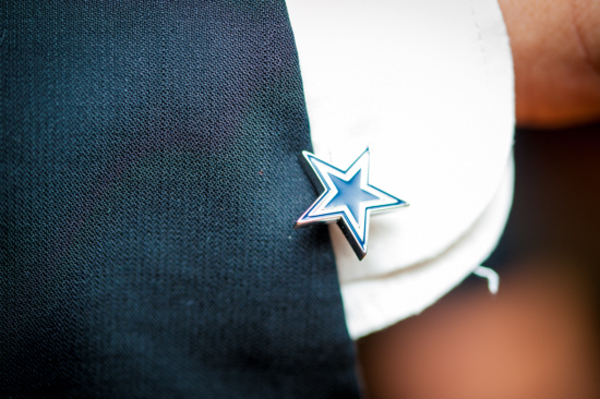 We wish you nothing but love and success!